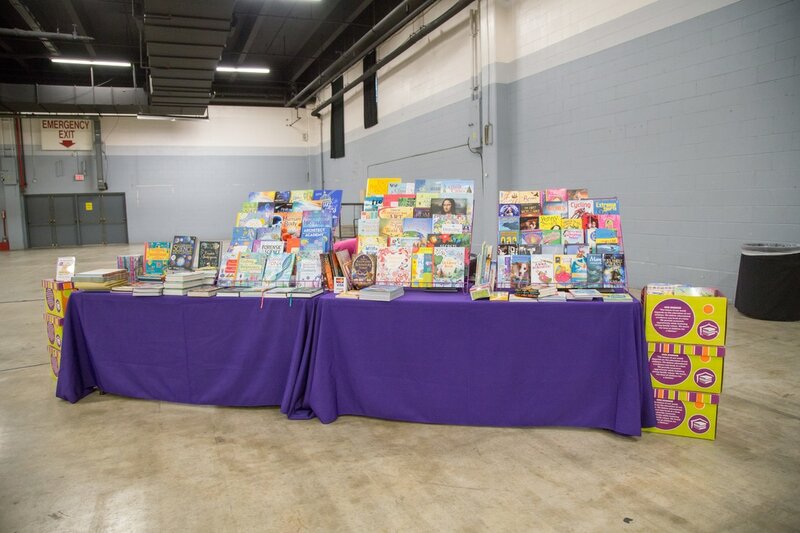 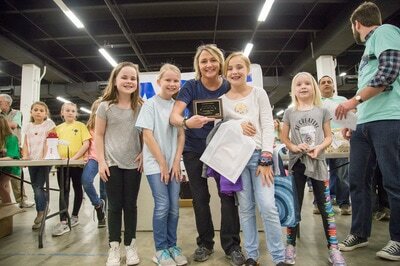 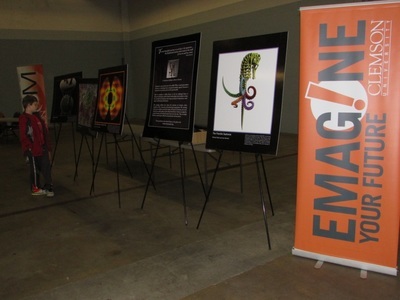 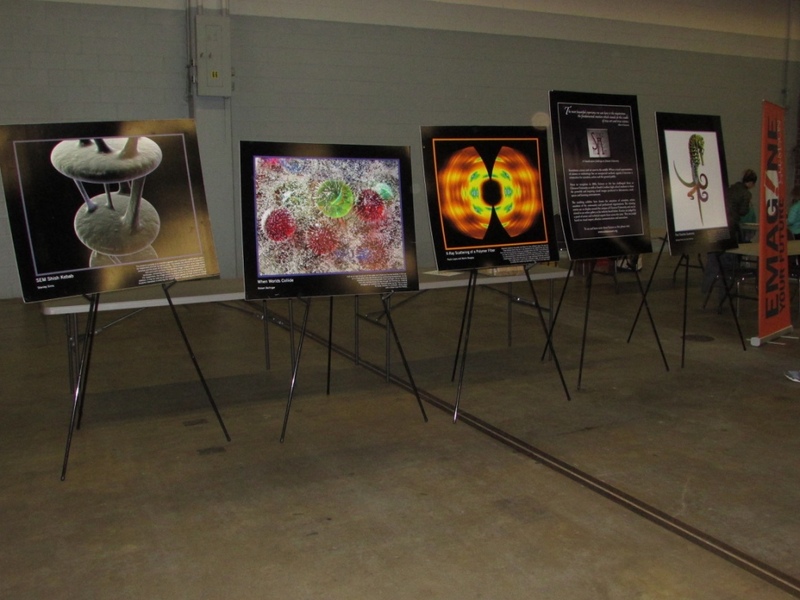 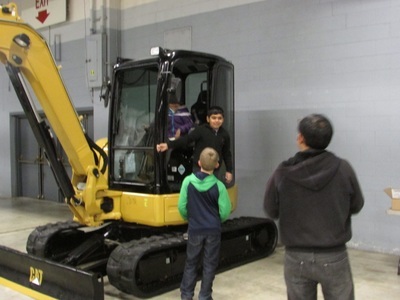 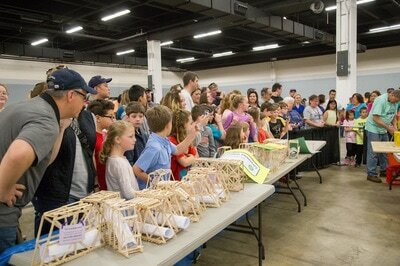 CONGRATULATIONS TO ALL OF THE STUDENTS & TEACHERS THAT PARTICIPATED IN THE EVENT THIS YEAR! WE HOPE YOU ENJOYED IT AS MUCH AS WE DID! A list of the winners by category is below. 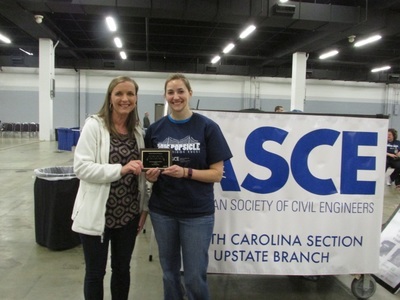 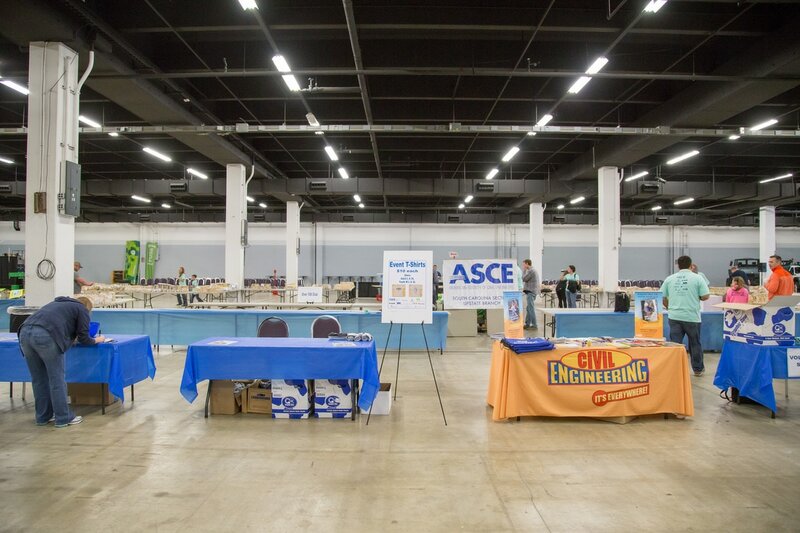 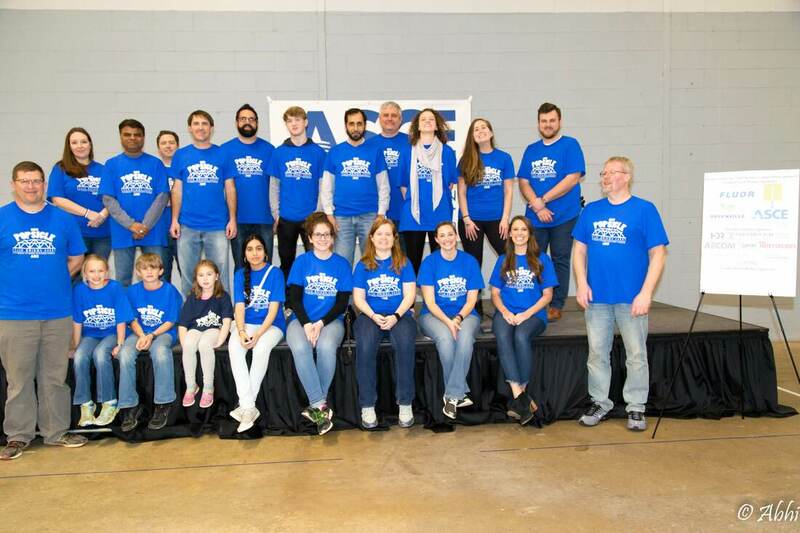 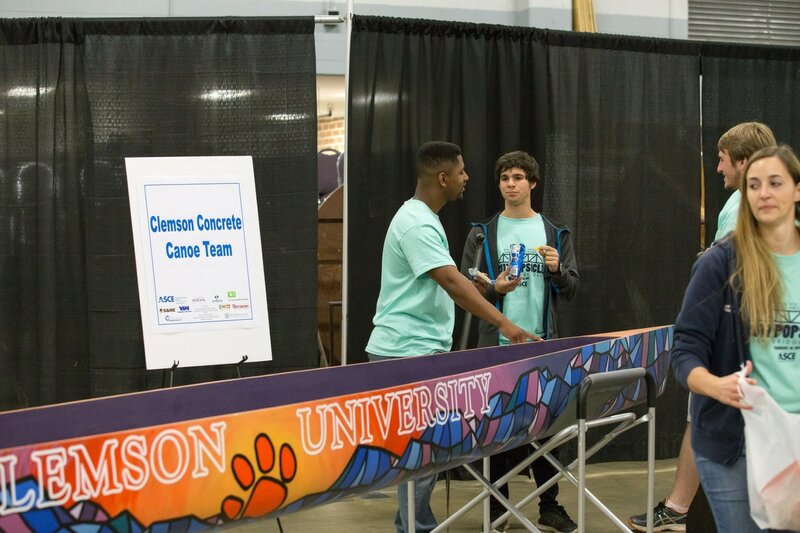 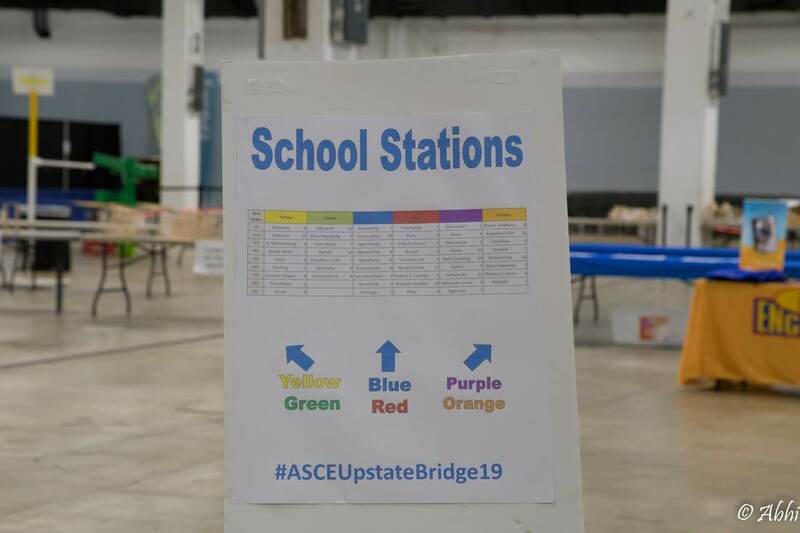 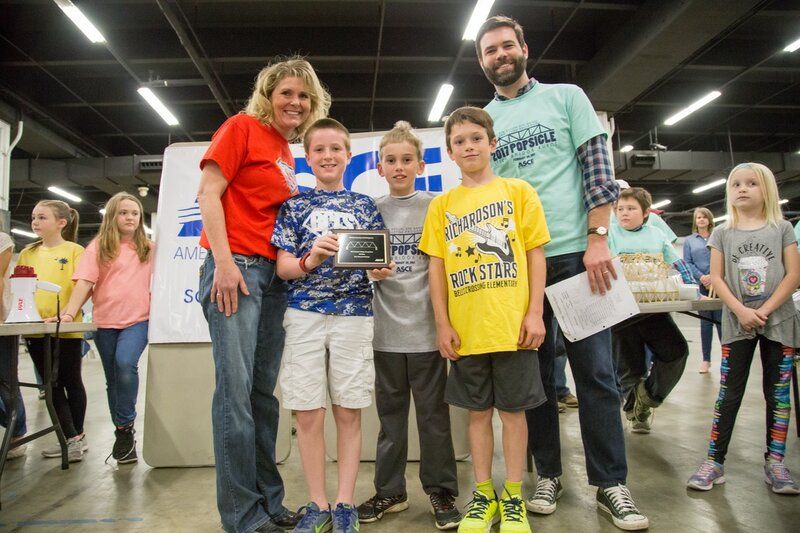 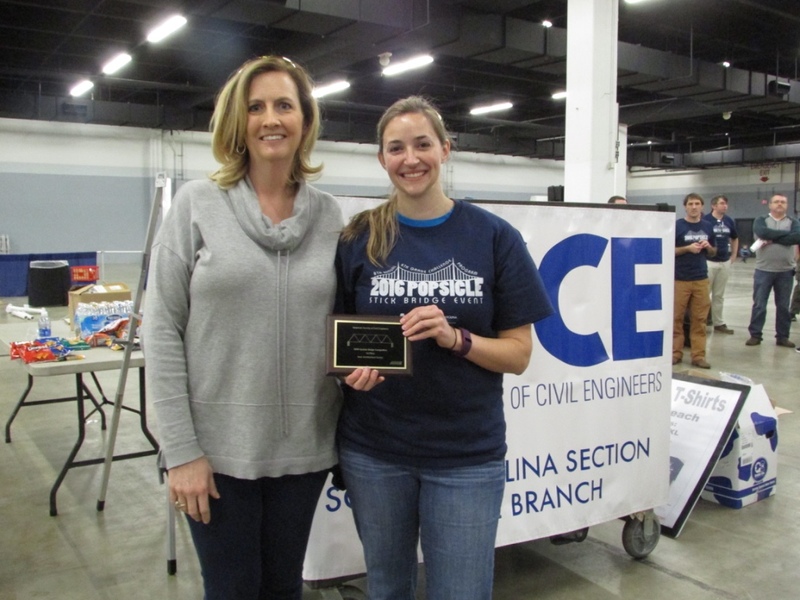 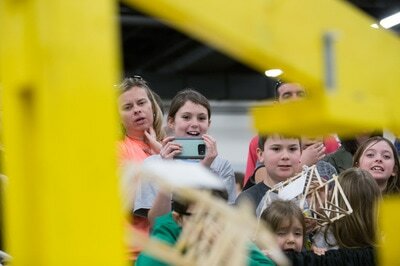 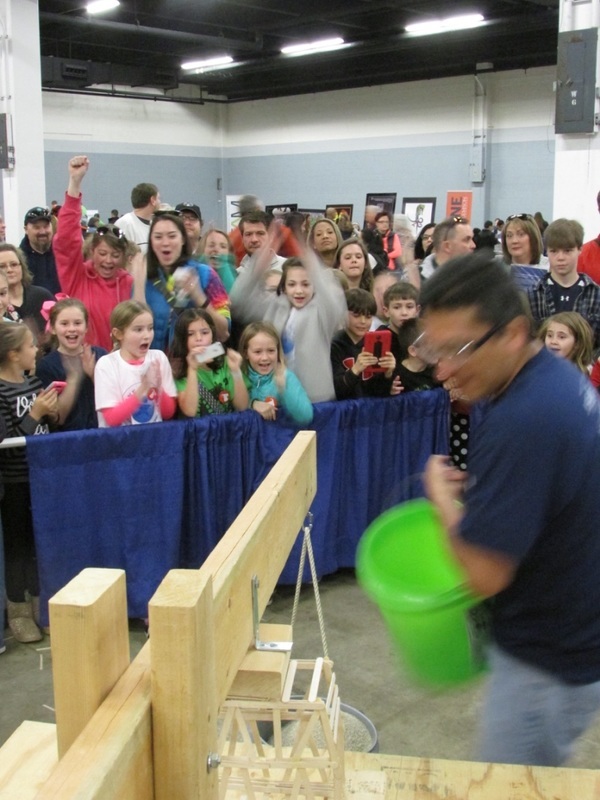 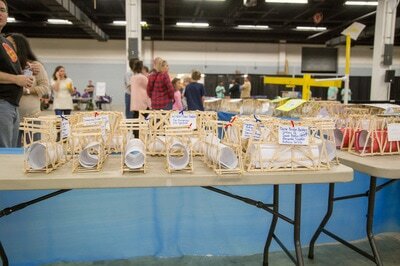 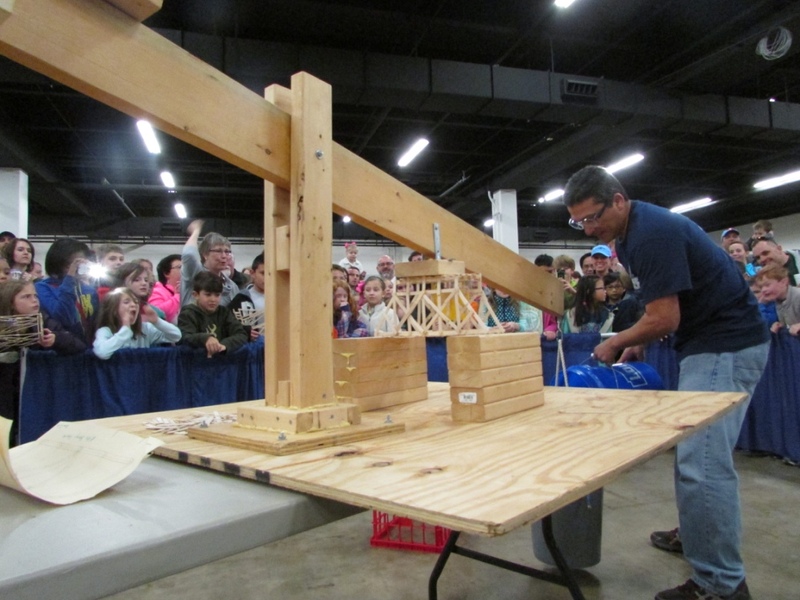 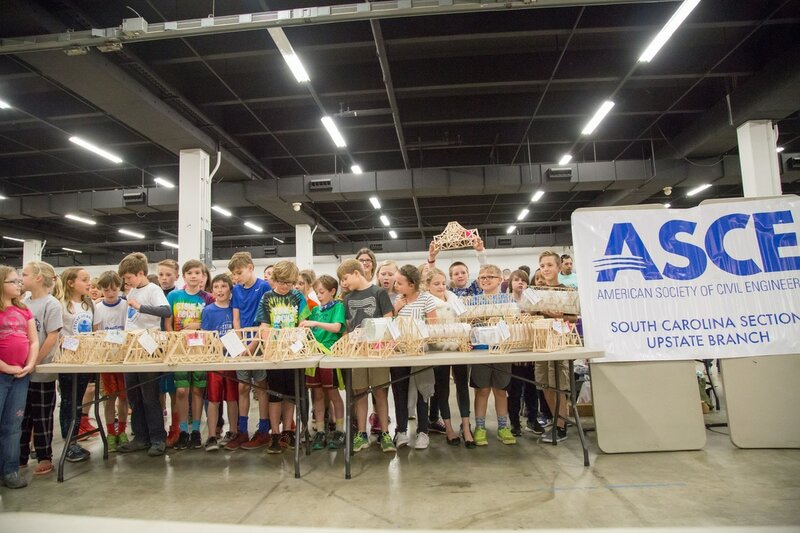 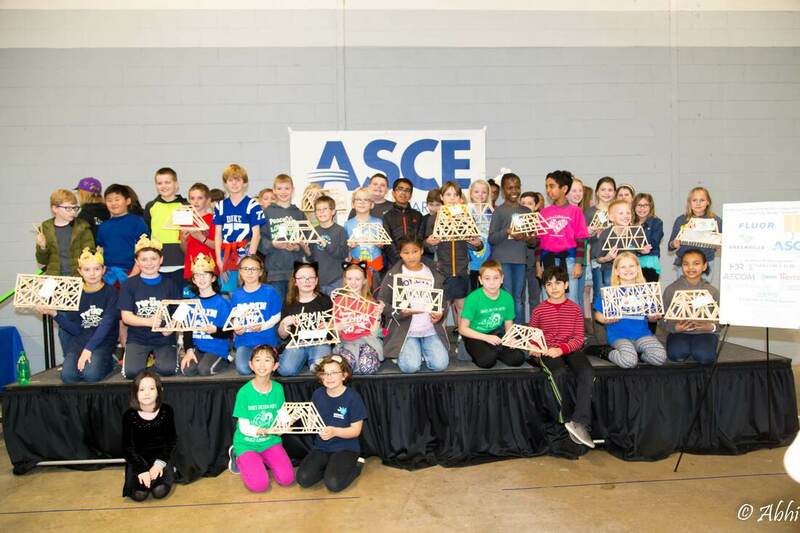 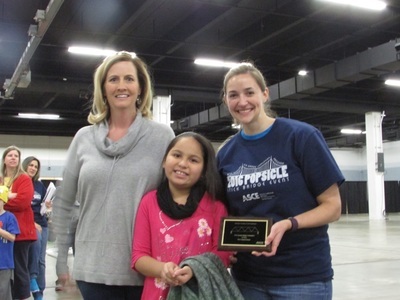 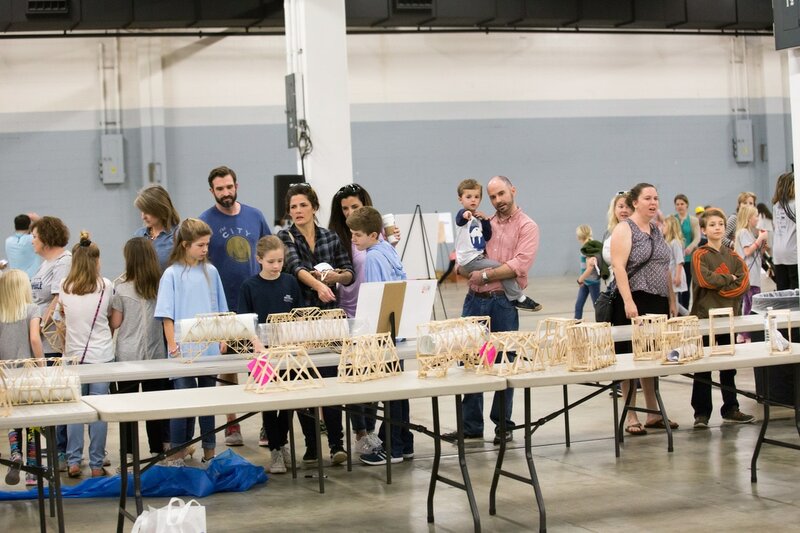 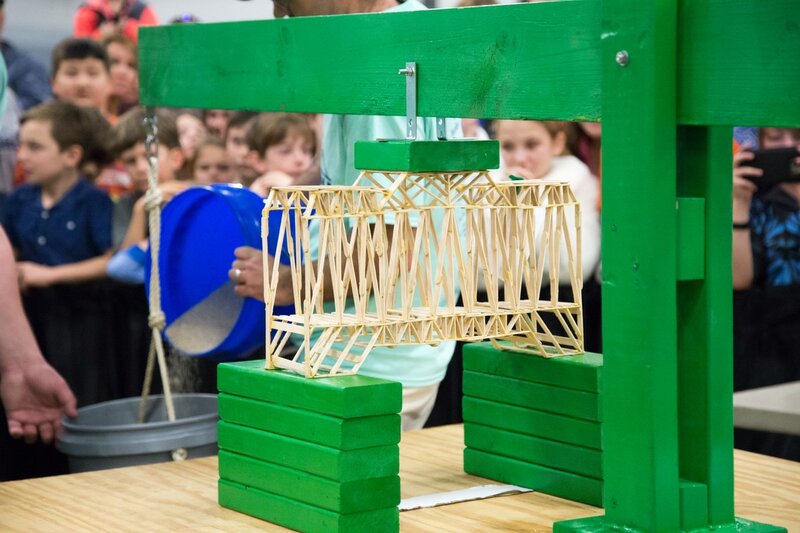 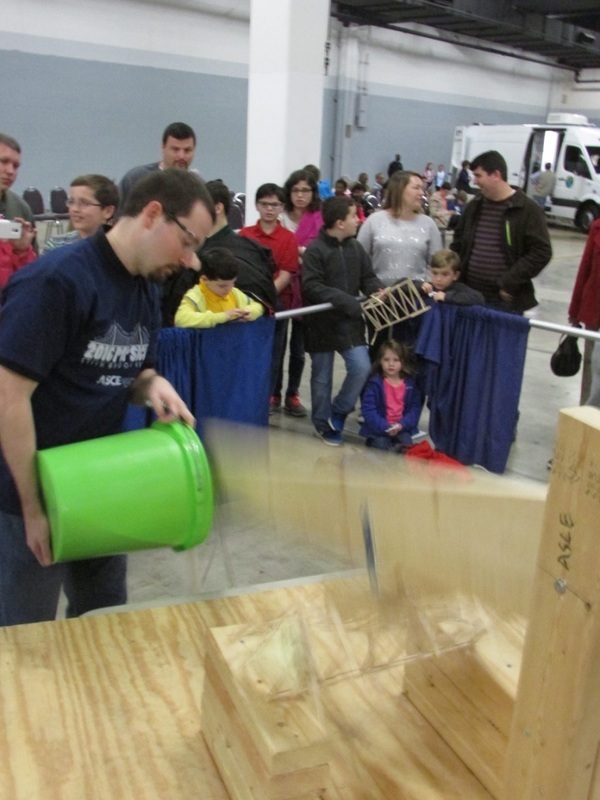 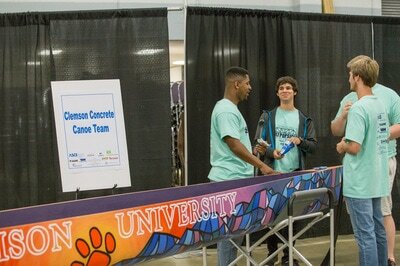 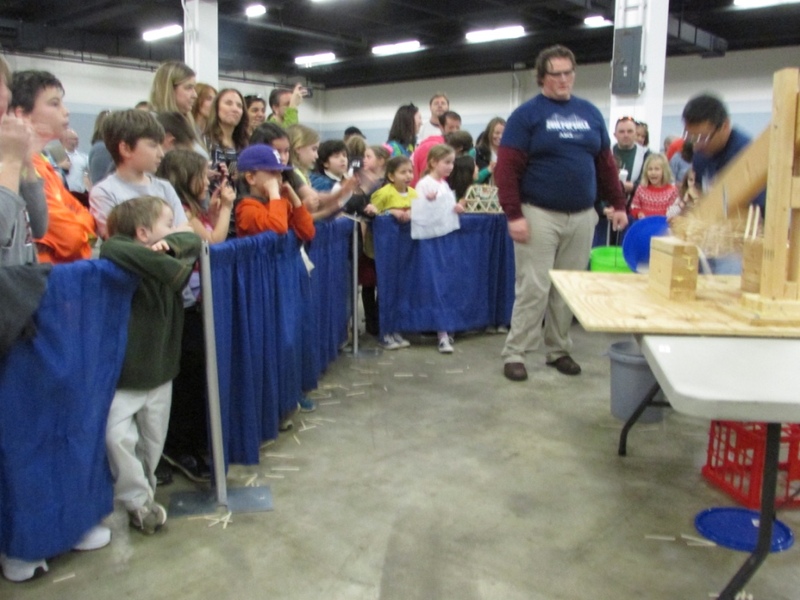 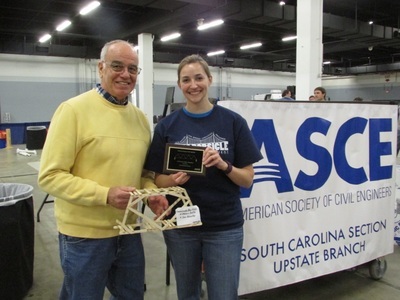 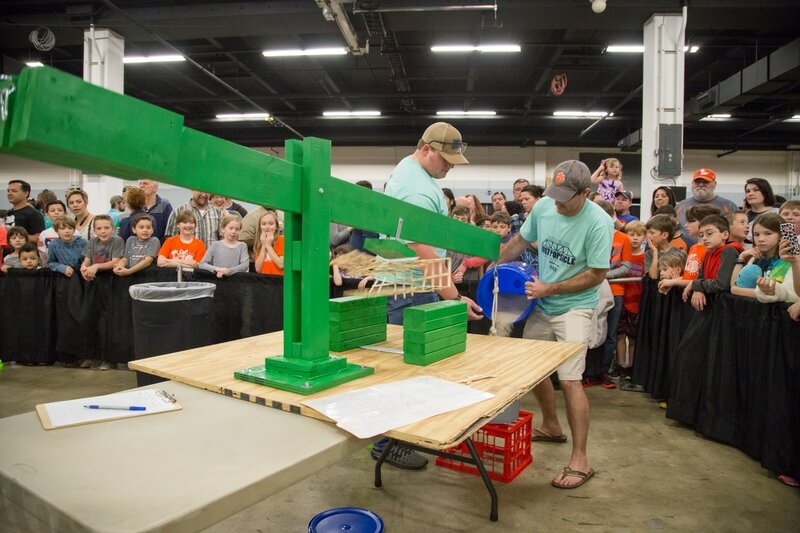 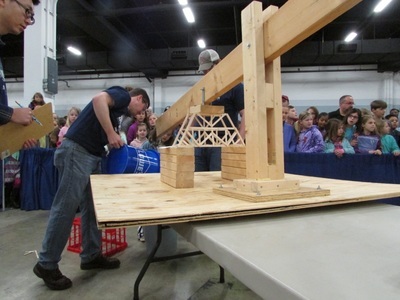 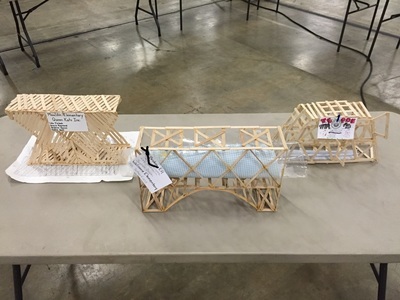 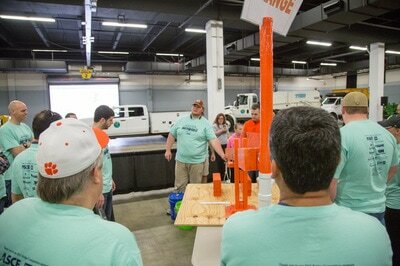 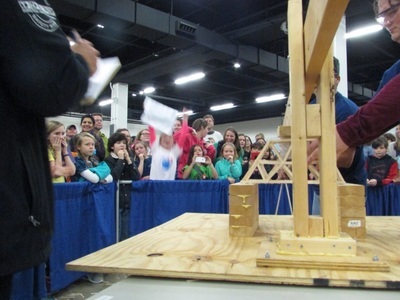 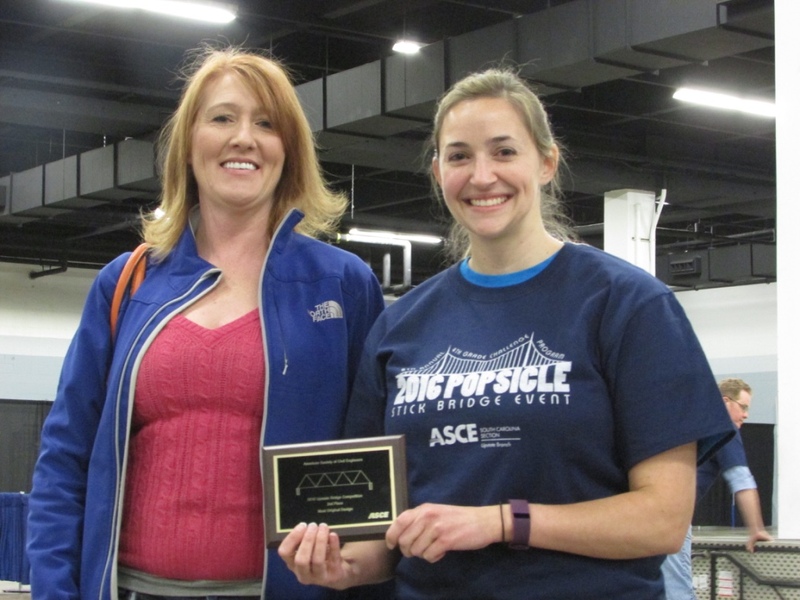 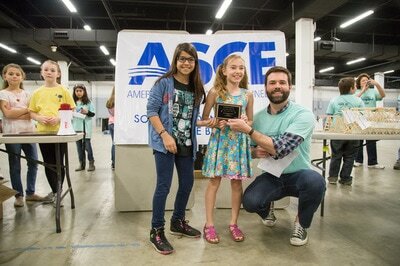 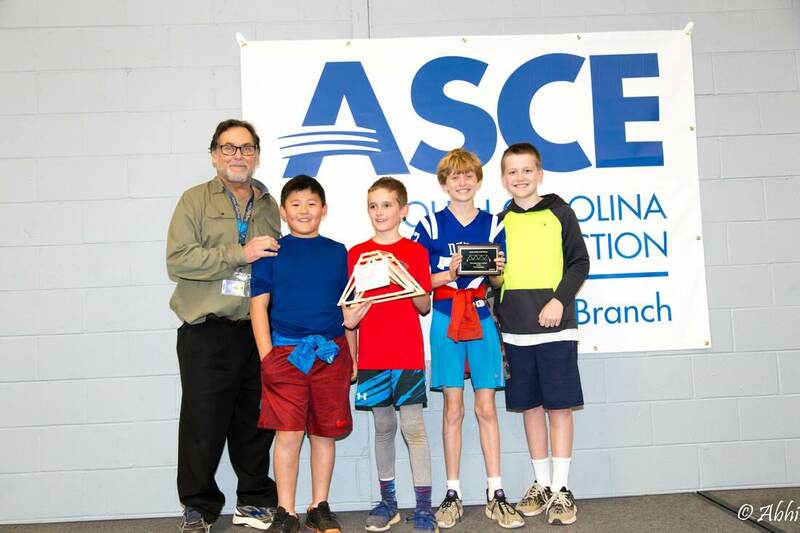 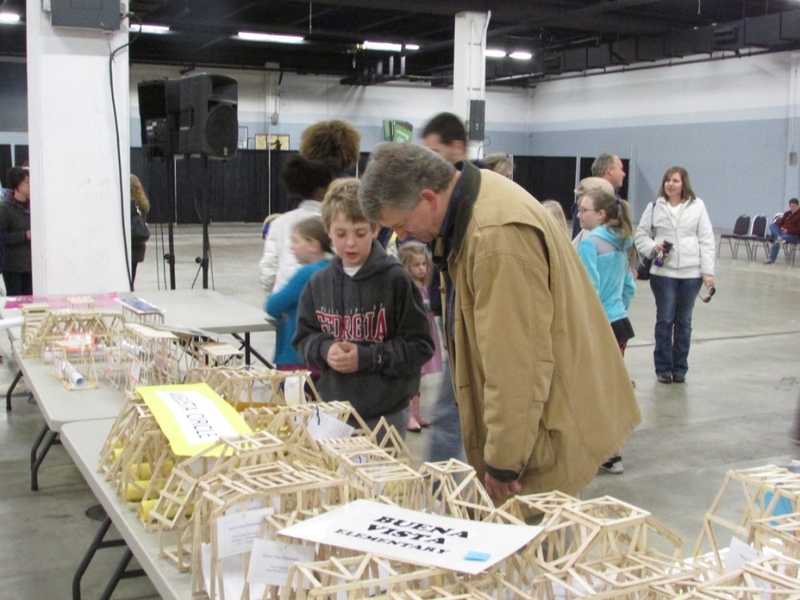 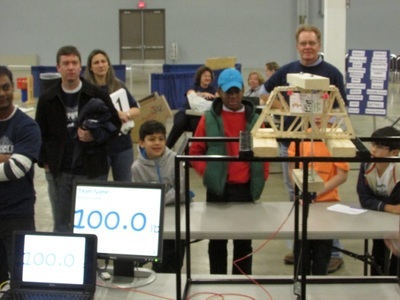 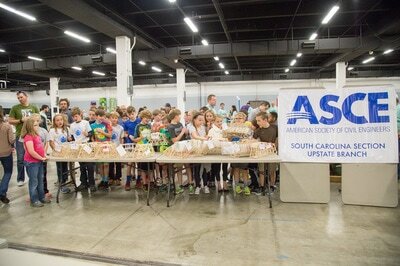 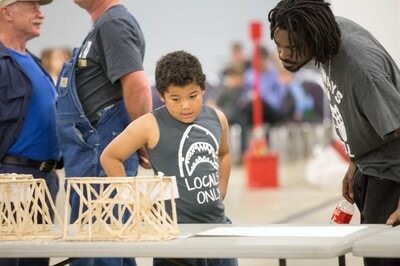 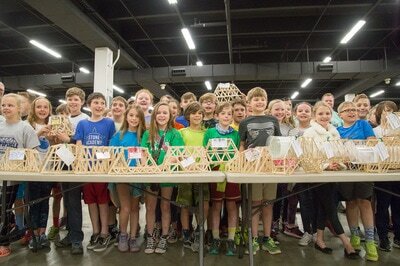 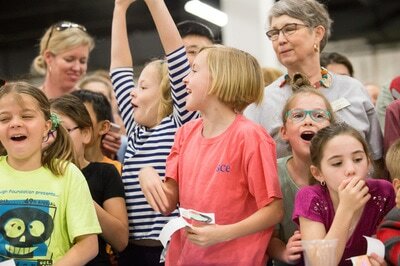 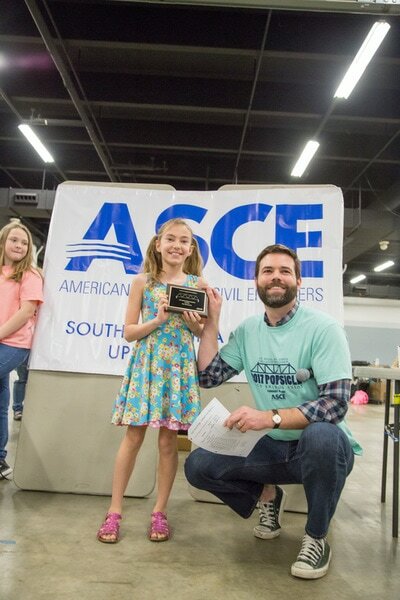 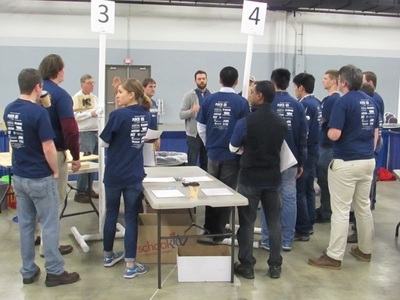 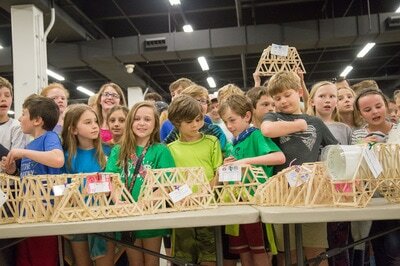 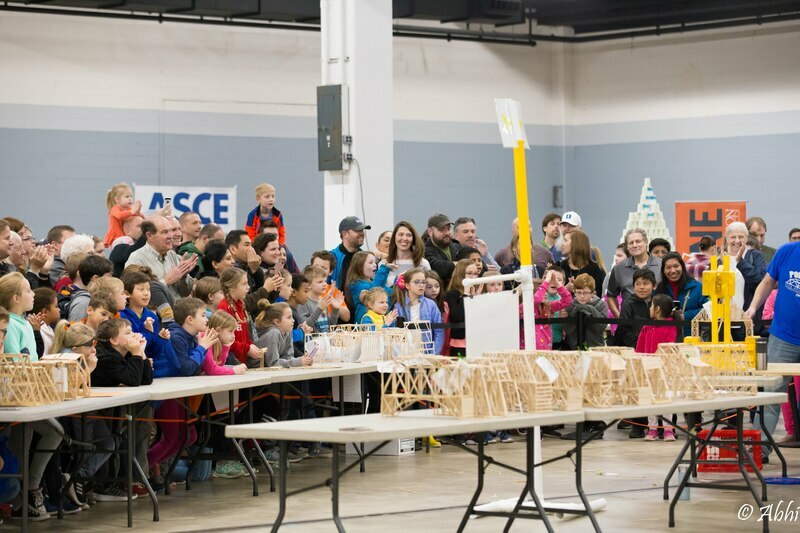 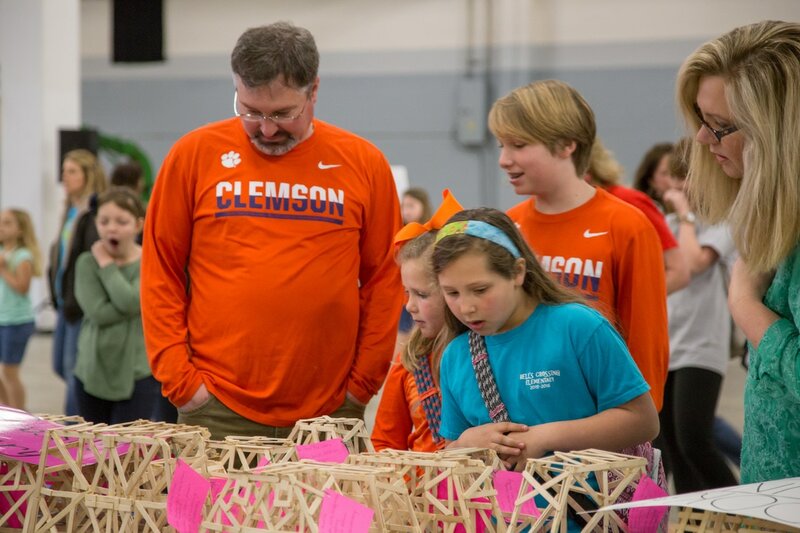 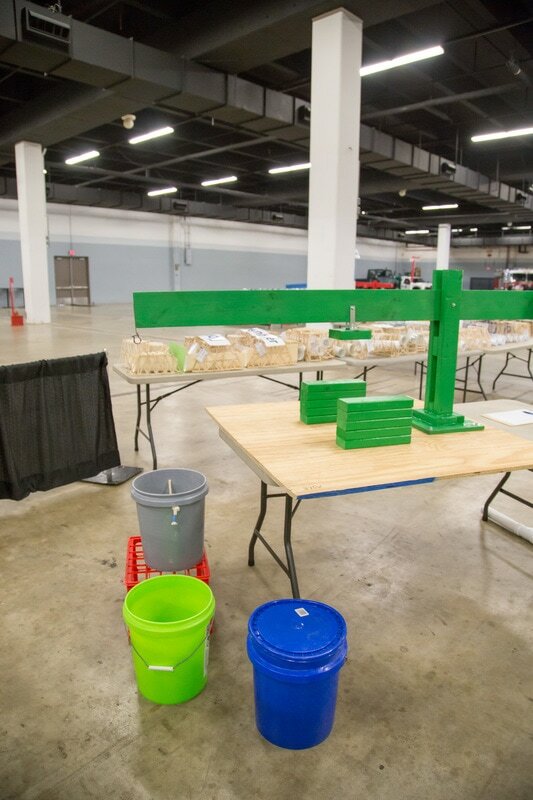 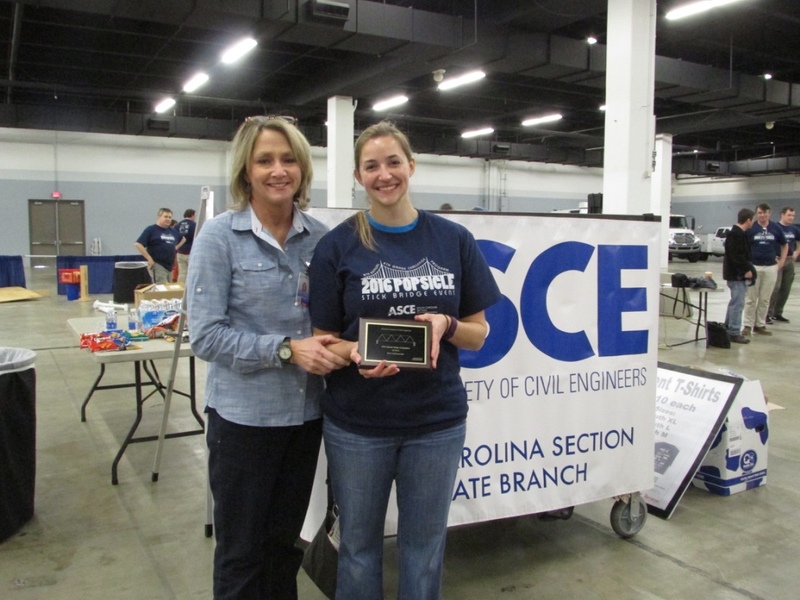 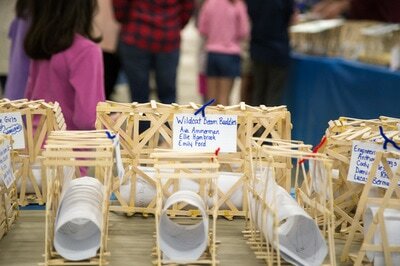 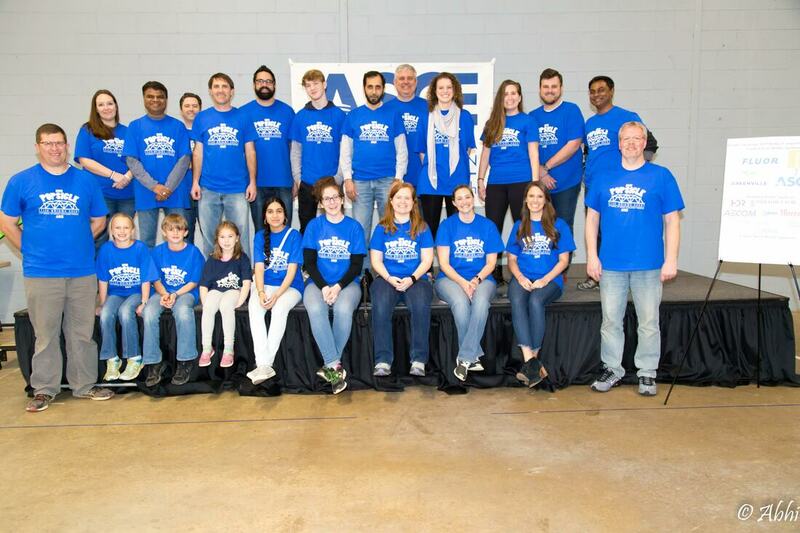 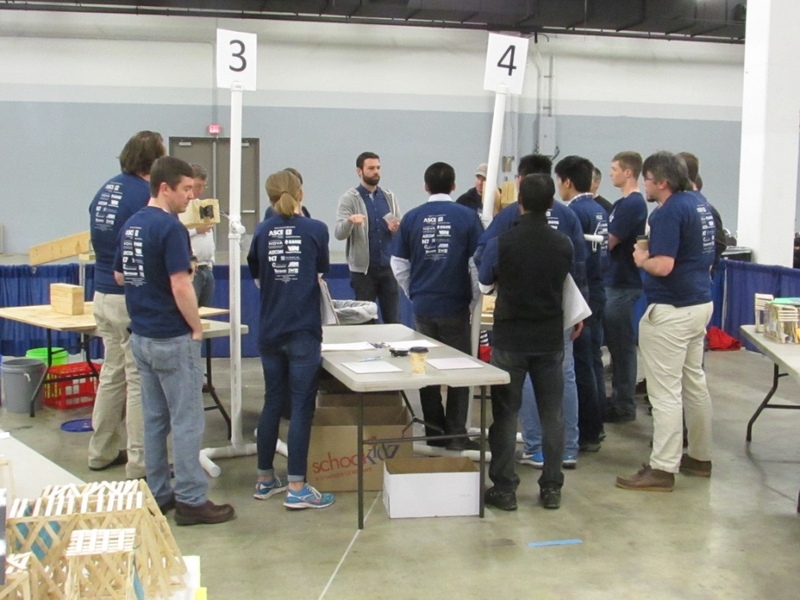 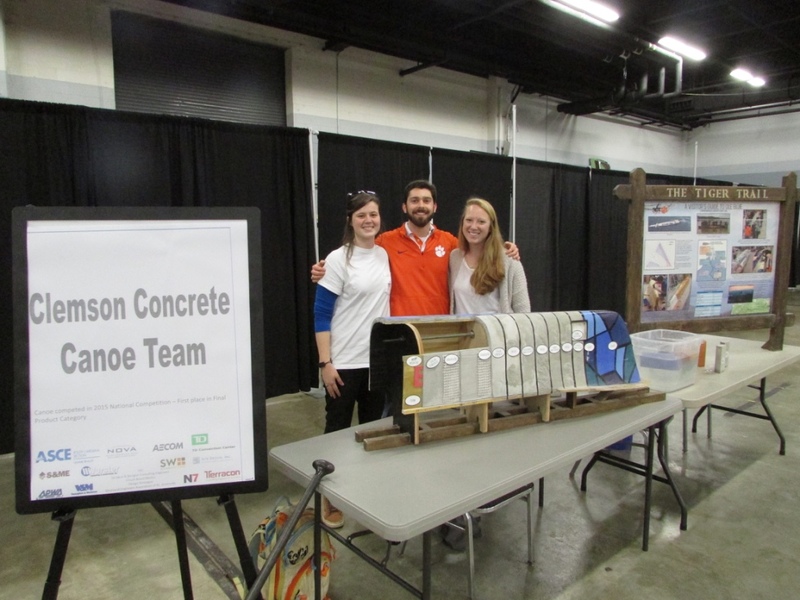 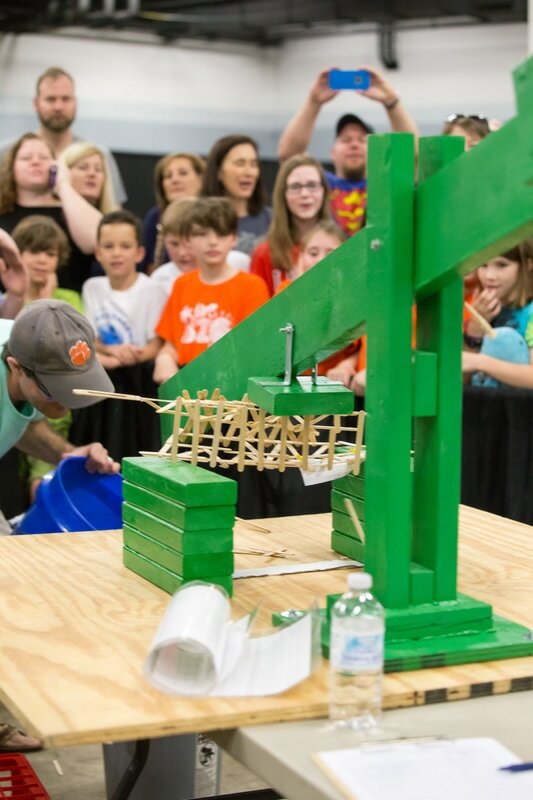 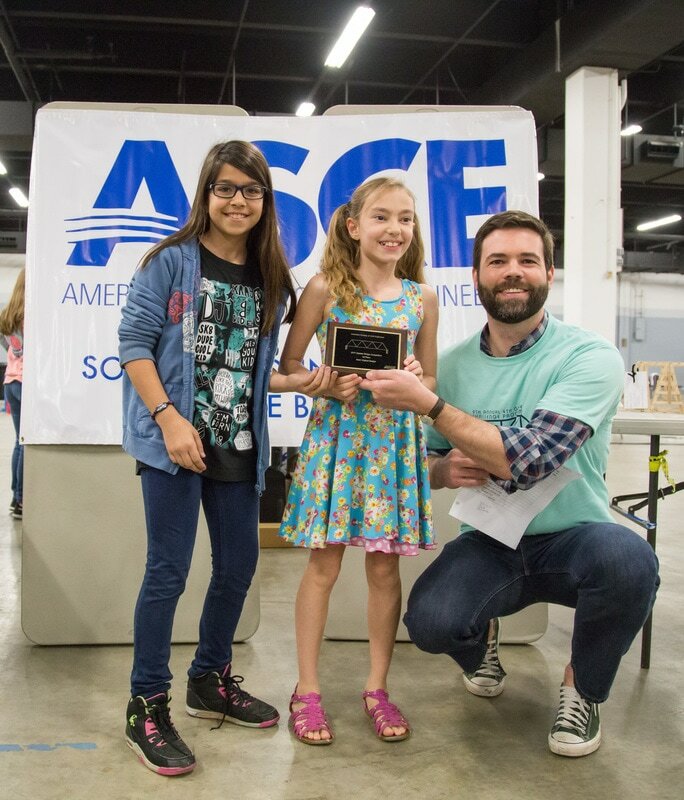 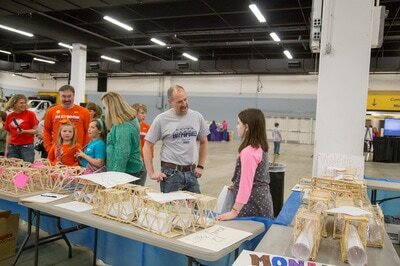 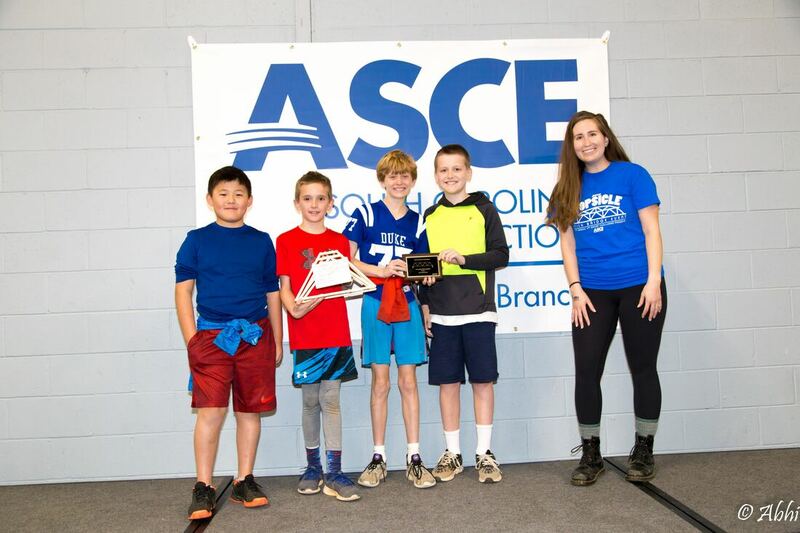 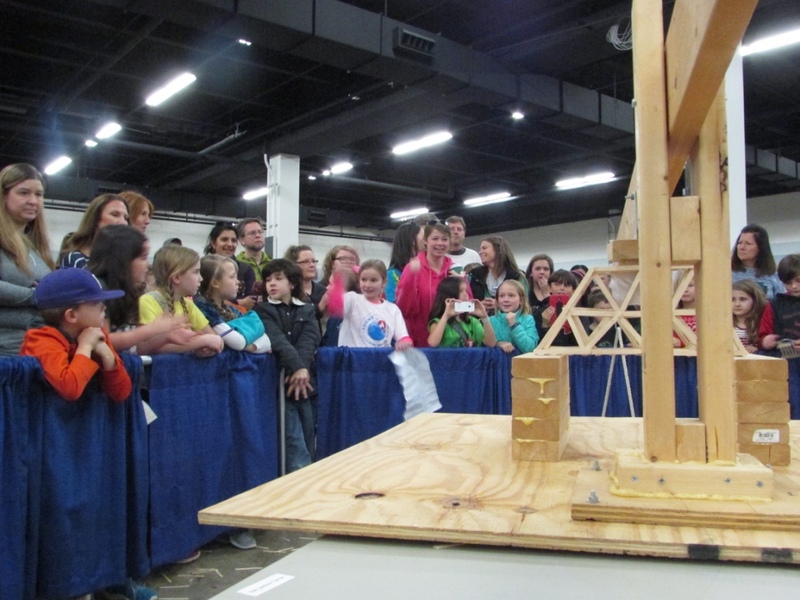 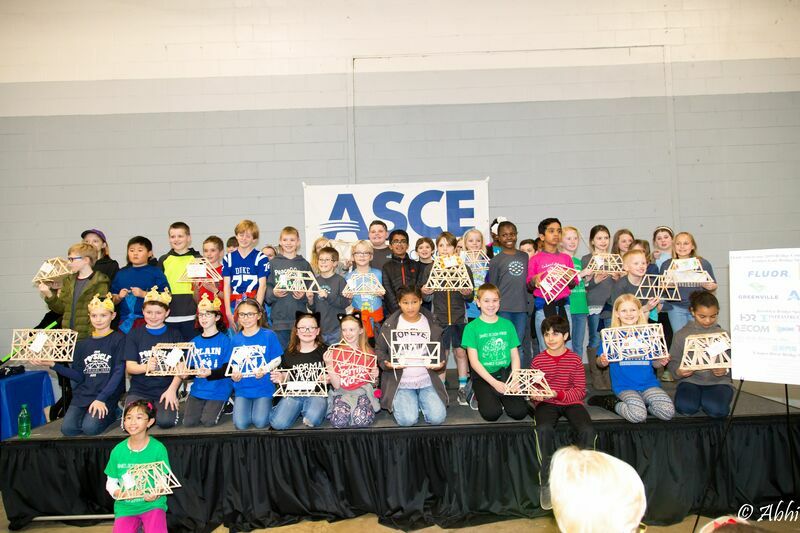 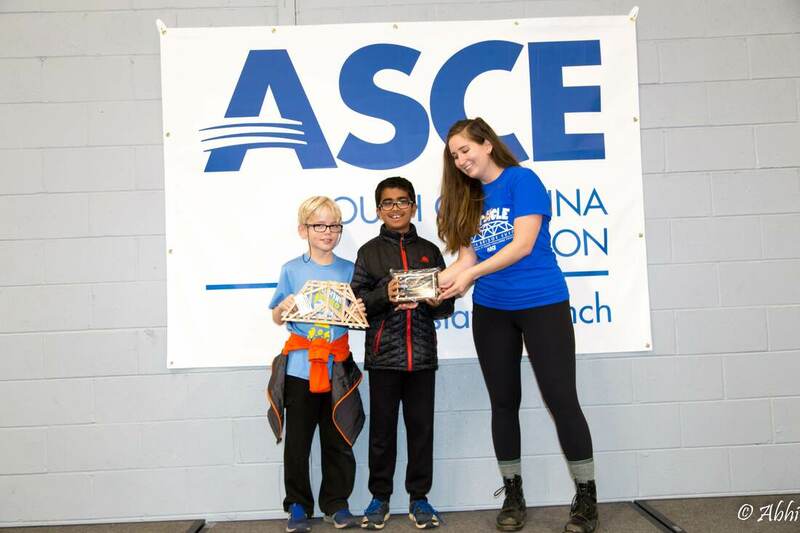 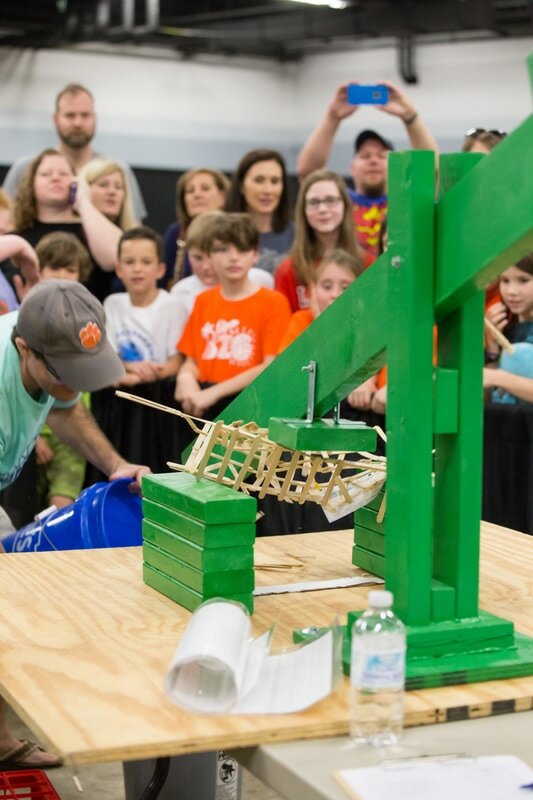 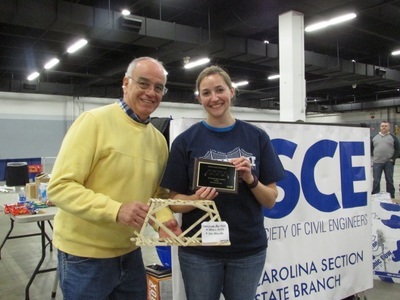 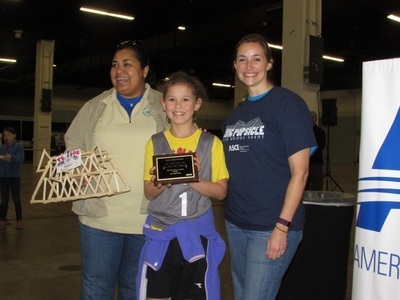 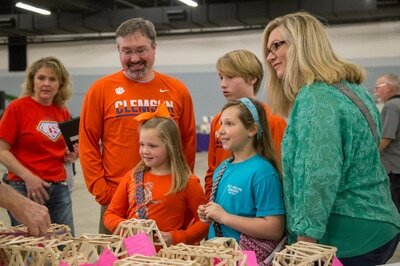 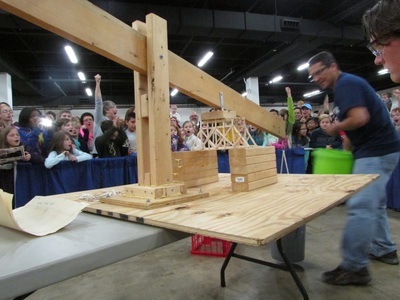 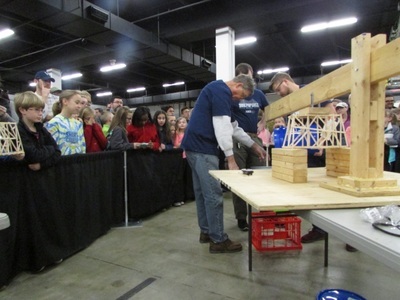 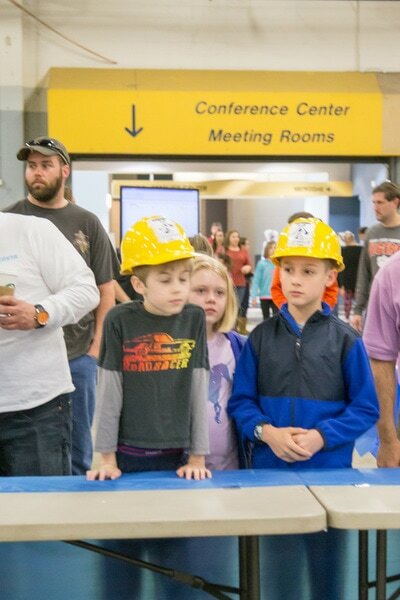 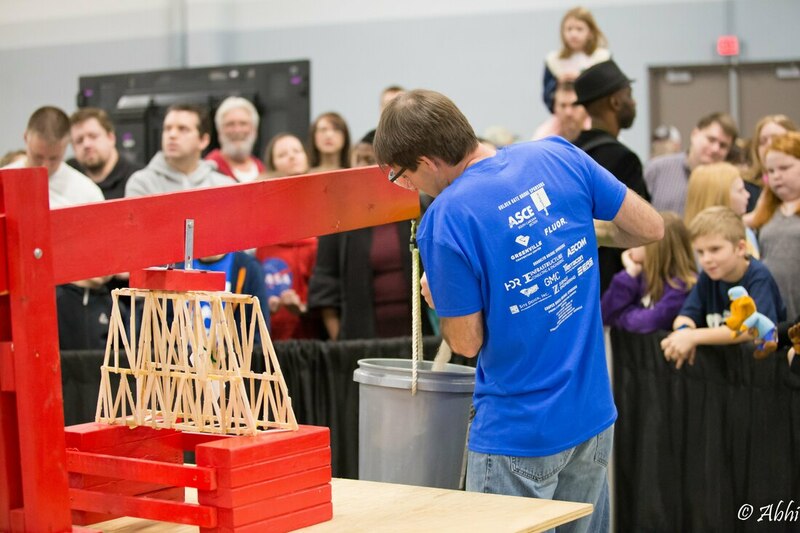 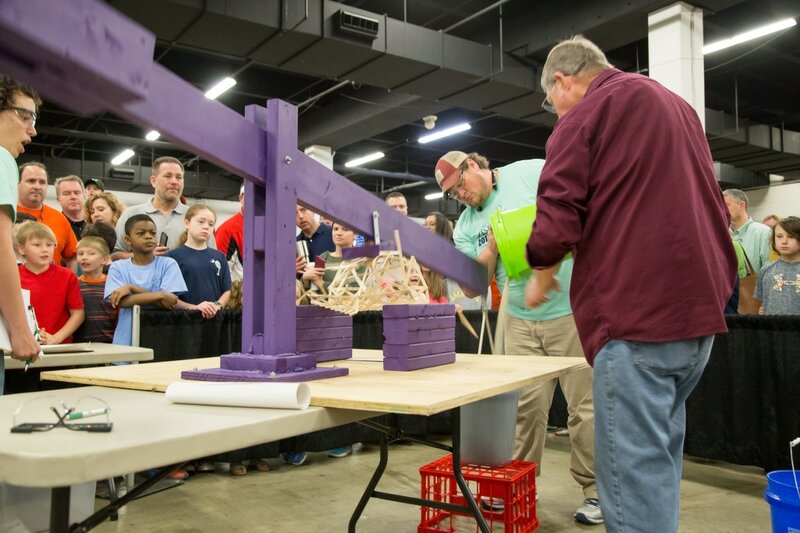 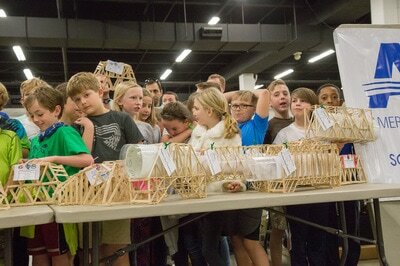 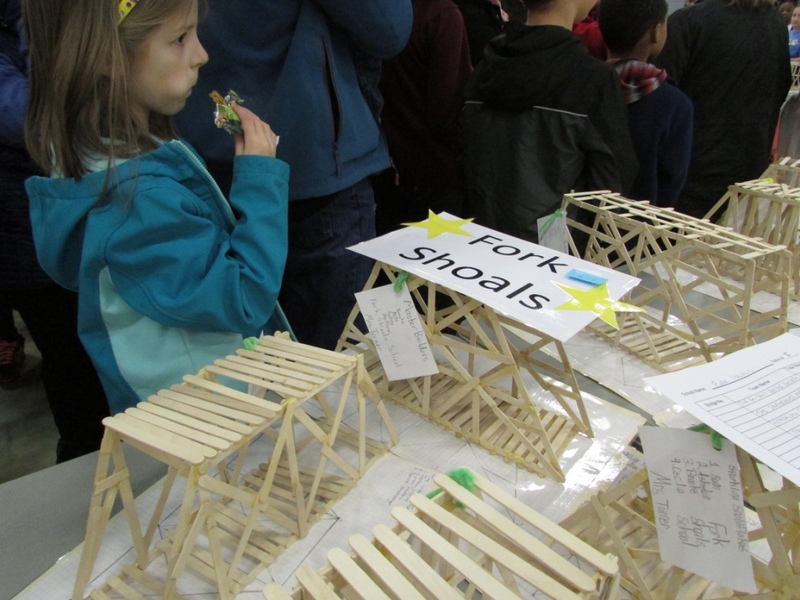 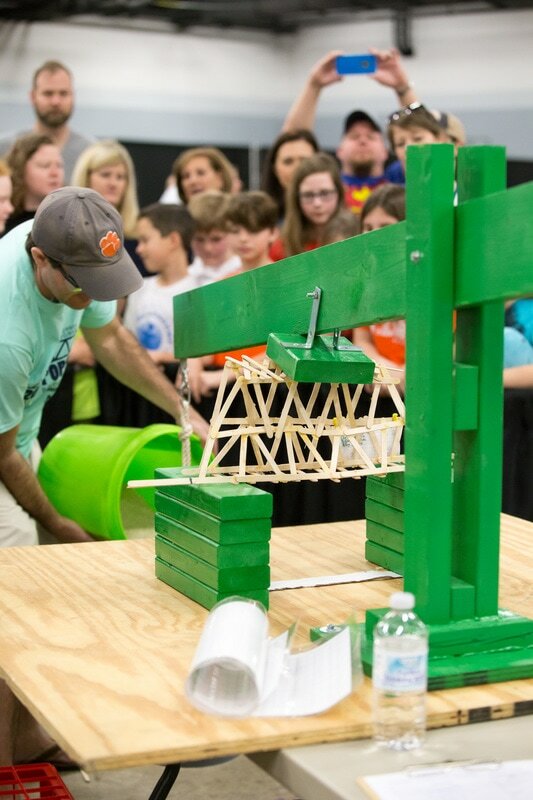 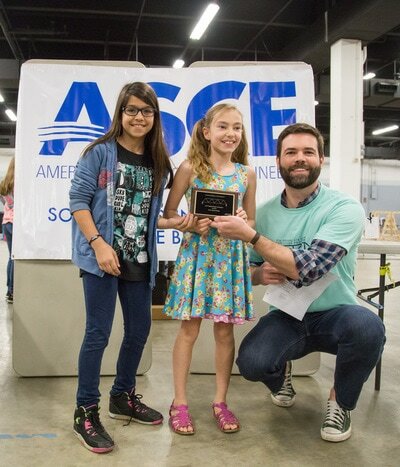 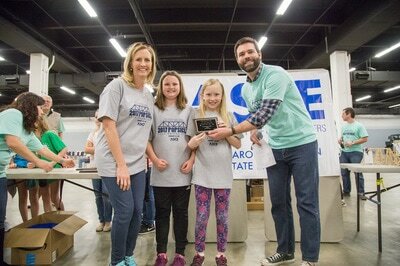 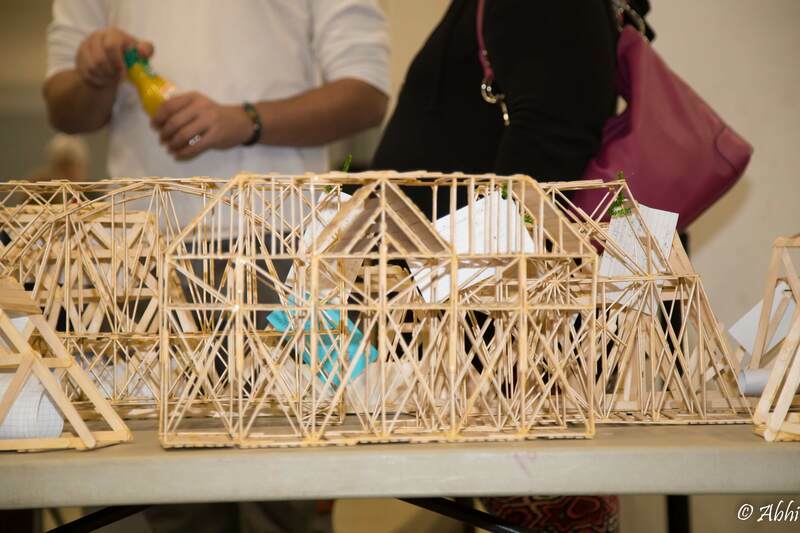 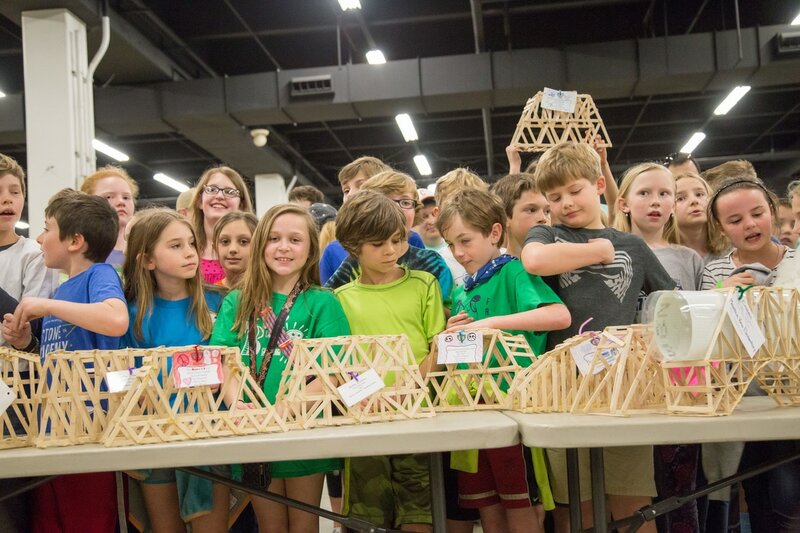 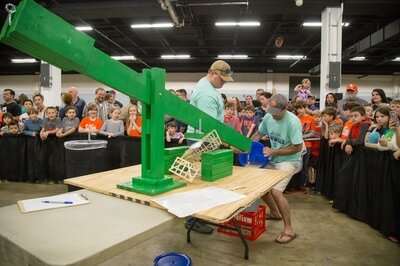 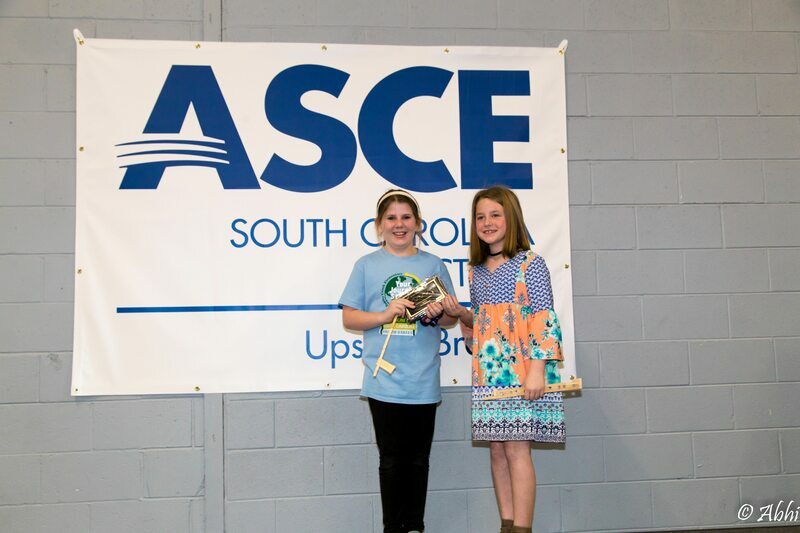 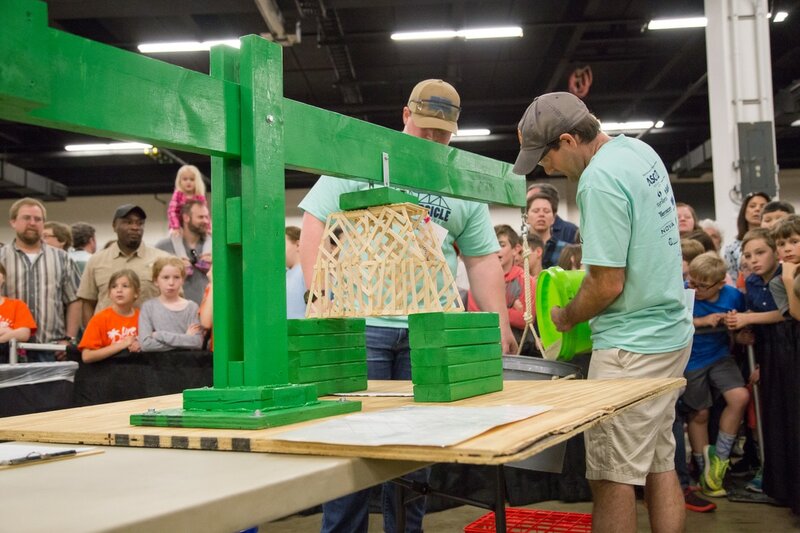 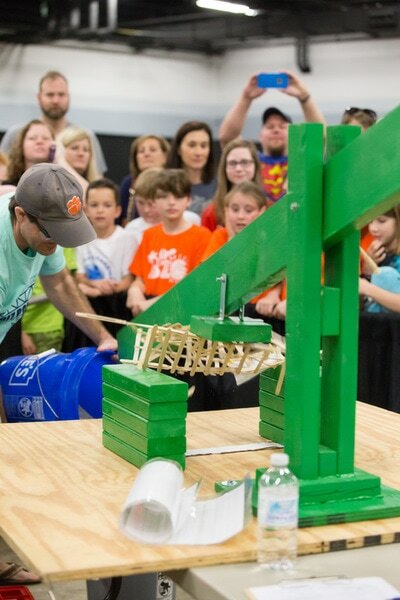 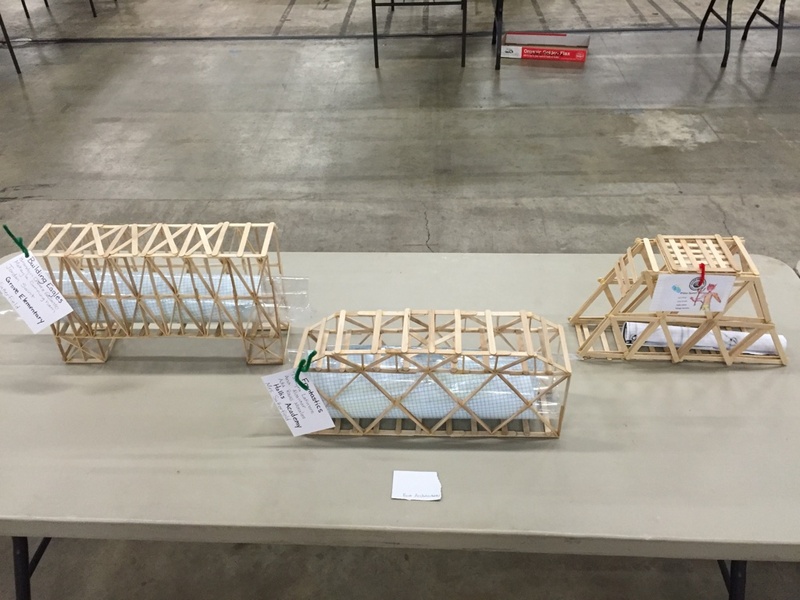 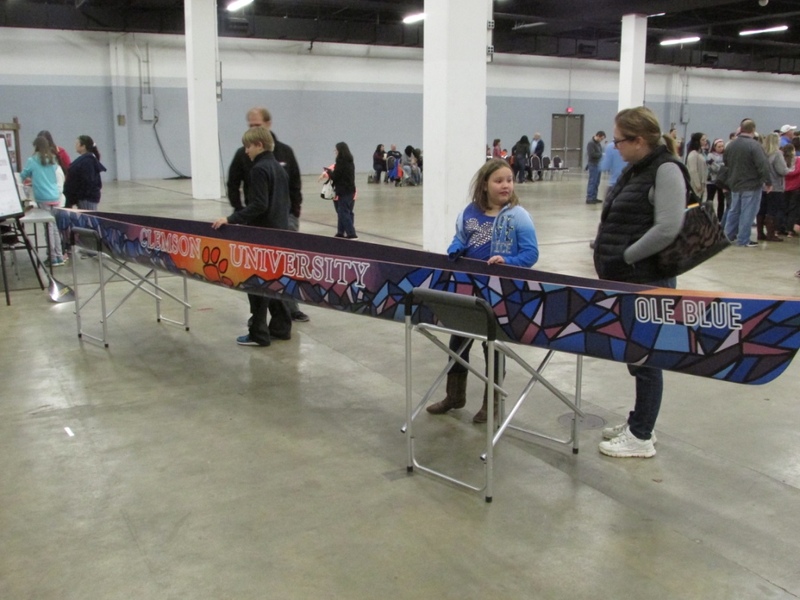 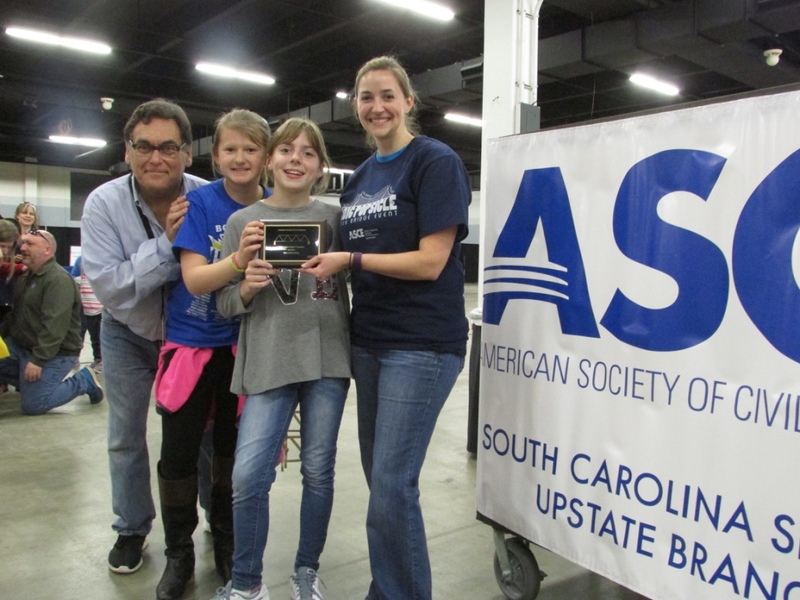 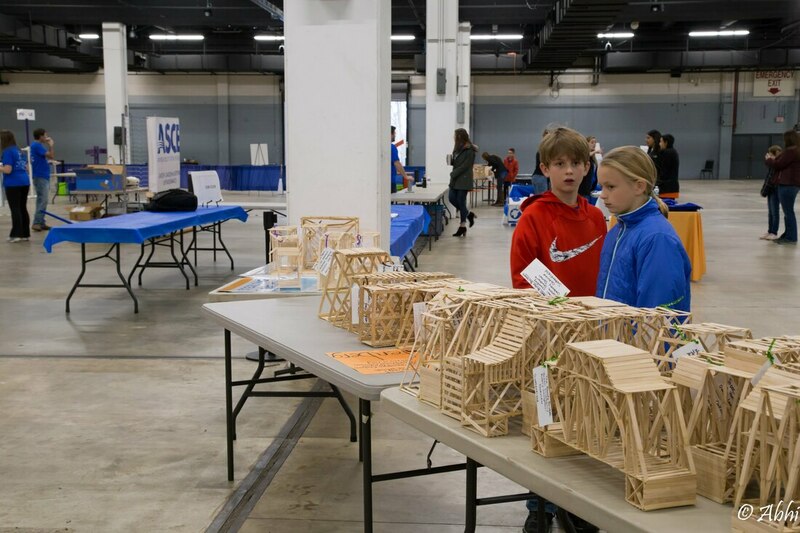 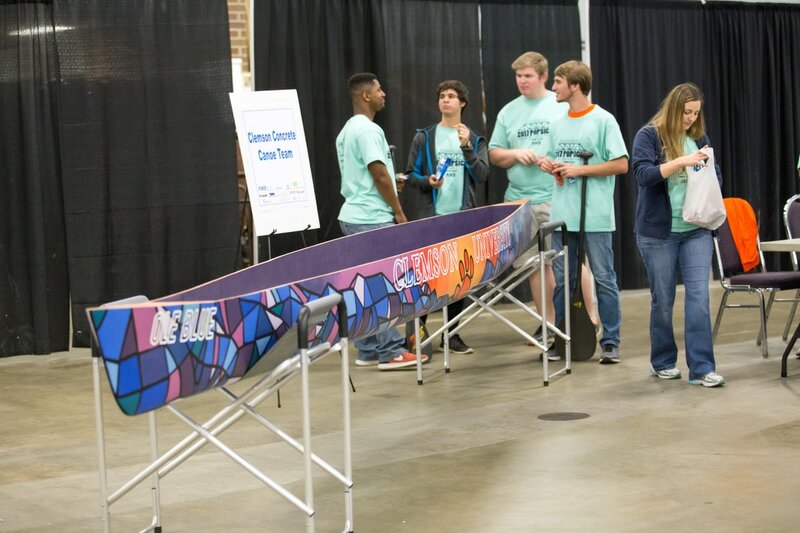 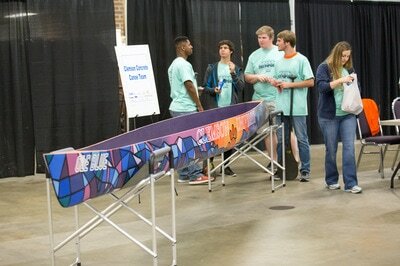 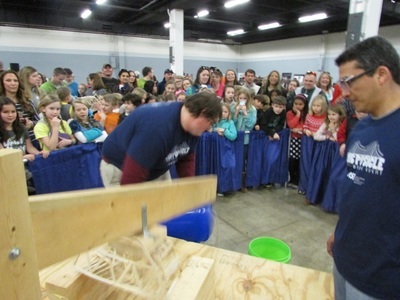 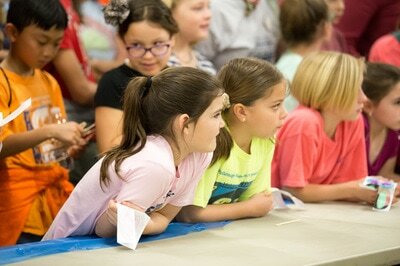 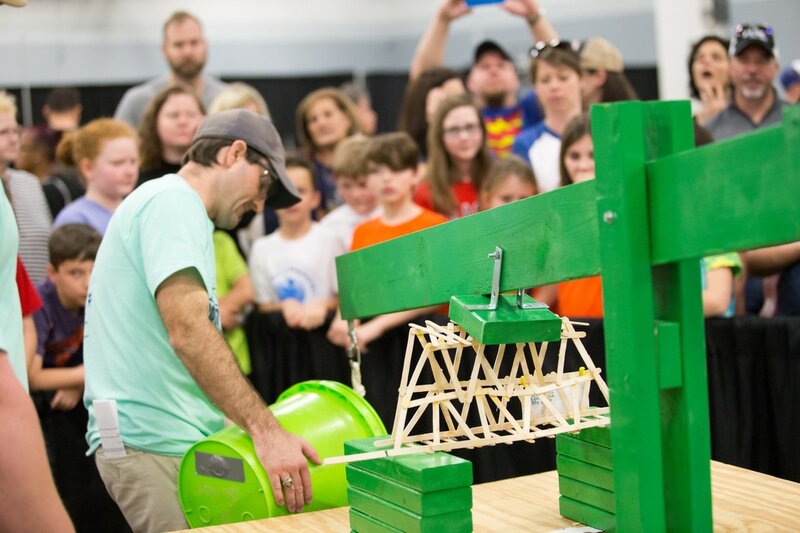 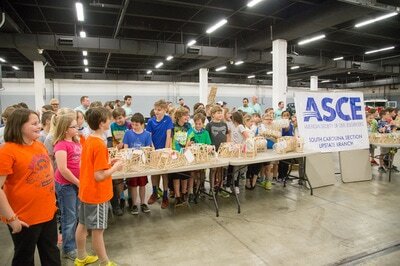 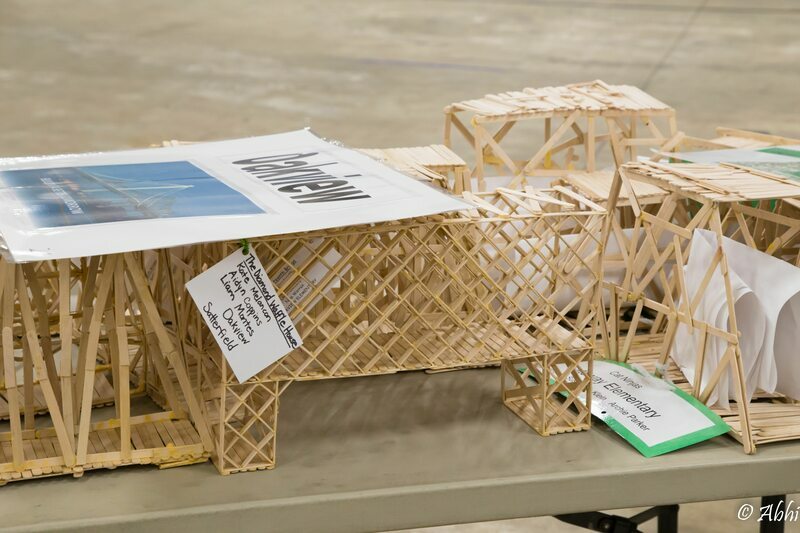 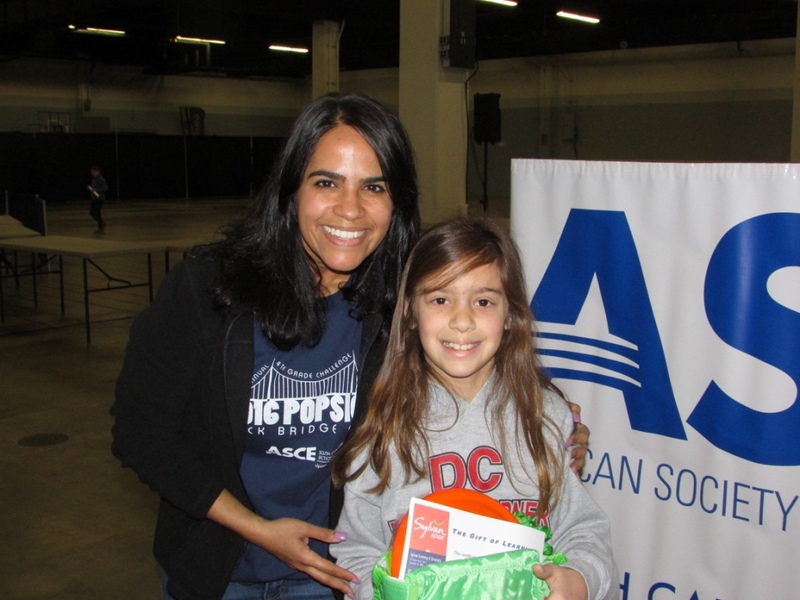 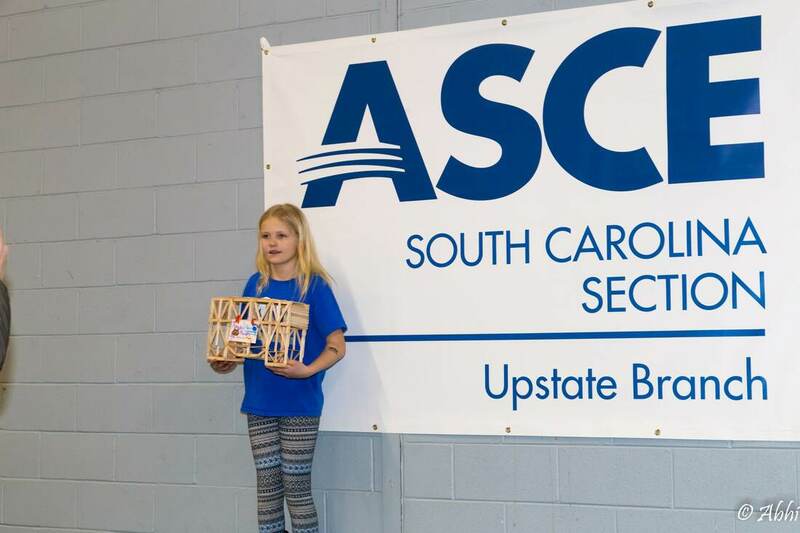 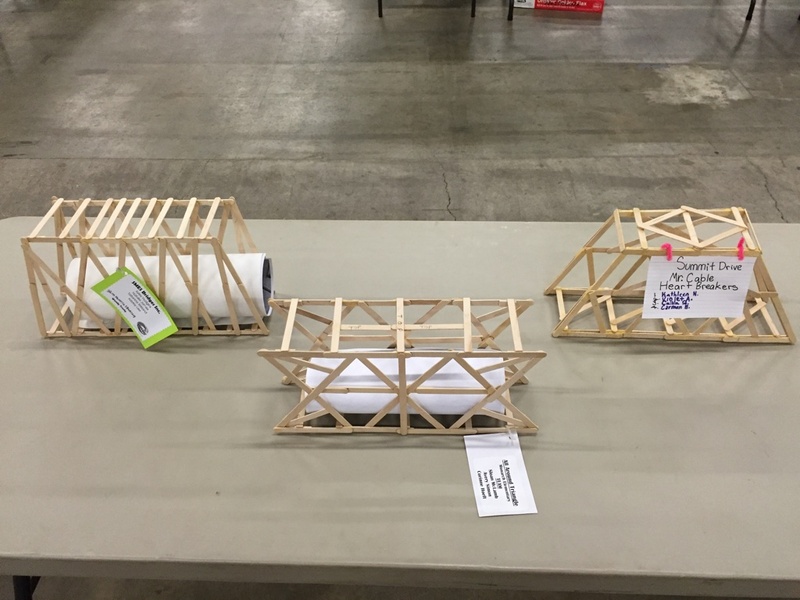 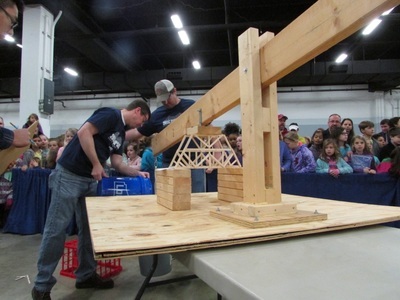 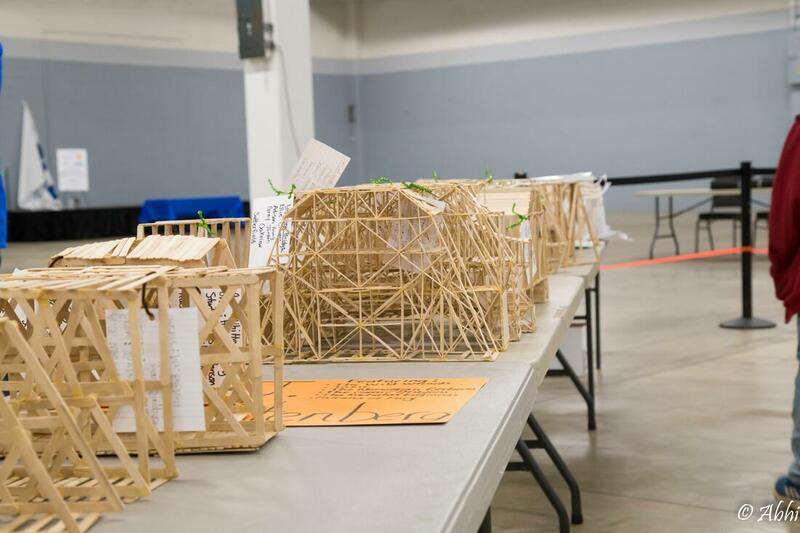 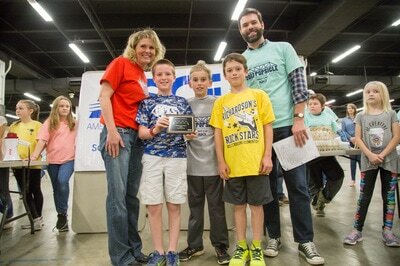 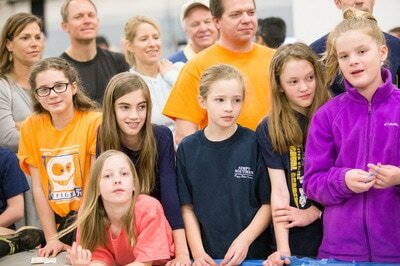 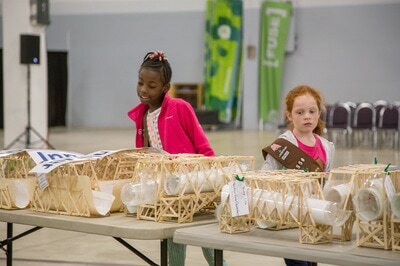 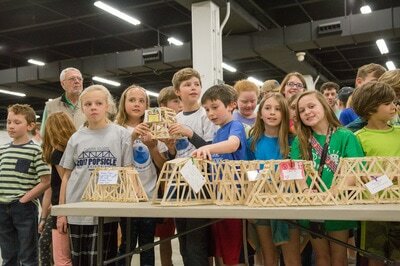 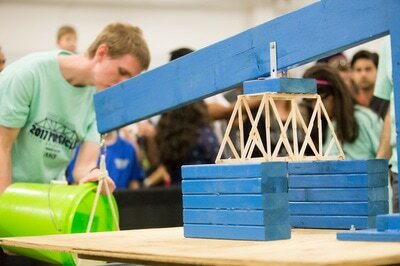 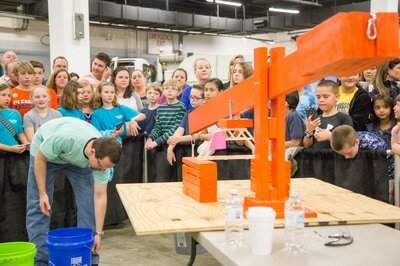 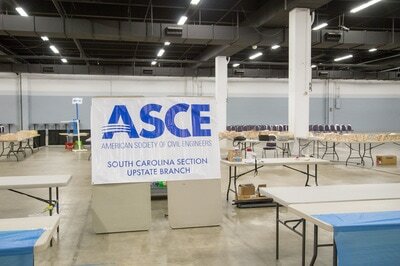 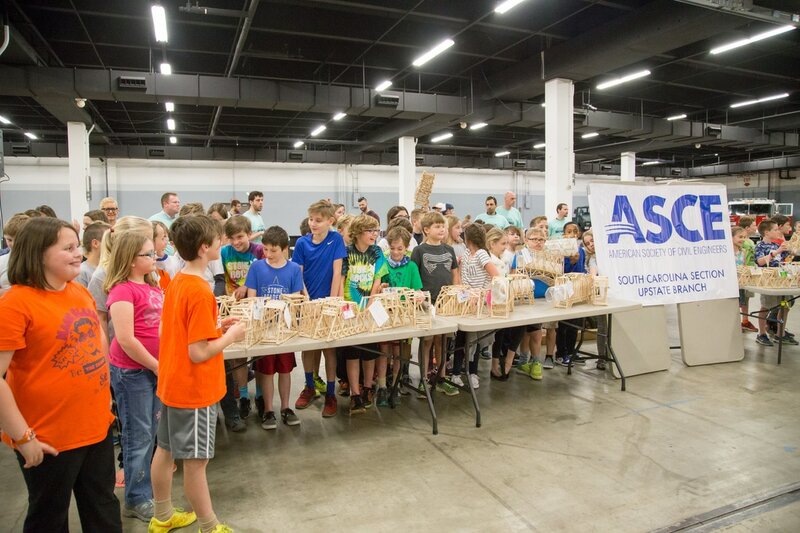 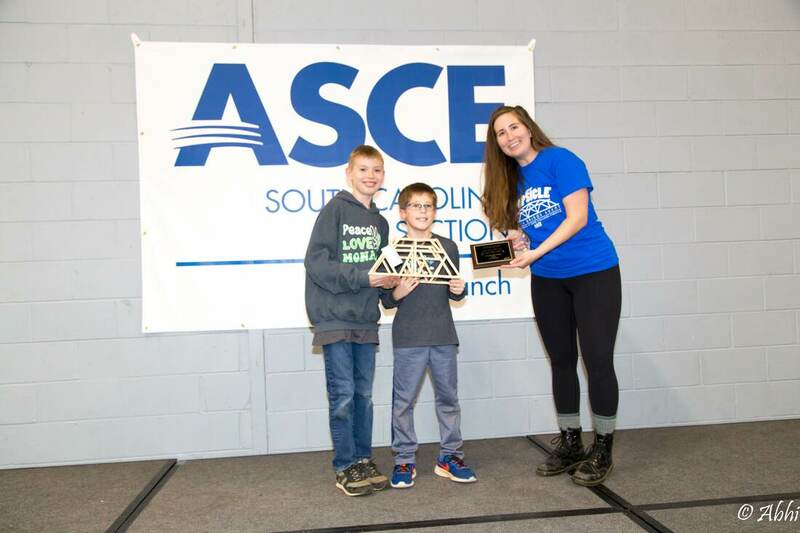 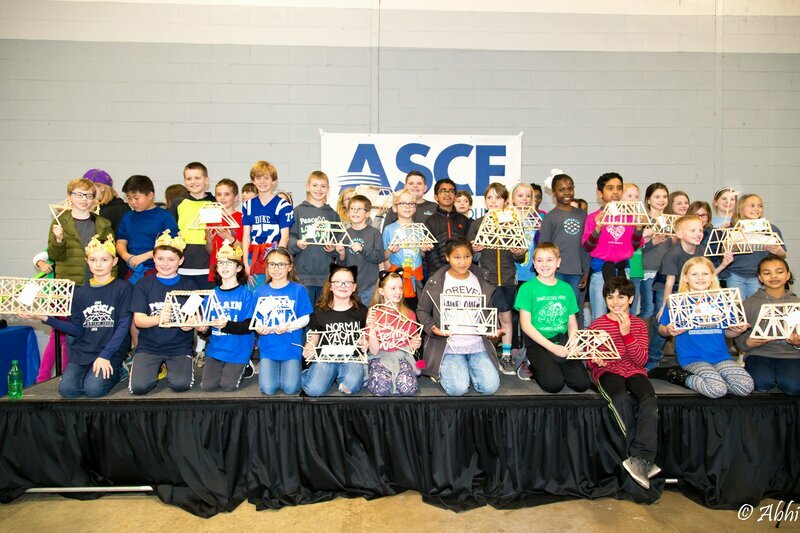 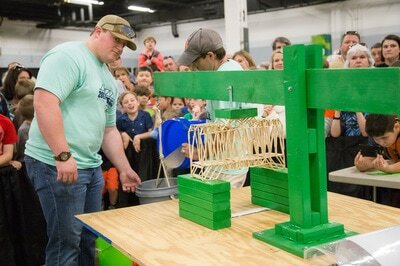 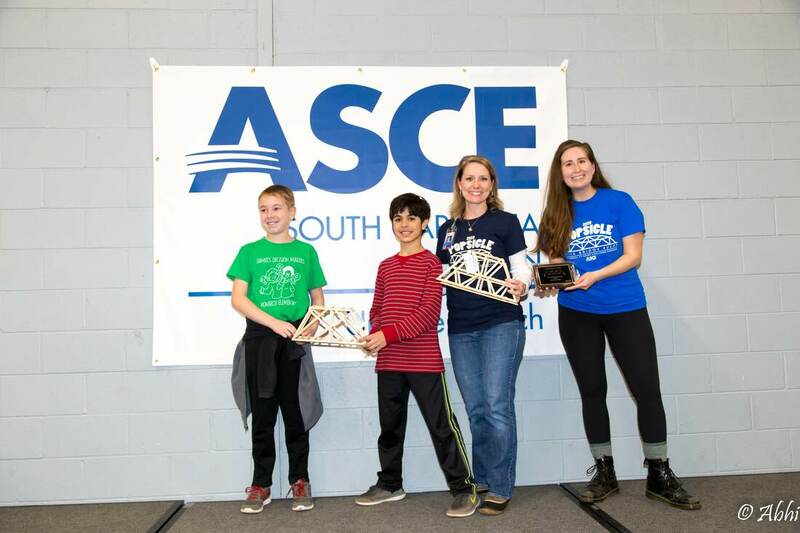 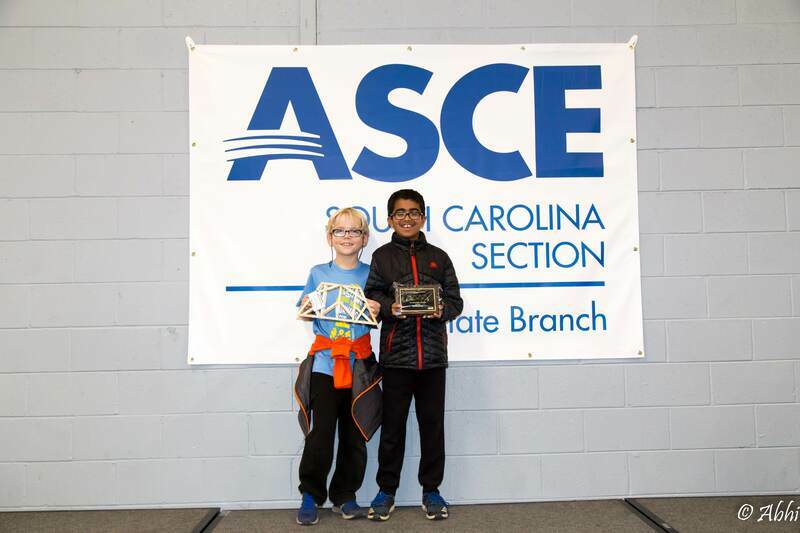 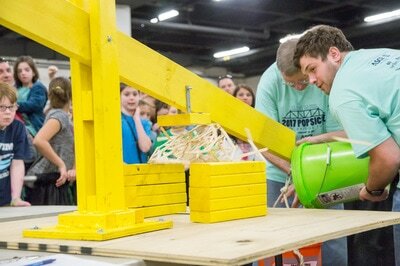 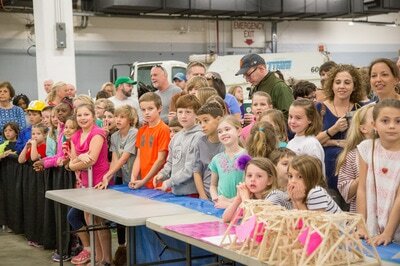 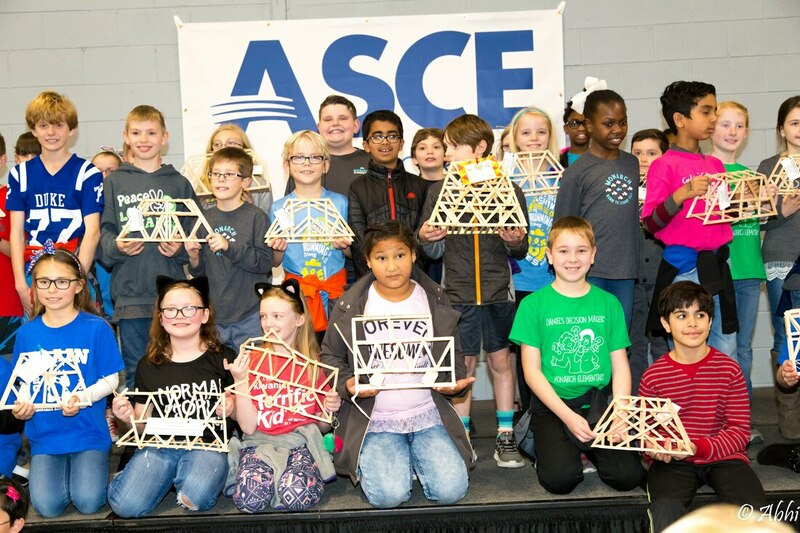 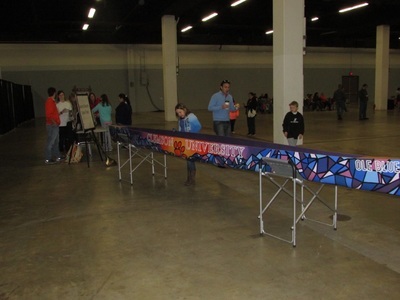 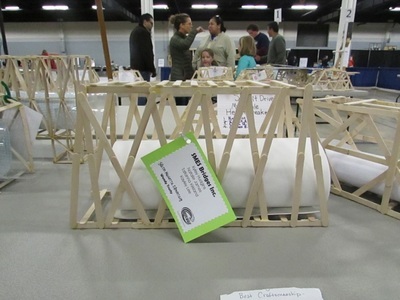 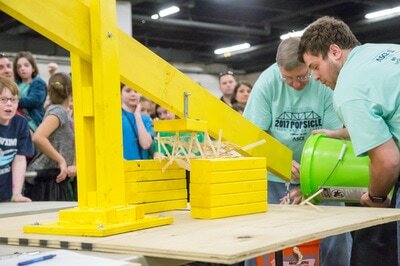 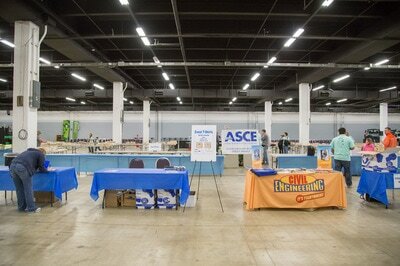 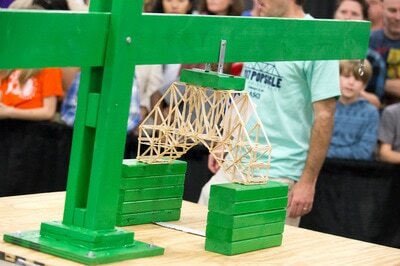 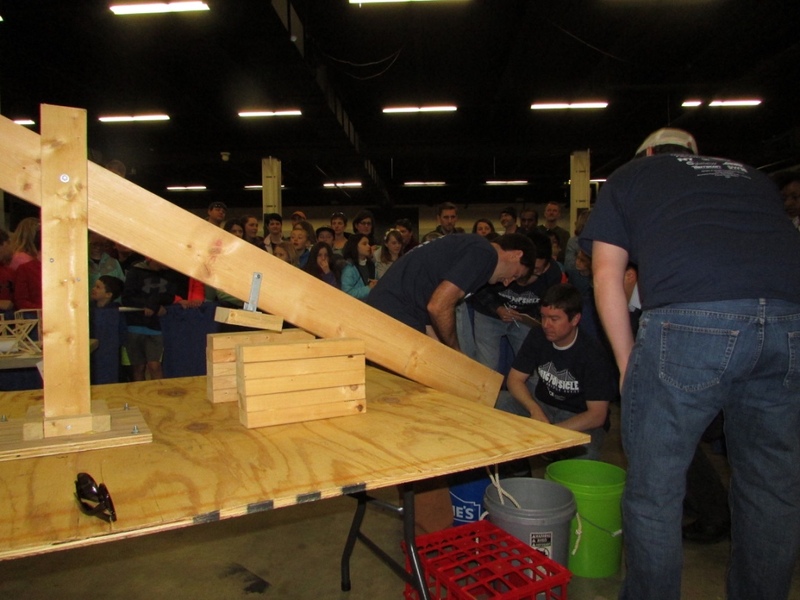 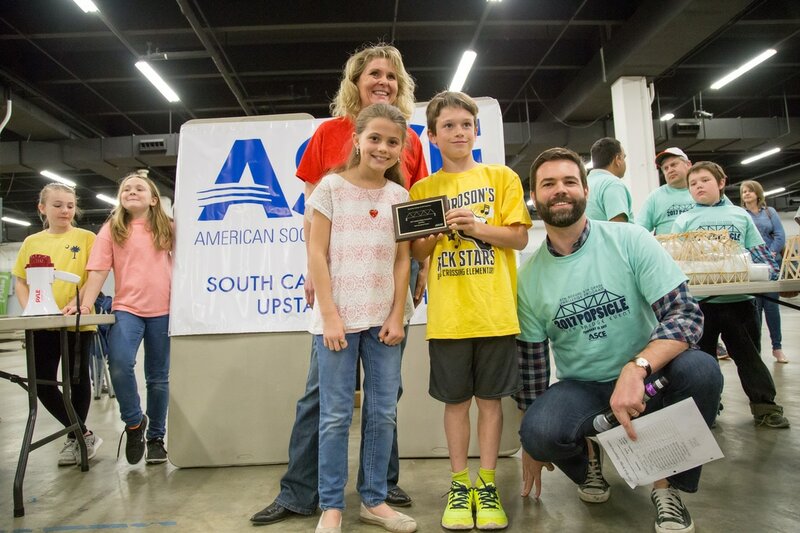 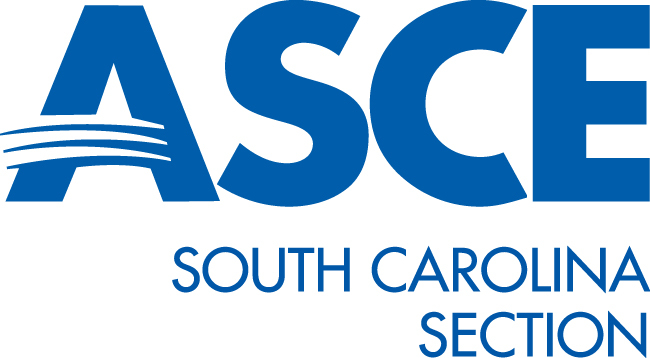 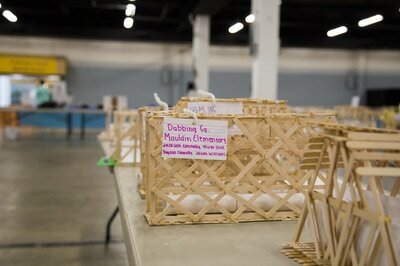 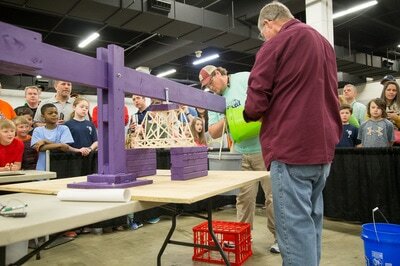 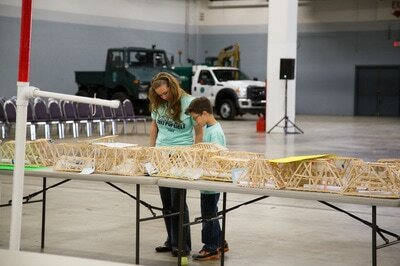 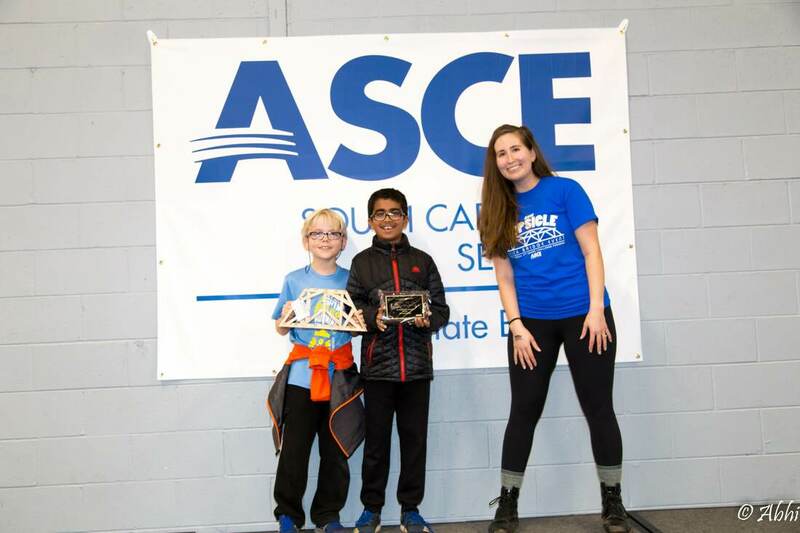 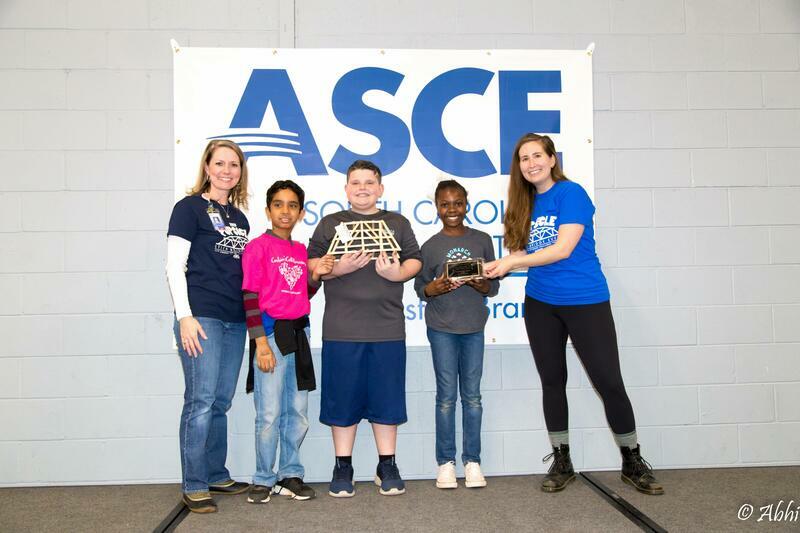 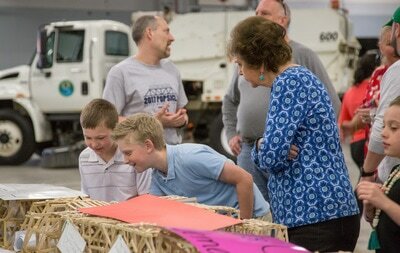 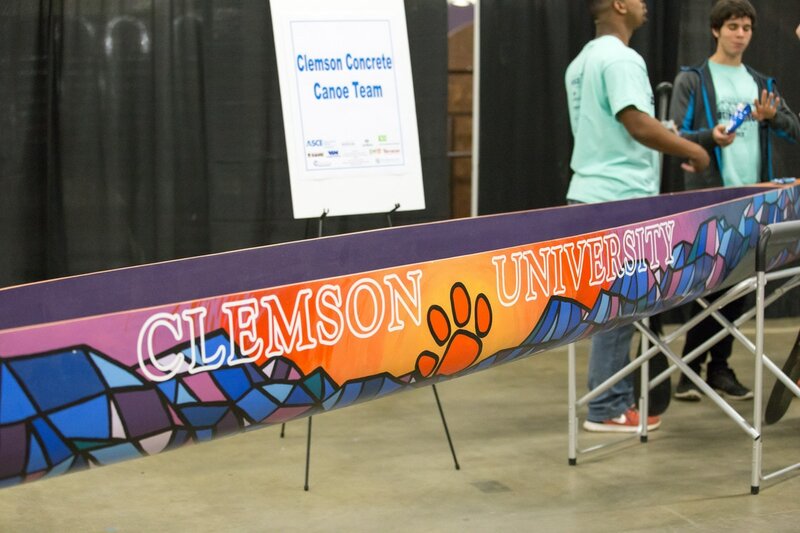 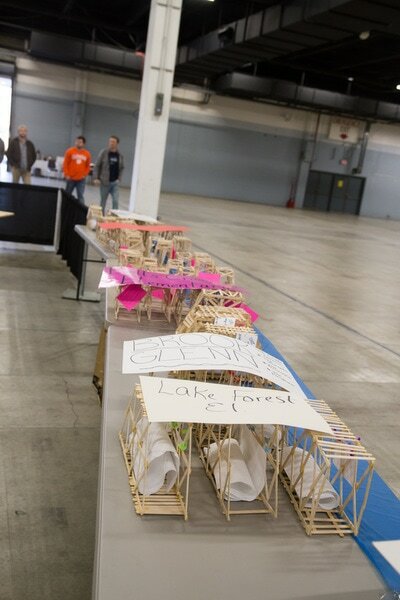 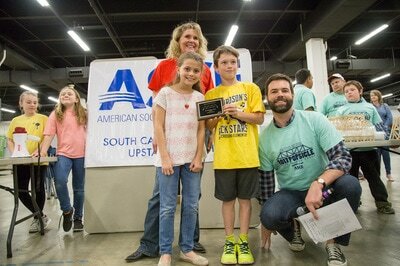 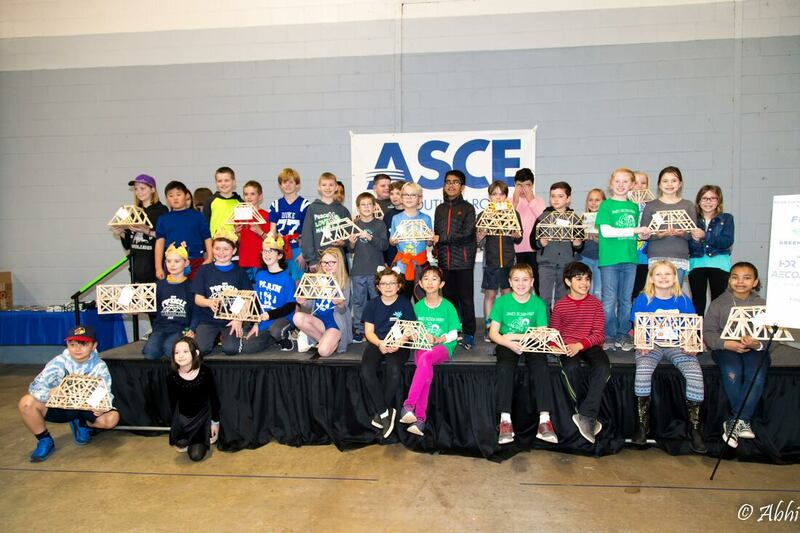 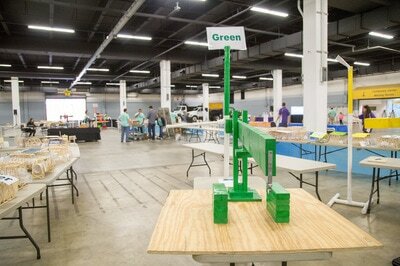 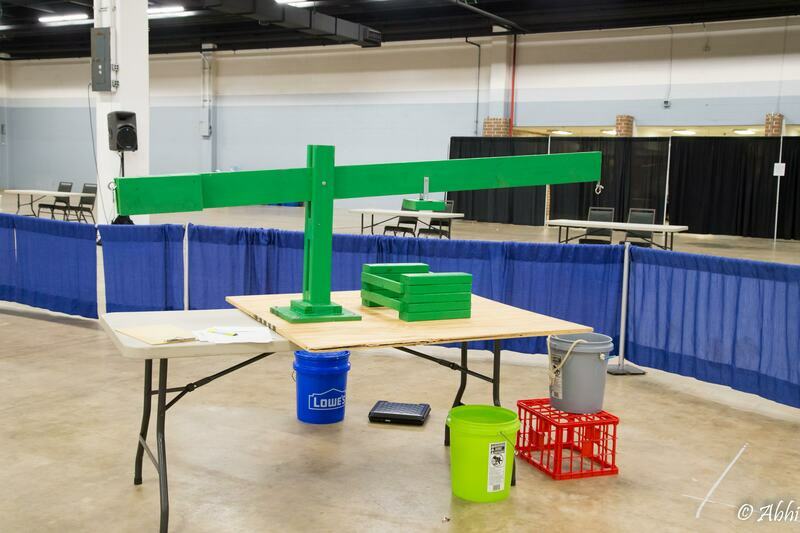 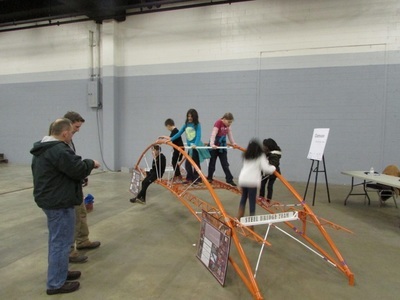 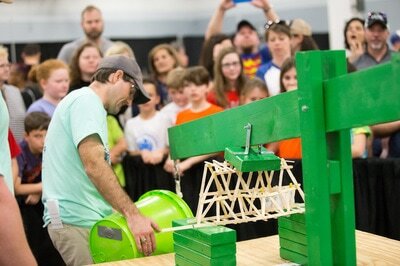 The ASCE SC Upstate Branch has been hosting the Popsicle Bridge Competition since 2009. 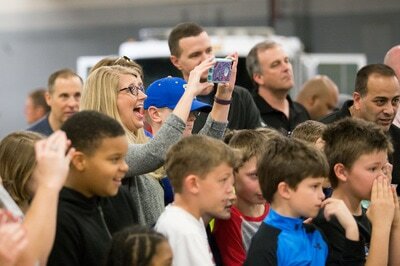 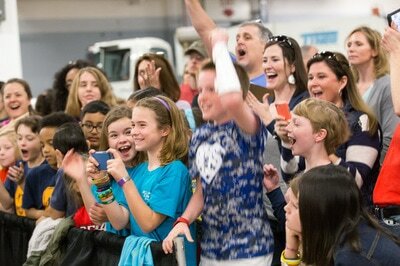 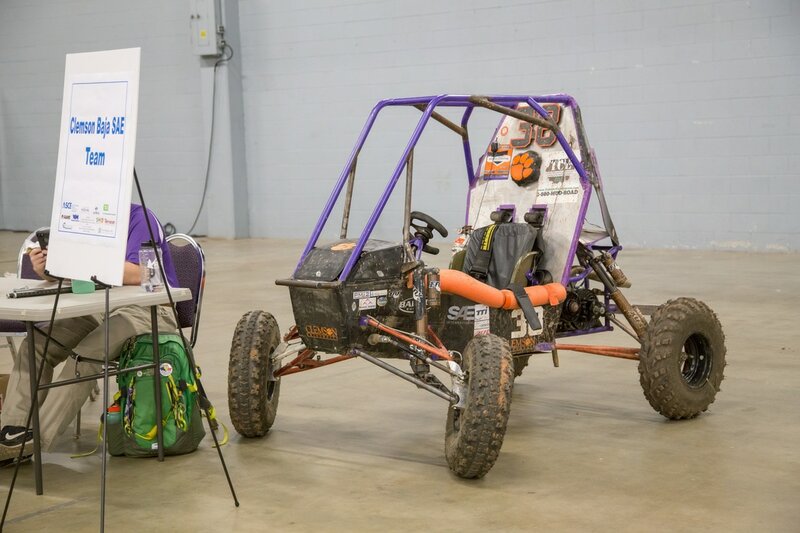 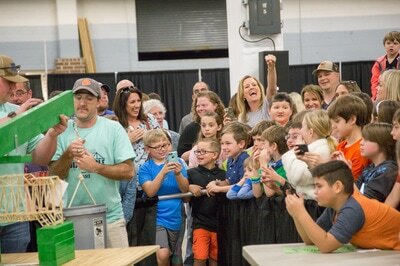 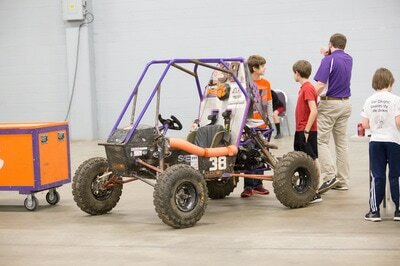 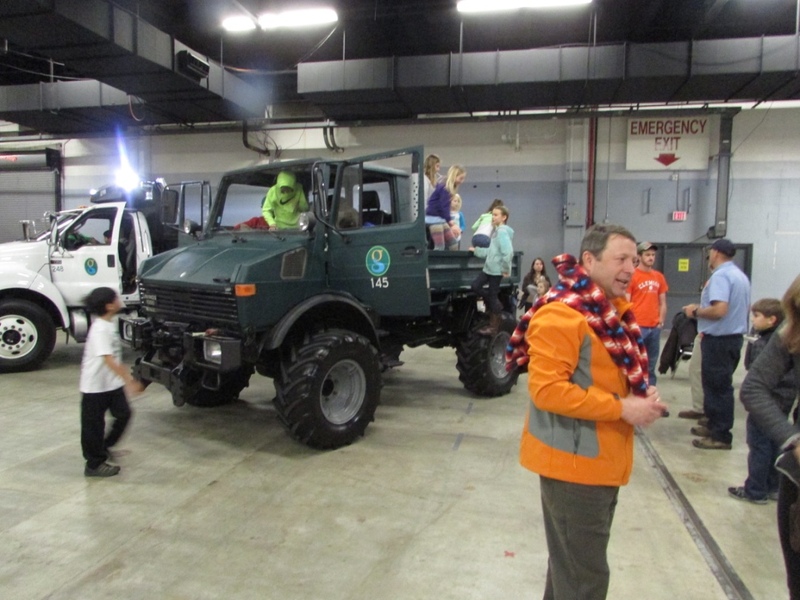 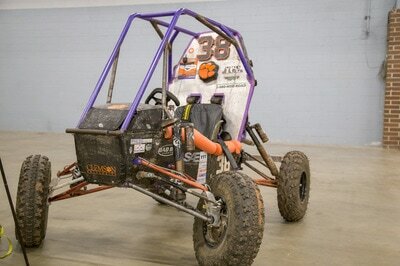 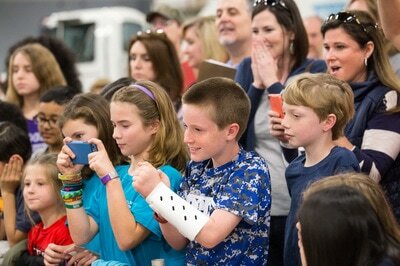 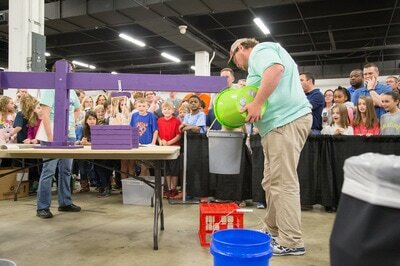 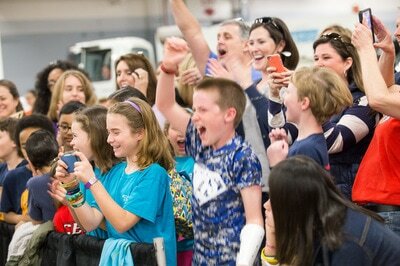 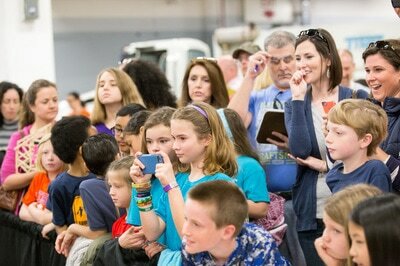 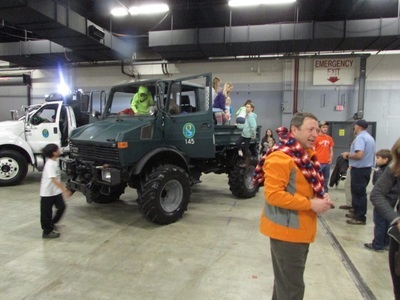 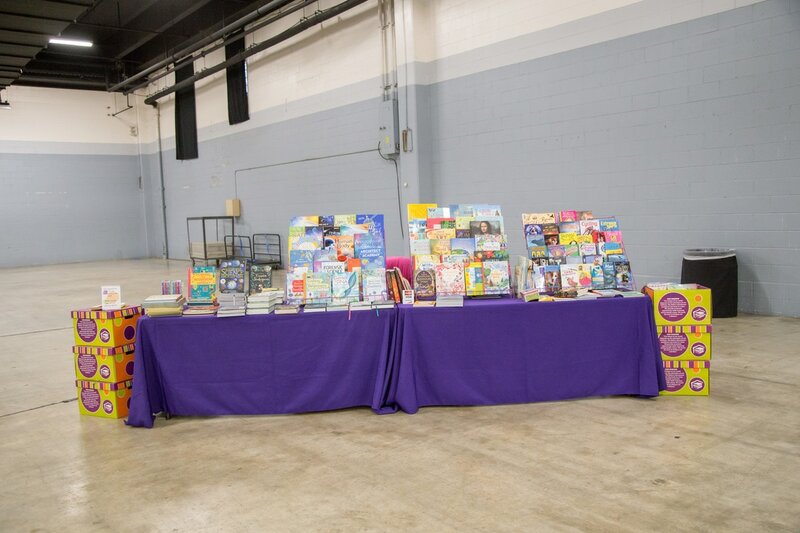 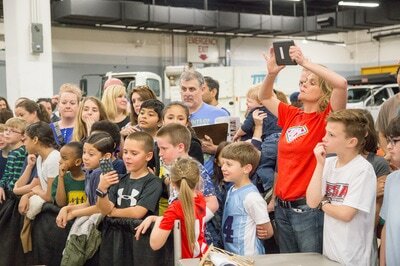 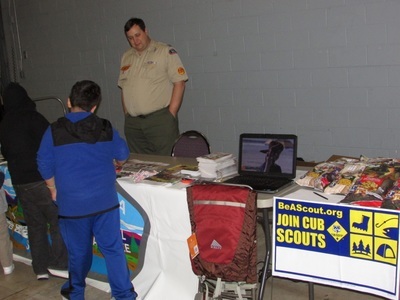 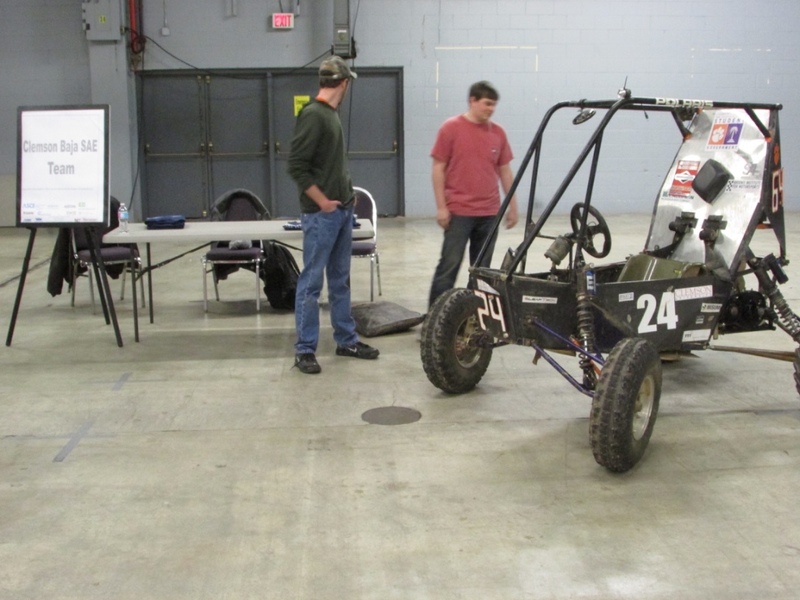 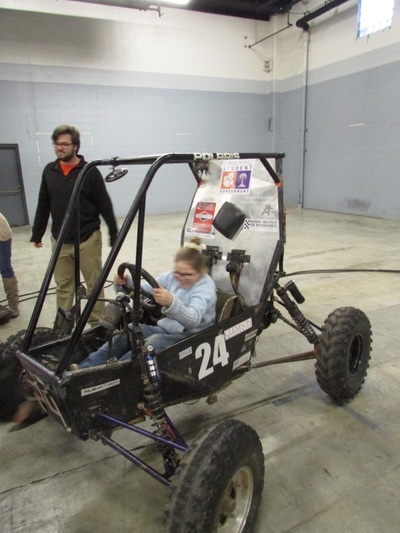 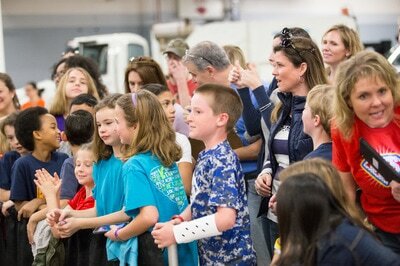 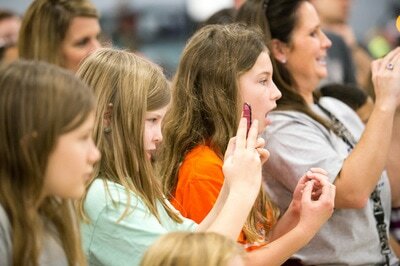 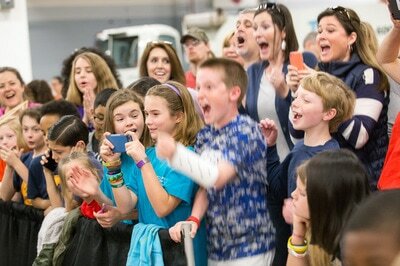 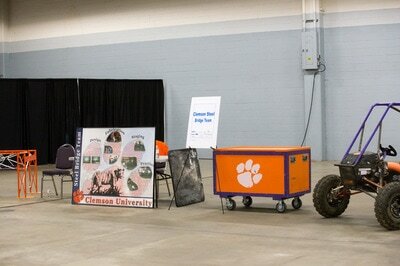 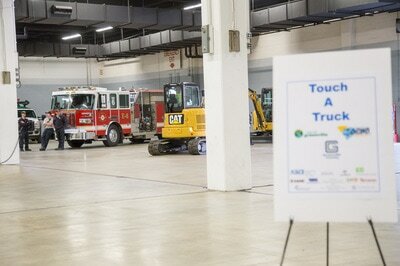 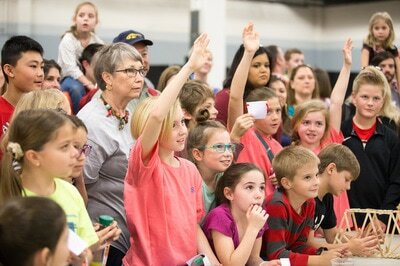 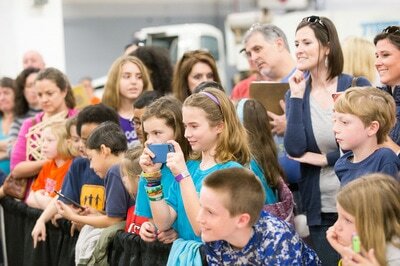 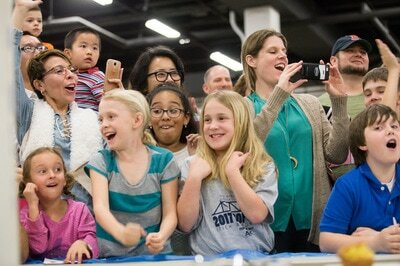 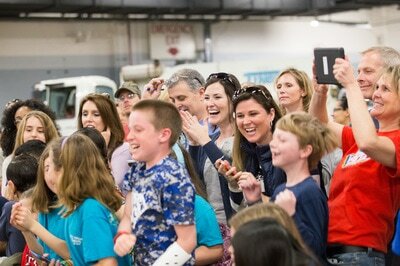 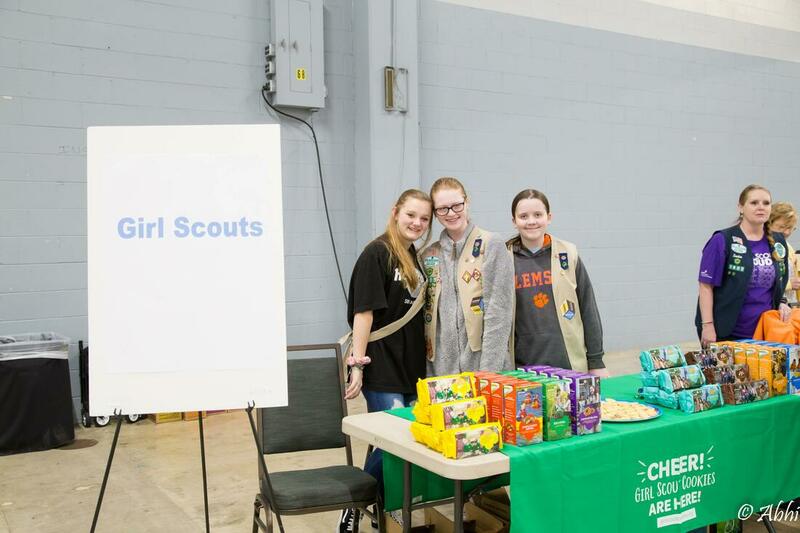 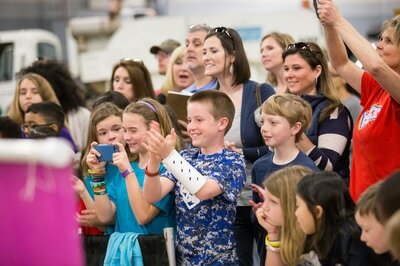 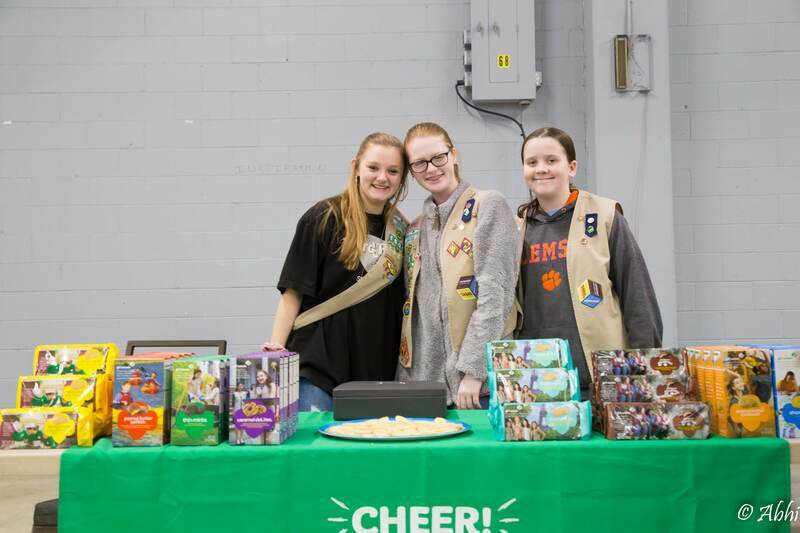 The event was started by the Upstate Branch members and the Greenville County Challenge Program teachers. 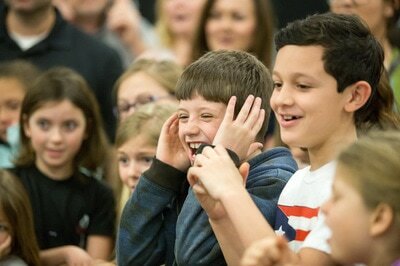 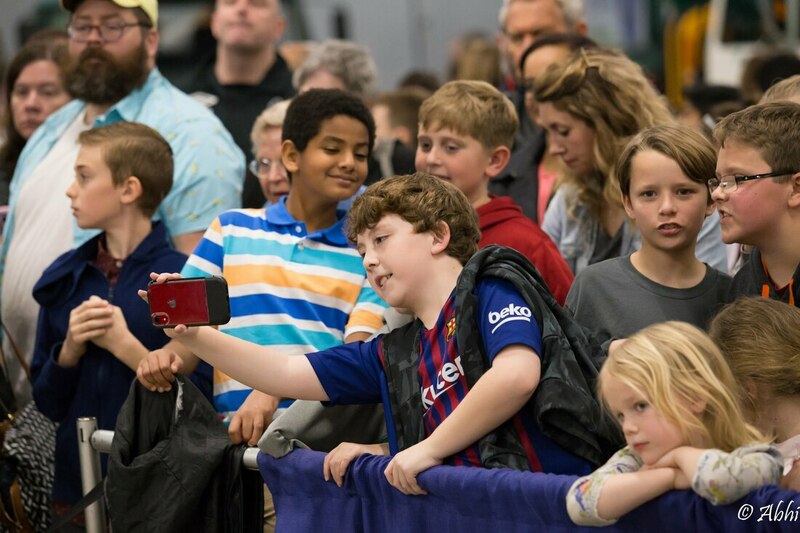 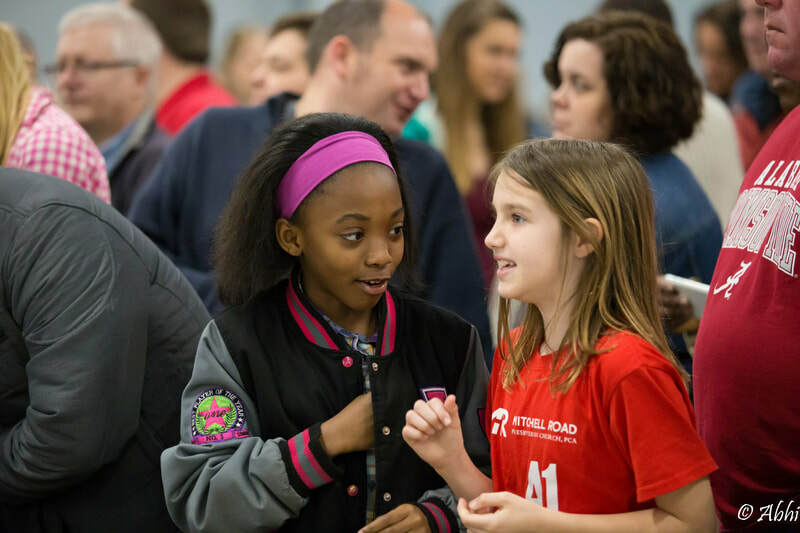 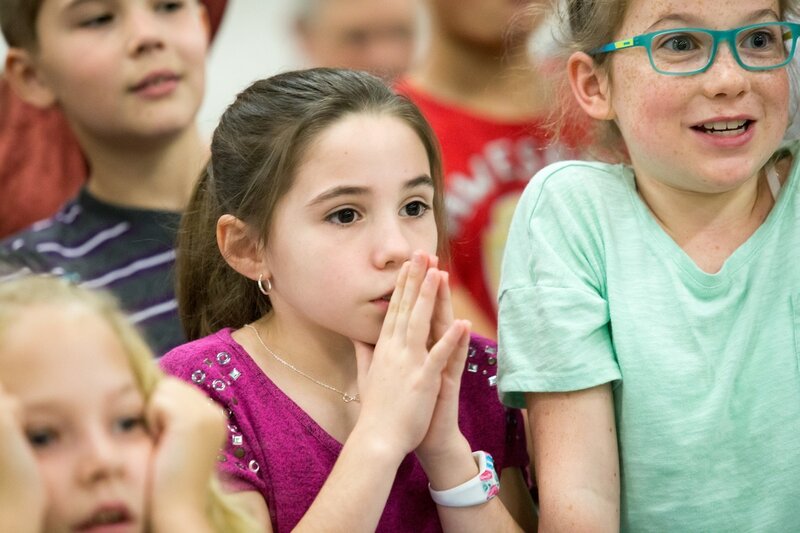 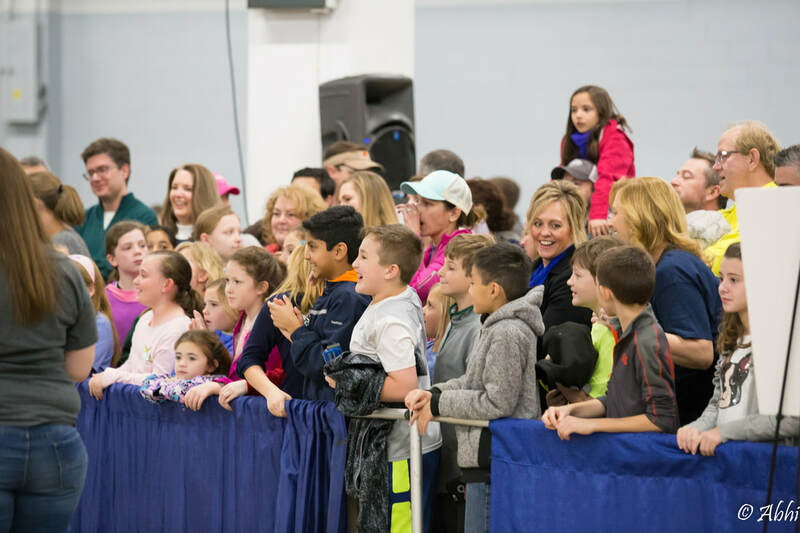 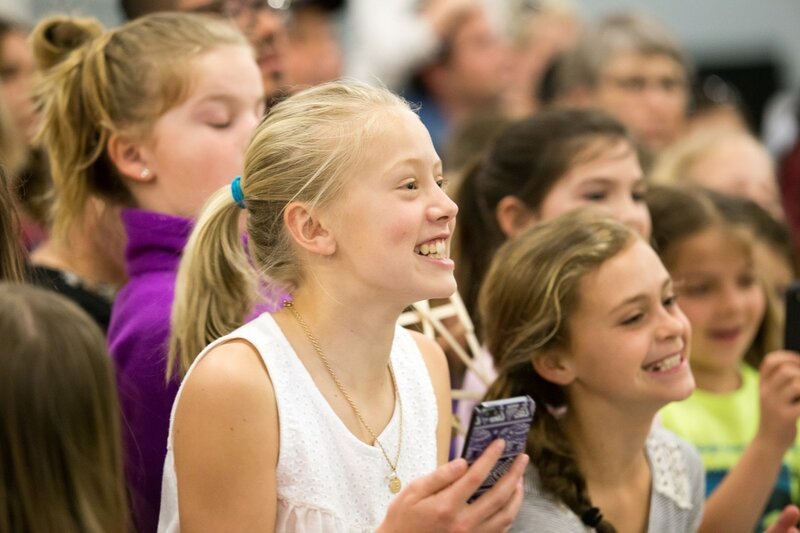 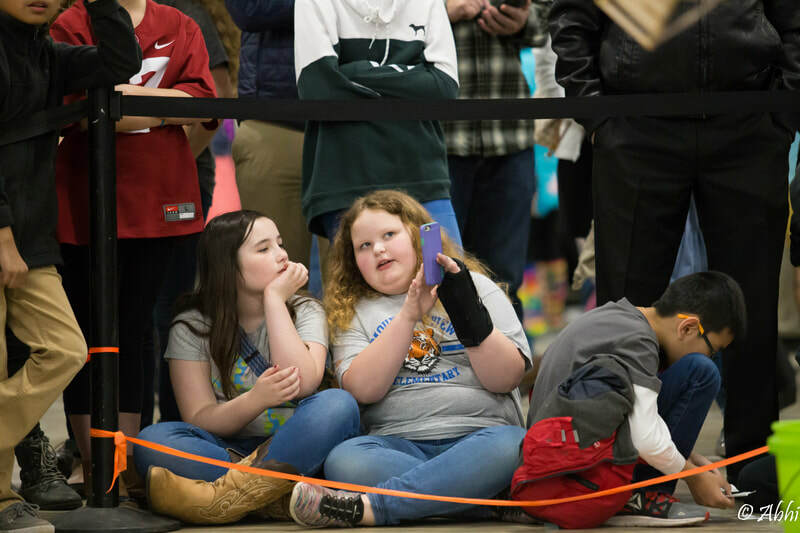 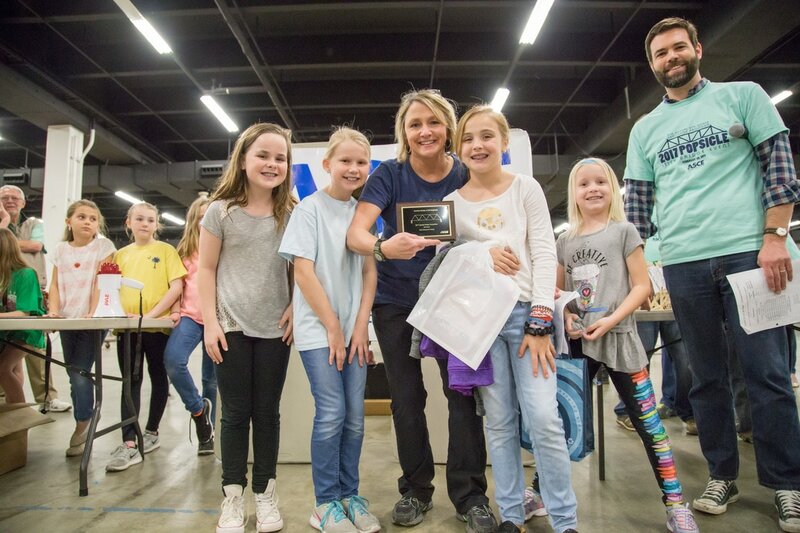 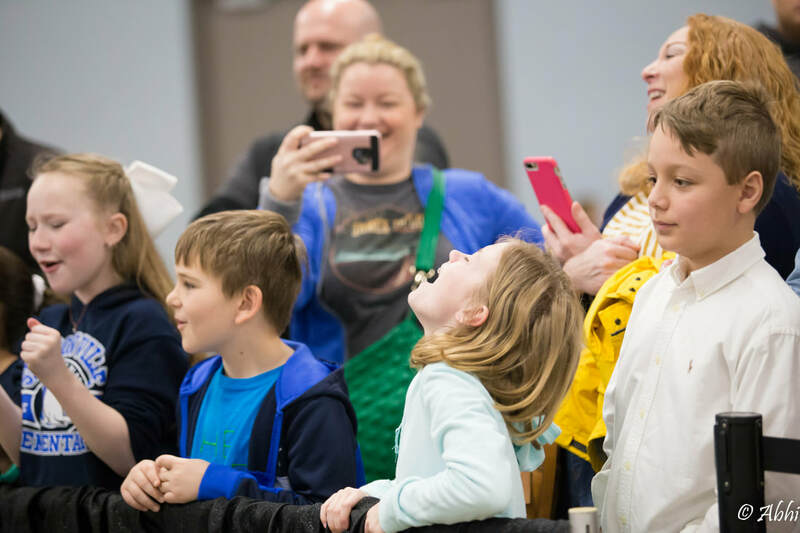 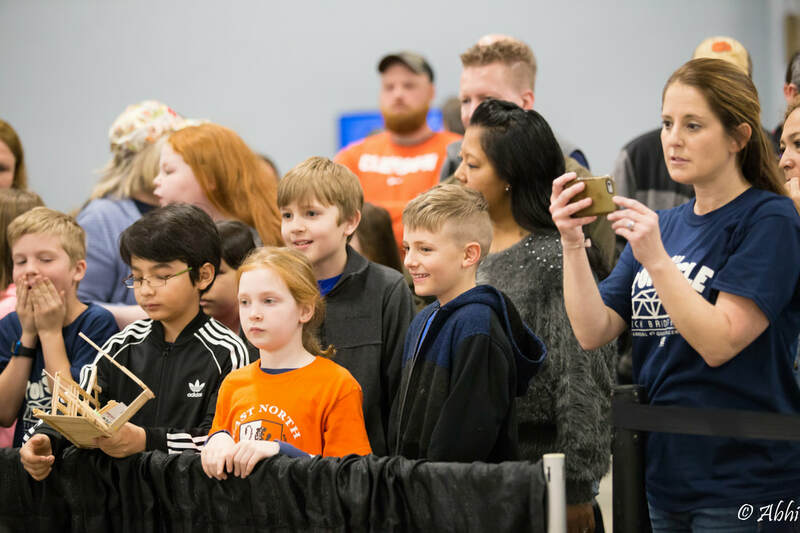 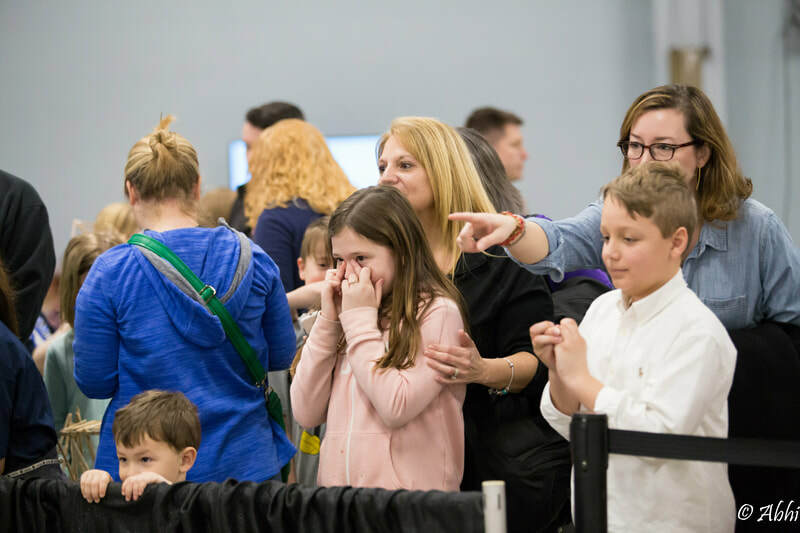 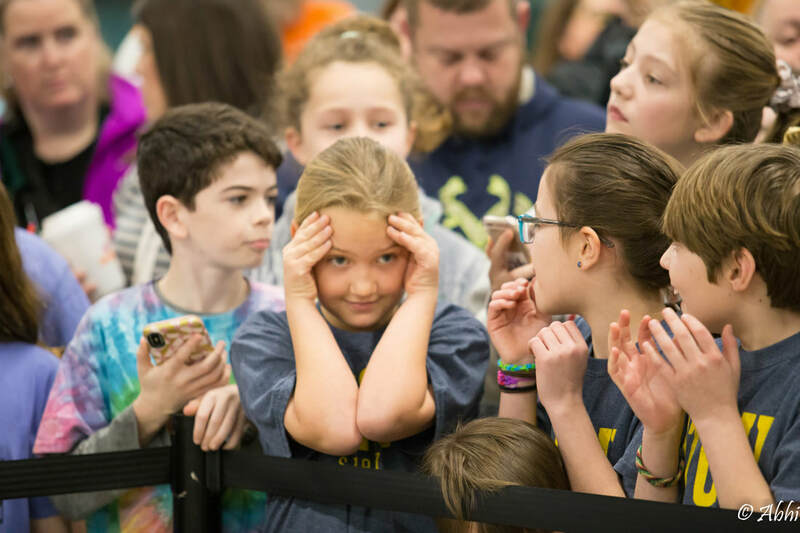 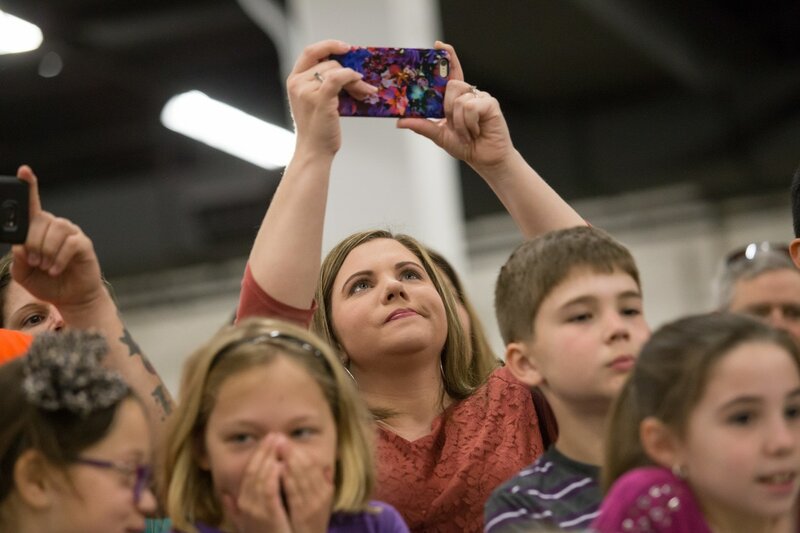 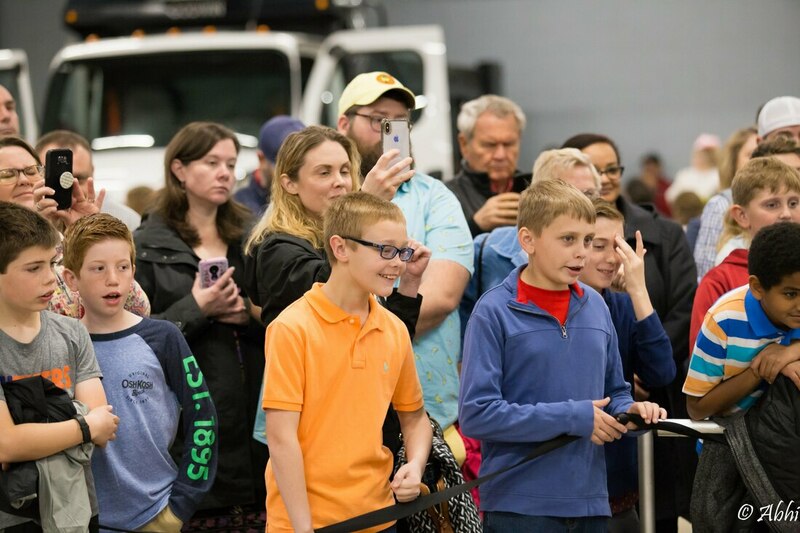 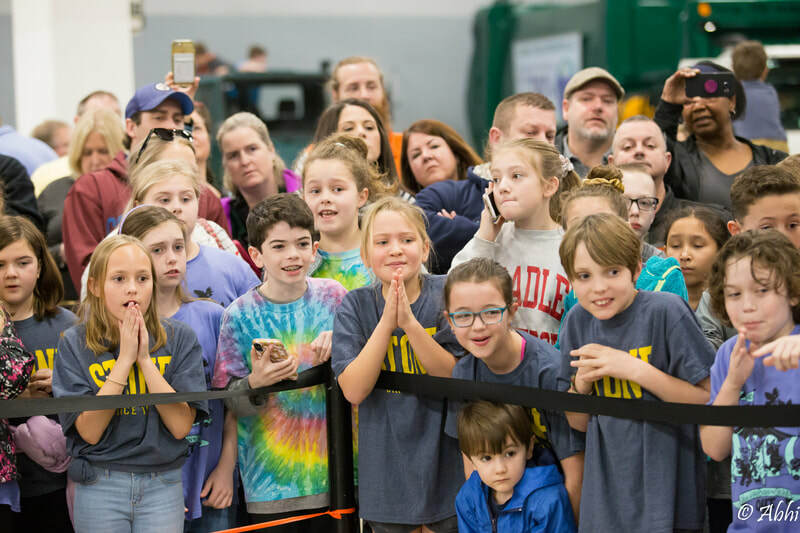 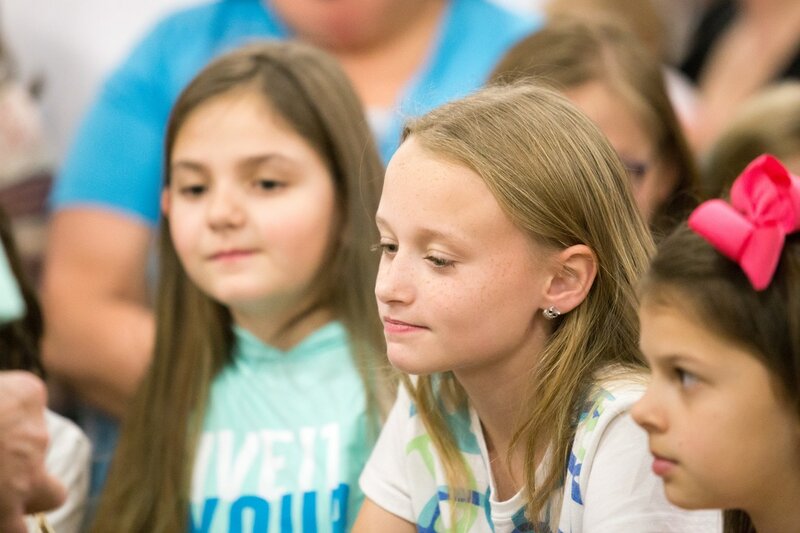 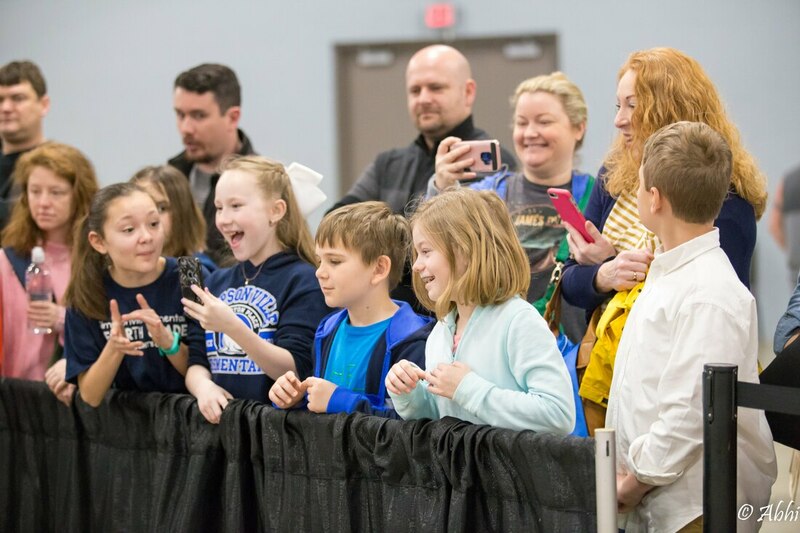 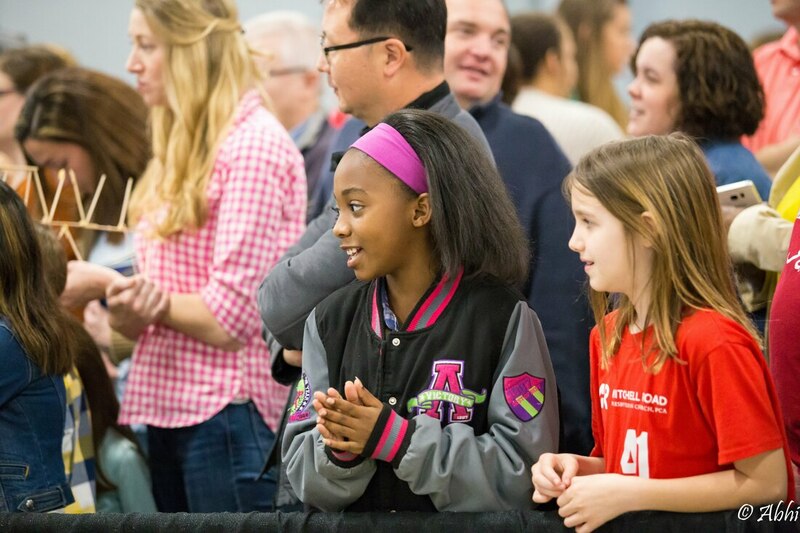 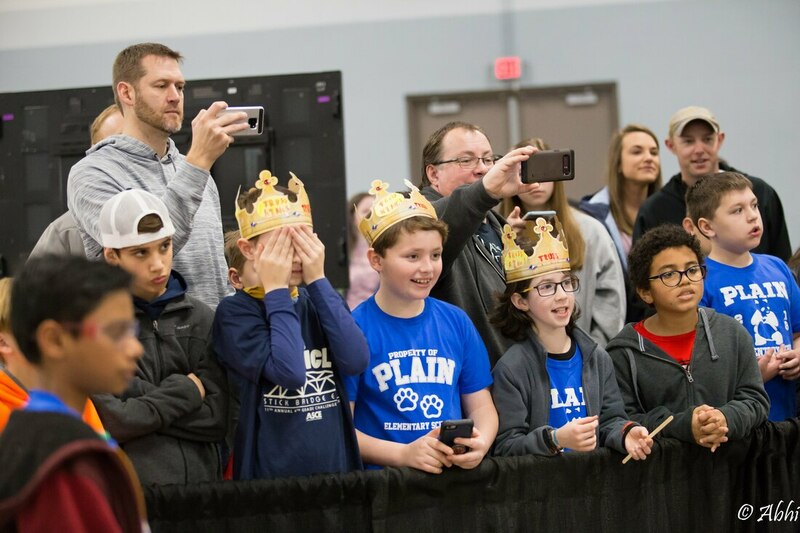 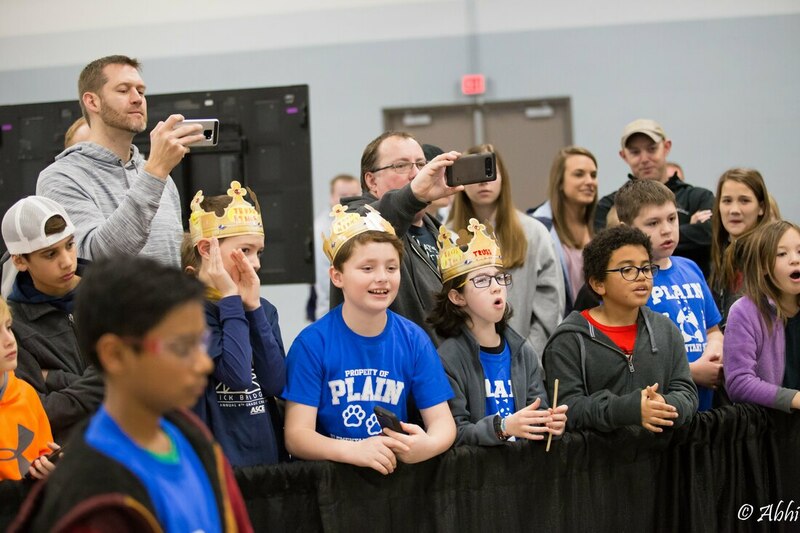 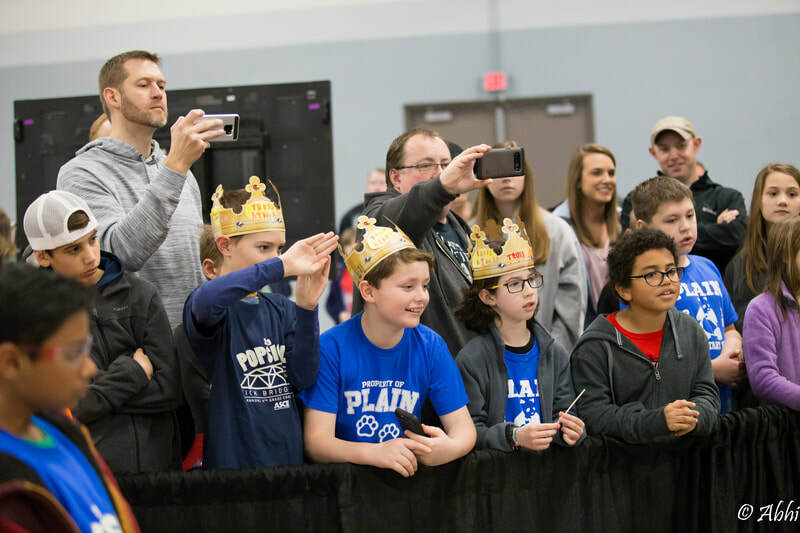 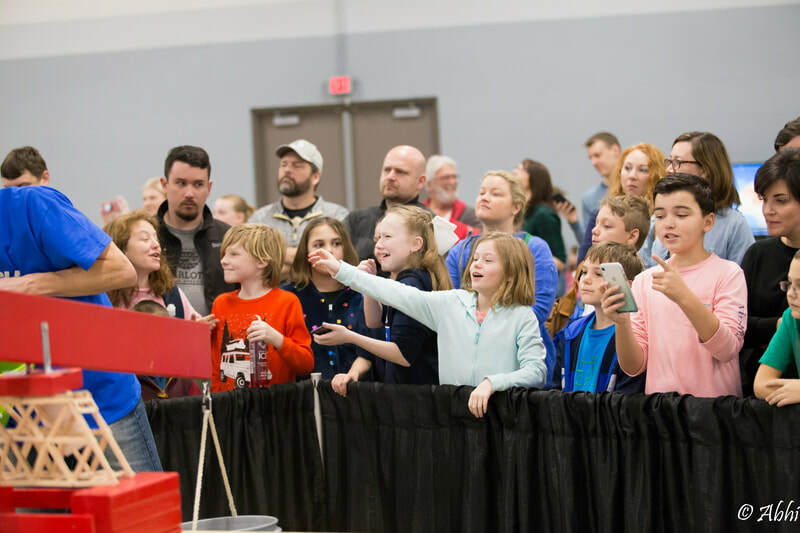 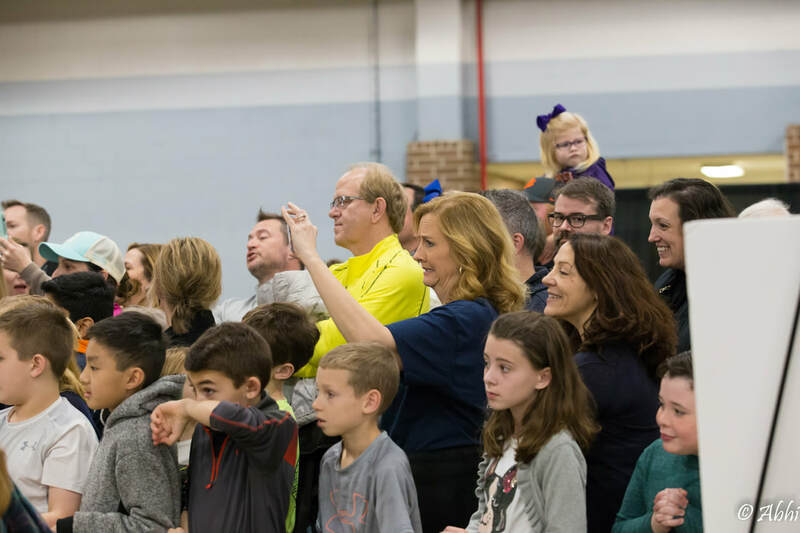 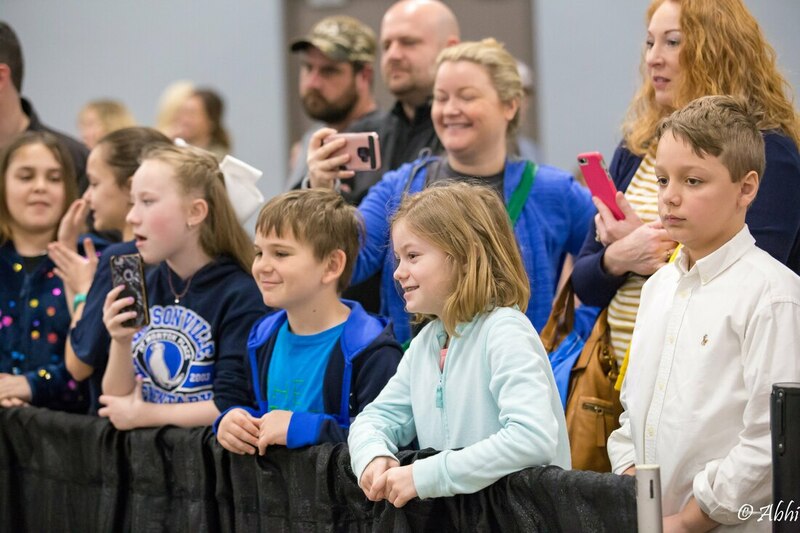 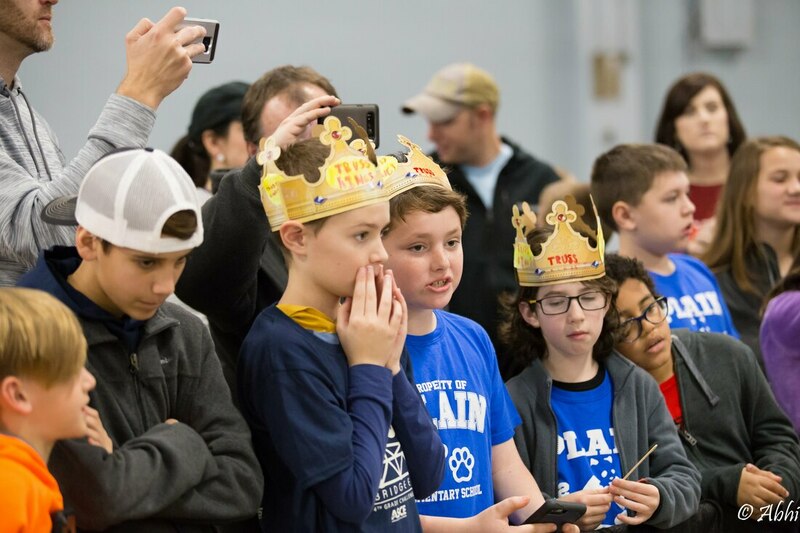 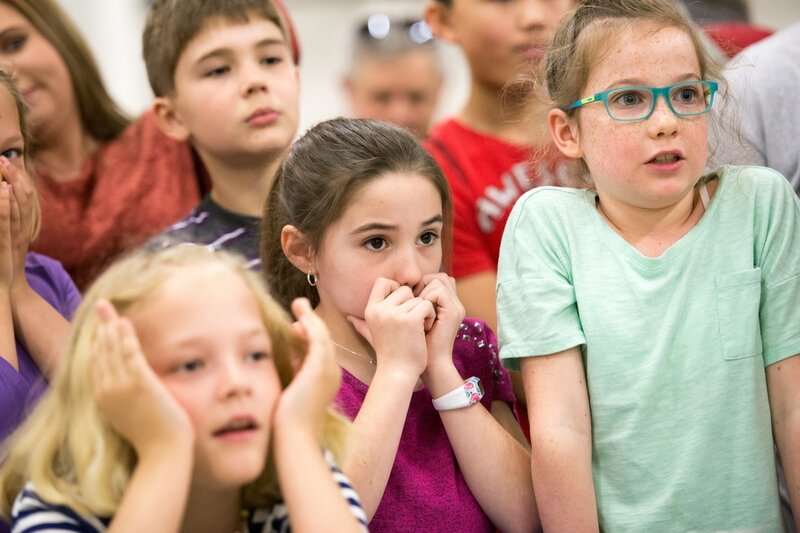 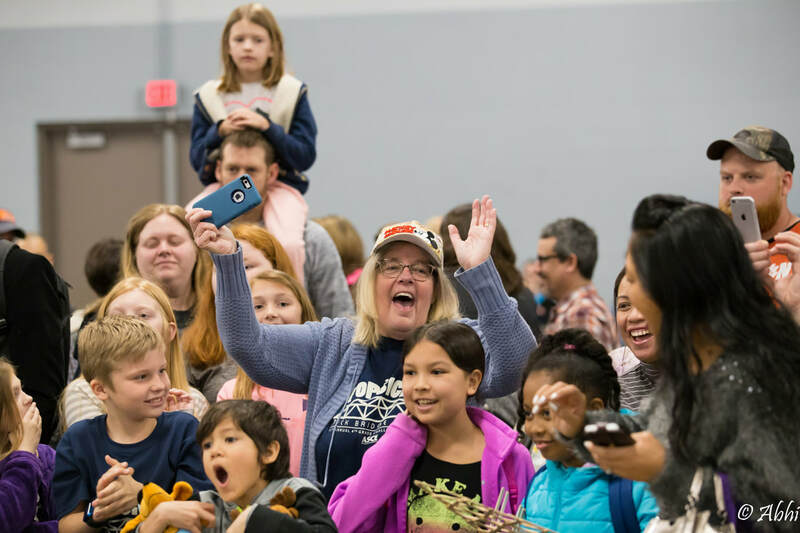 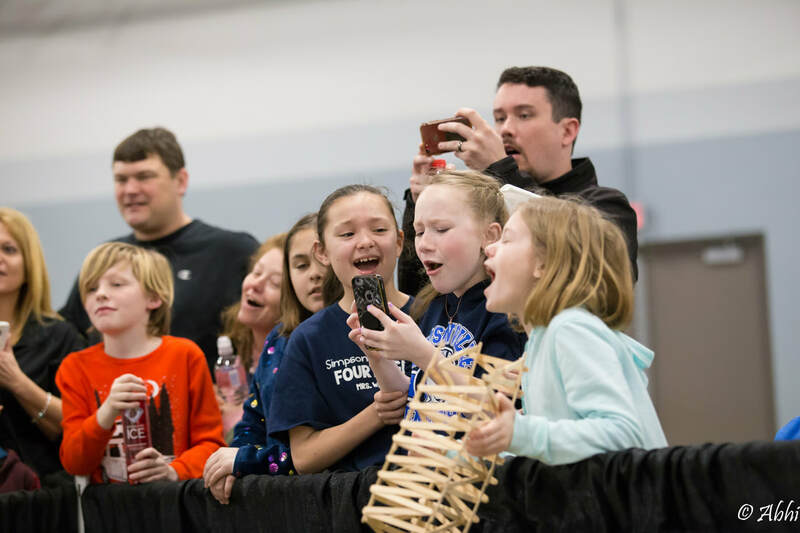 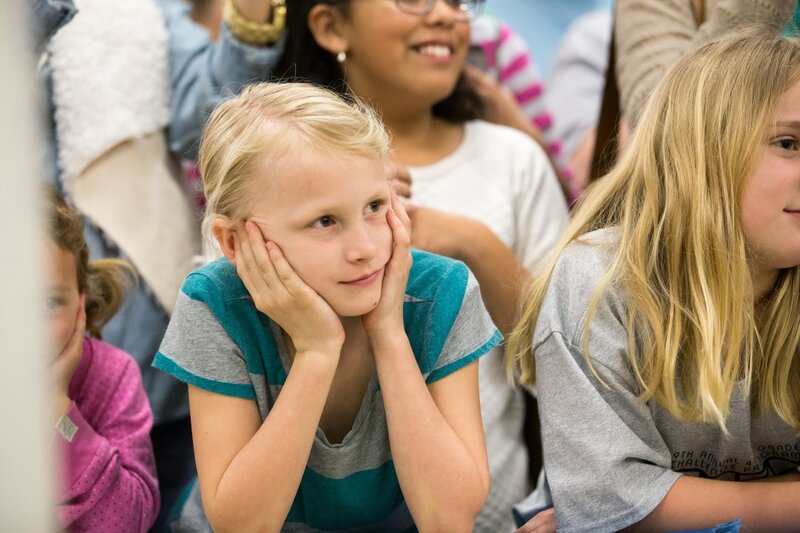 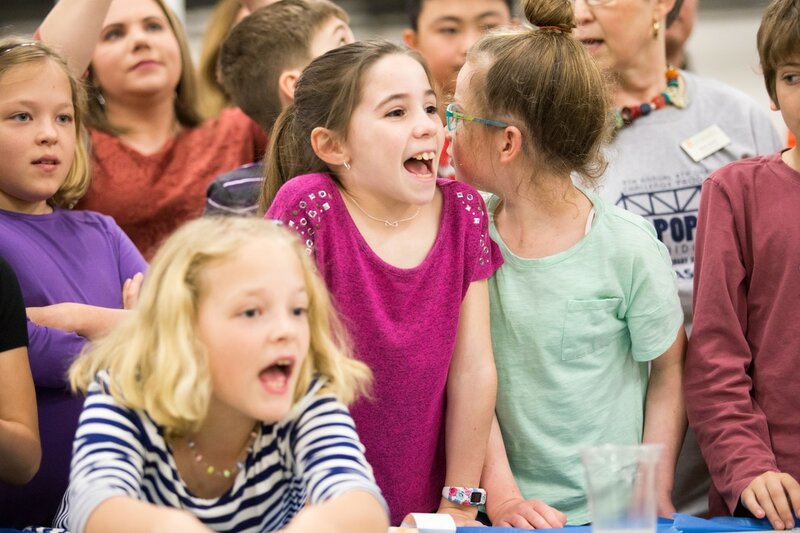 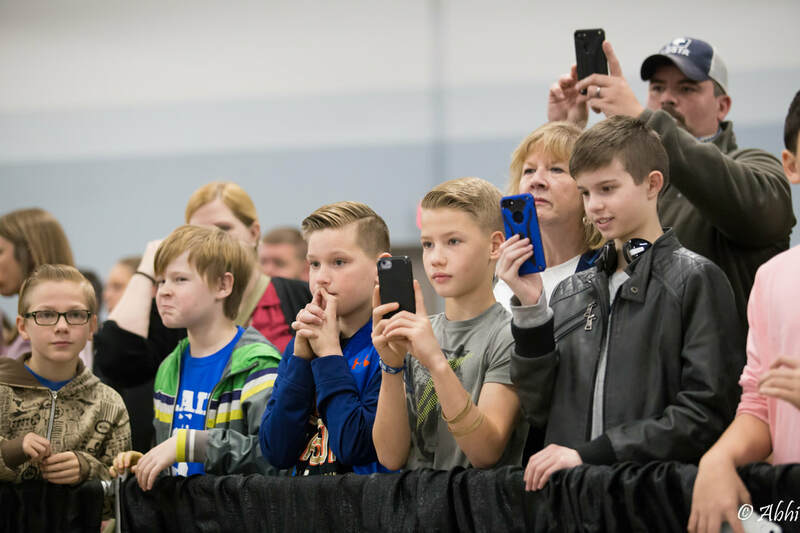 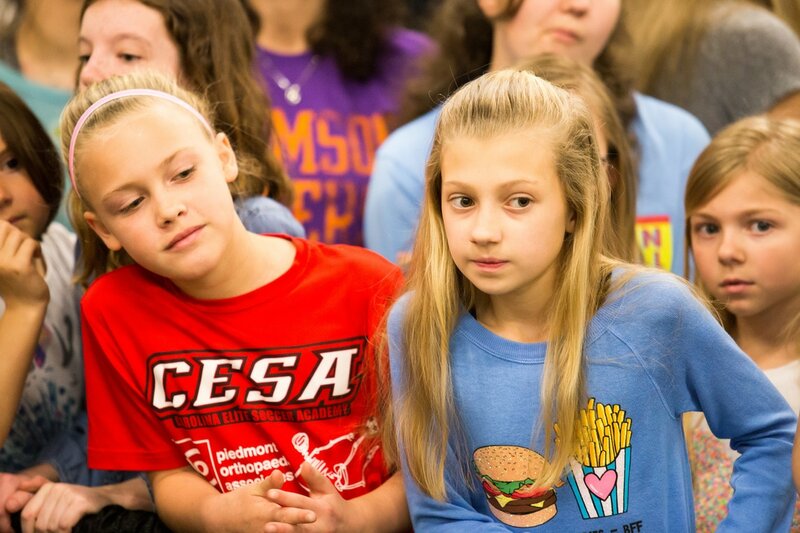 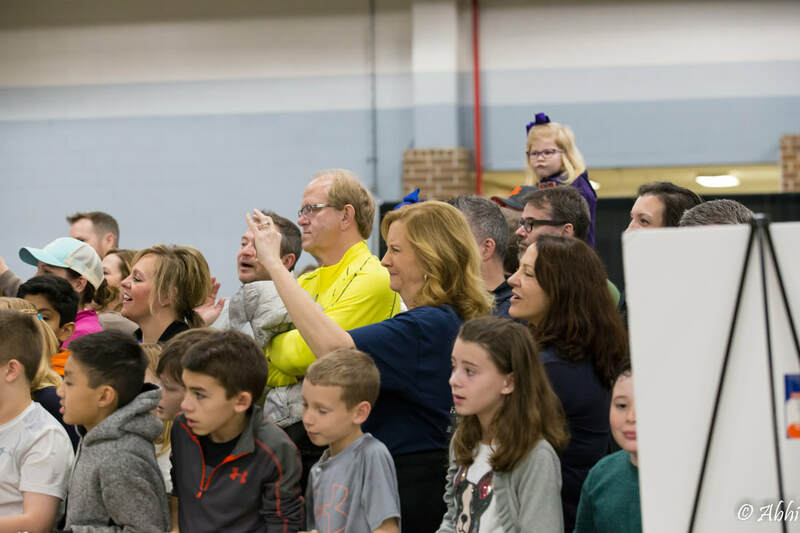 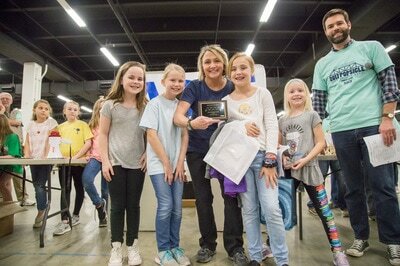 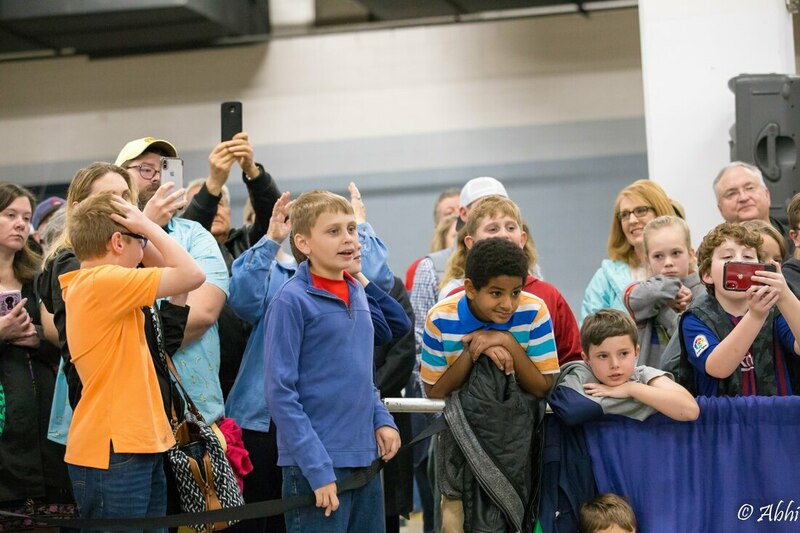 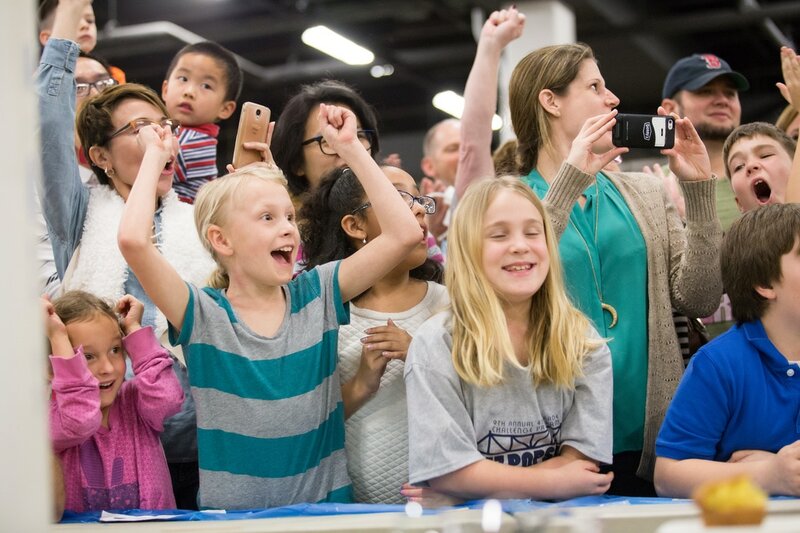 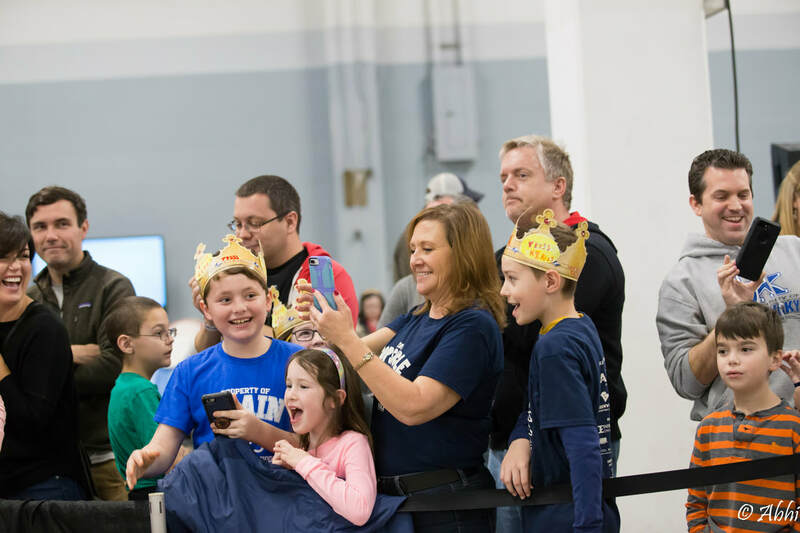 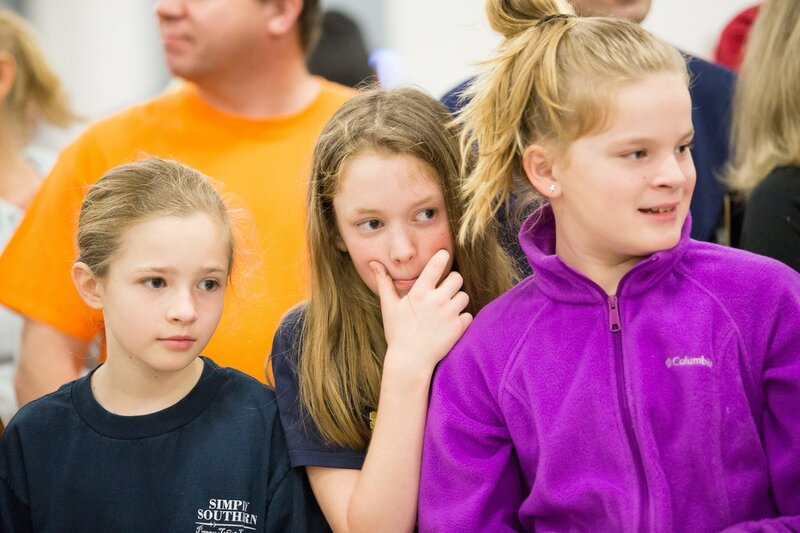 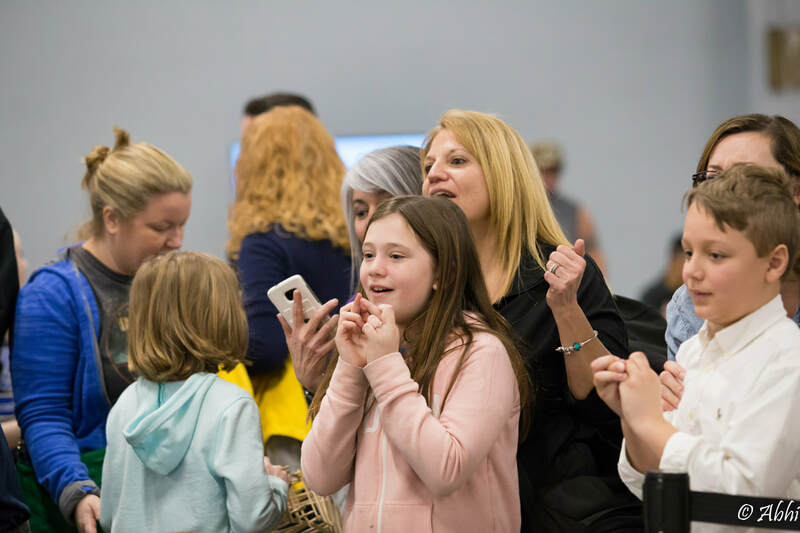 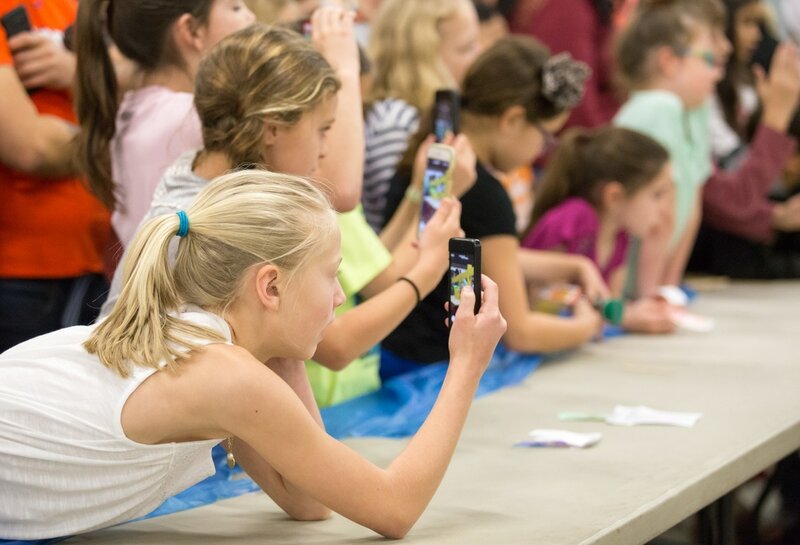 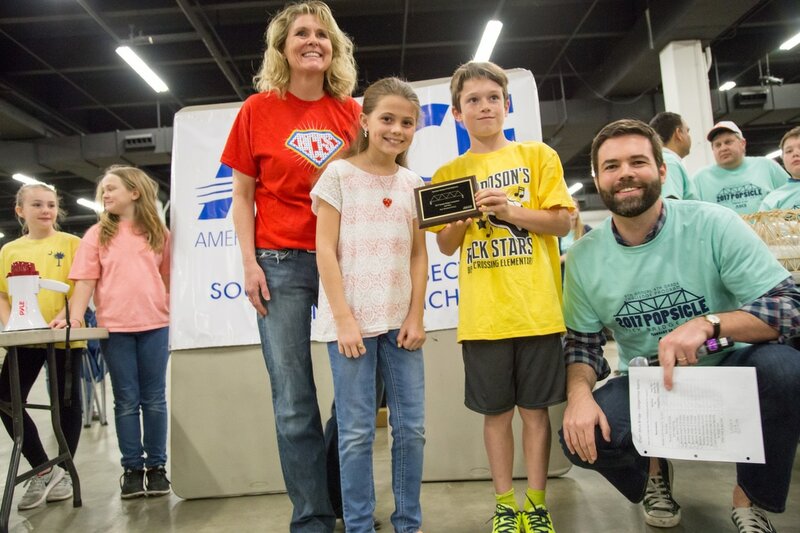 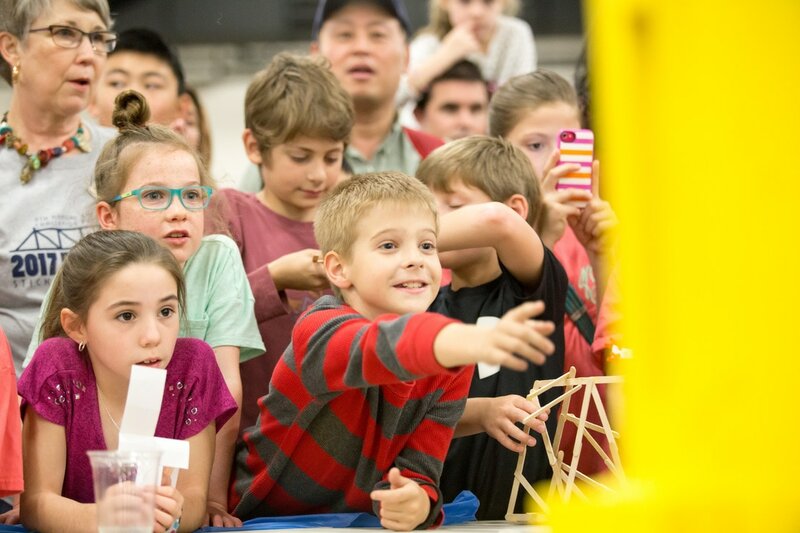 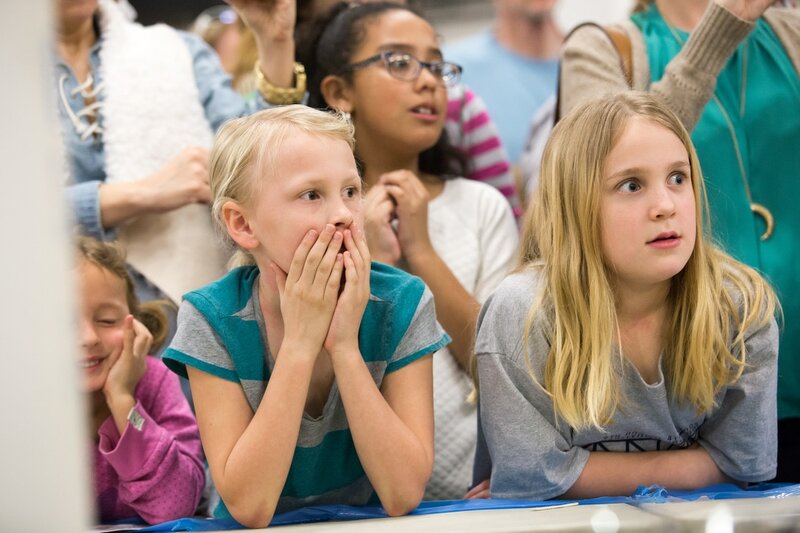 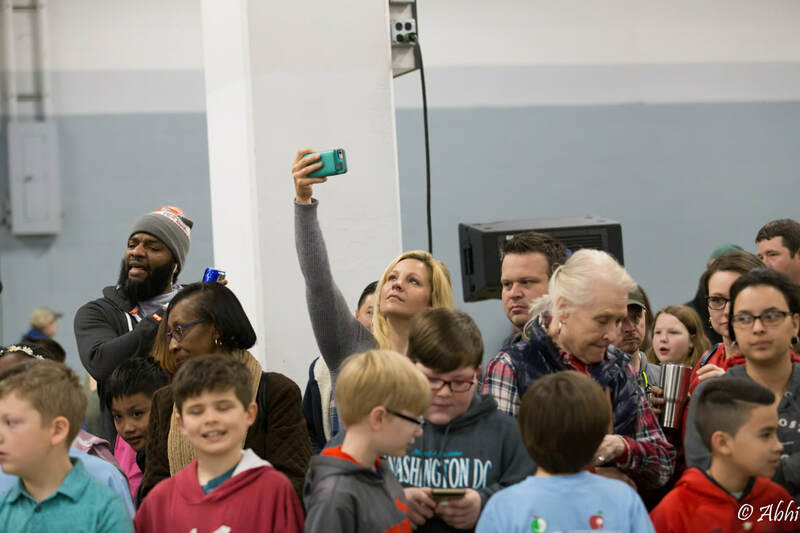 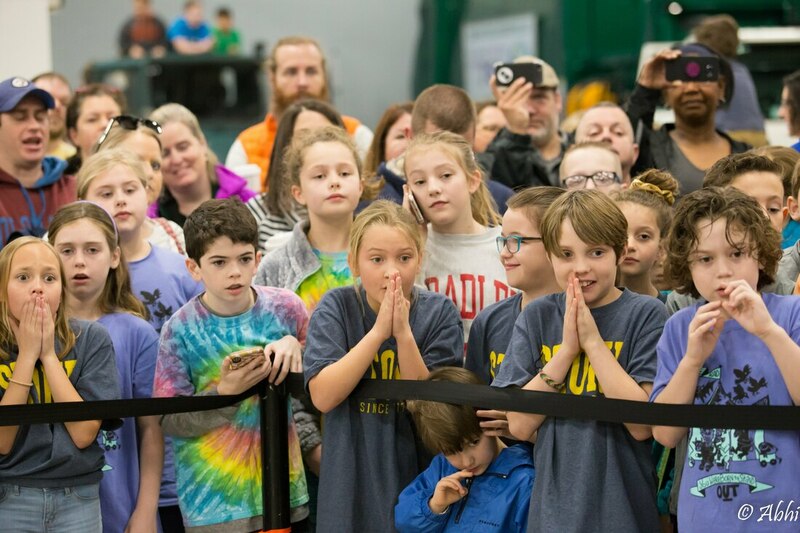 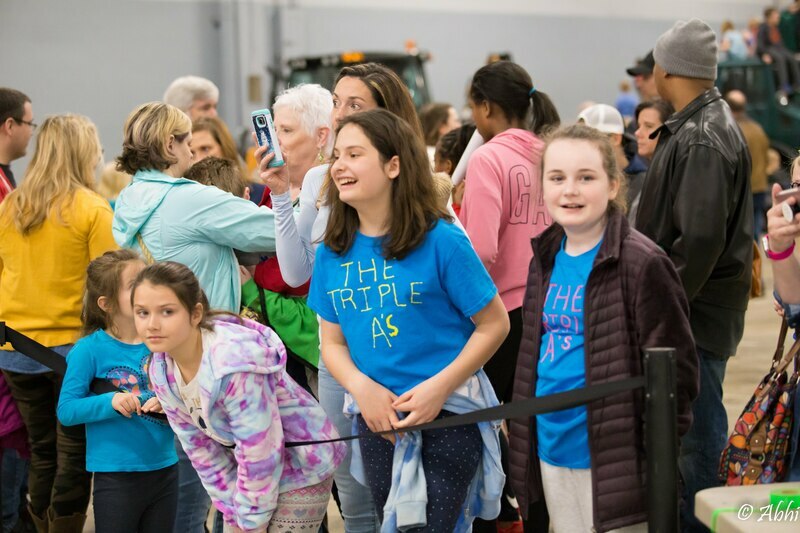 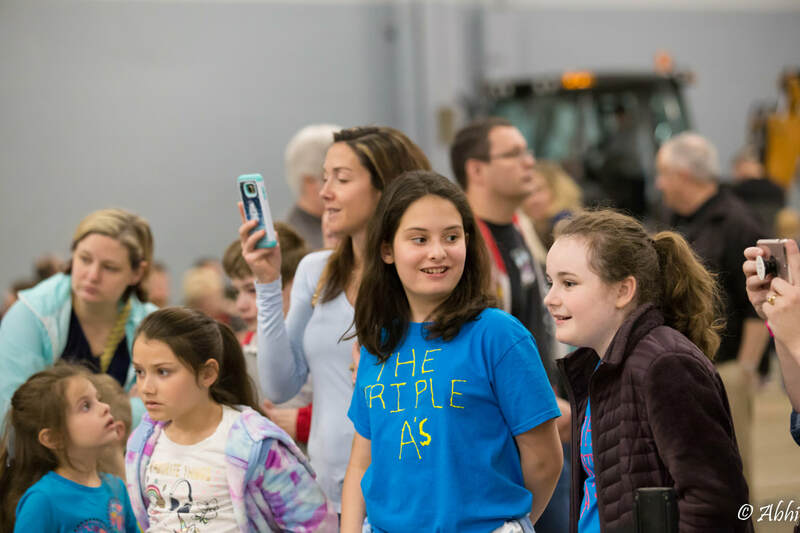 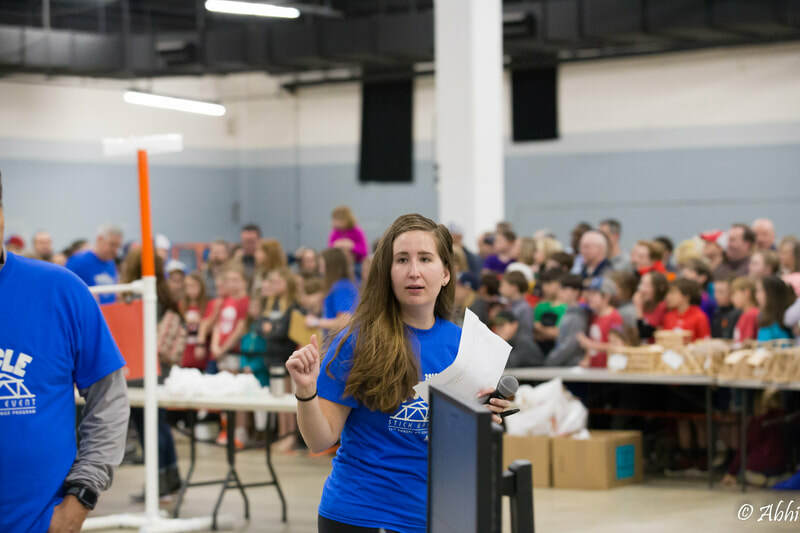 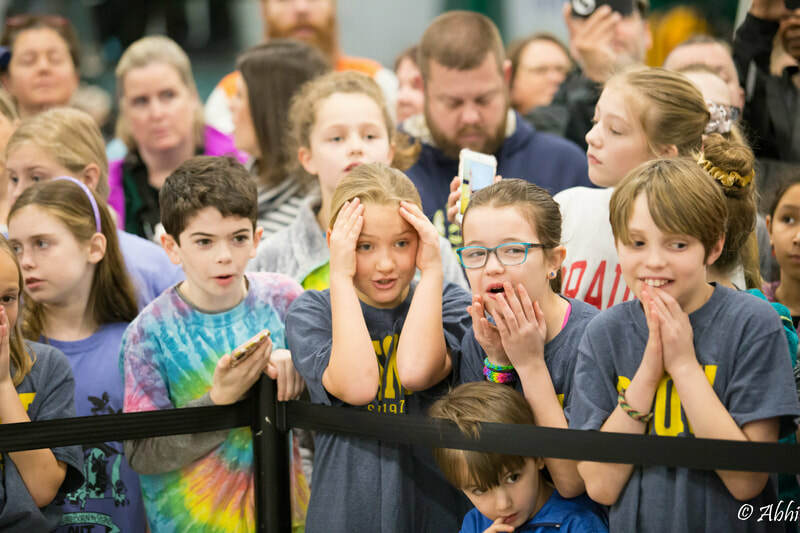 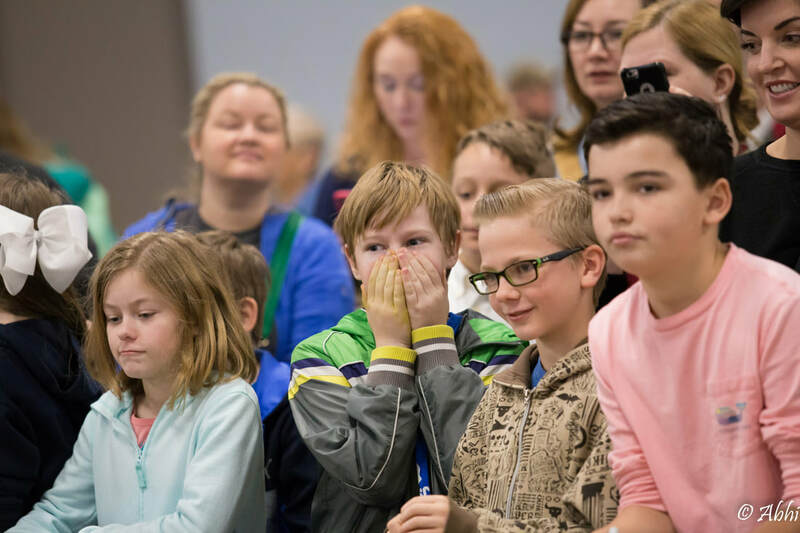 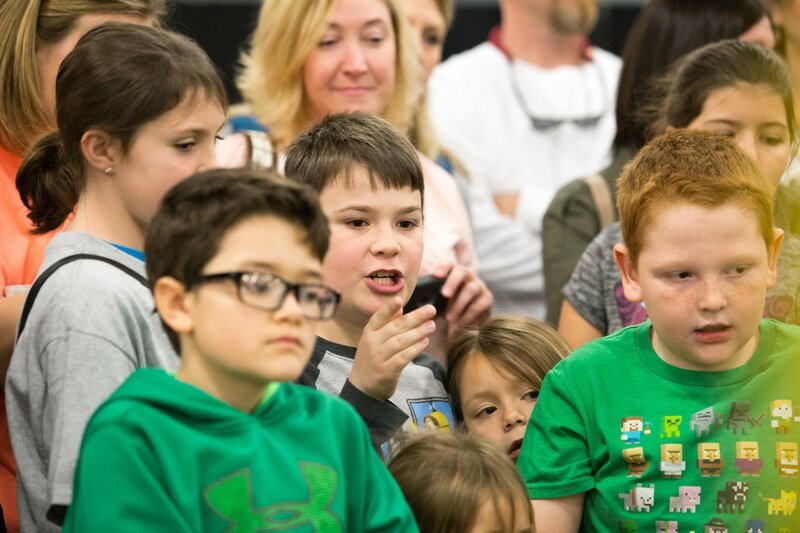 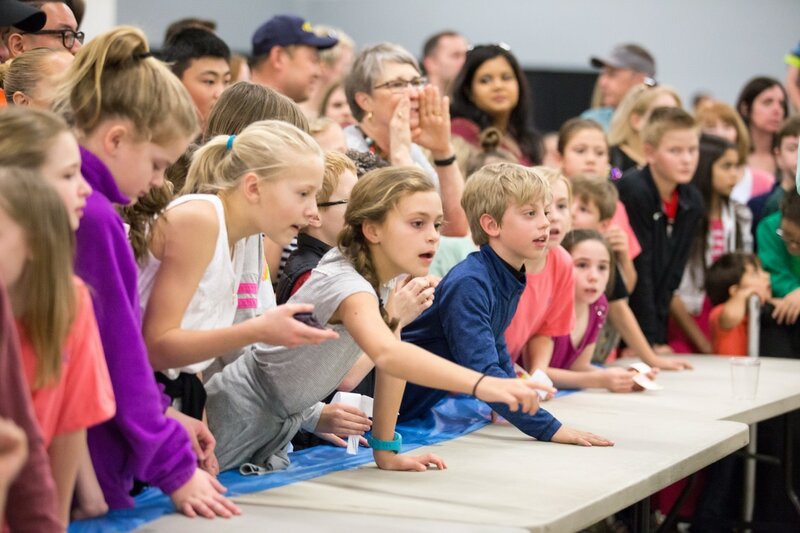 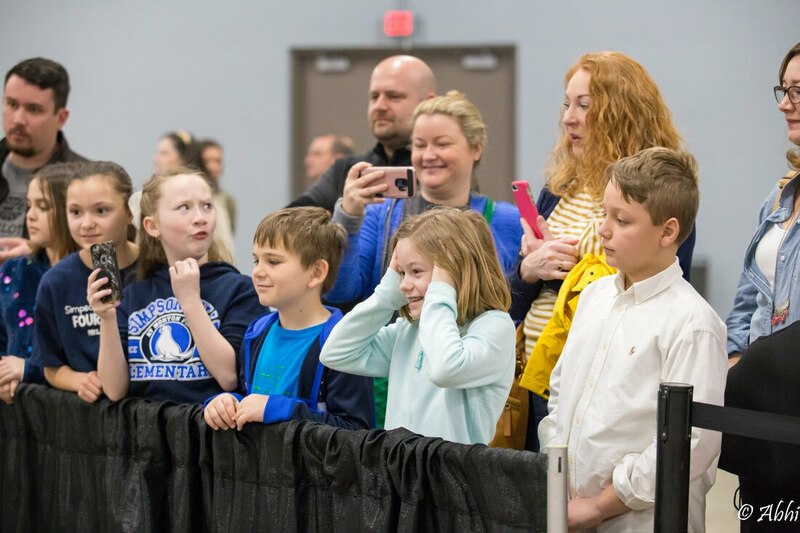 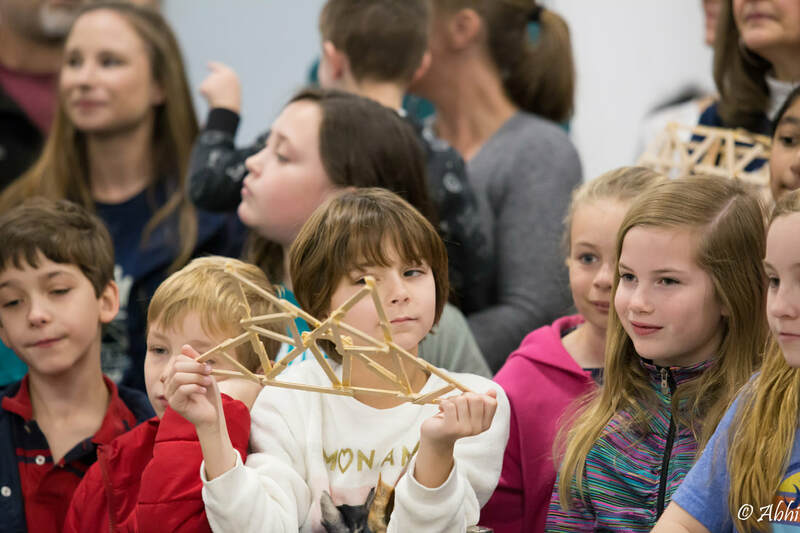 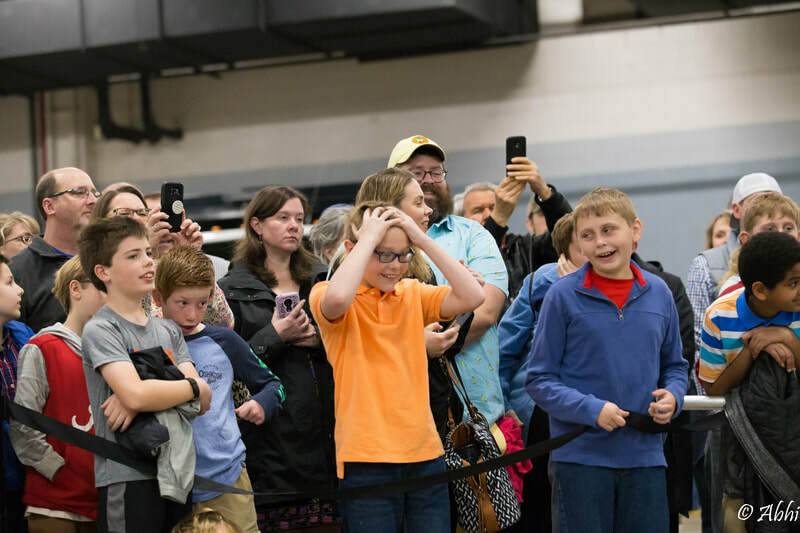 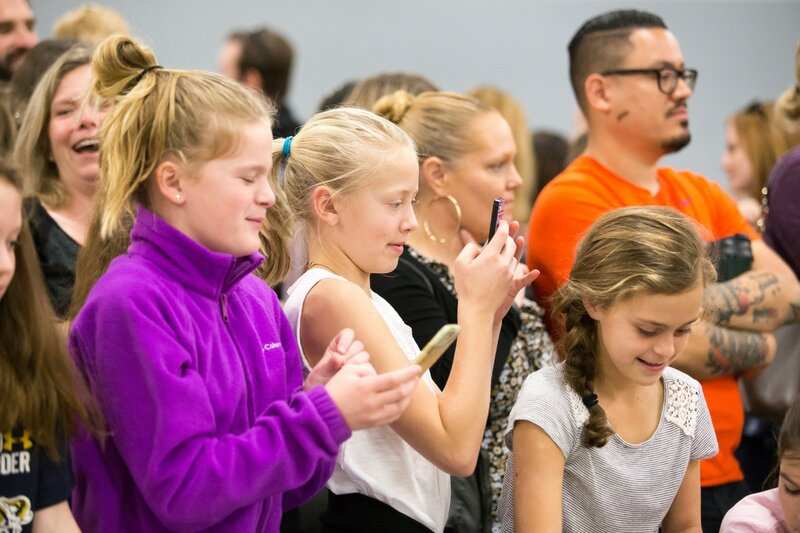 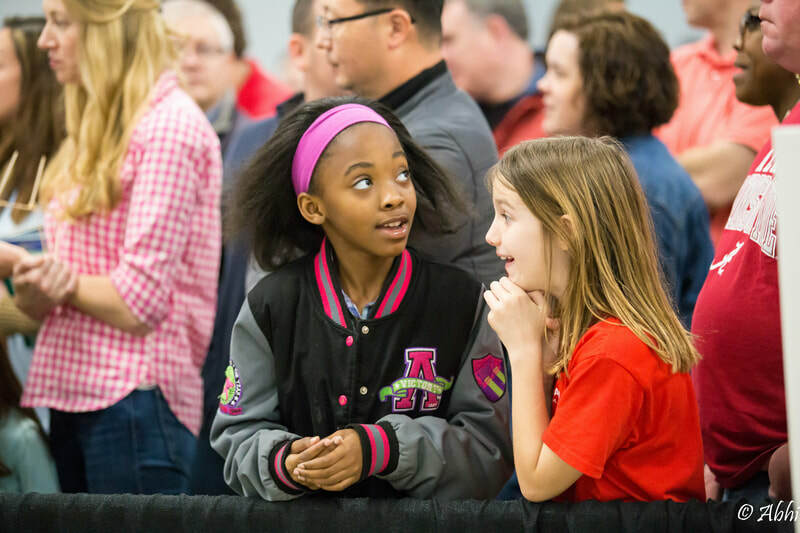 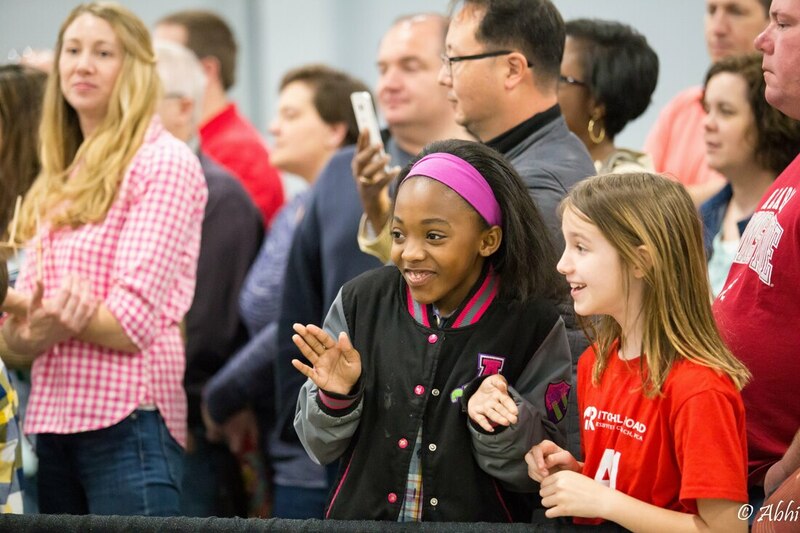 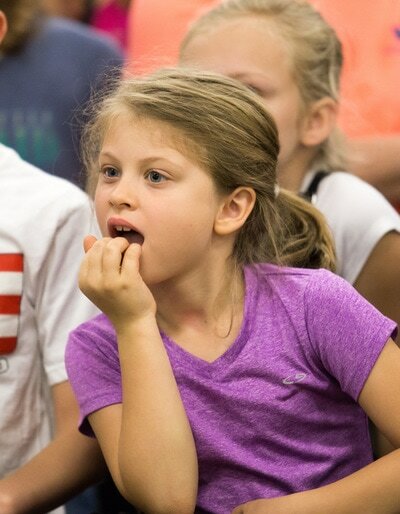 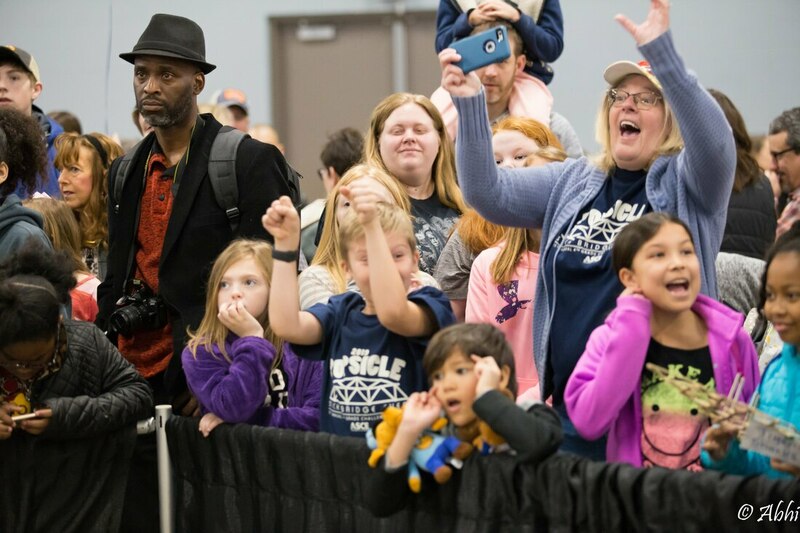 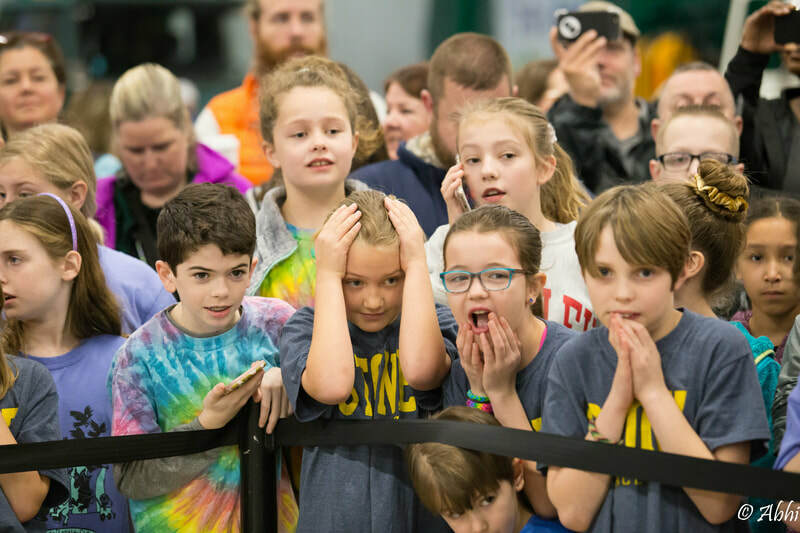 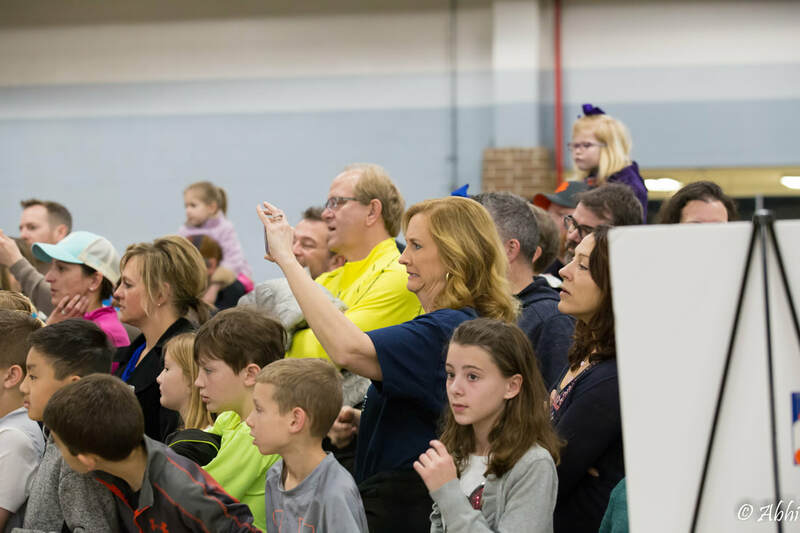 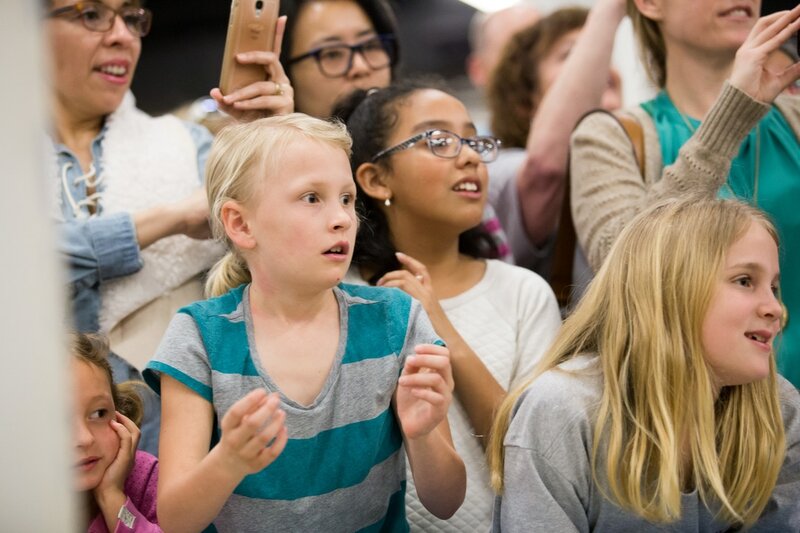 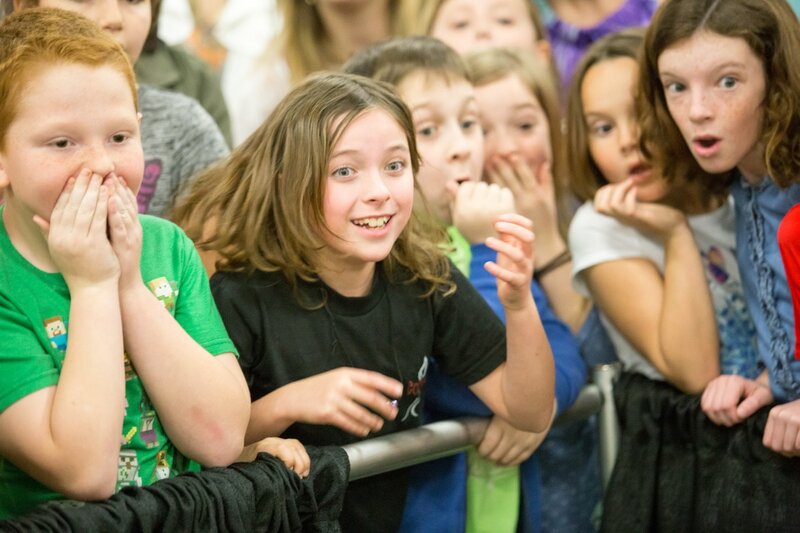 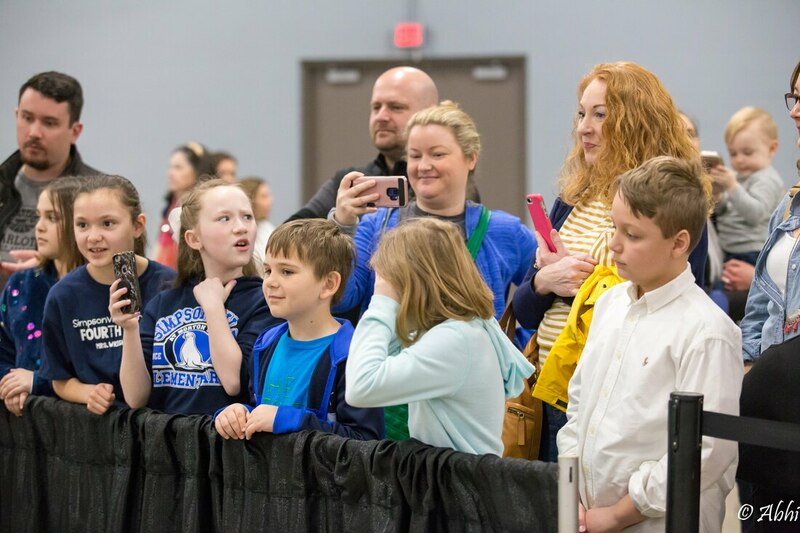 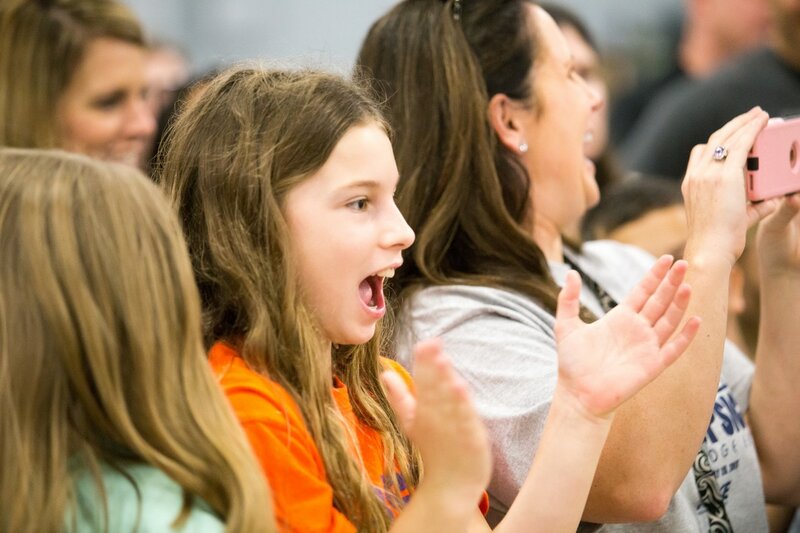 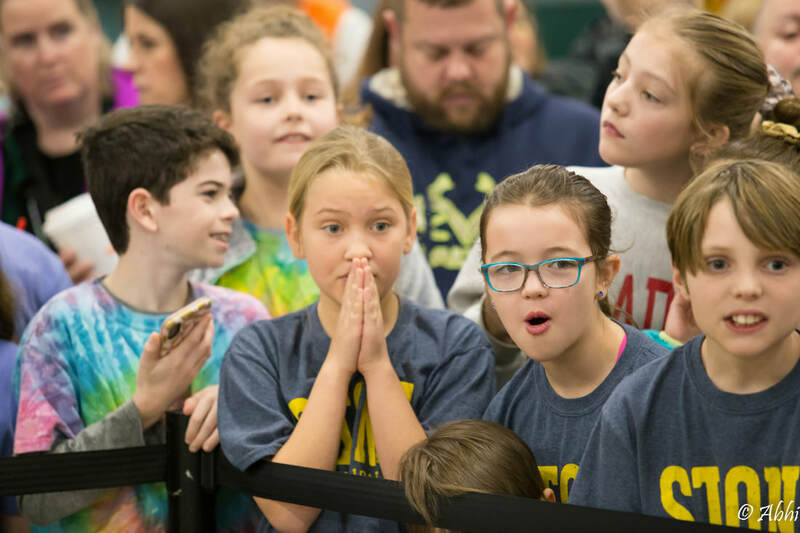 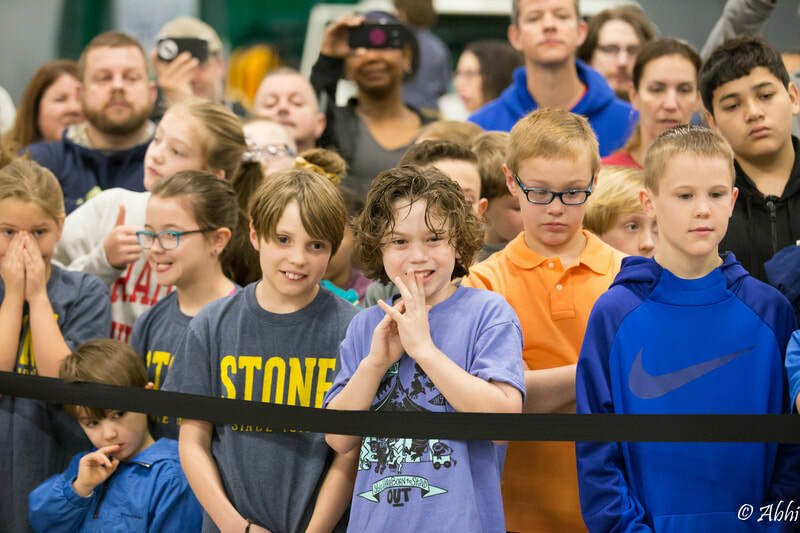 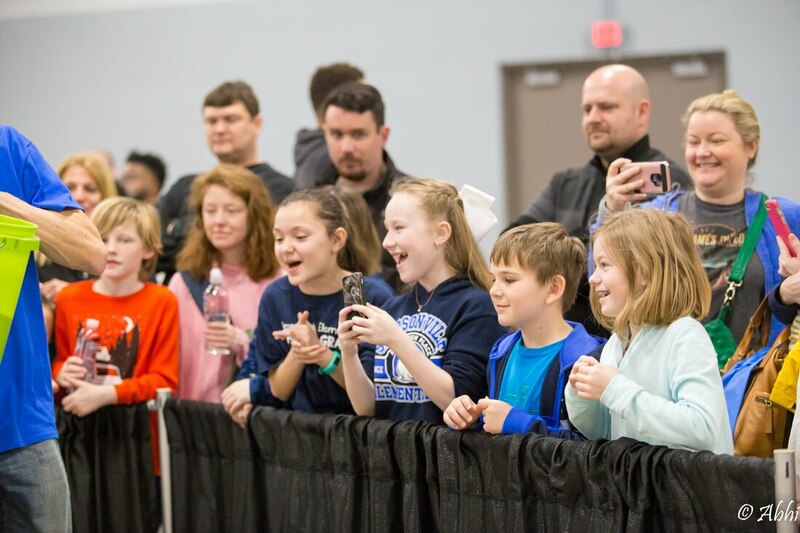 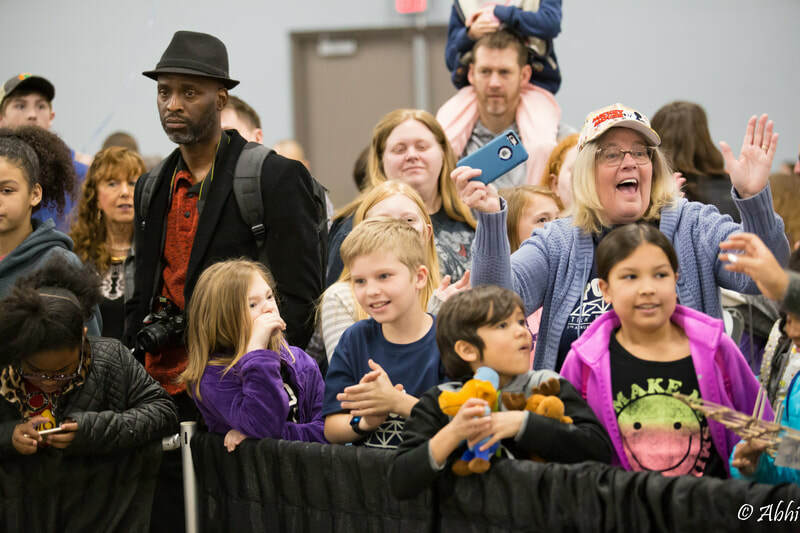 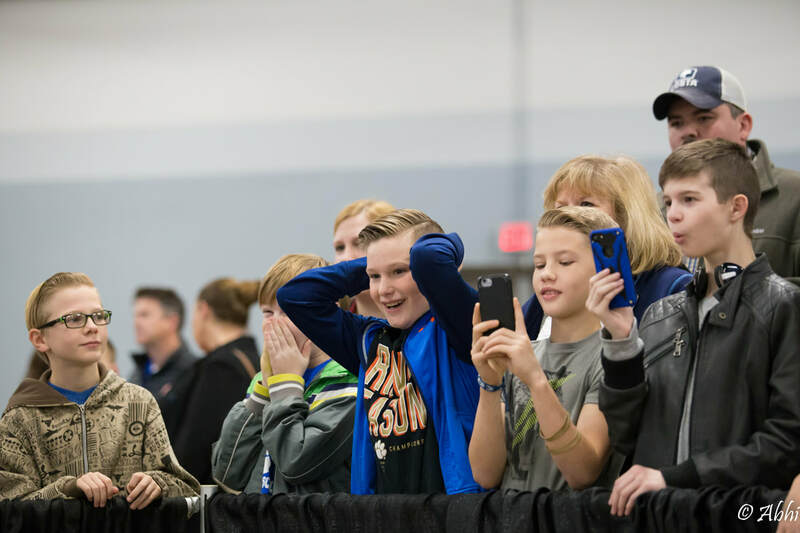 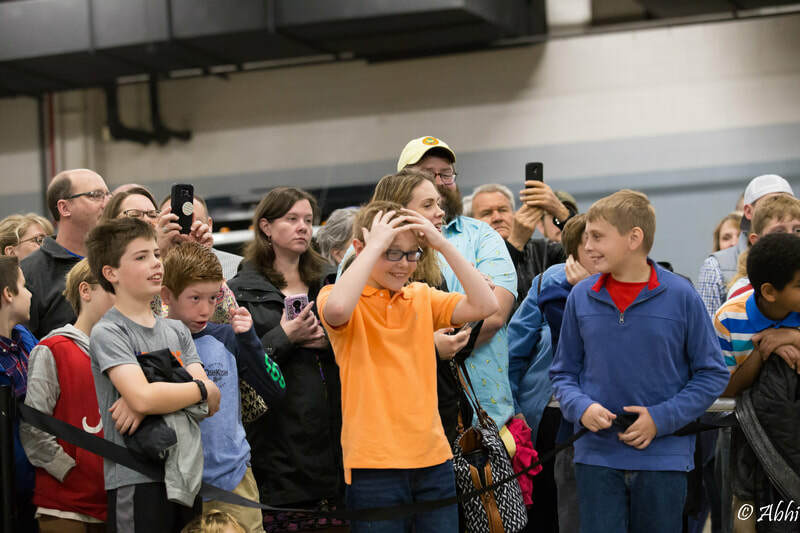 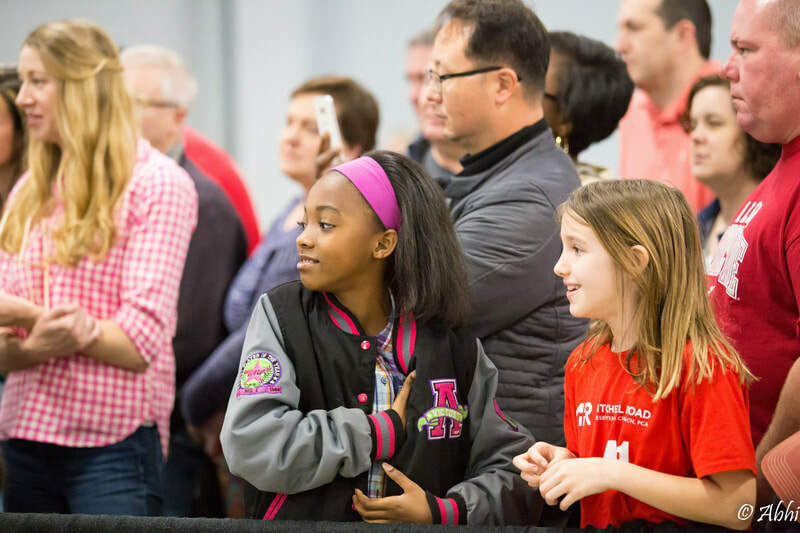 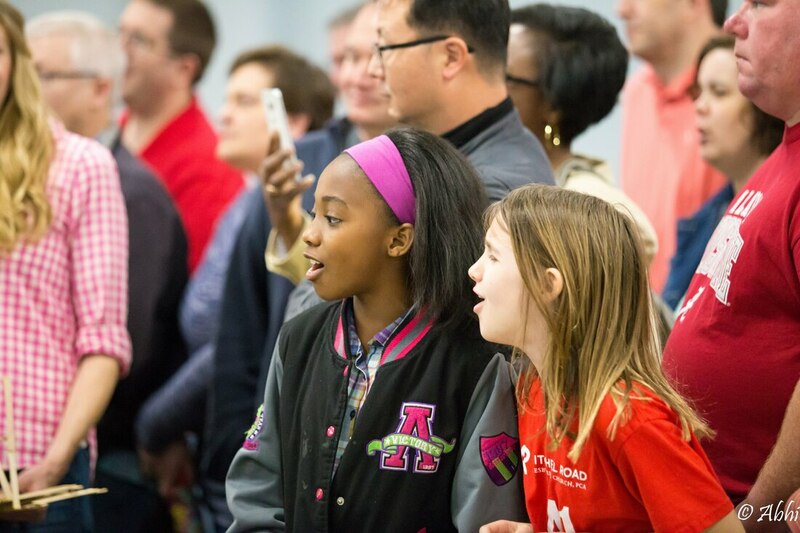 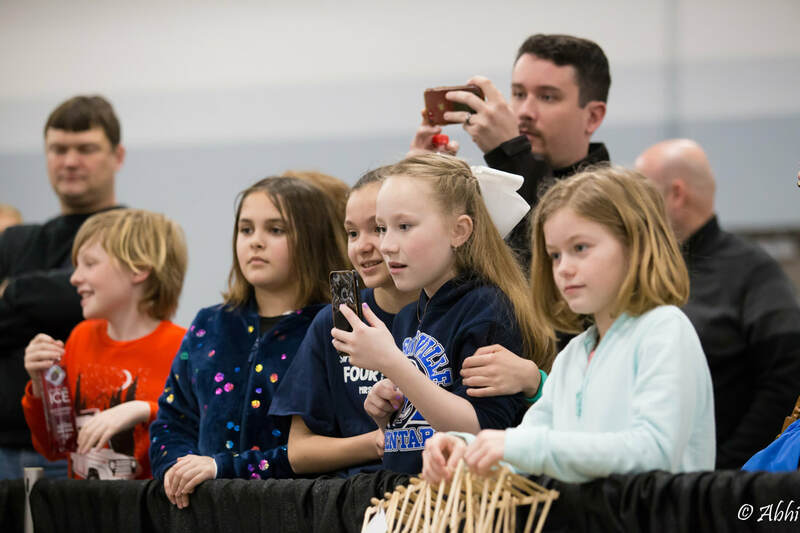 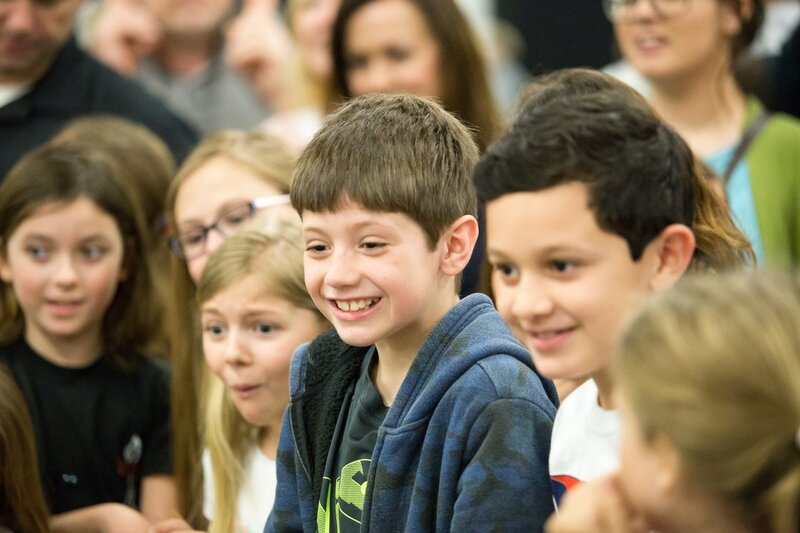 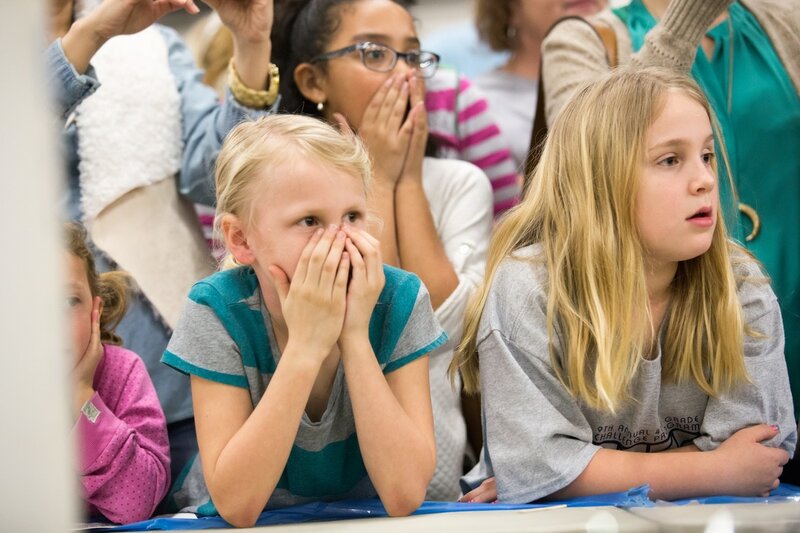 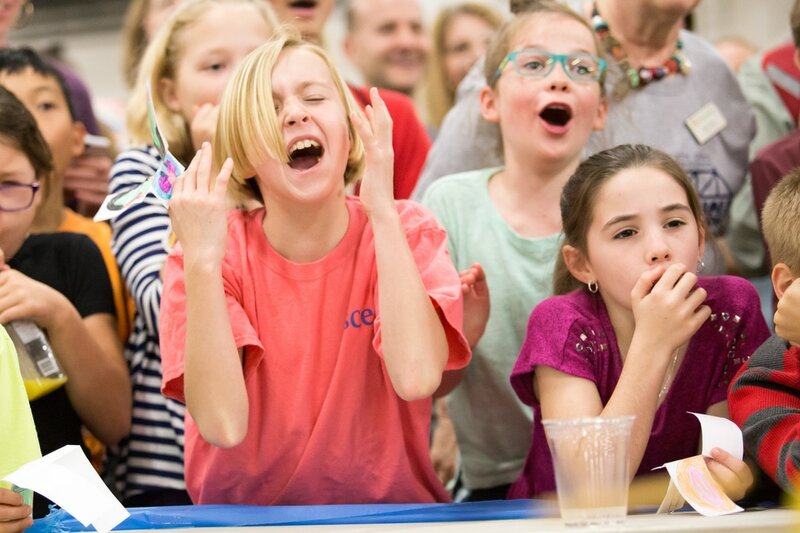 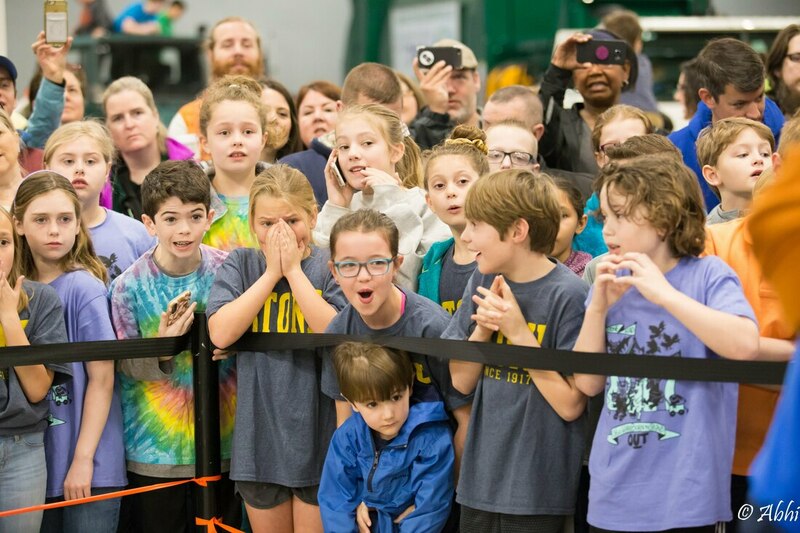 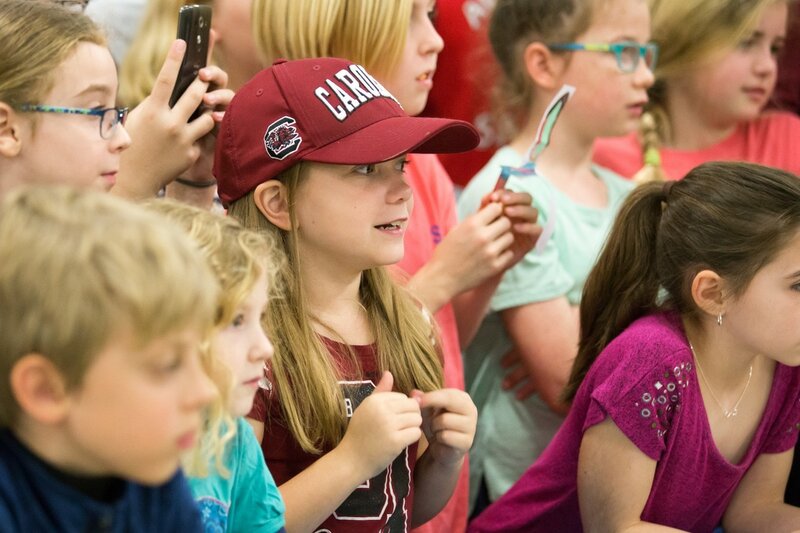 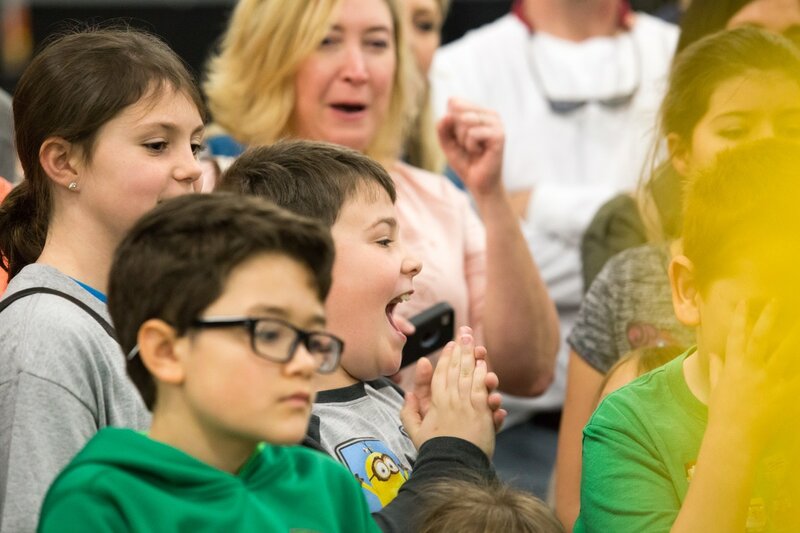 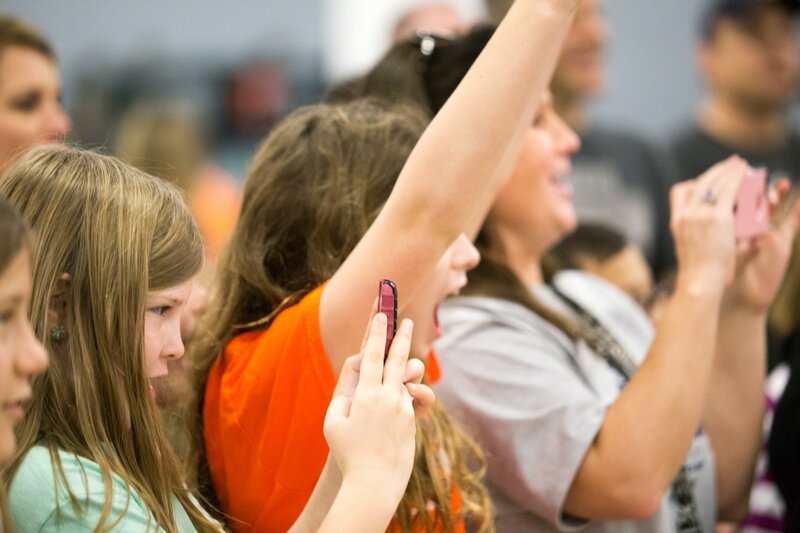 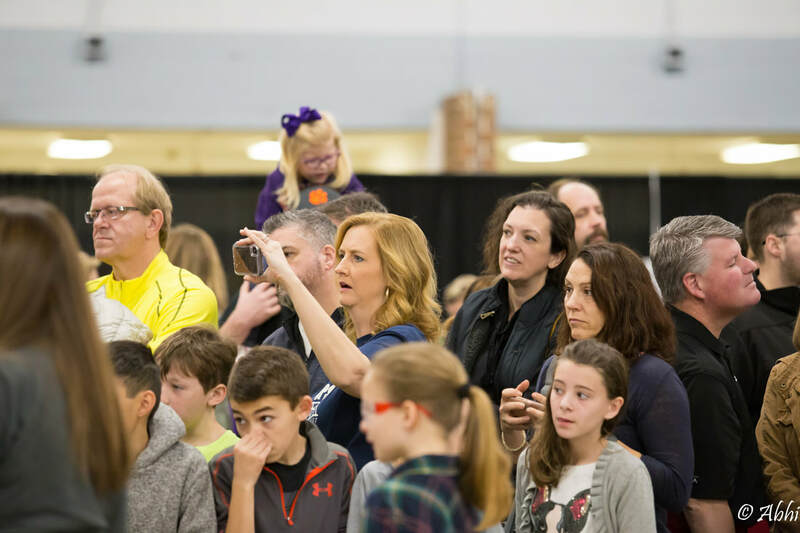 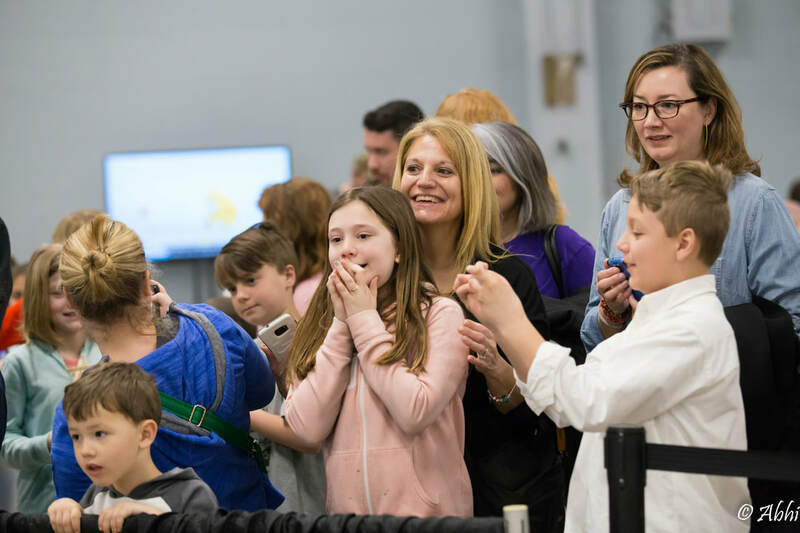 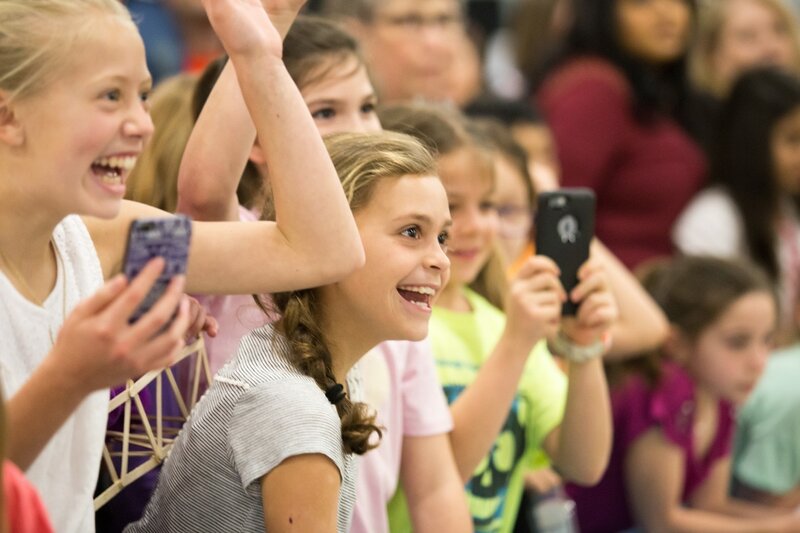 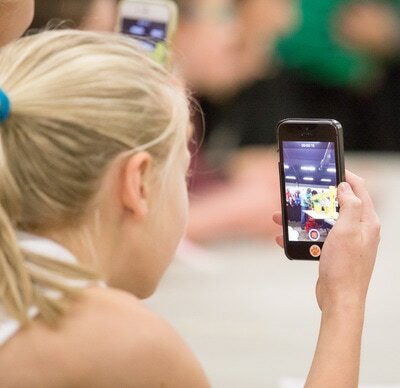 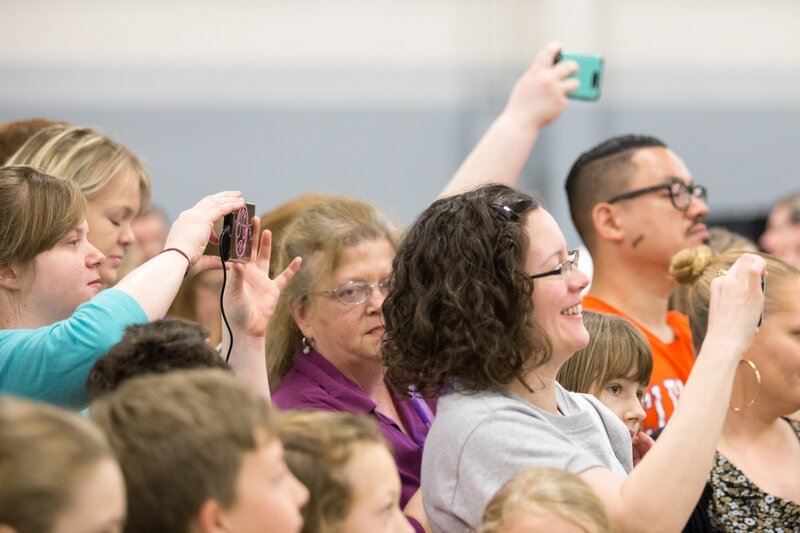 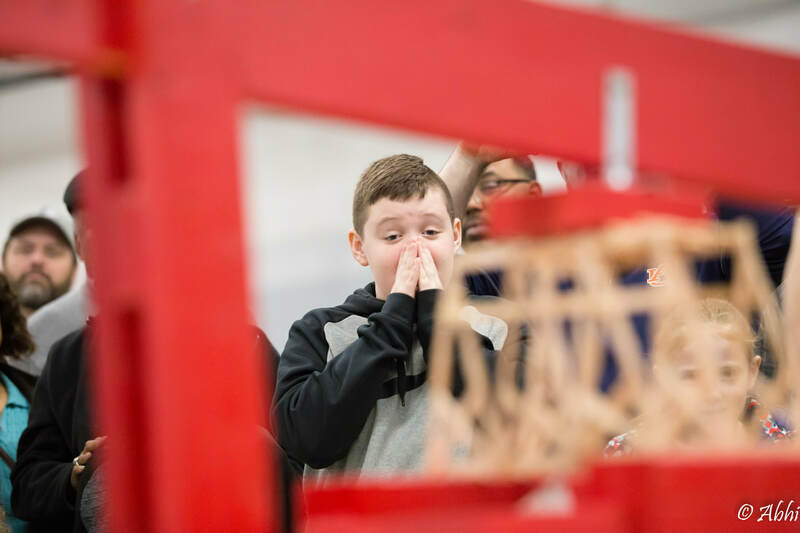 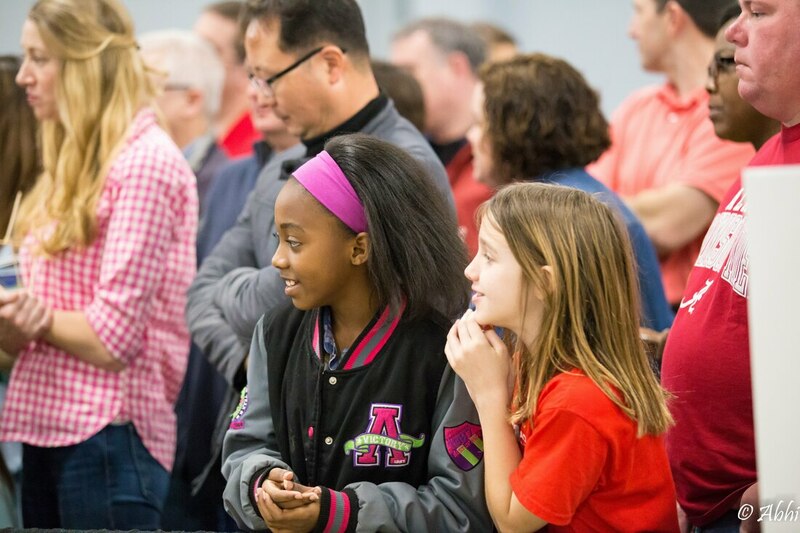 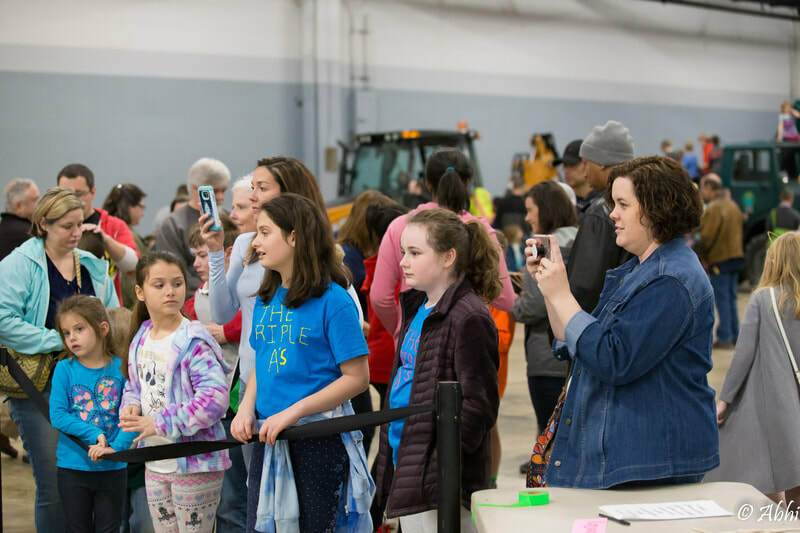 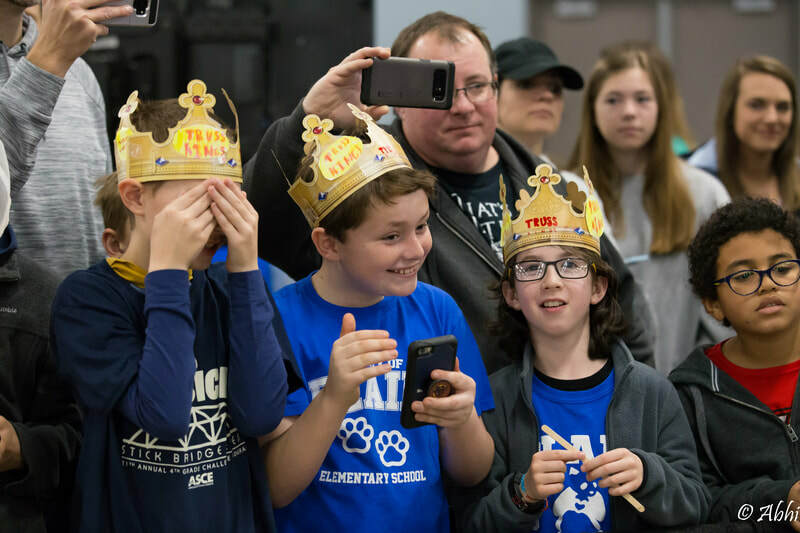 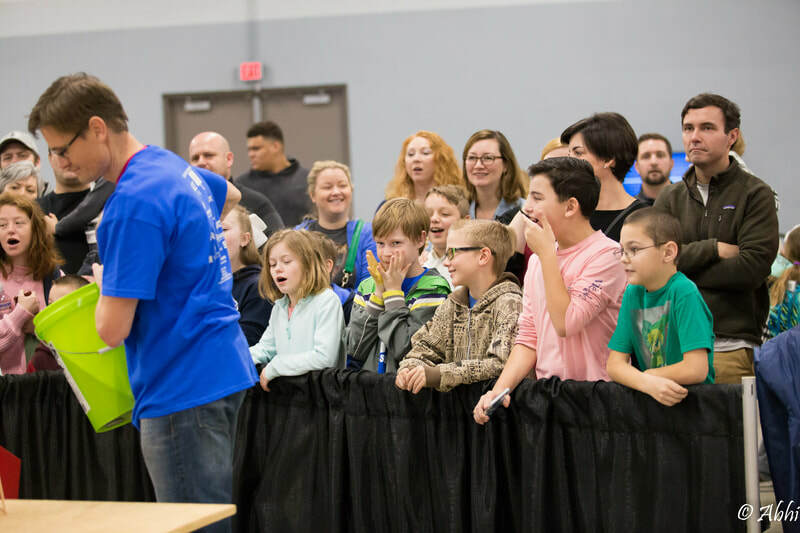 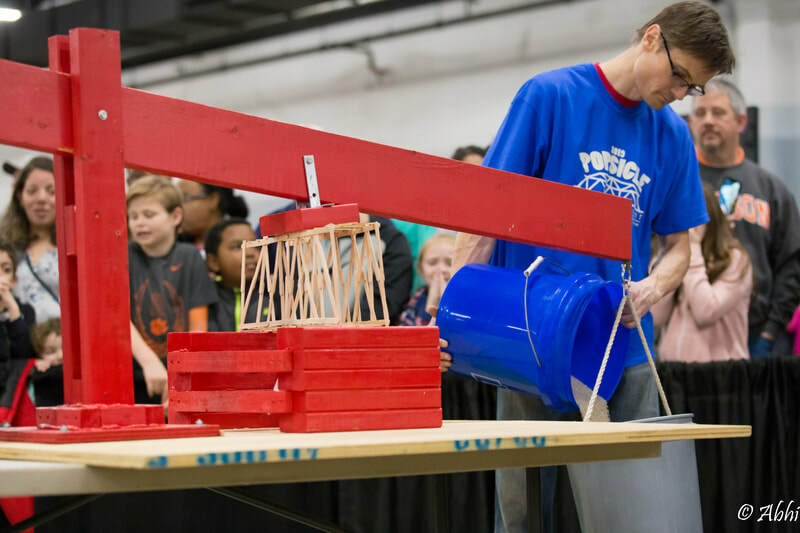 The Challenge program includes students that achieve high scores on academic testing, and this competition was created to help them learn more about math, science, and engineering in a fun and practical way. 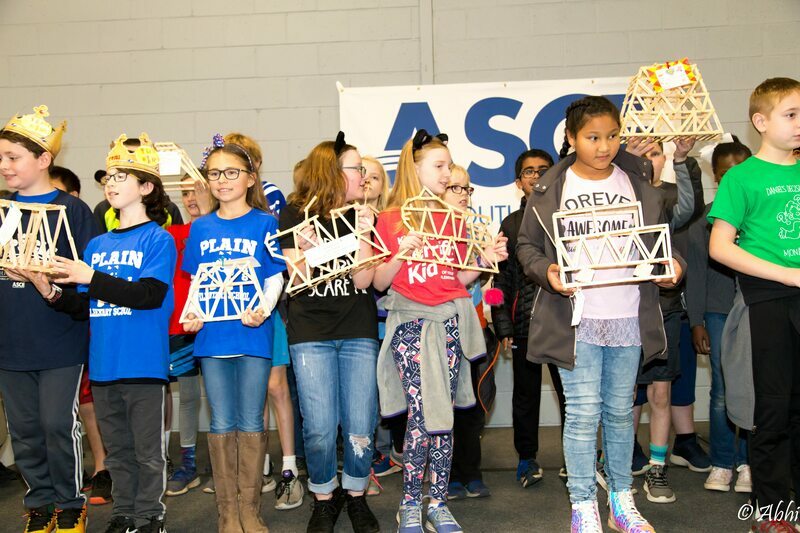 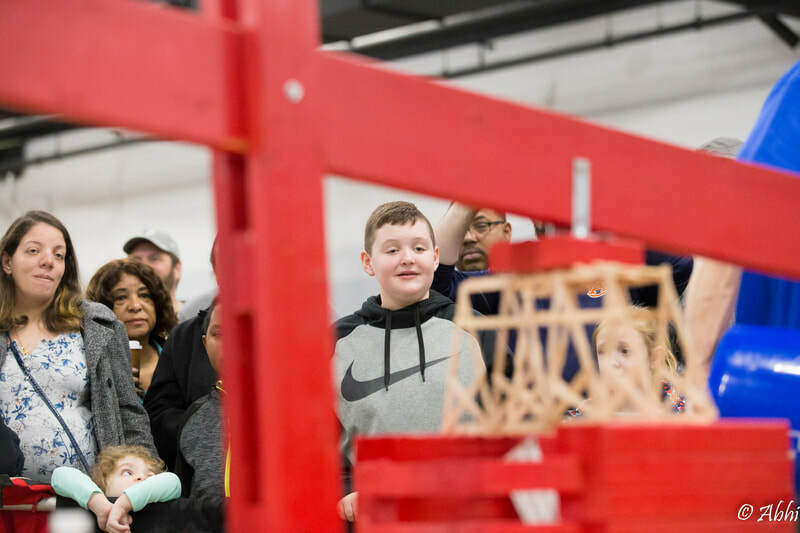 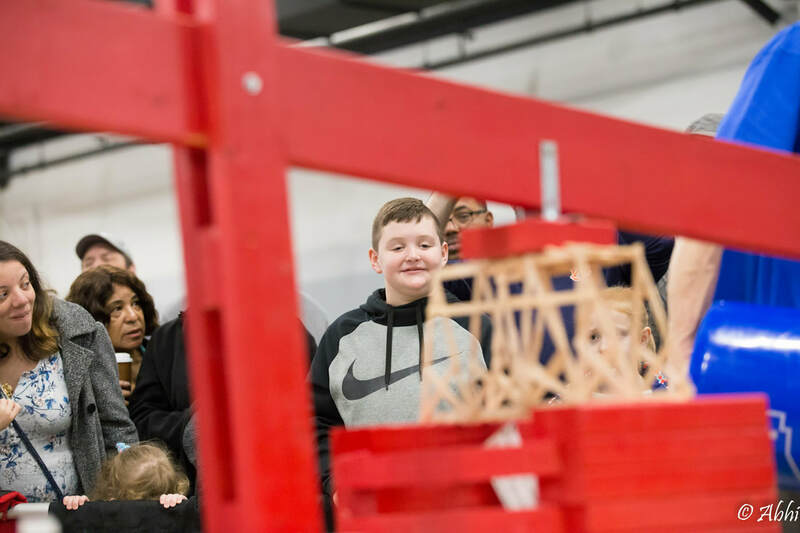 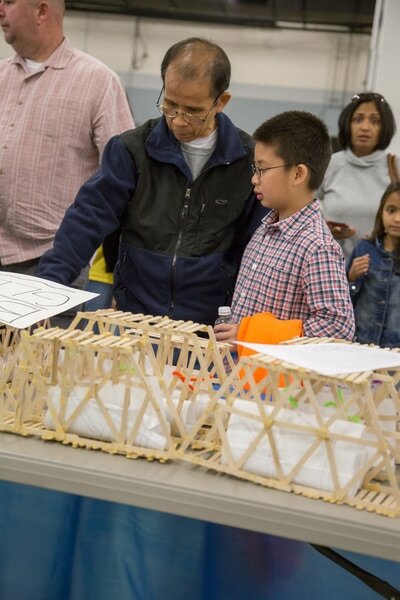 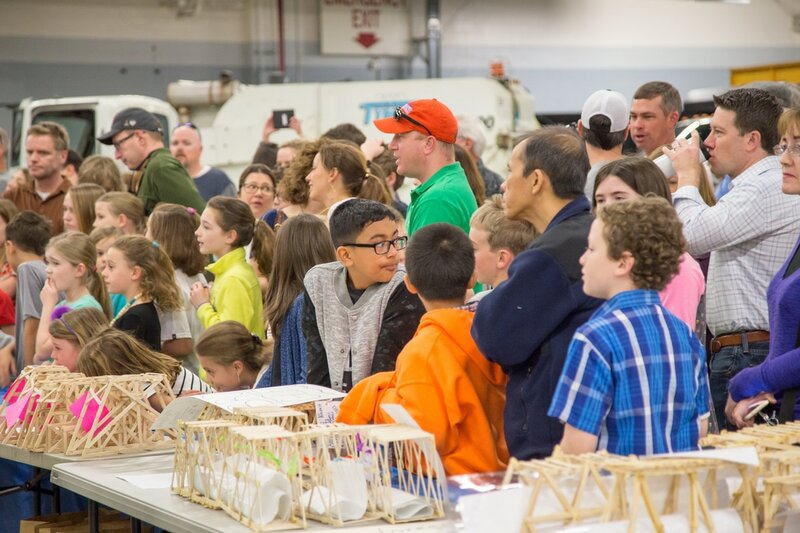 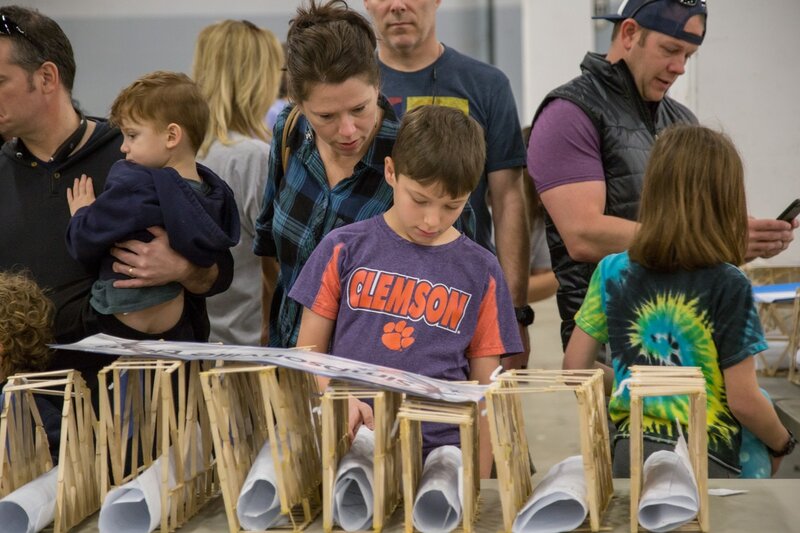 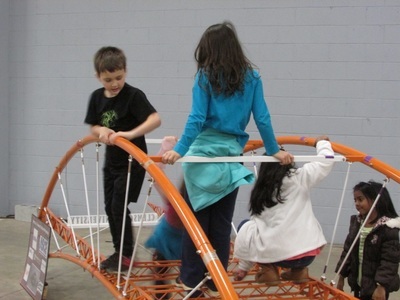 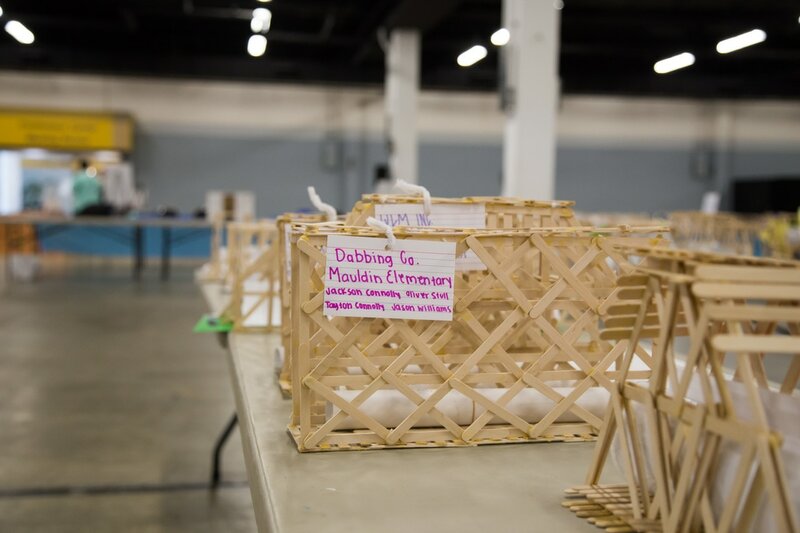 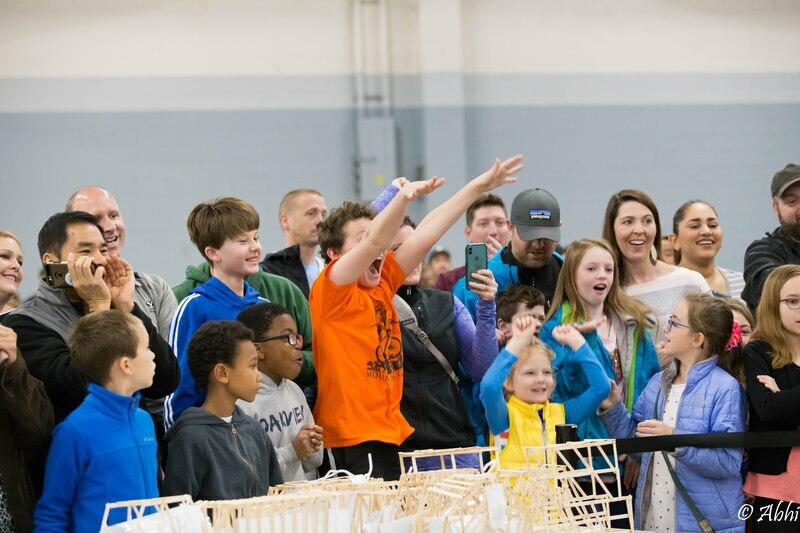 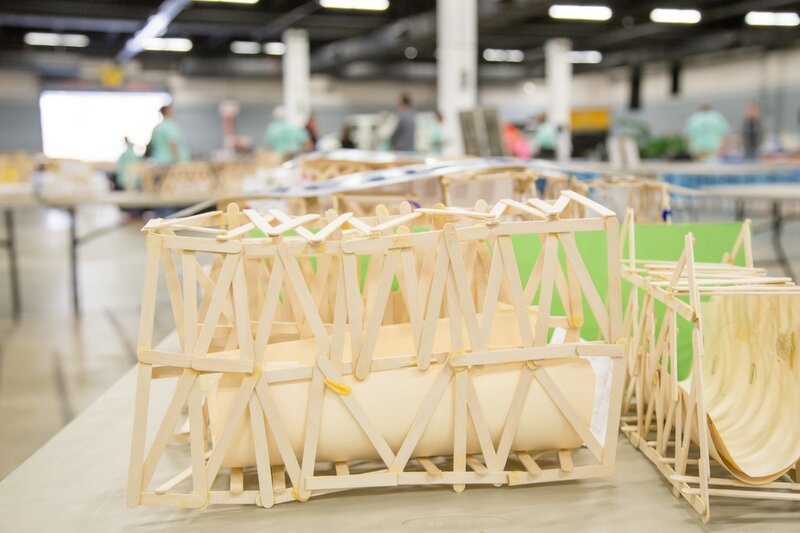 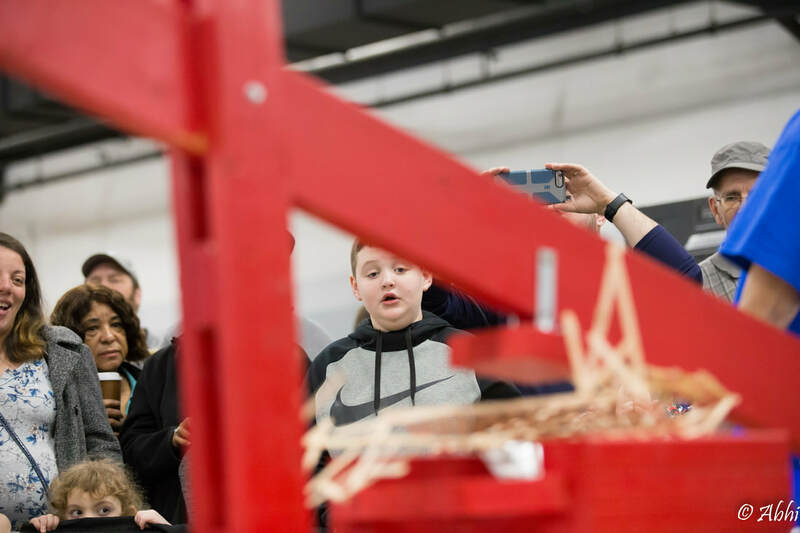 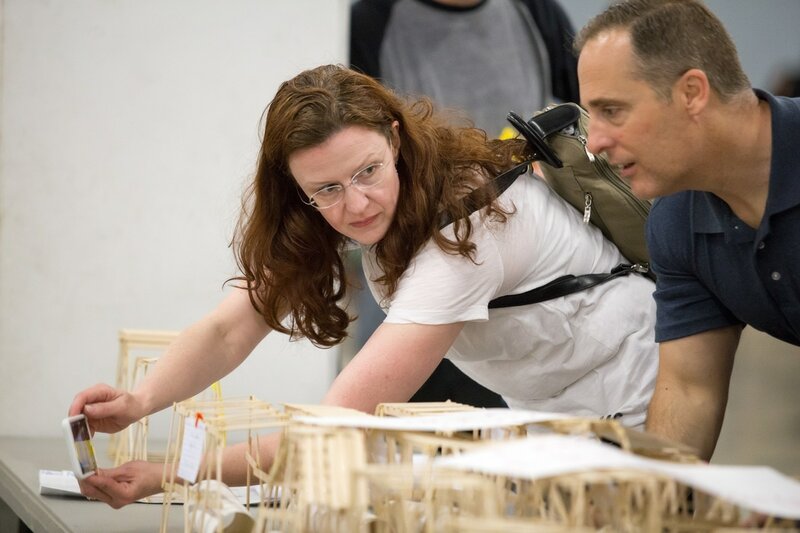 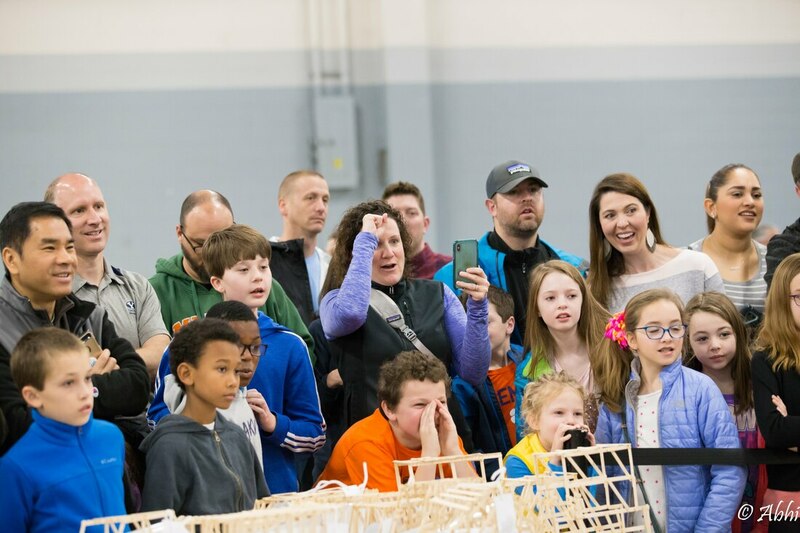 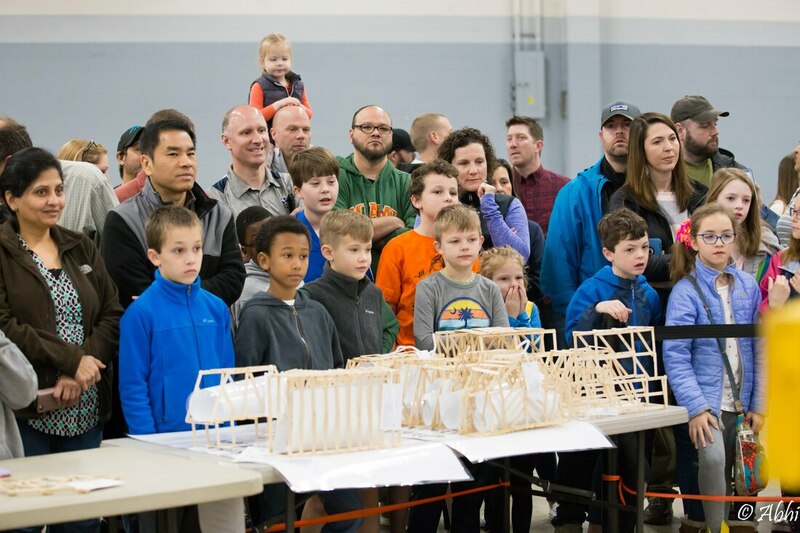 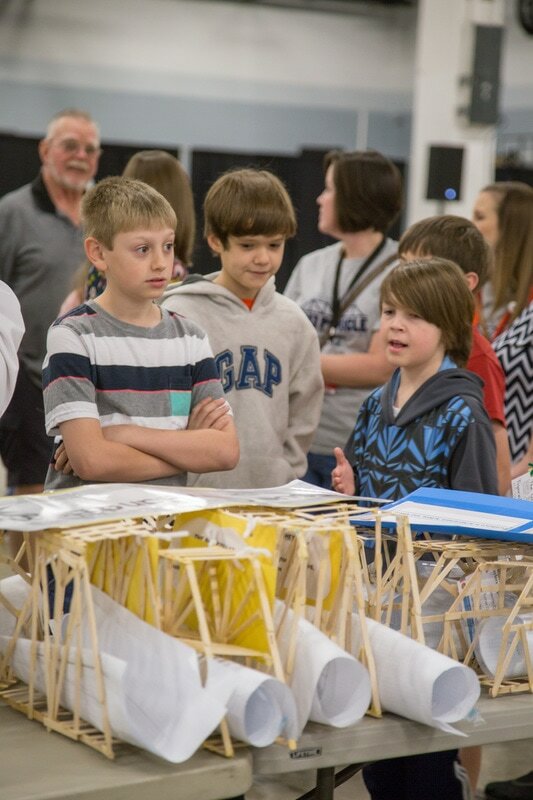 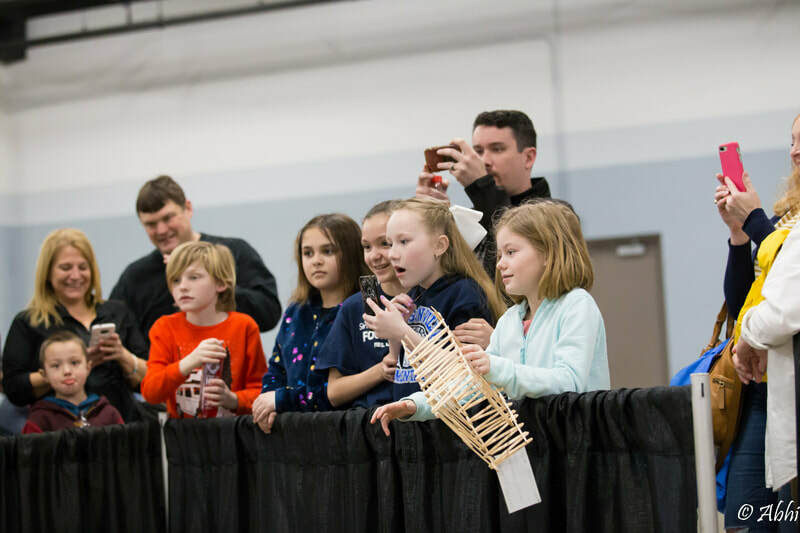 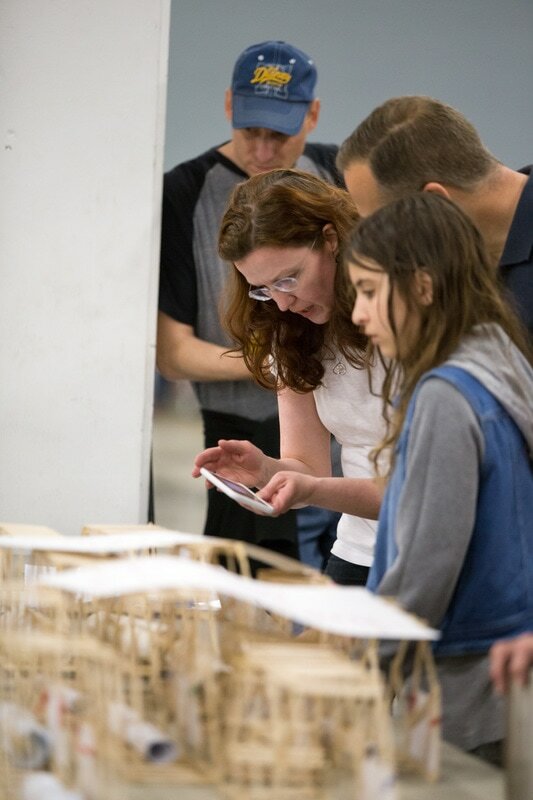 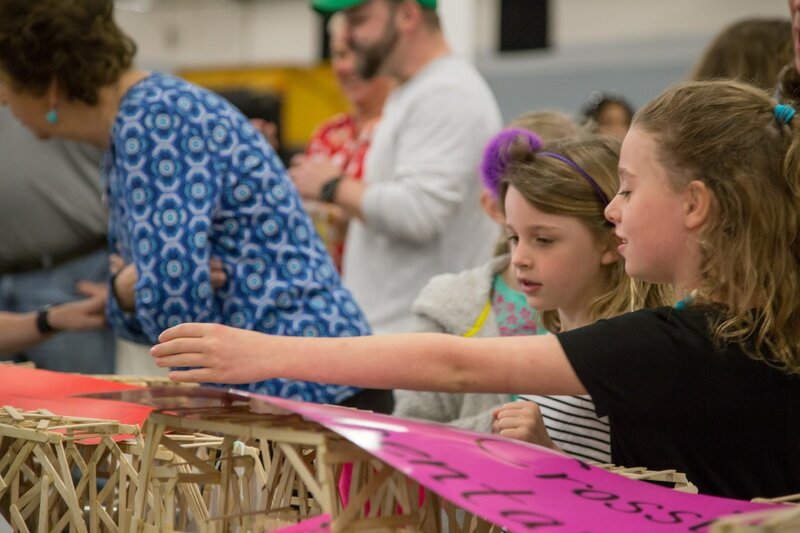 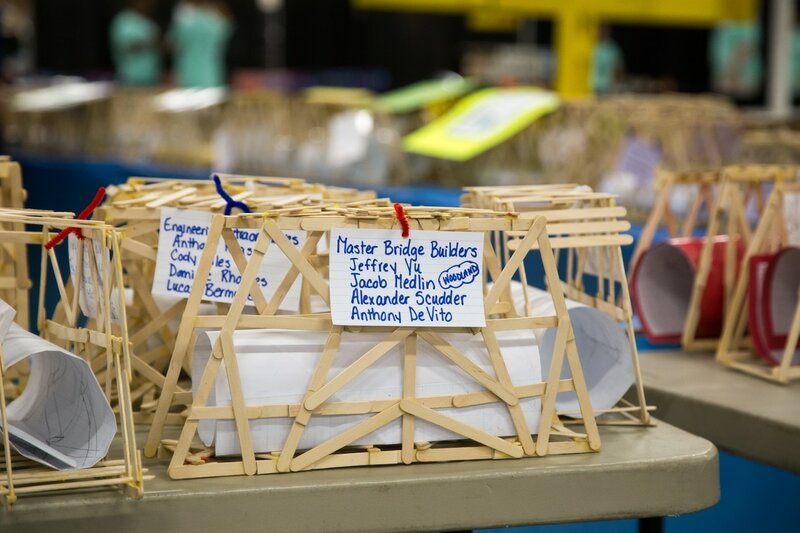 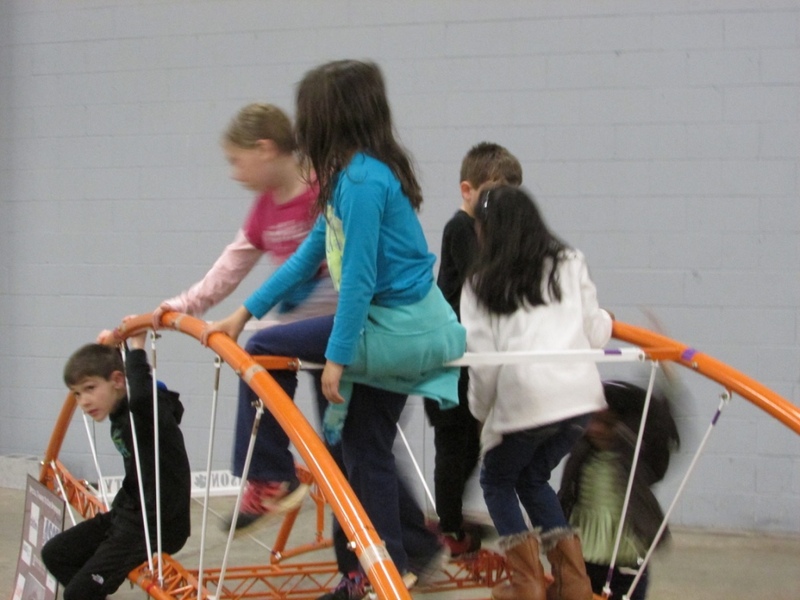 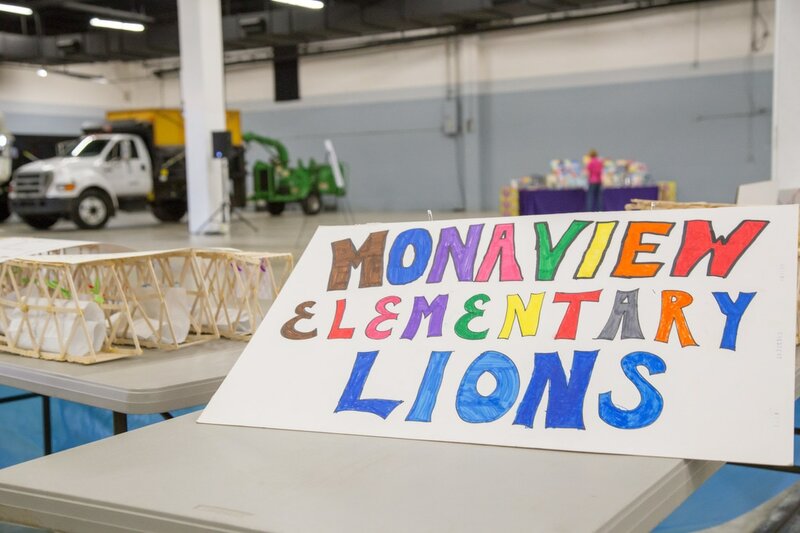 The students spend approximately 3 months in the classroom learning about bridge design and the challenges of creating a strong, yet lightweight bridge which is essential in today’s real world scenarios of cost efficient design. The 4th grade students construct their bridges with Popsicle sticks and white craft glue and must adhere to certain constraints regarding height, length and width. 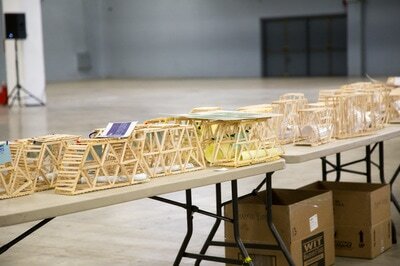 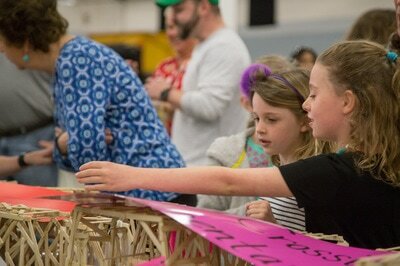 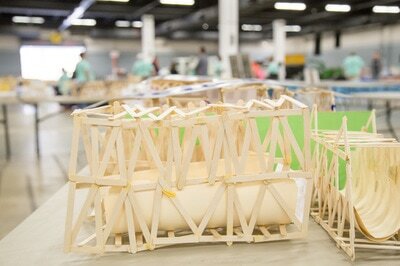 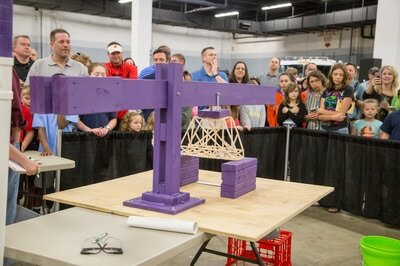 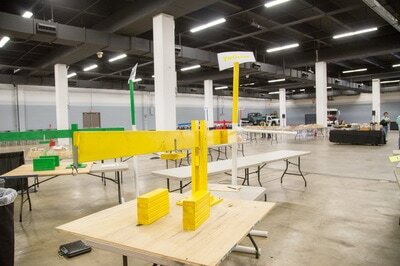 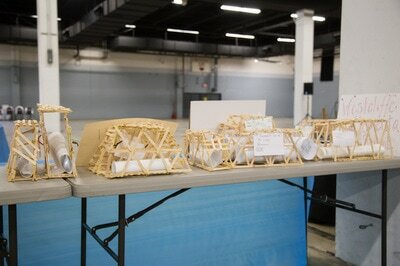 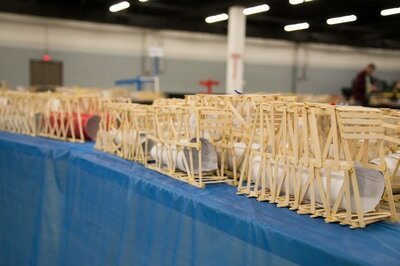 The bridges are then brought to the competition for final weigh-in and testing as part of the competition. The “Best Structural” category is based on load testing the bridges to failure while taking into consideration the weight of the bridge. 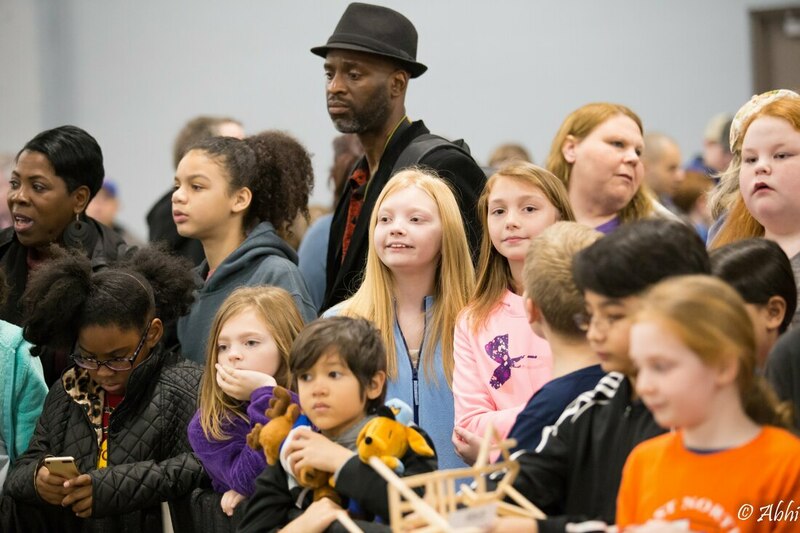 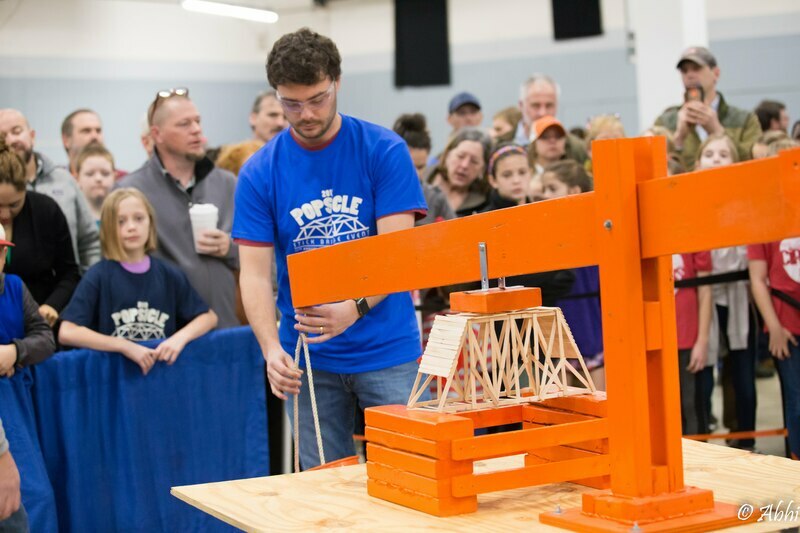 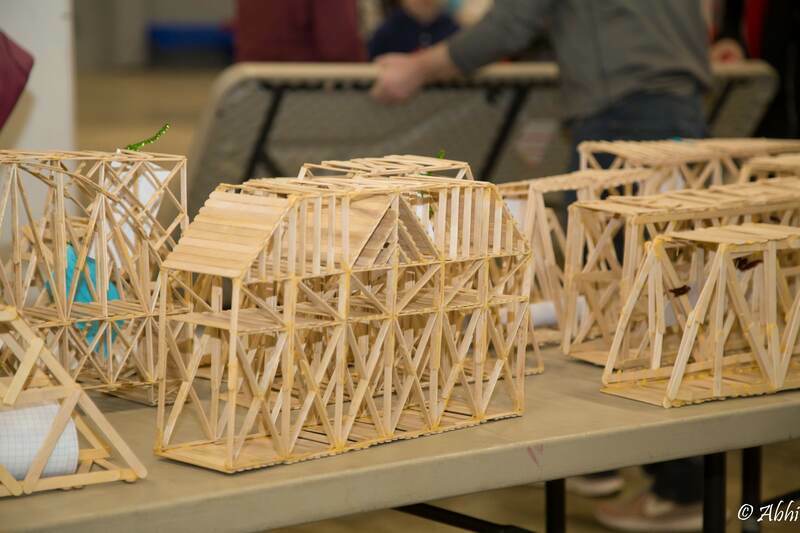 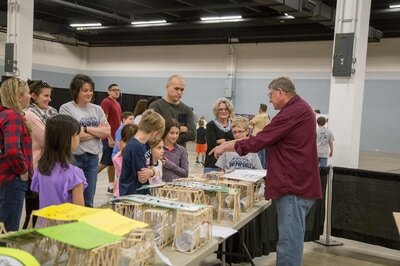 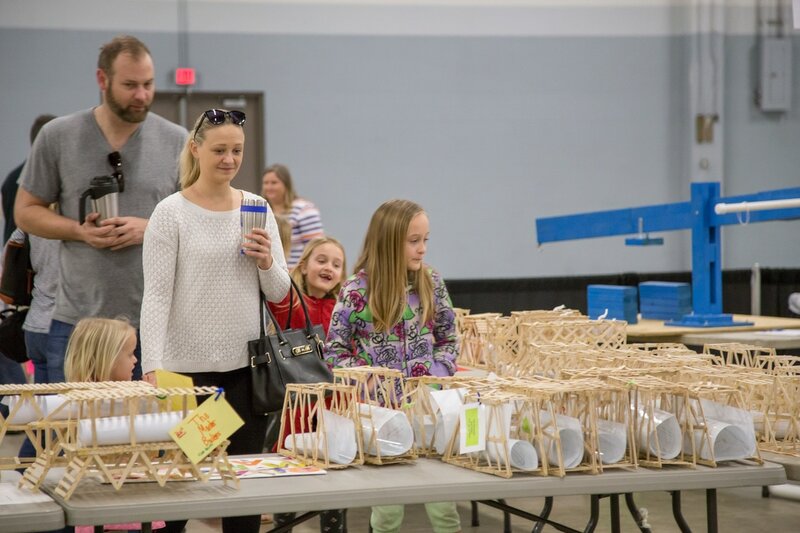 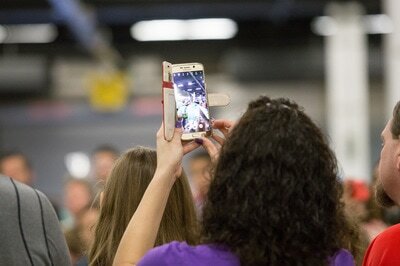 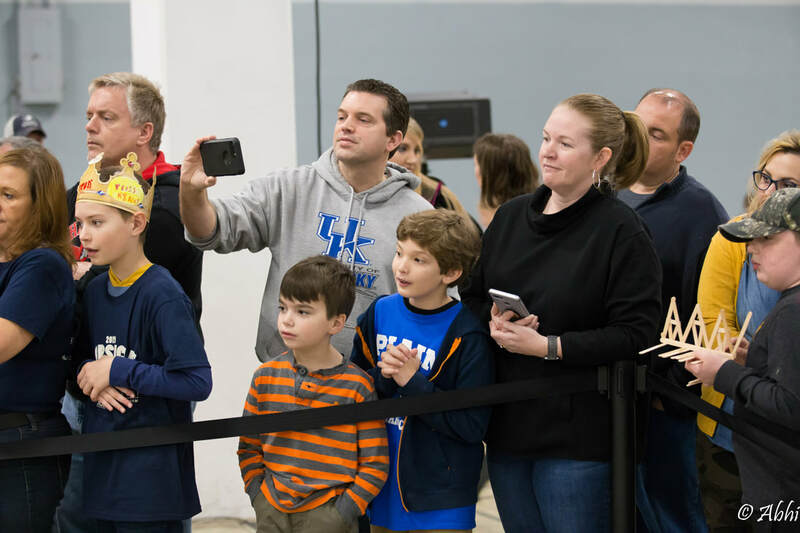 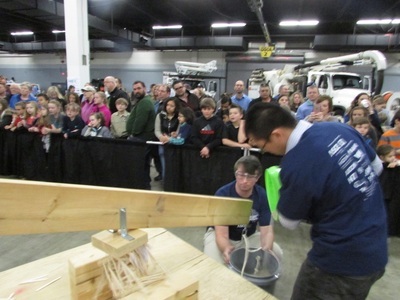 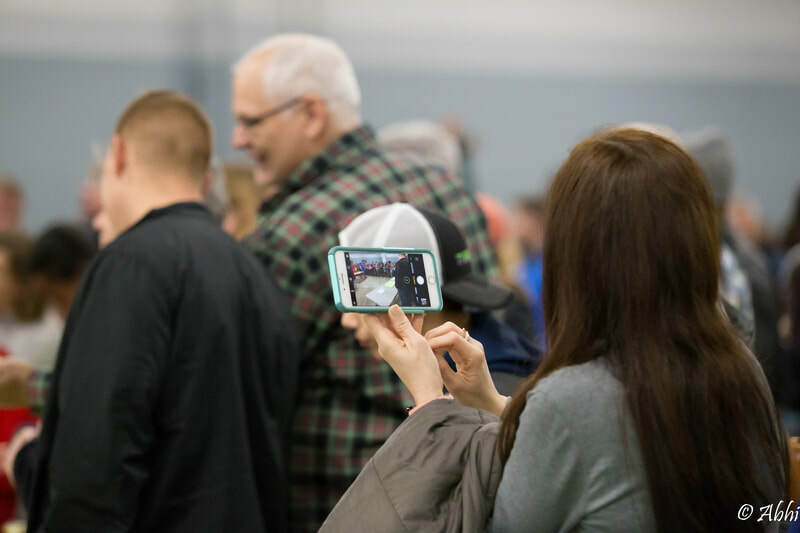 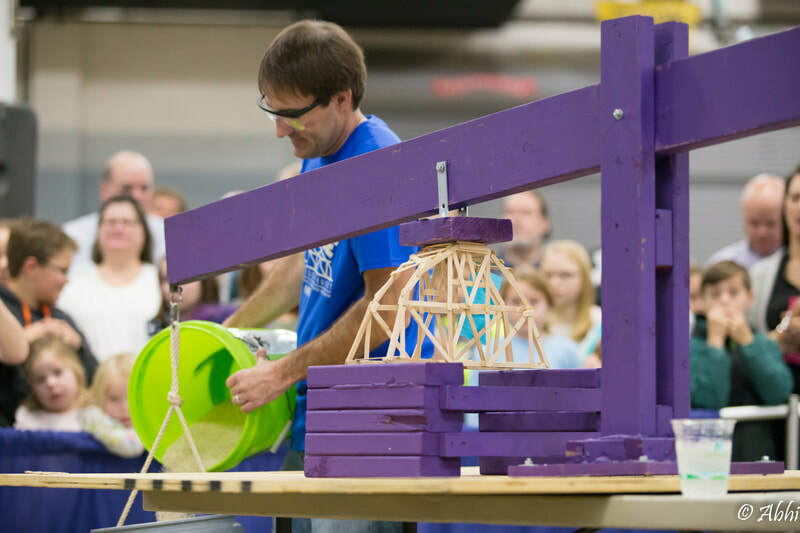 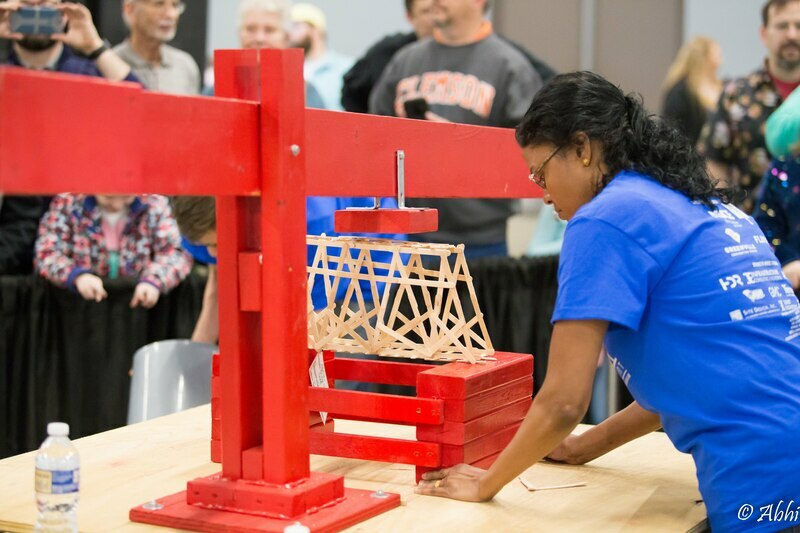 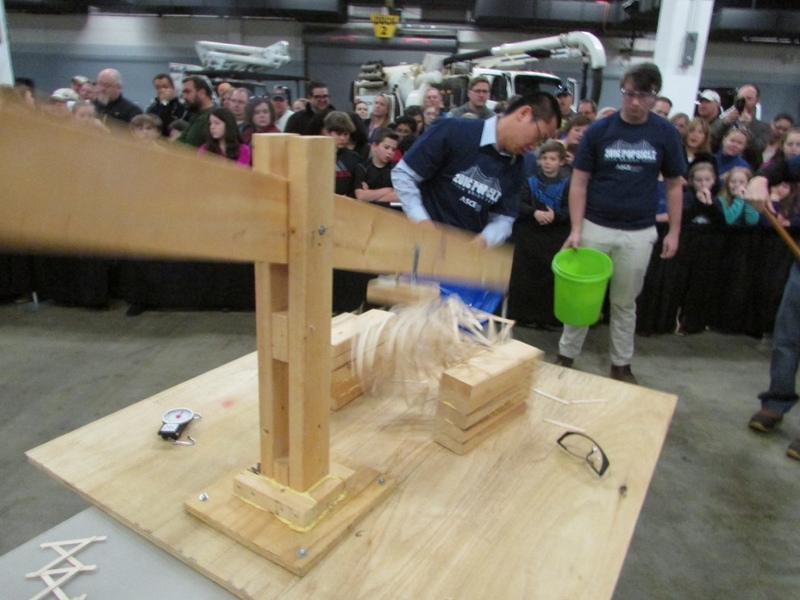 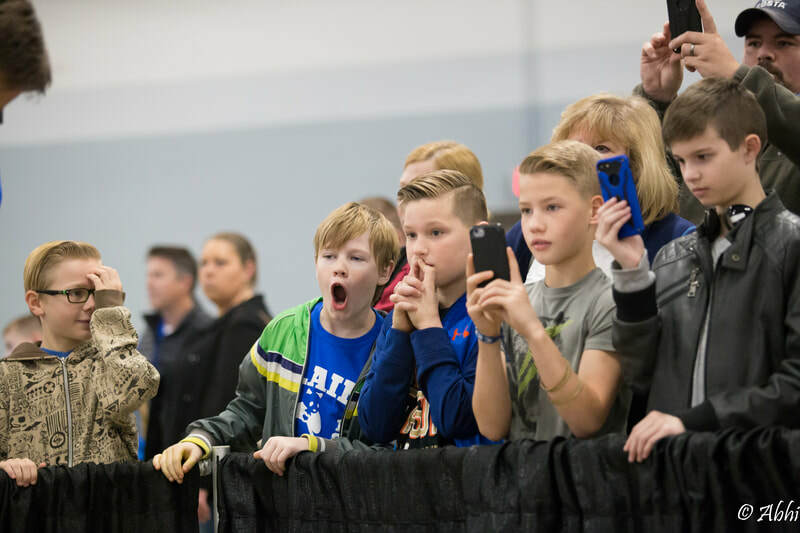 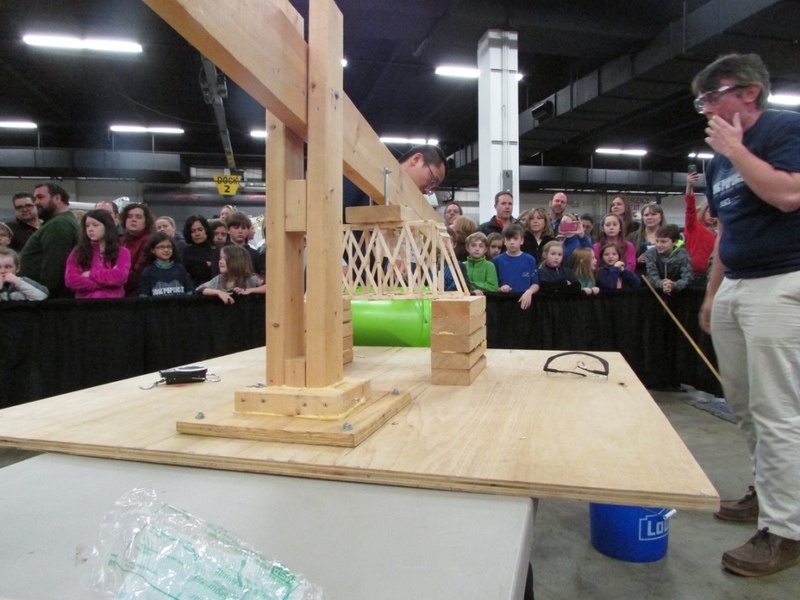 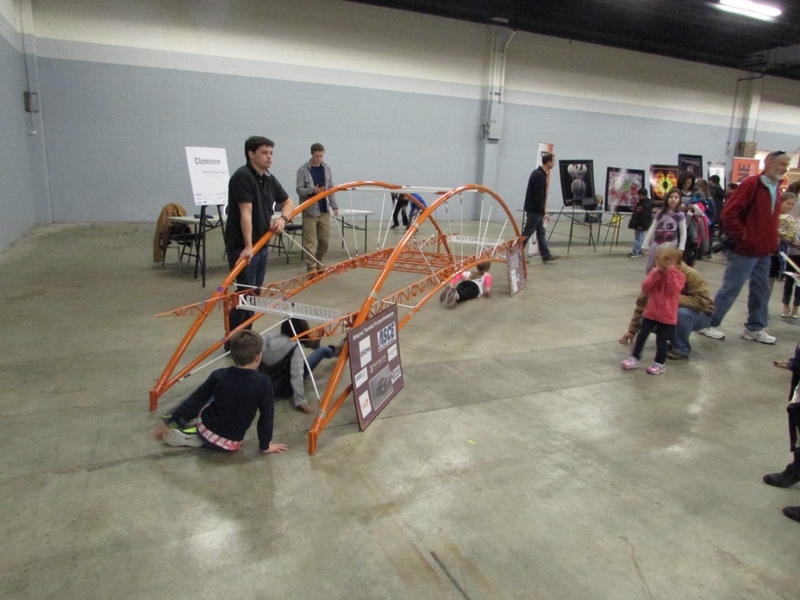 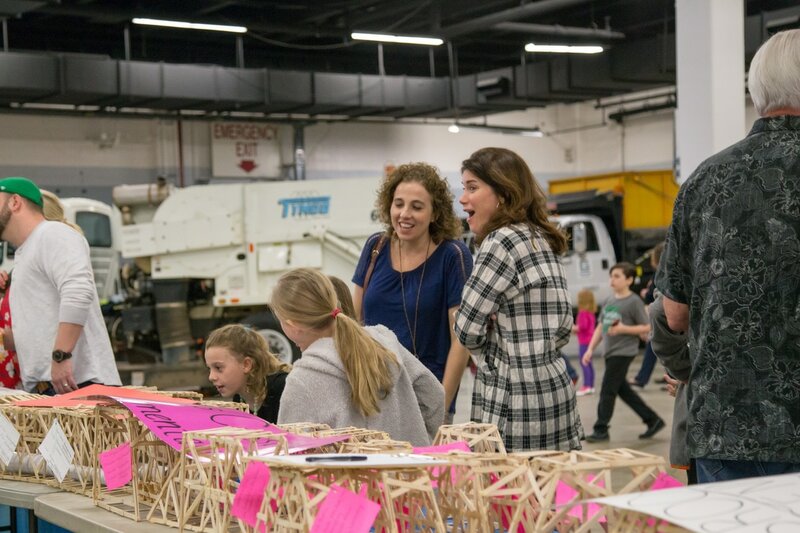 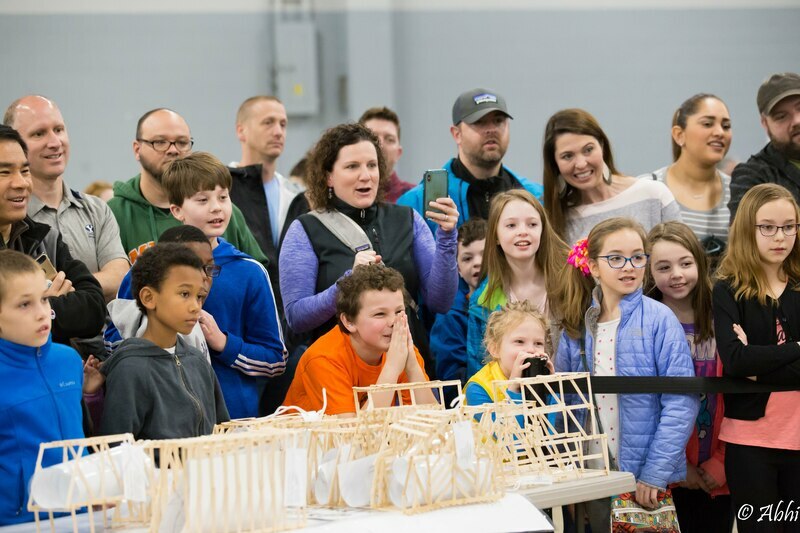 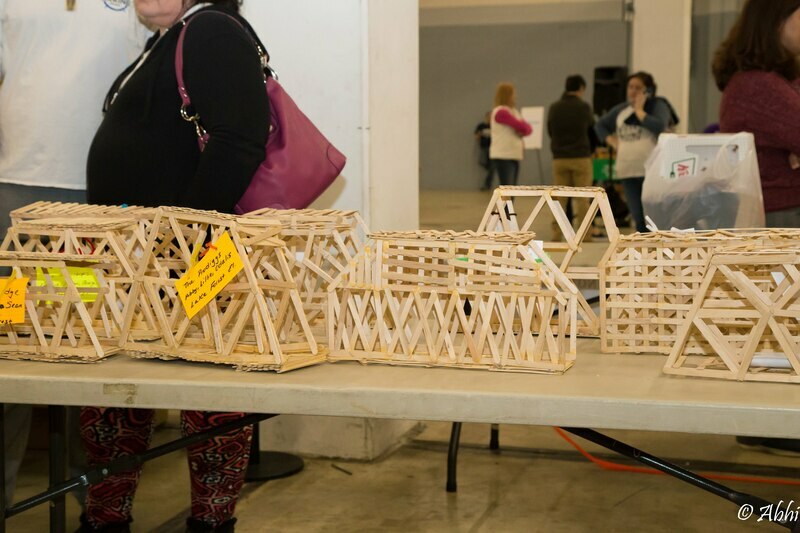 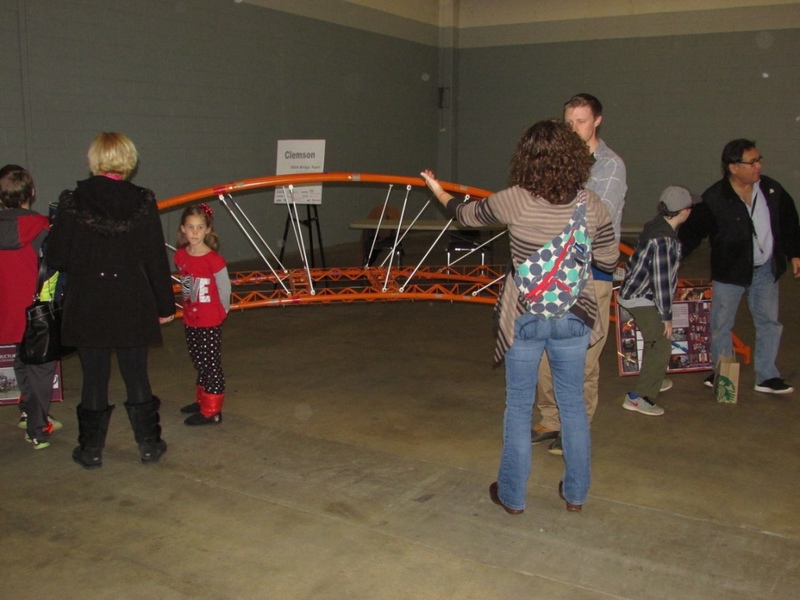 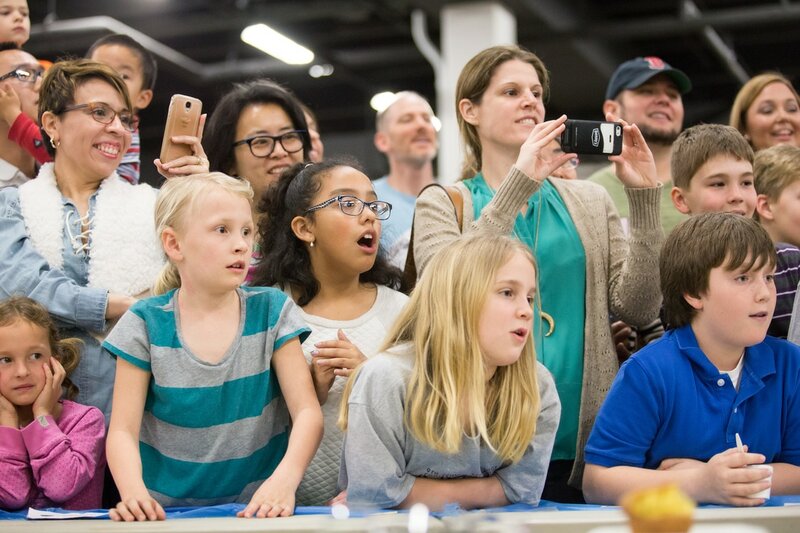 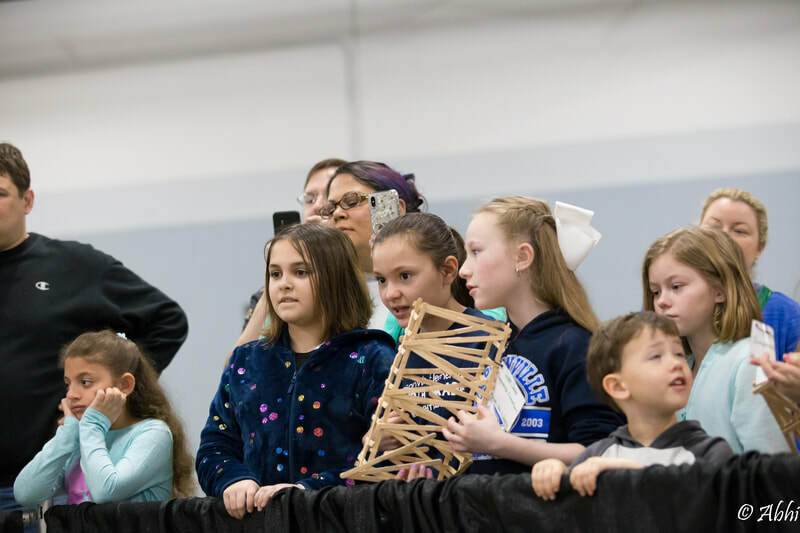 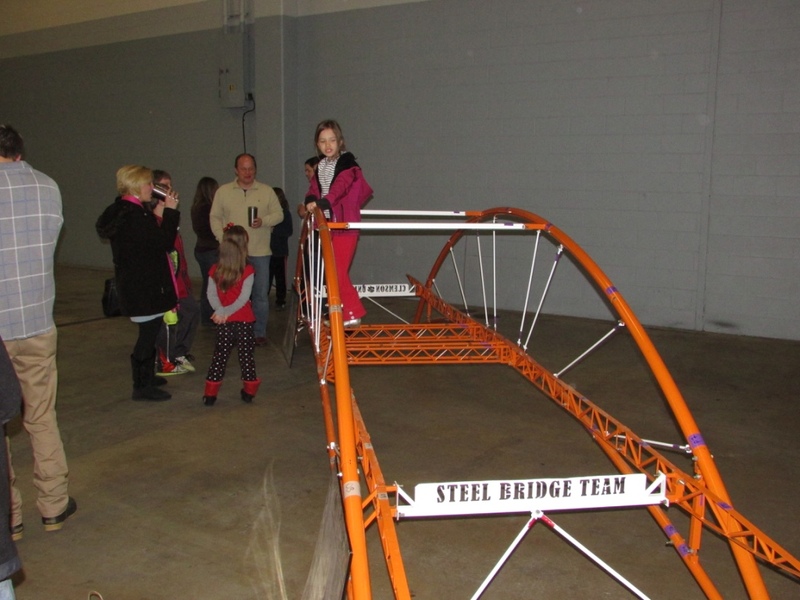 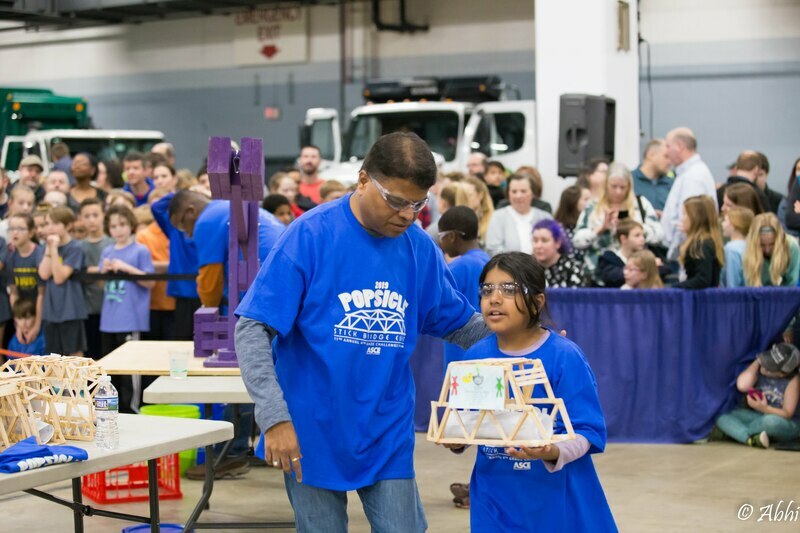 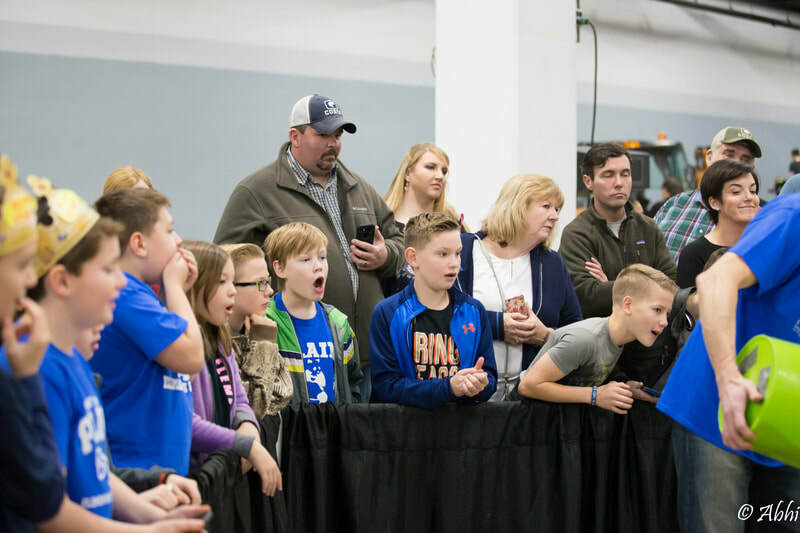 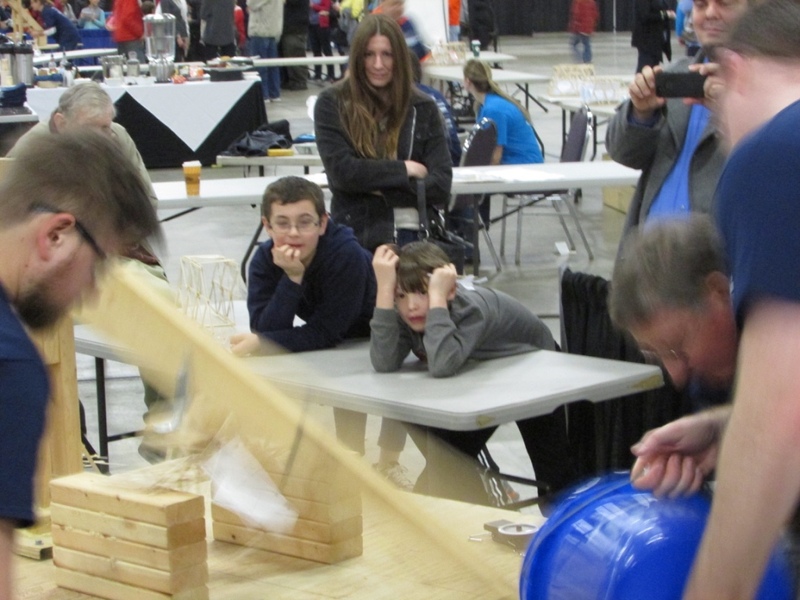 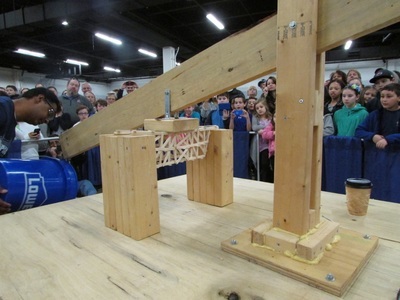 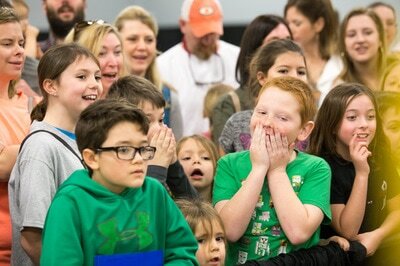 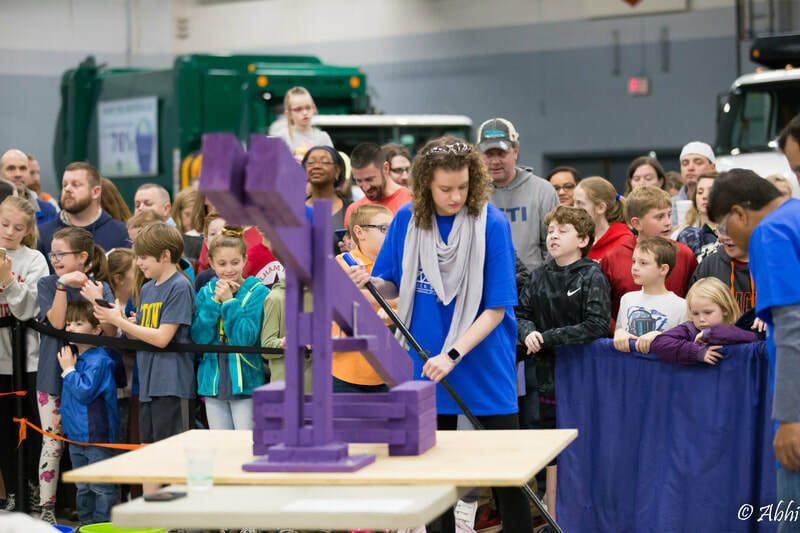 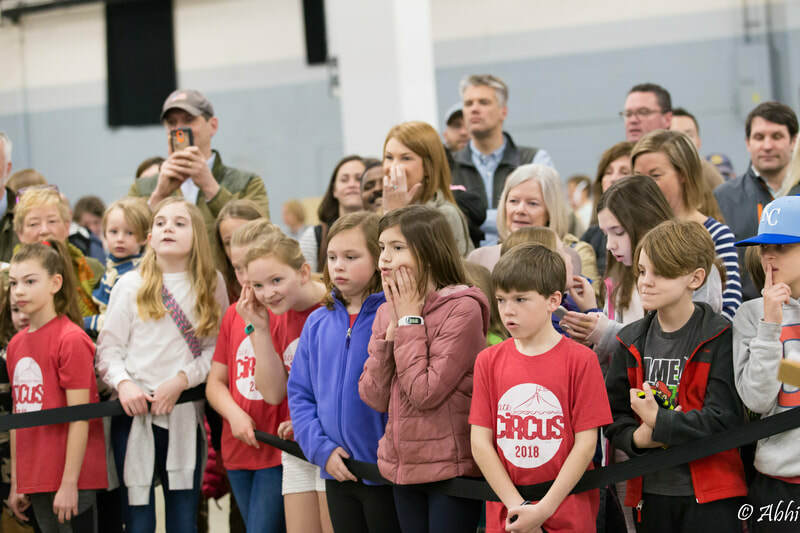 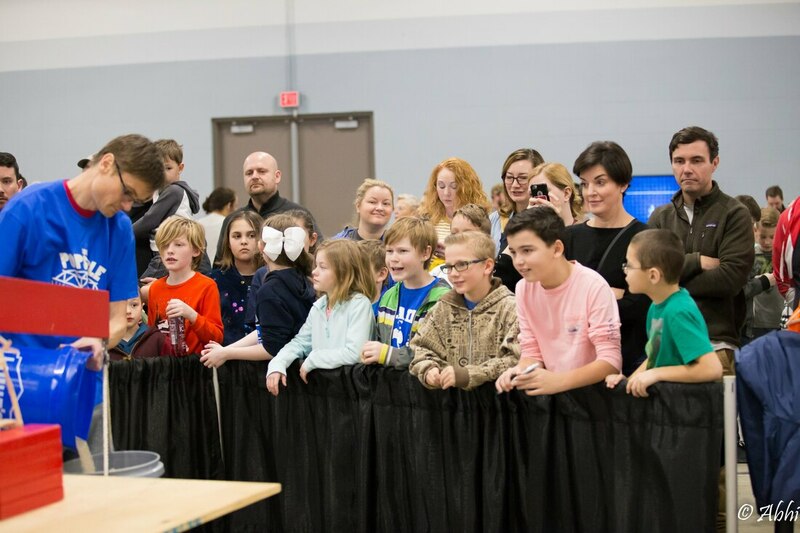 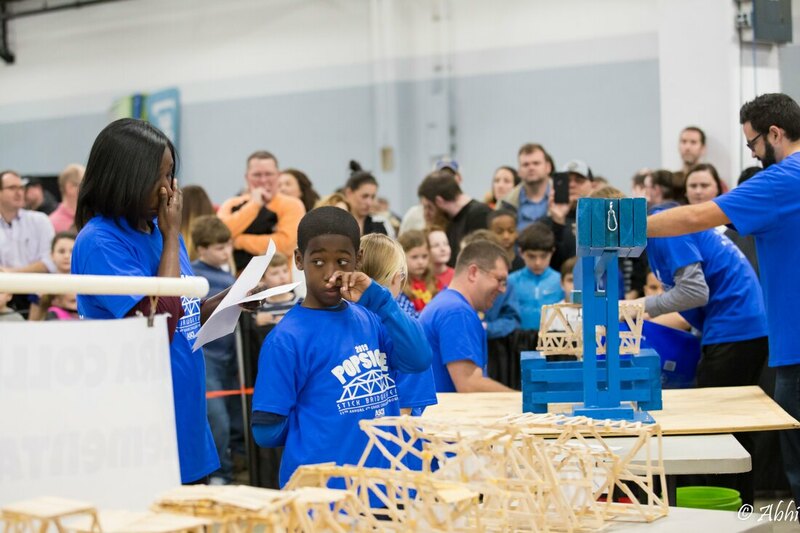 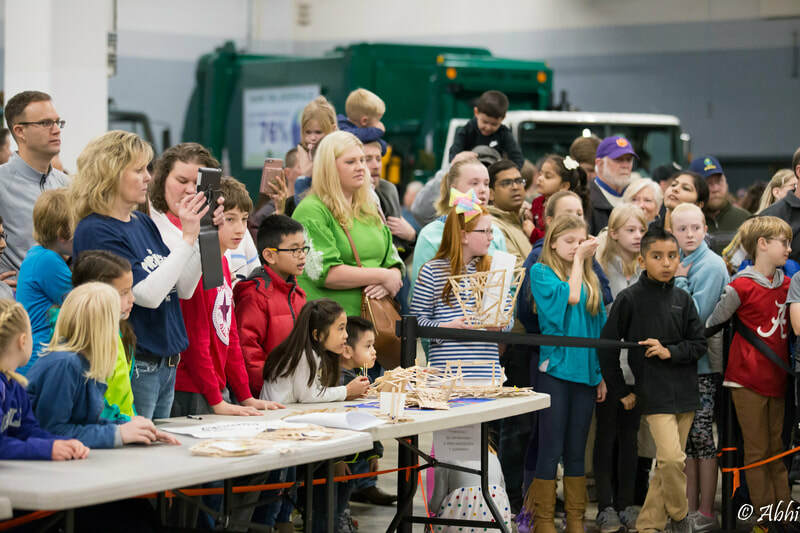 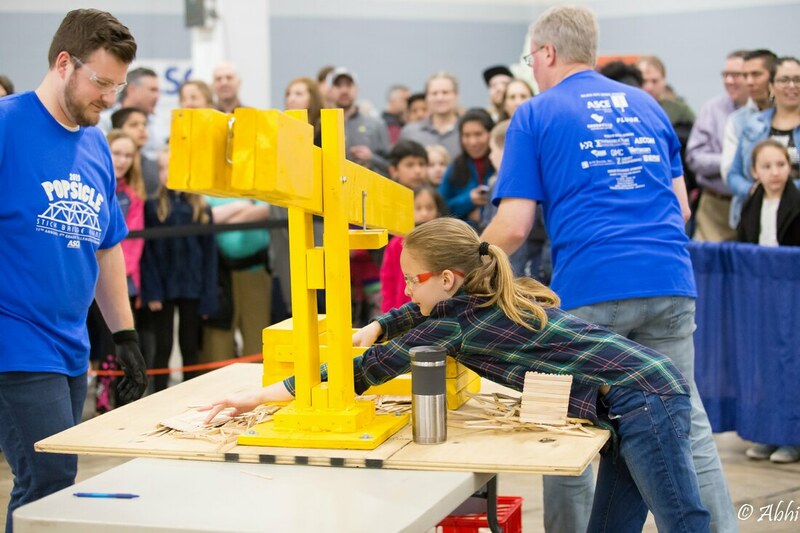 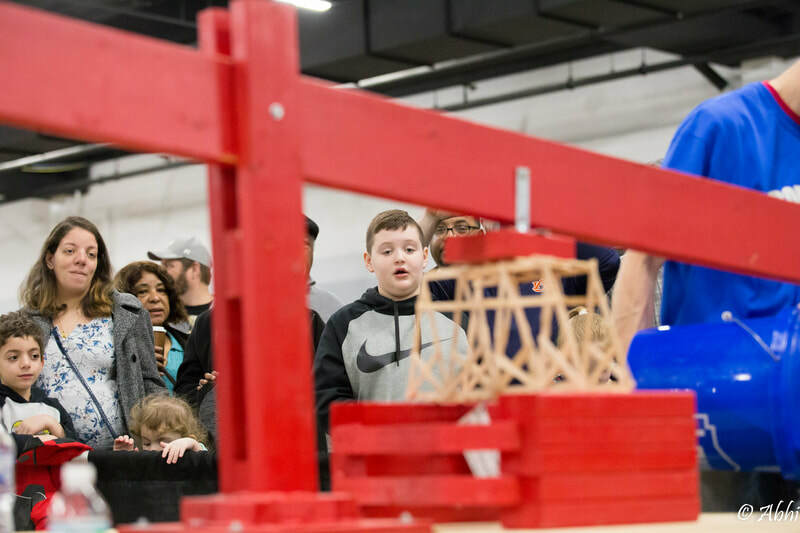 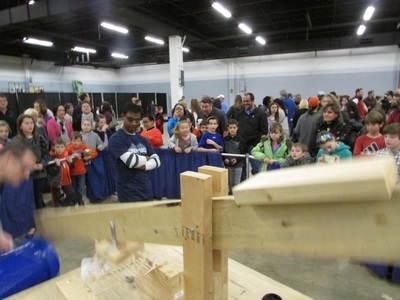 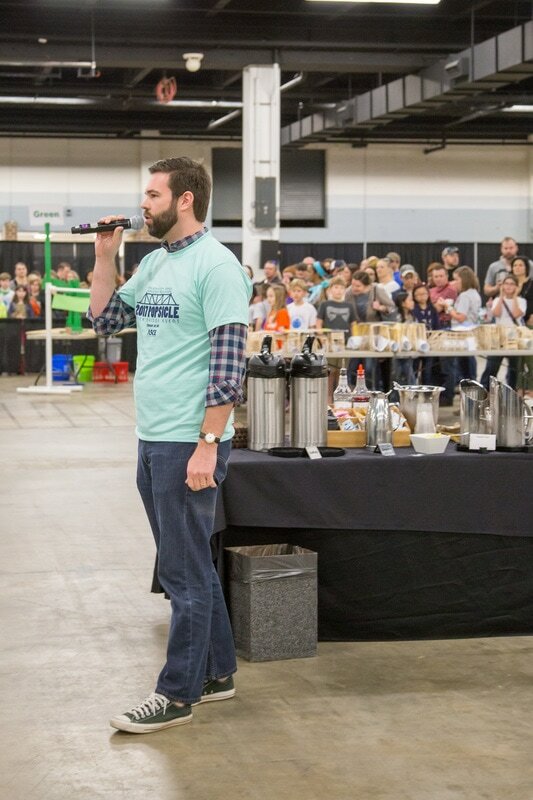 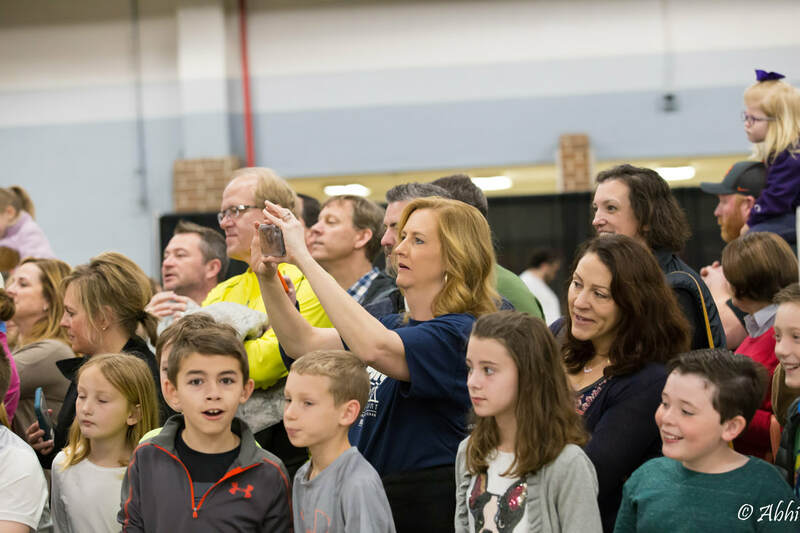 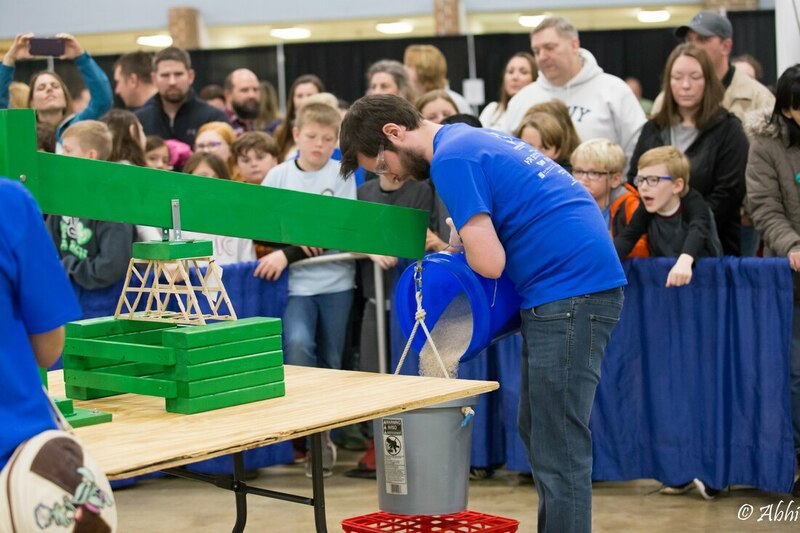 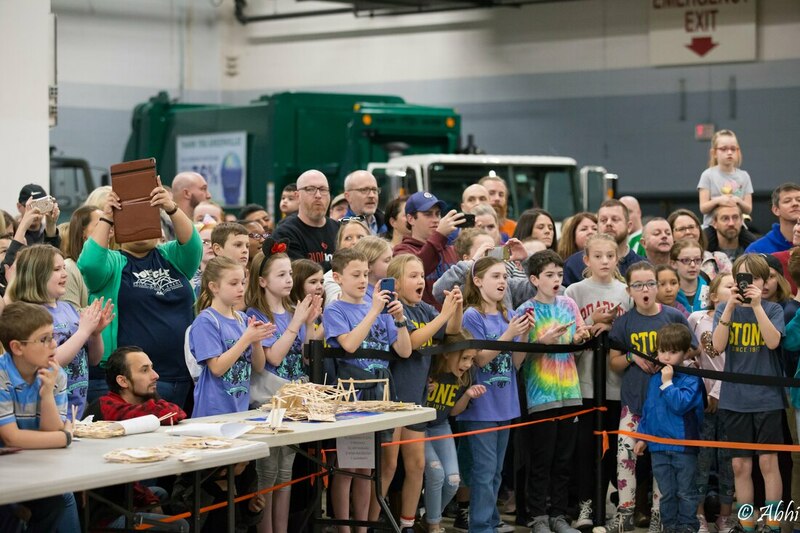 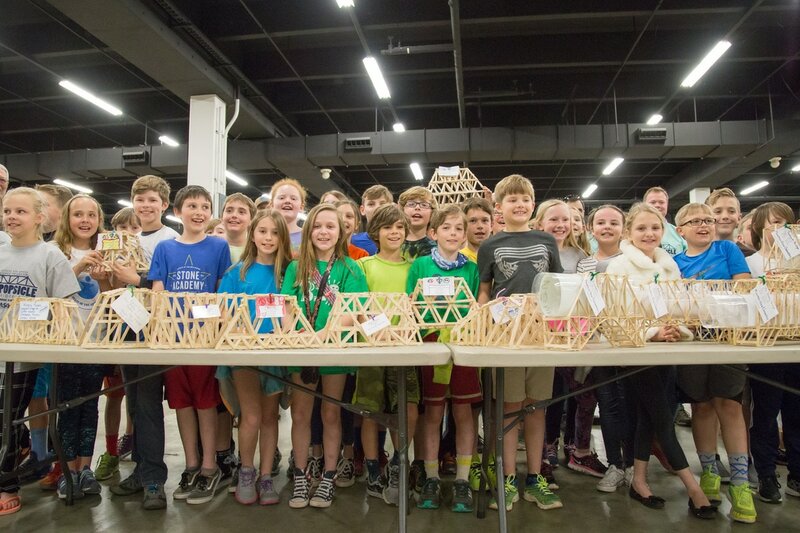 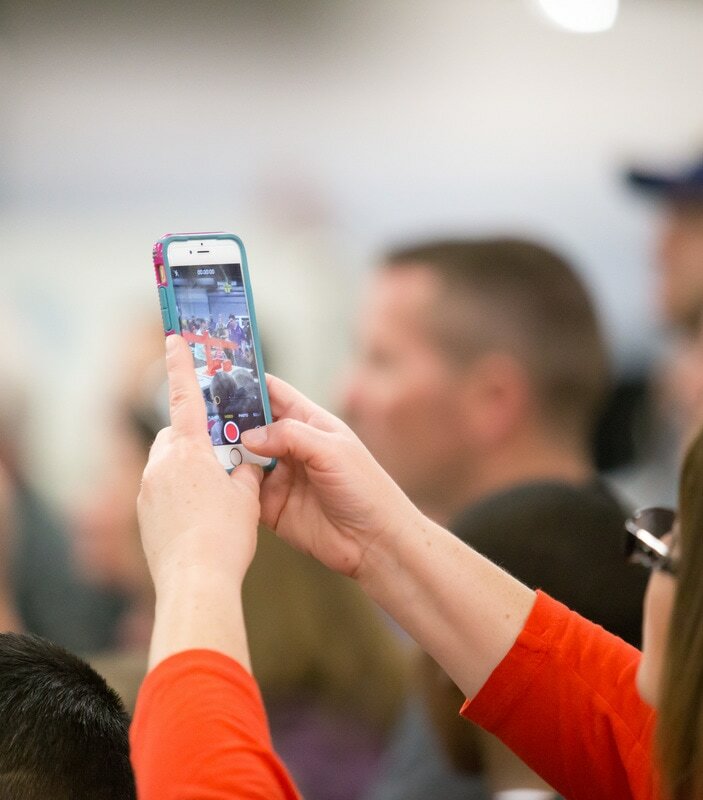 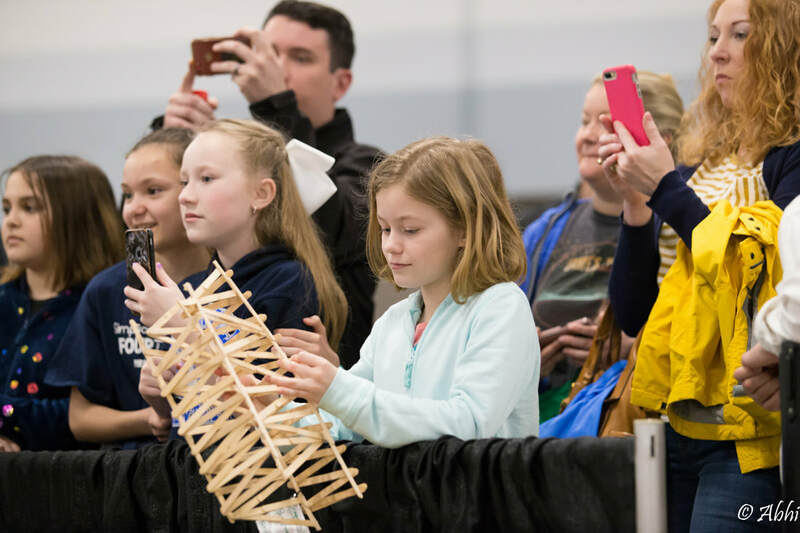 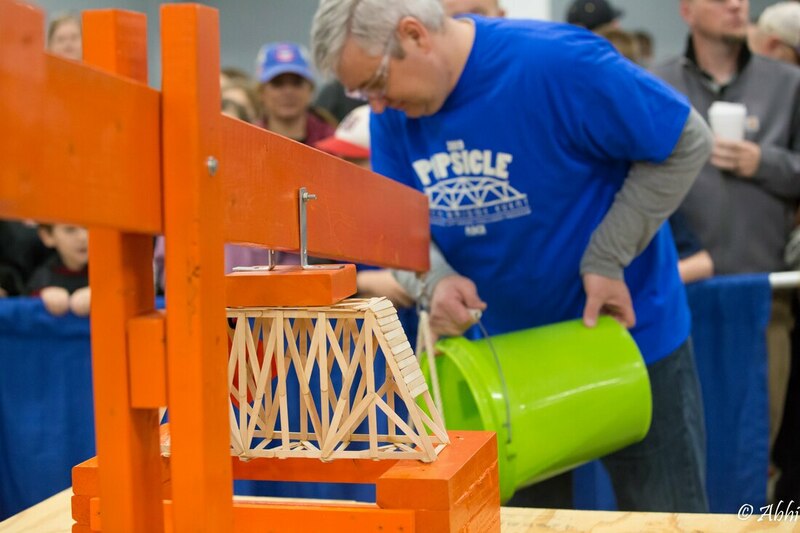 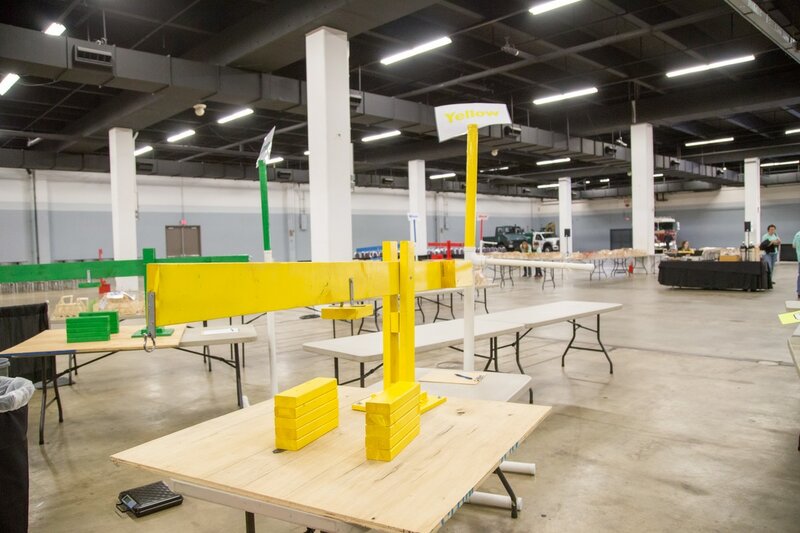 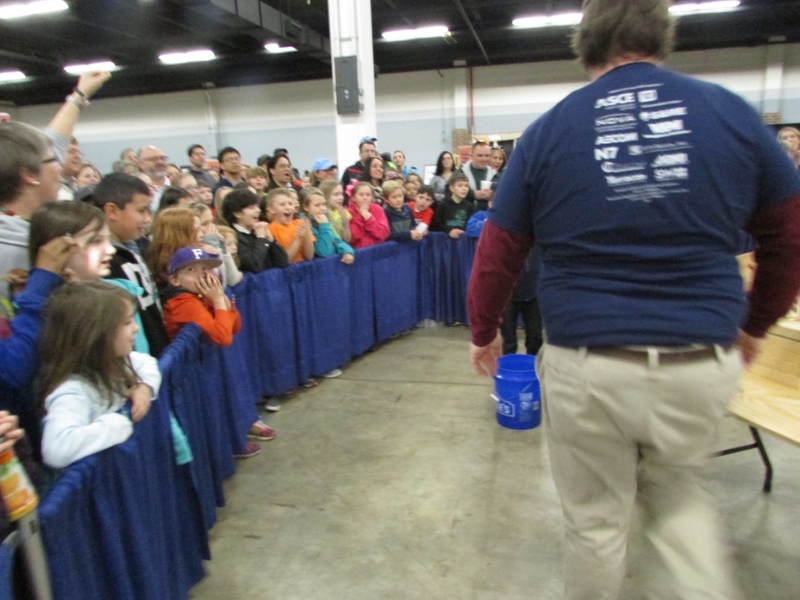 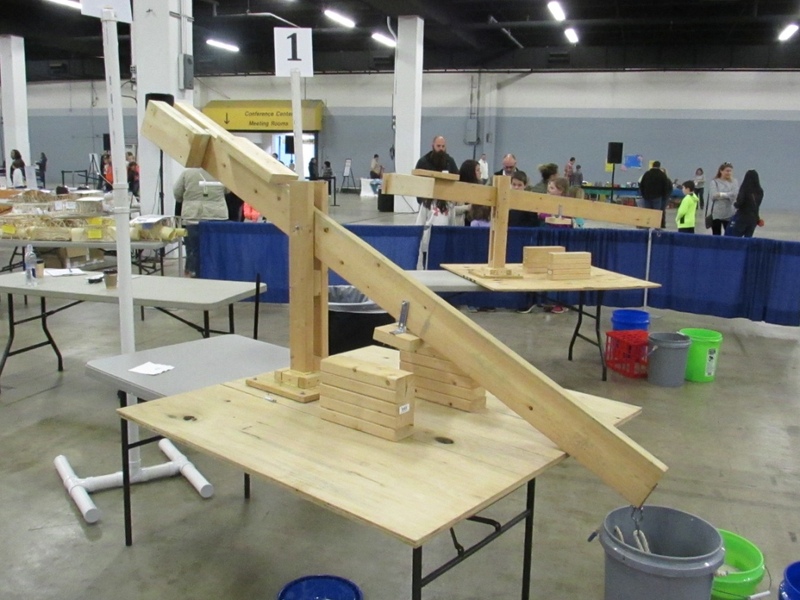 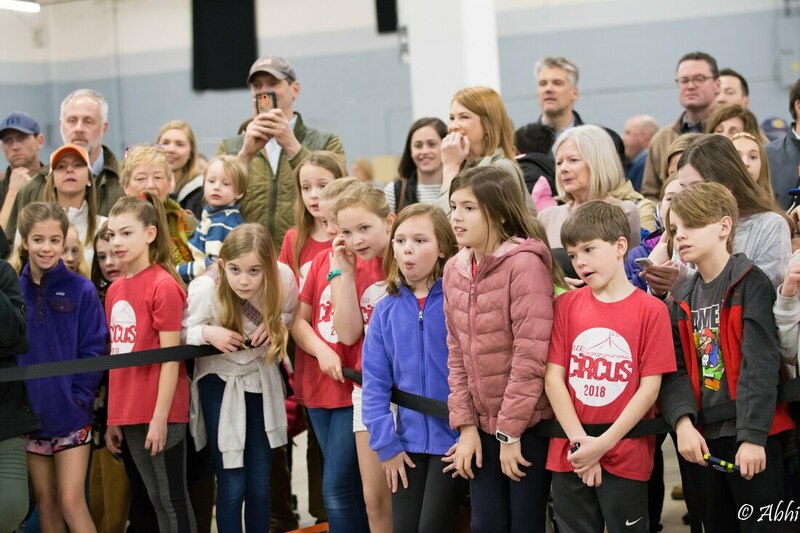 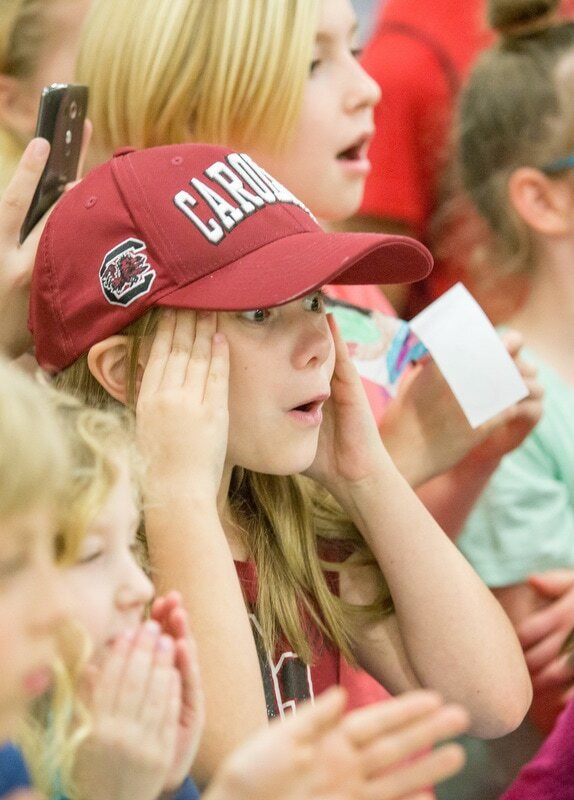 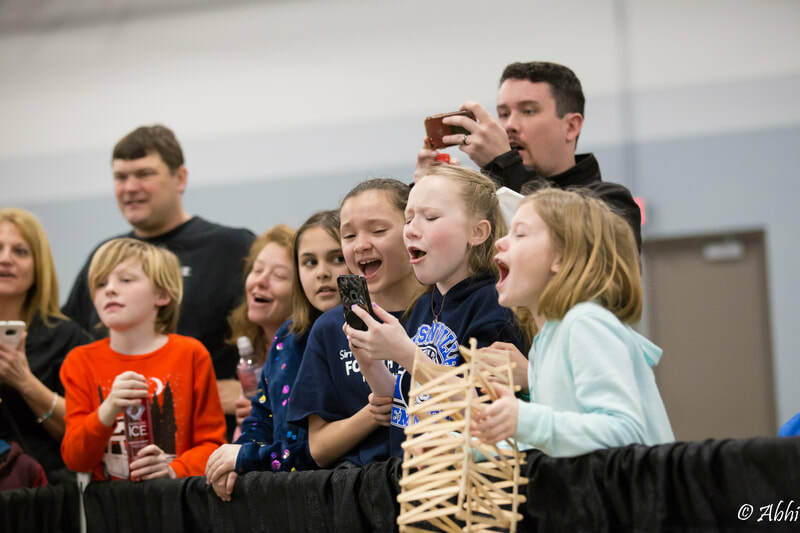 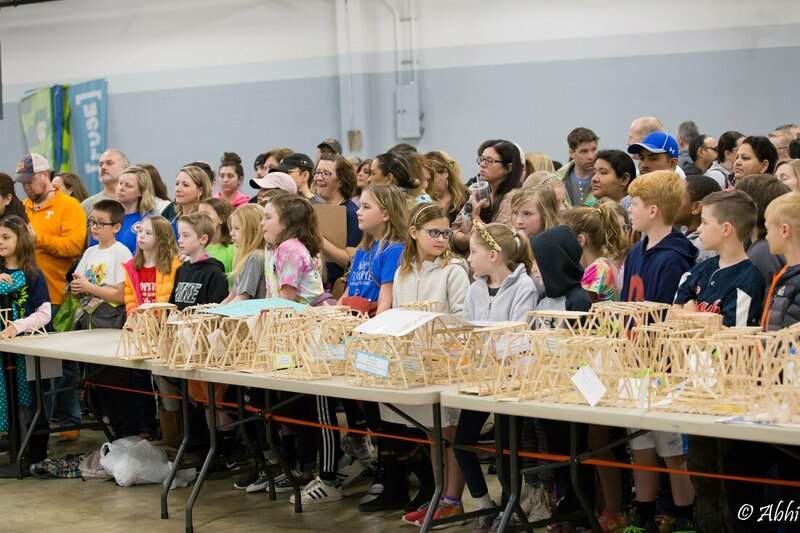 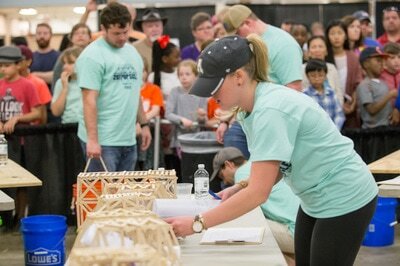 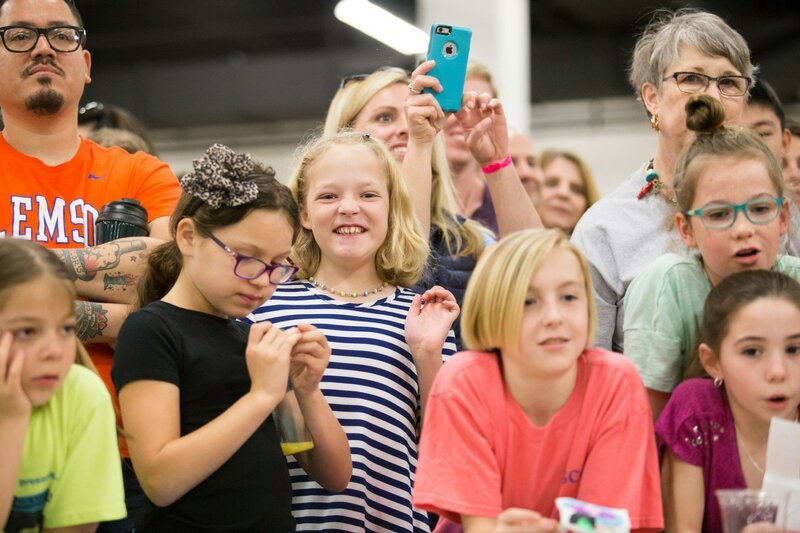 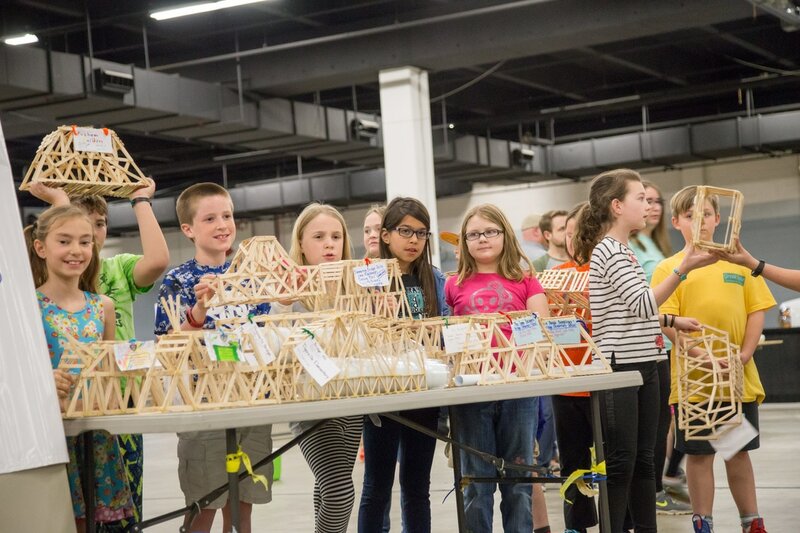 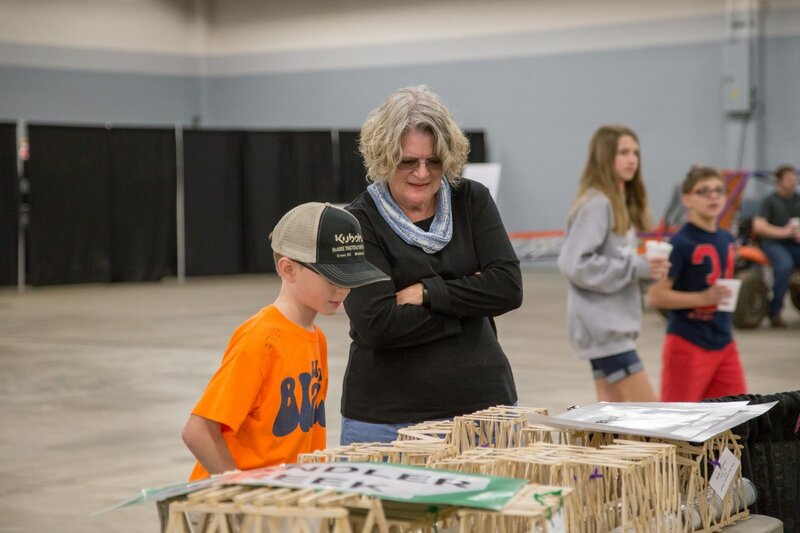 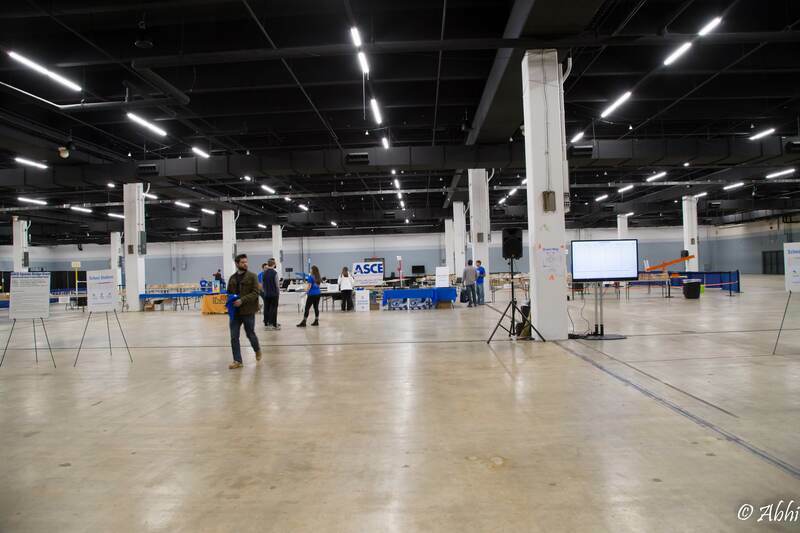 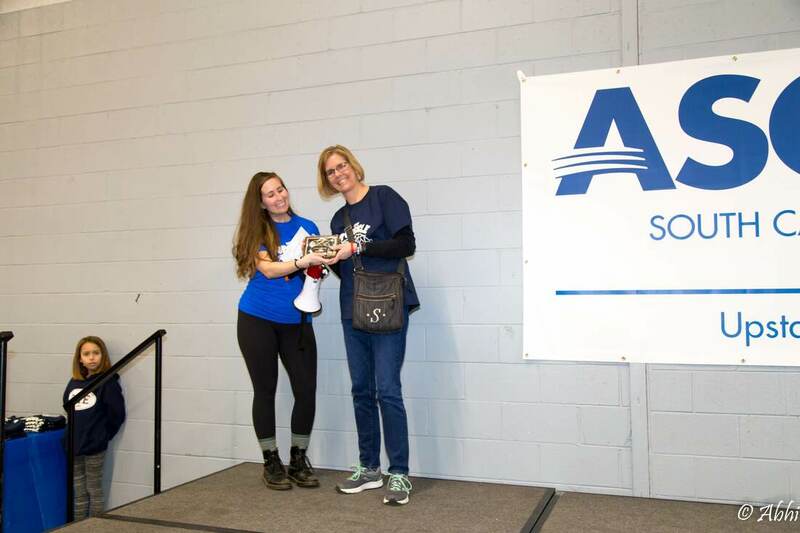 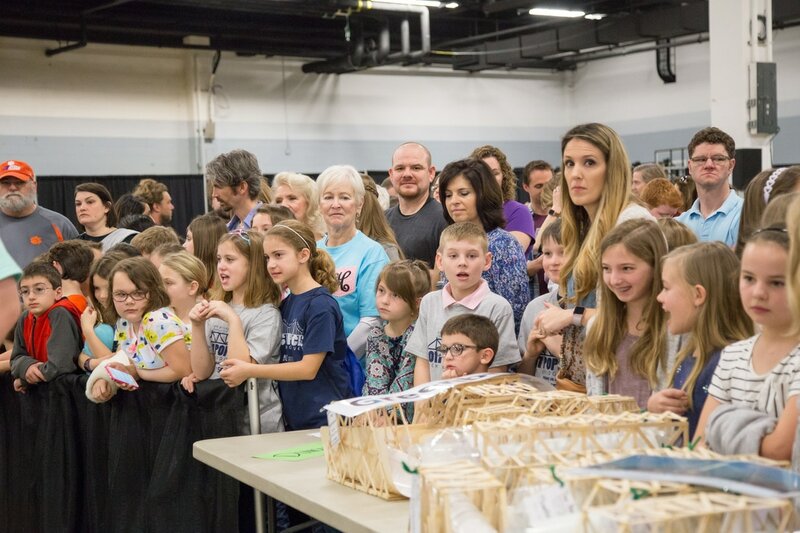 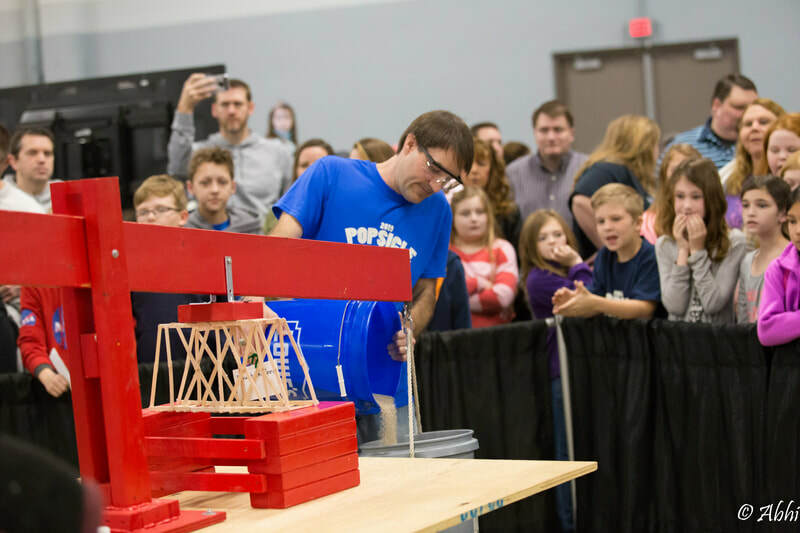 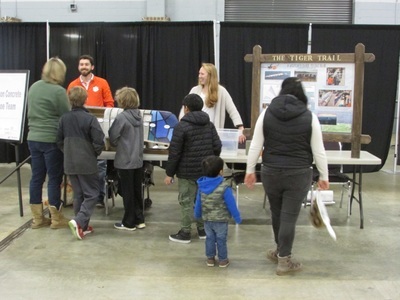 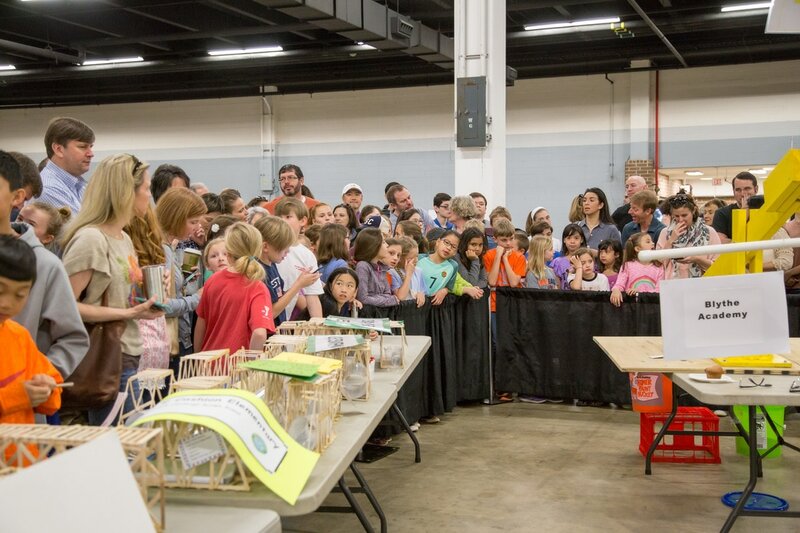 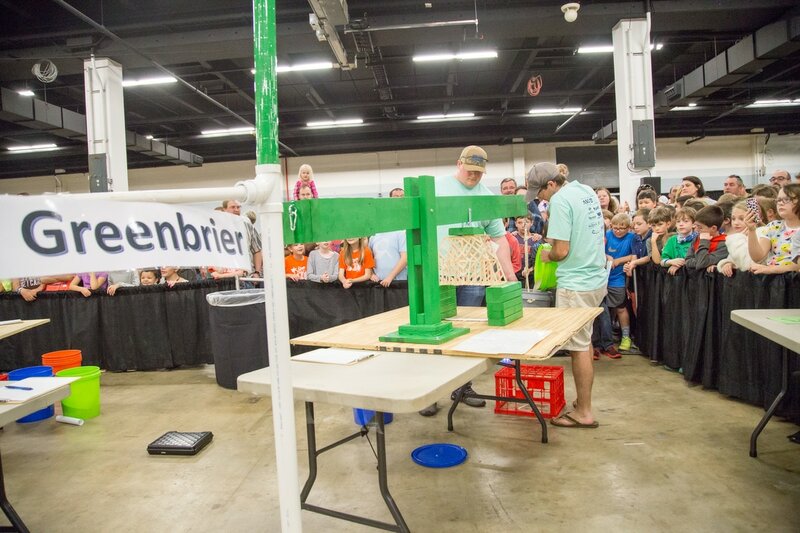 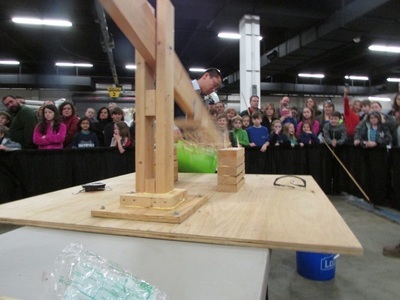 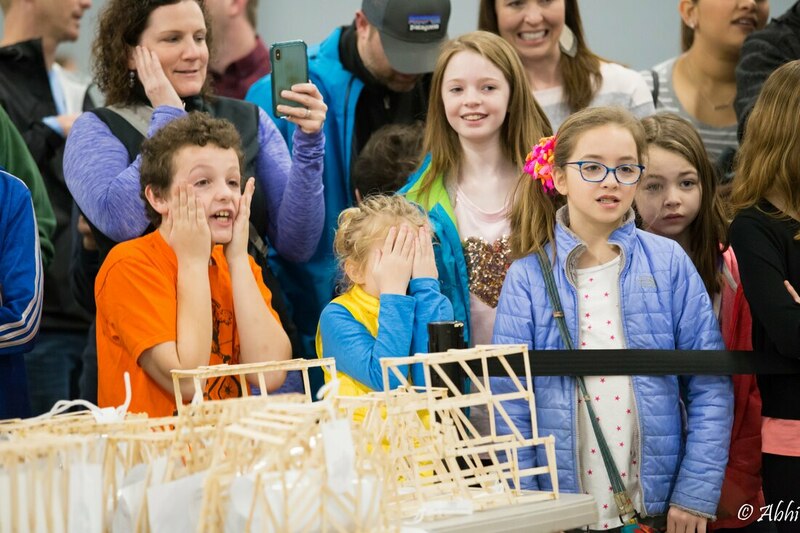 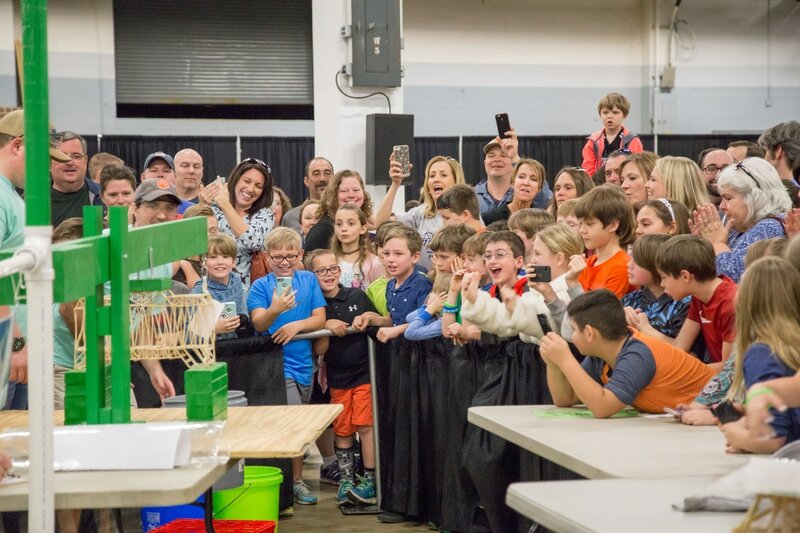 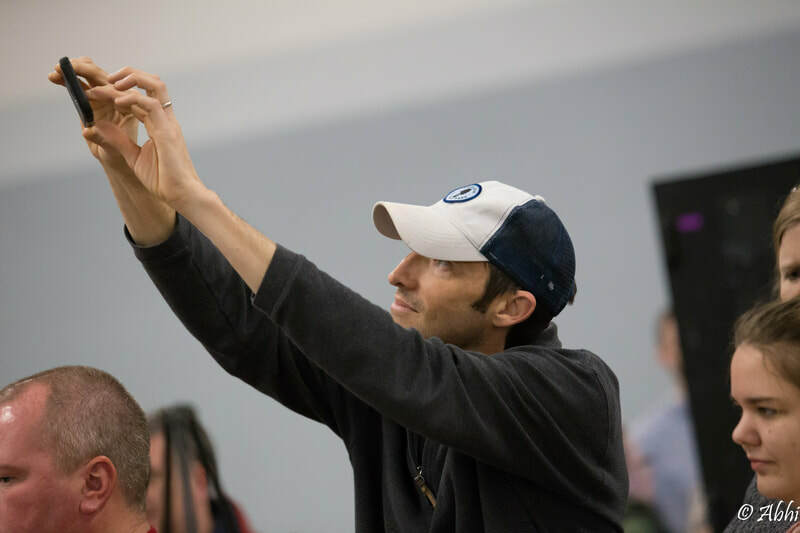 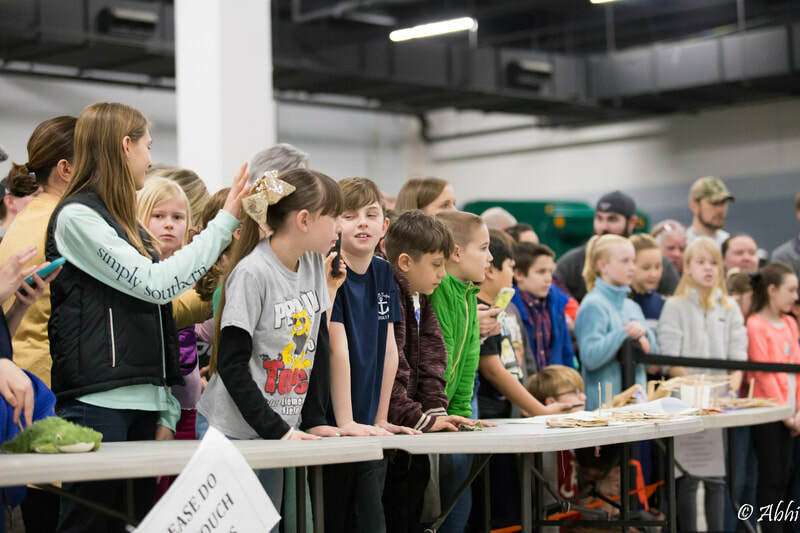 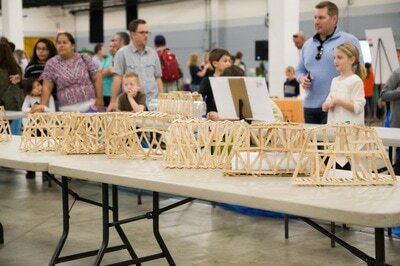 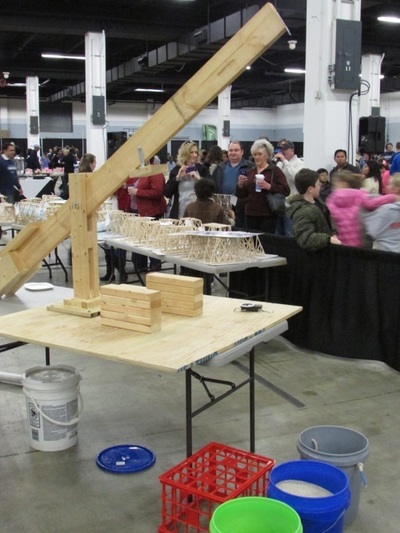 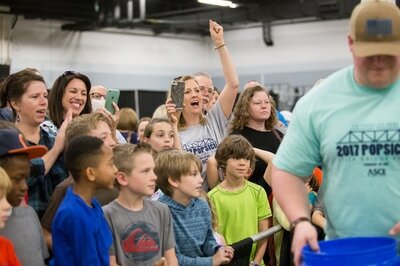 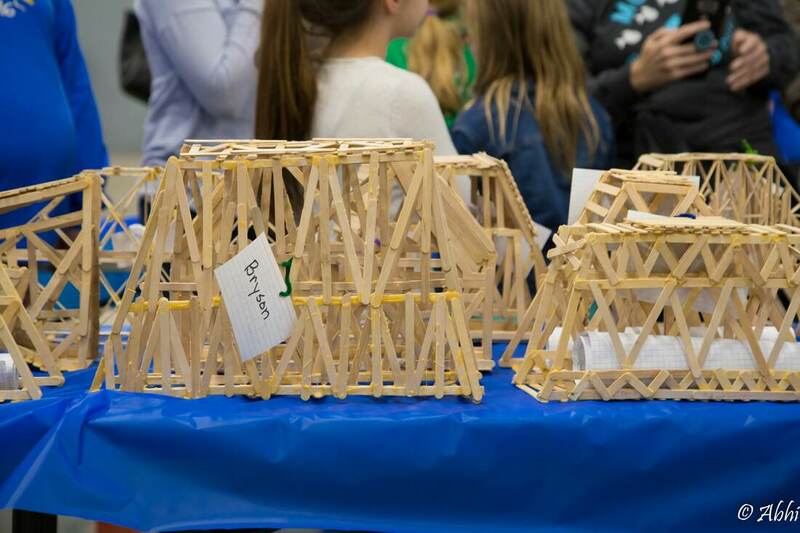 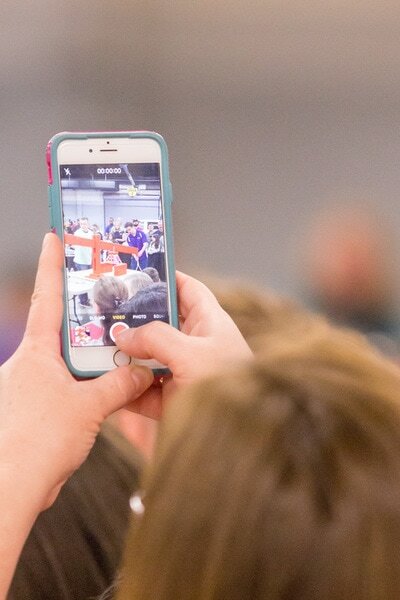 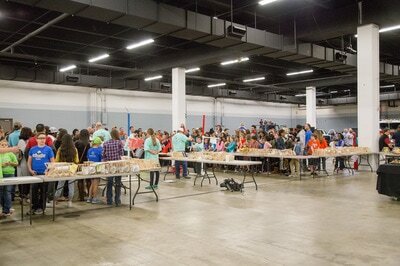 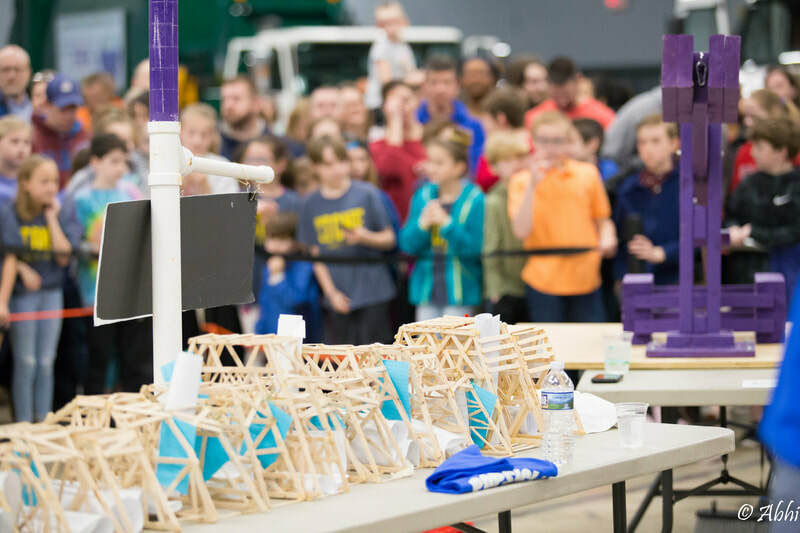 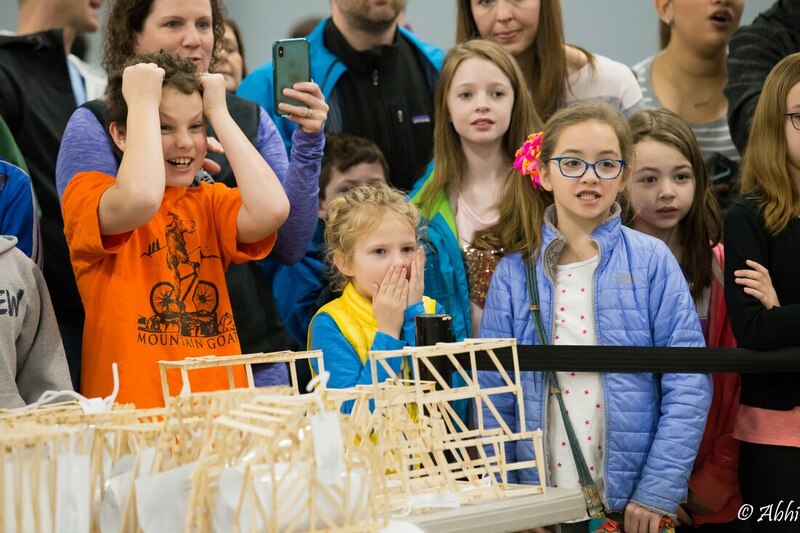 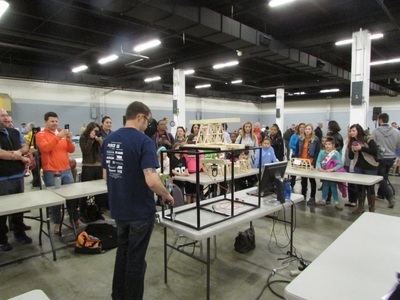 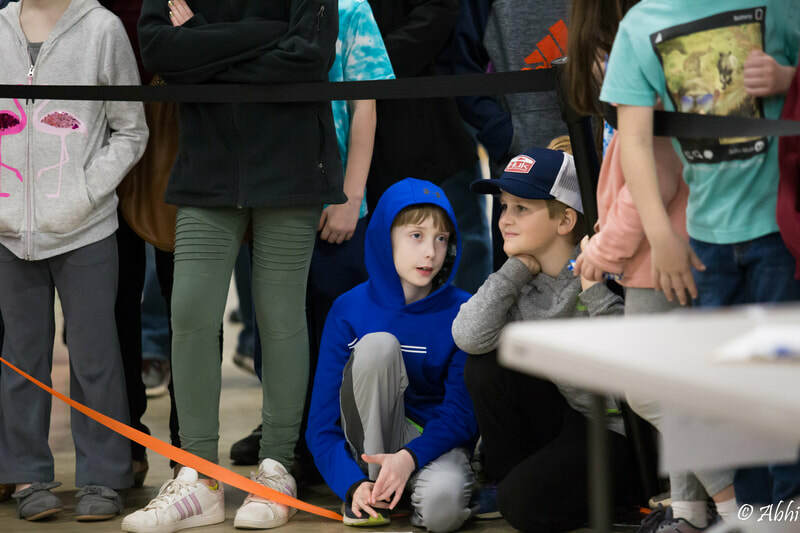 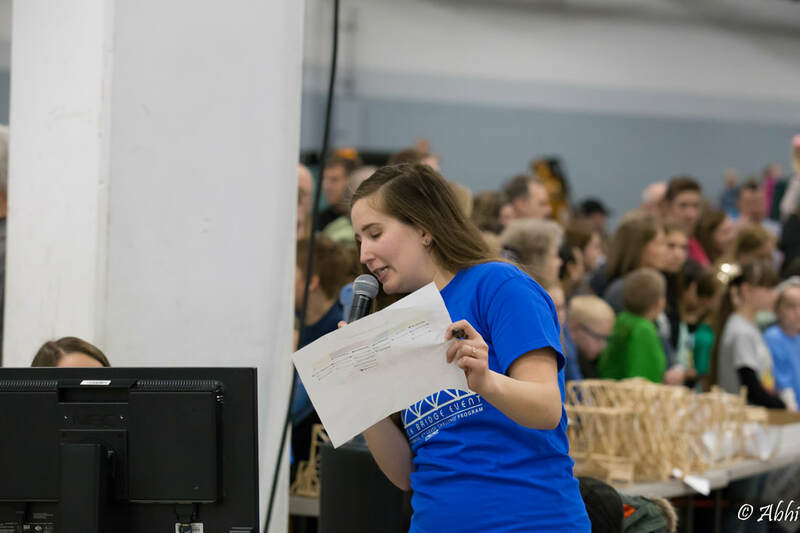 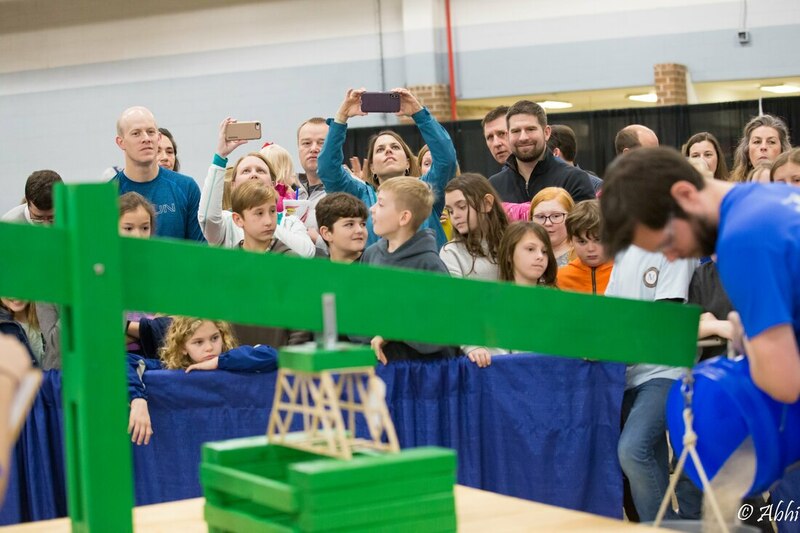 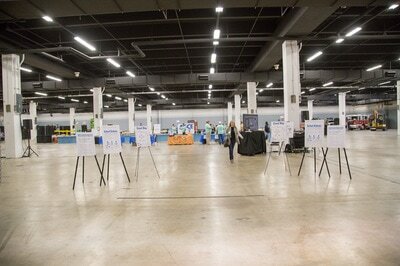 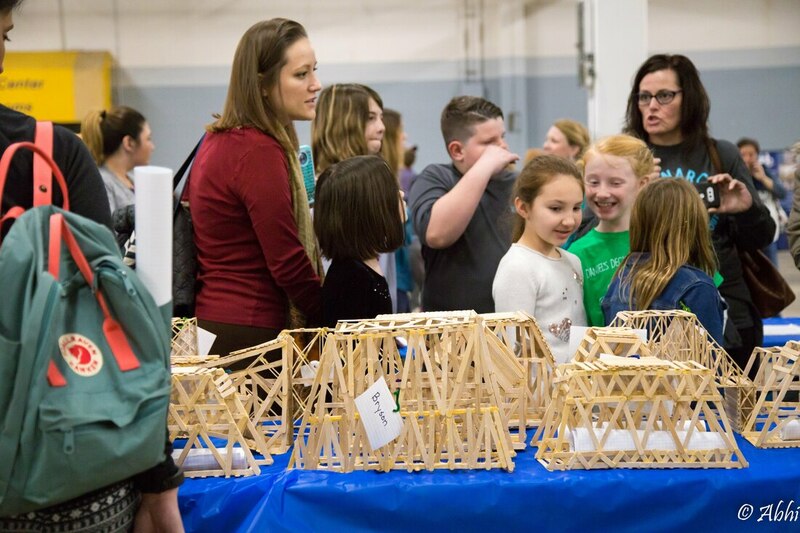 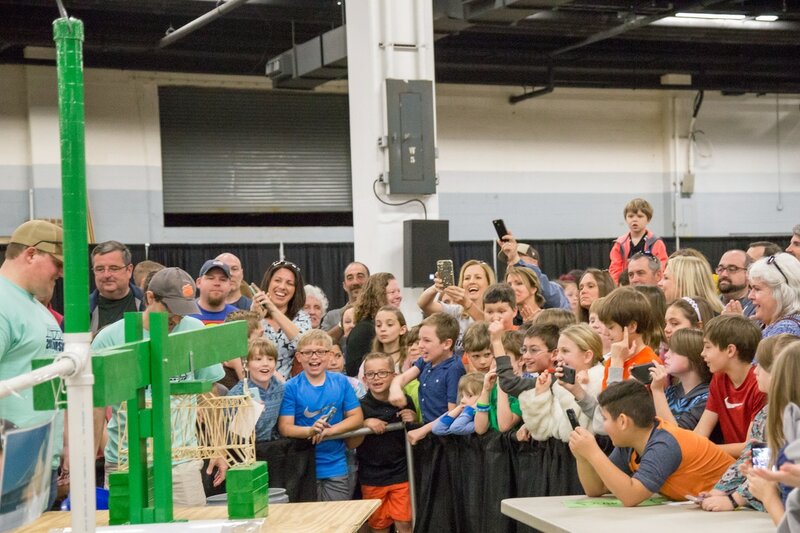 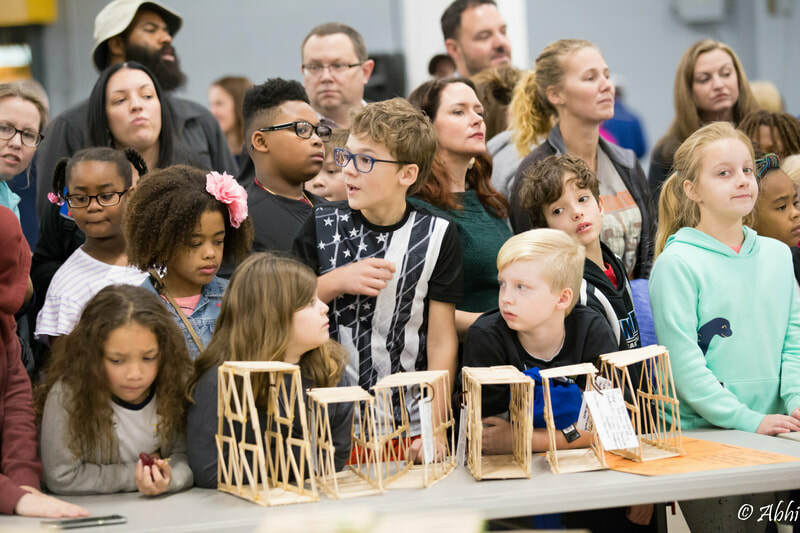 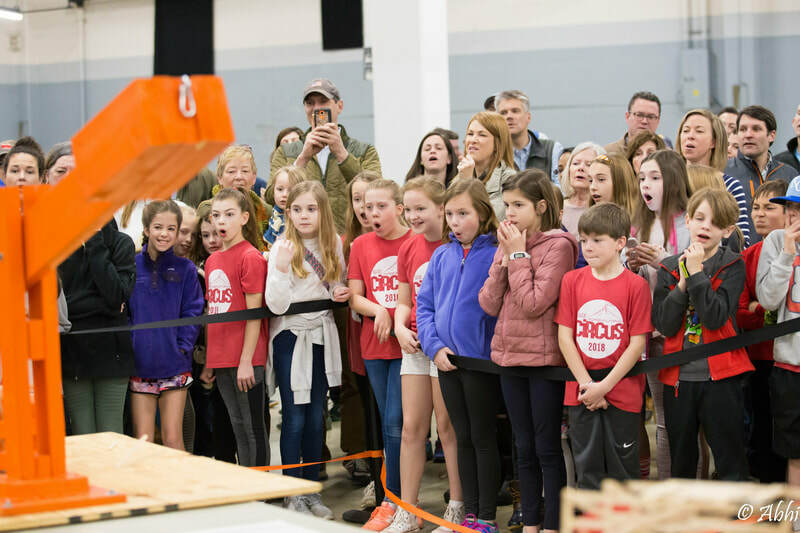 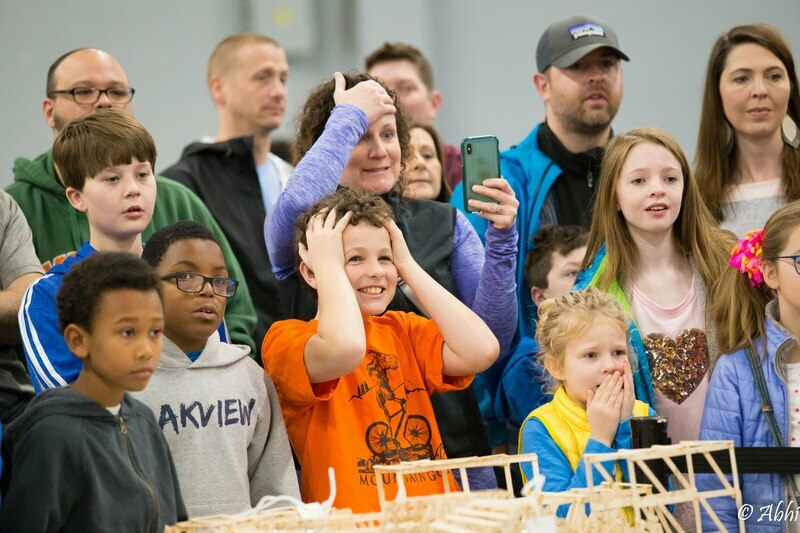 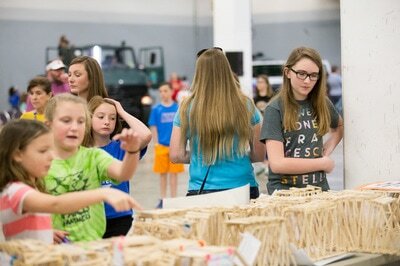 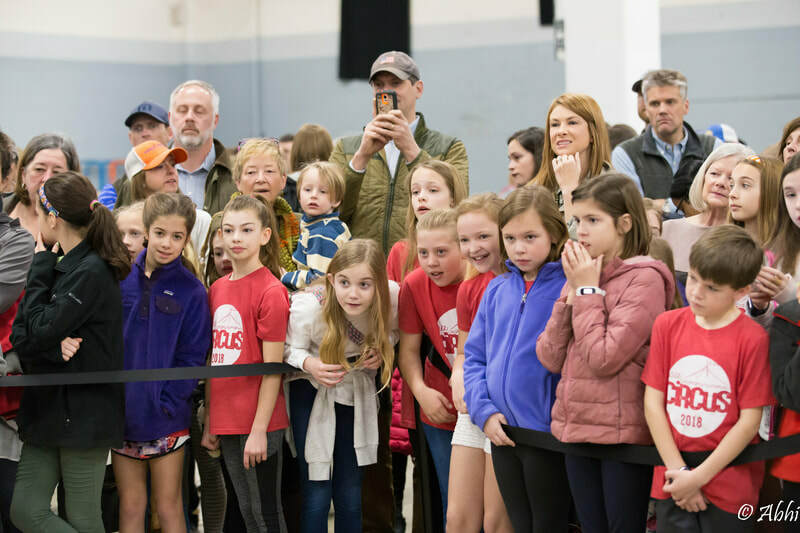 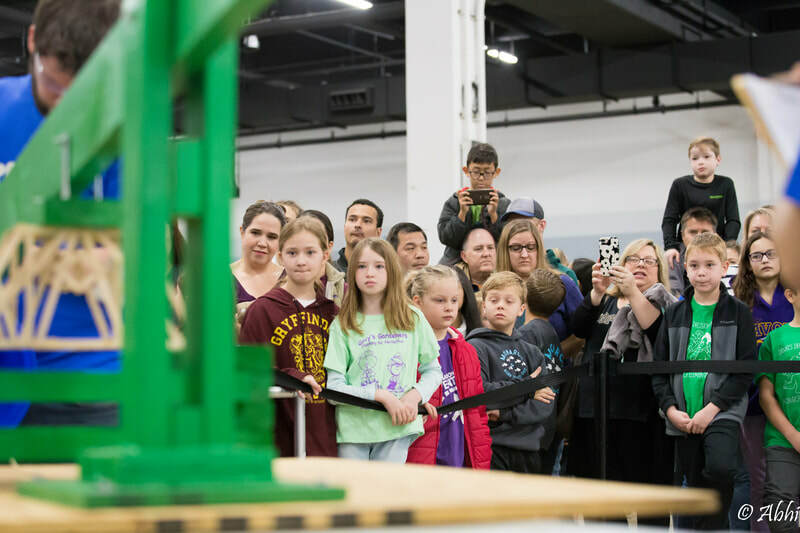 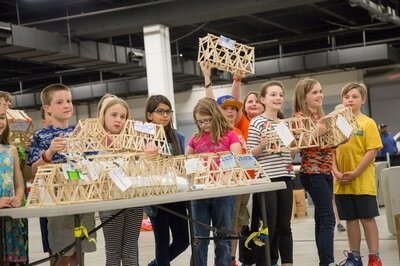 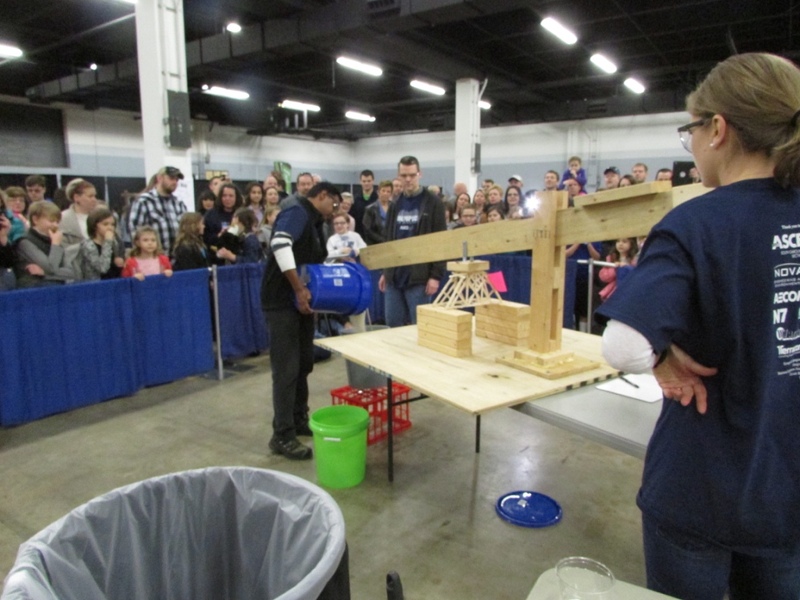 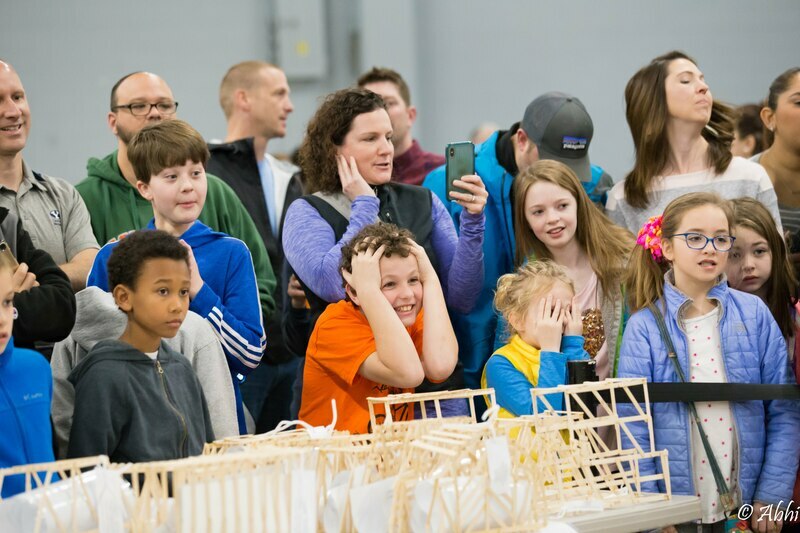 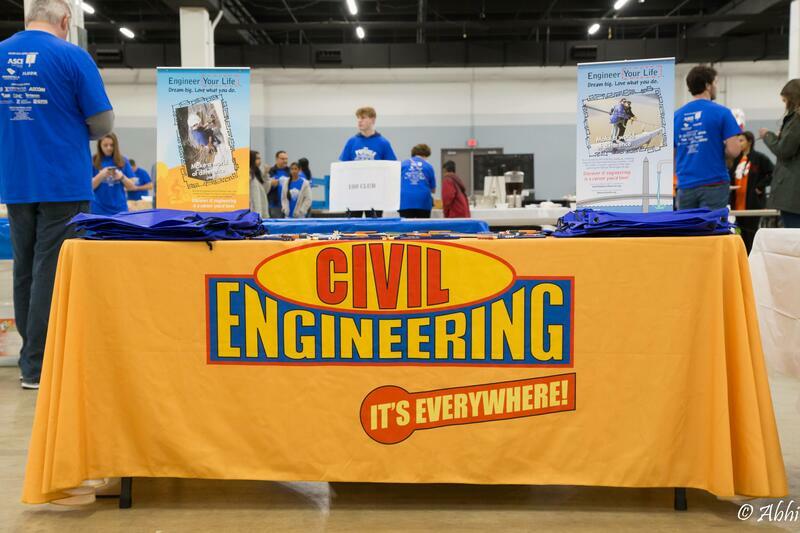 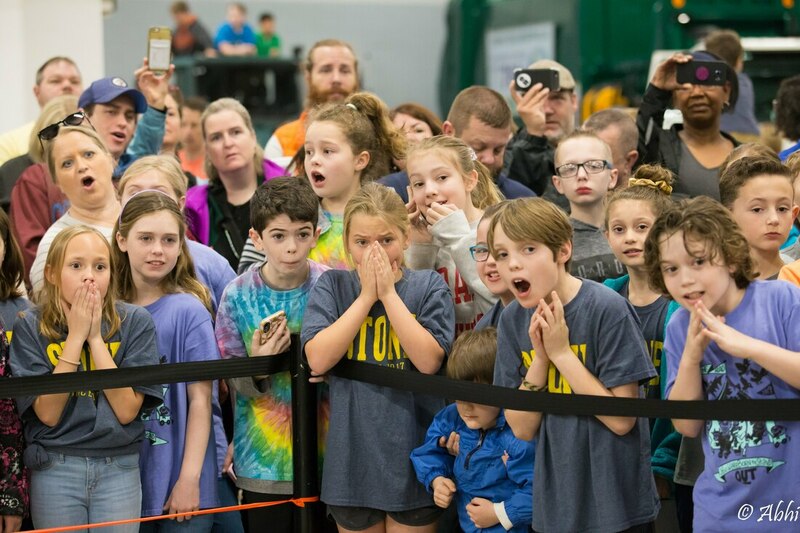 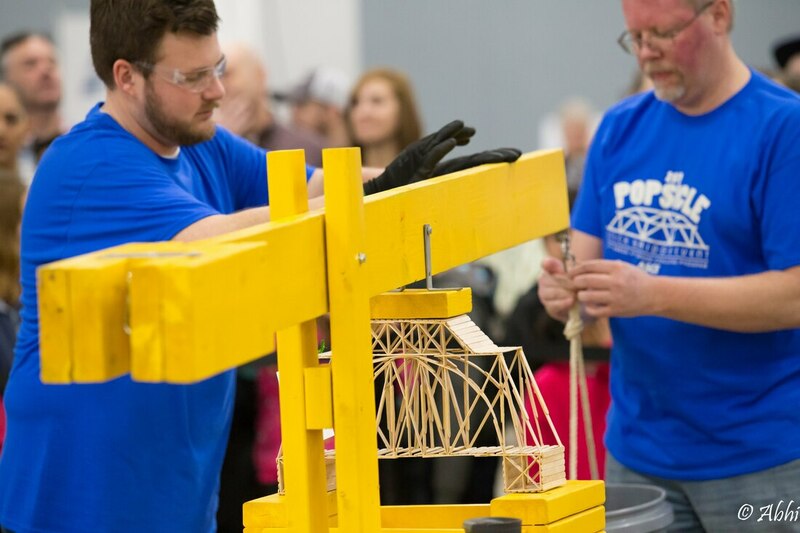 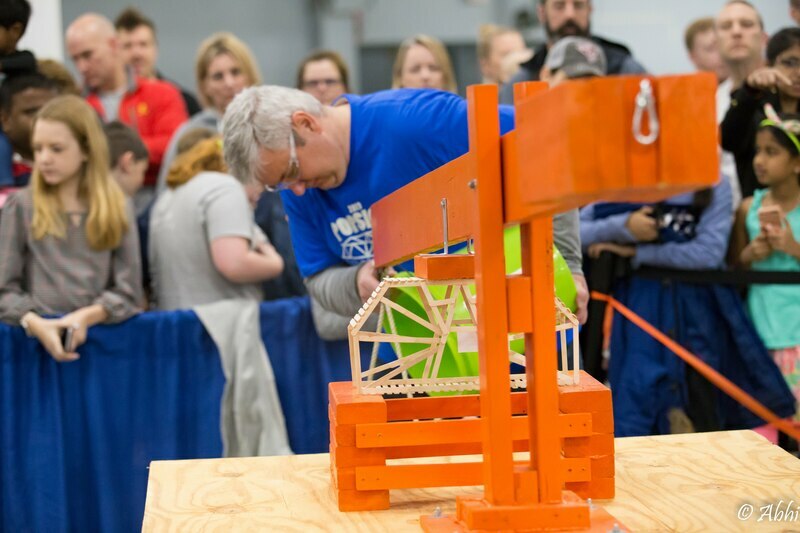 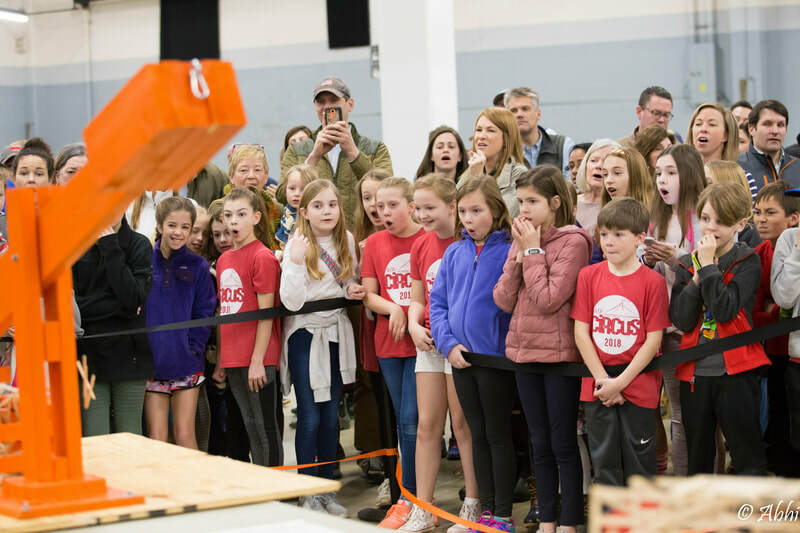 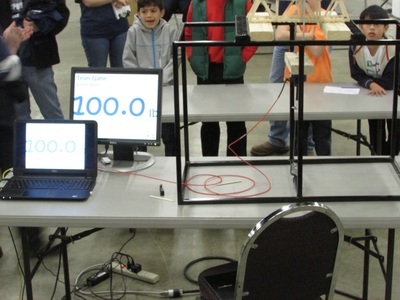 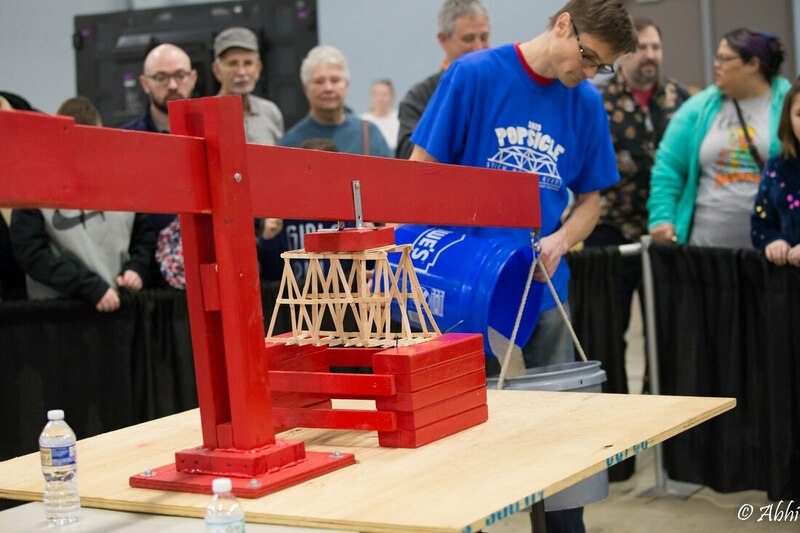 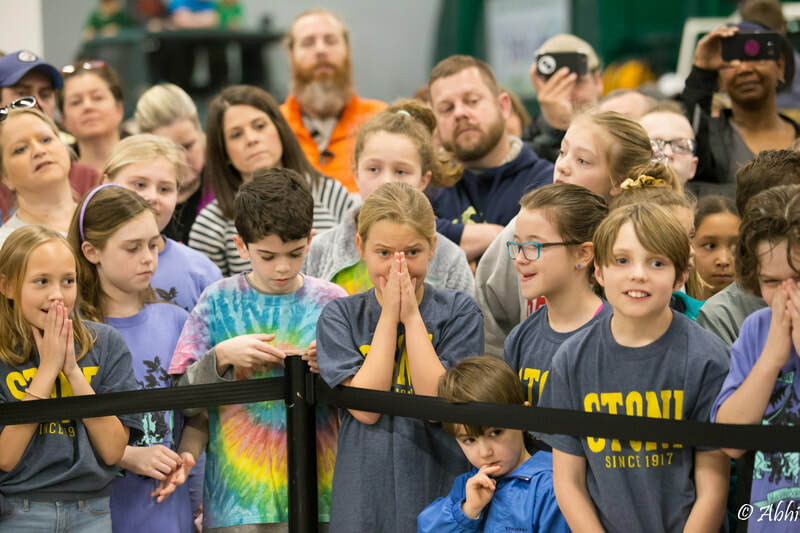 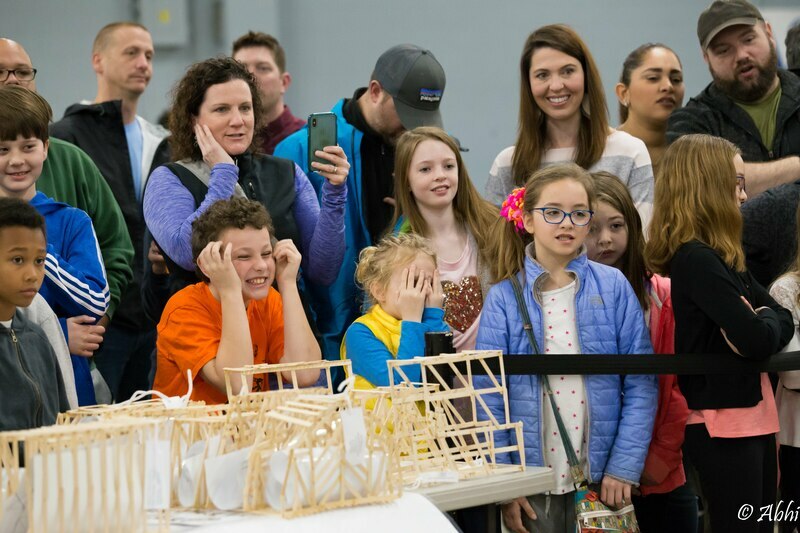 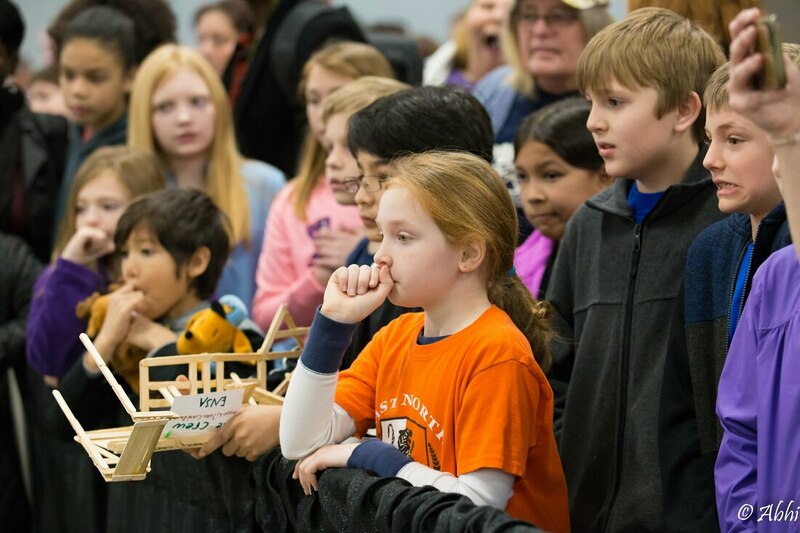 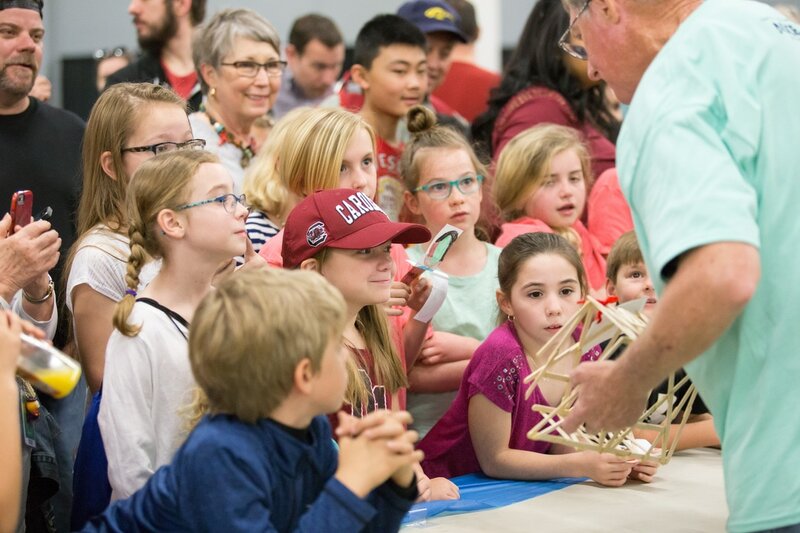 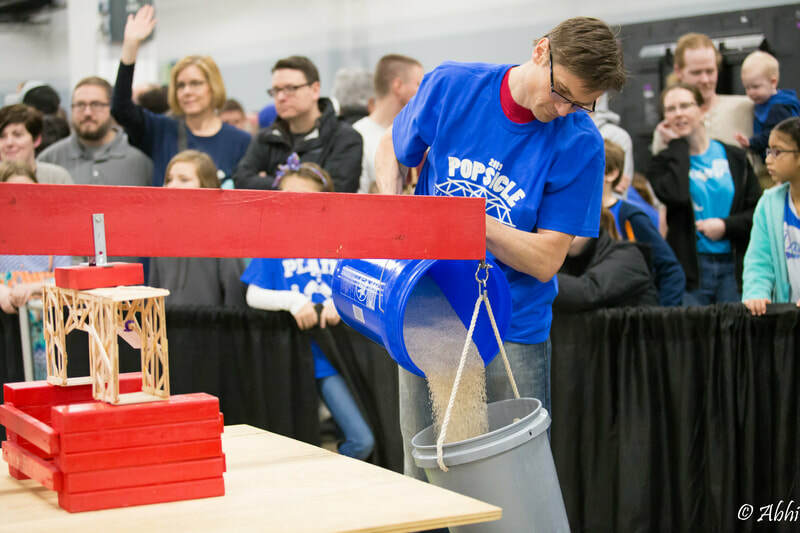 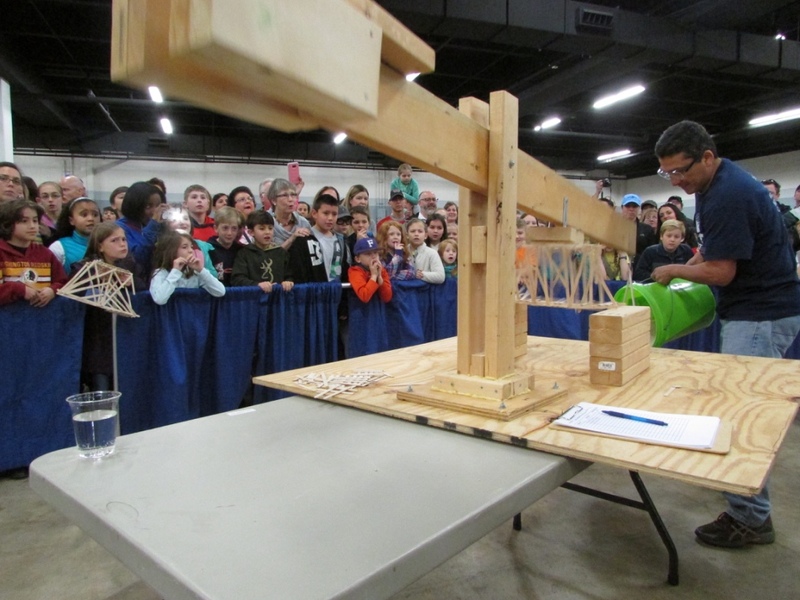 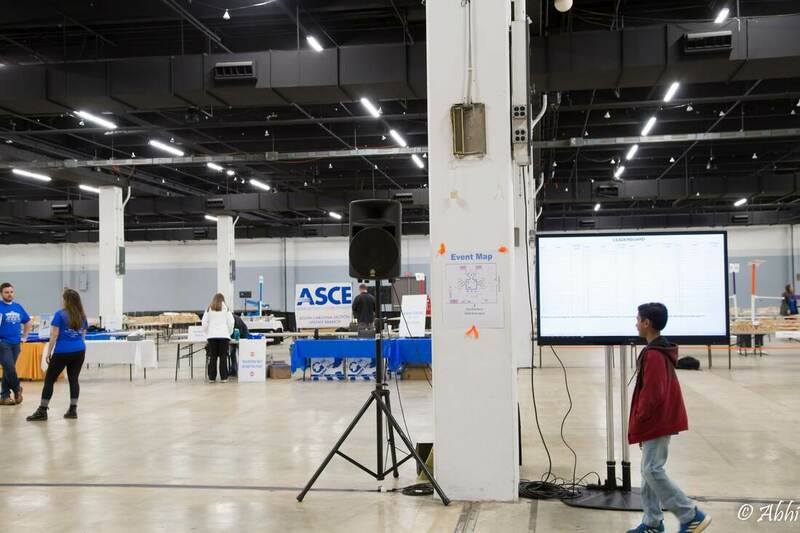 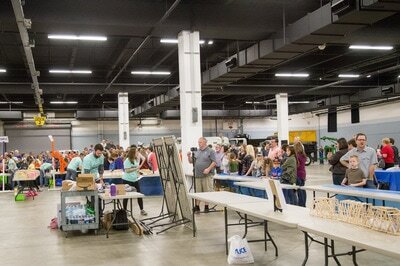 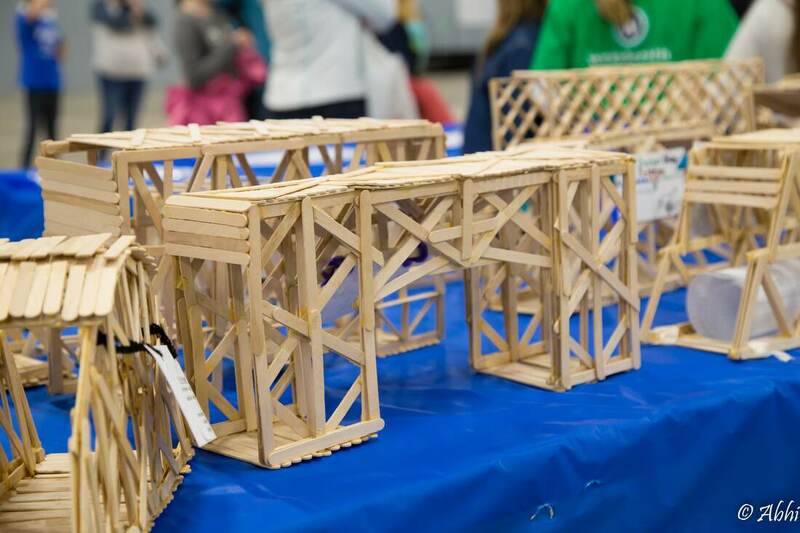 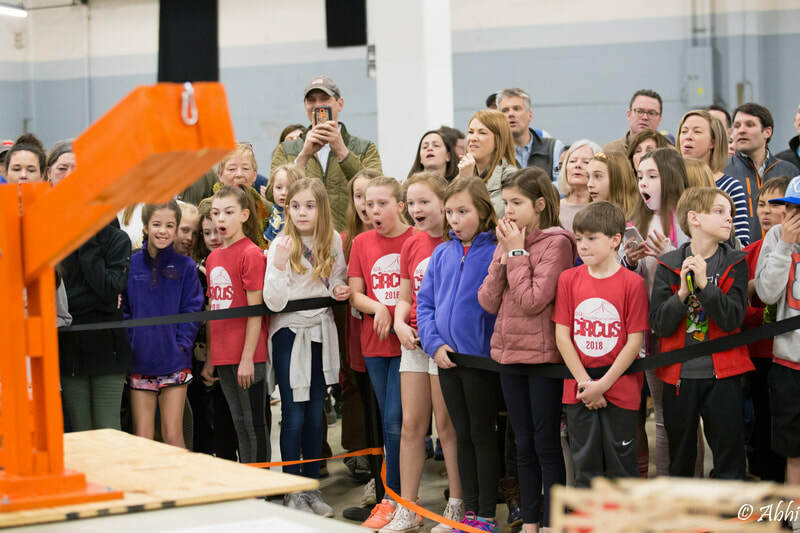 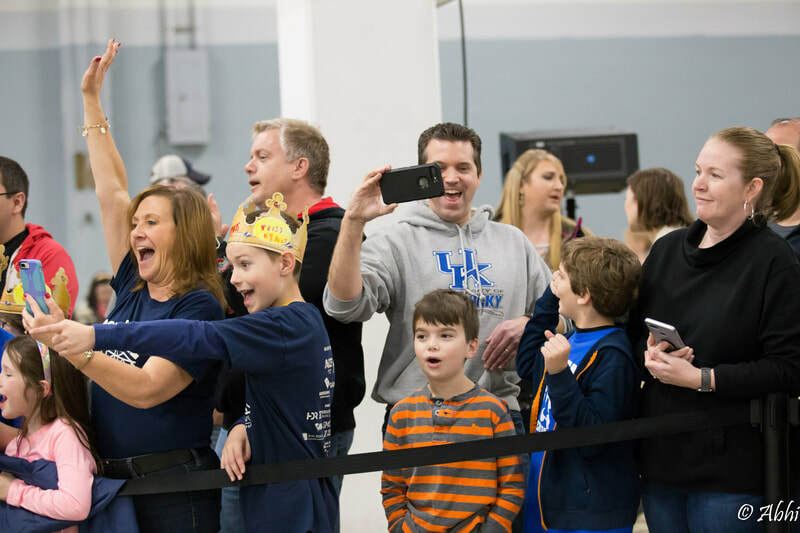 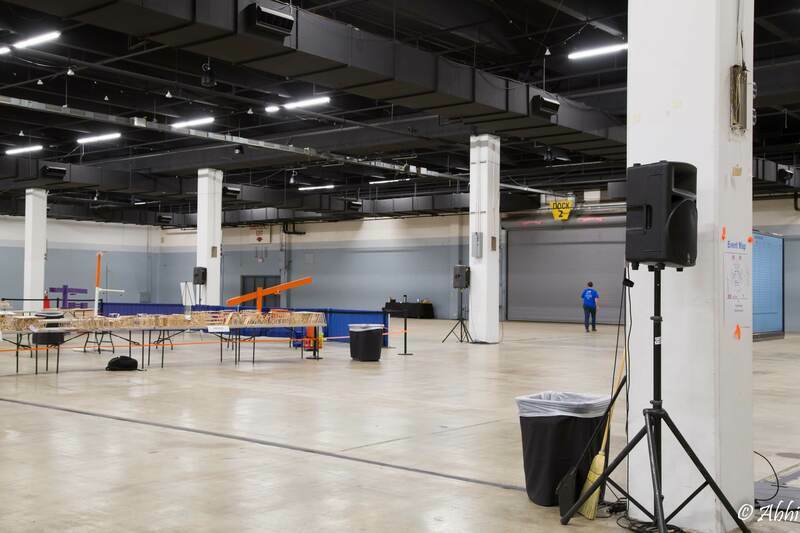 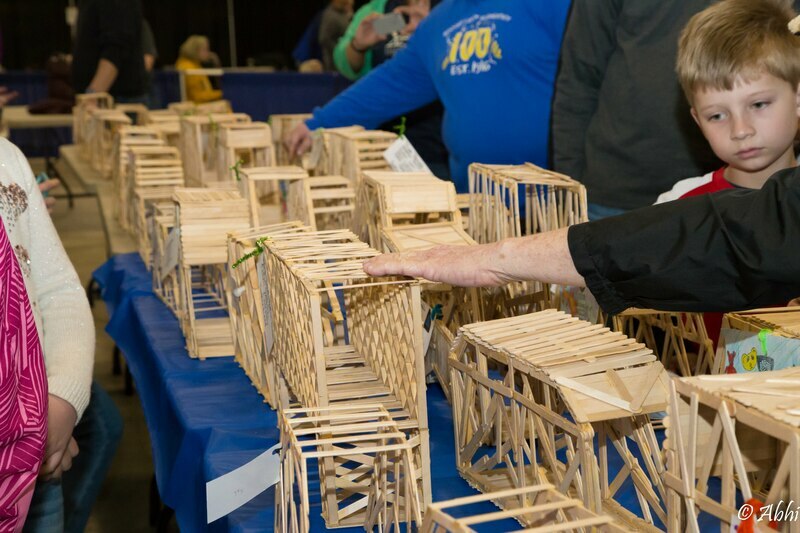 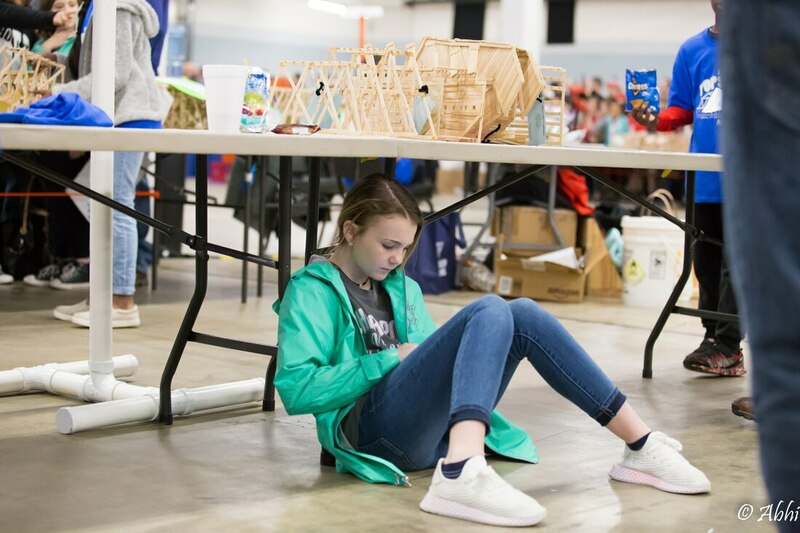 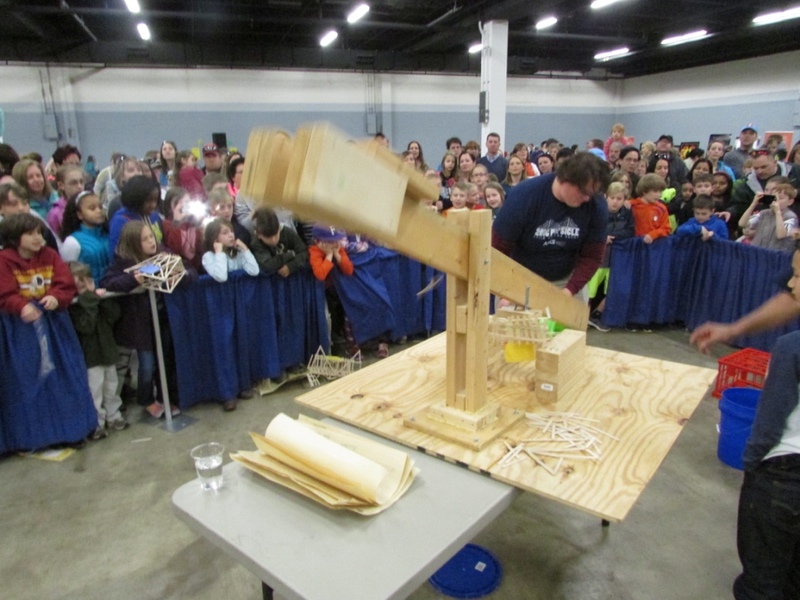 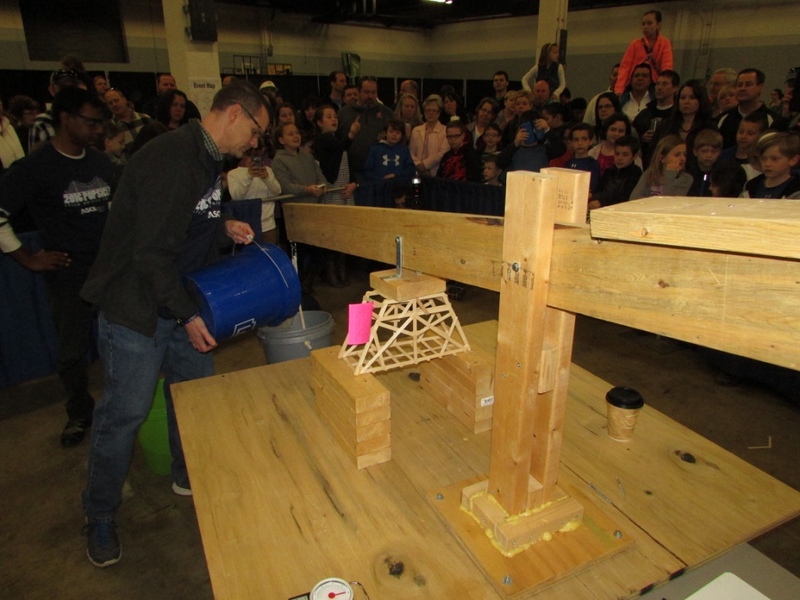 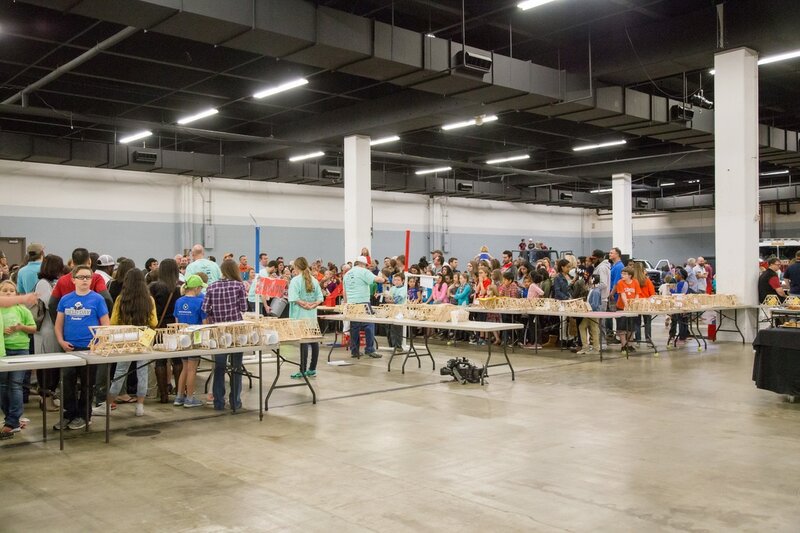 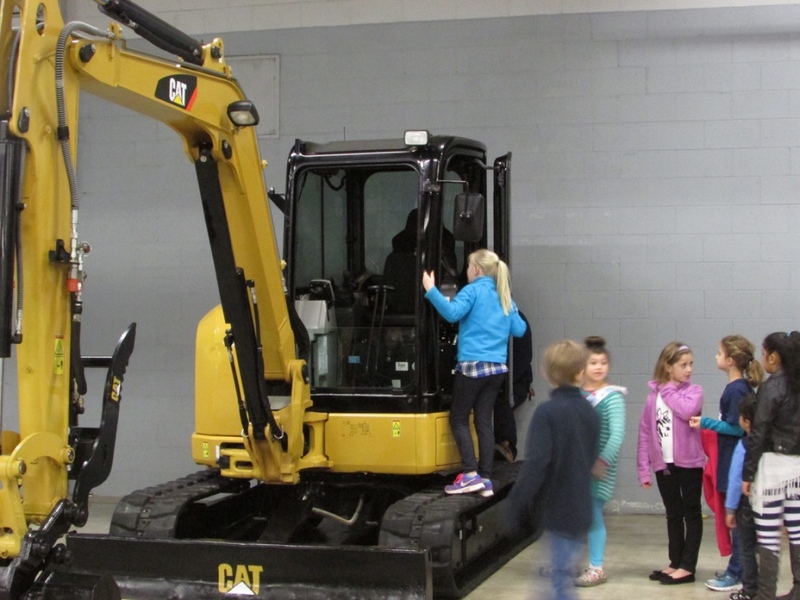 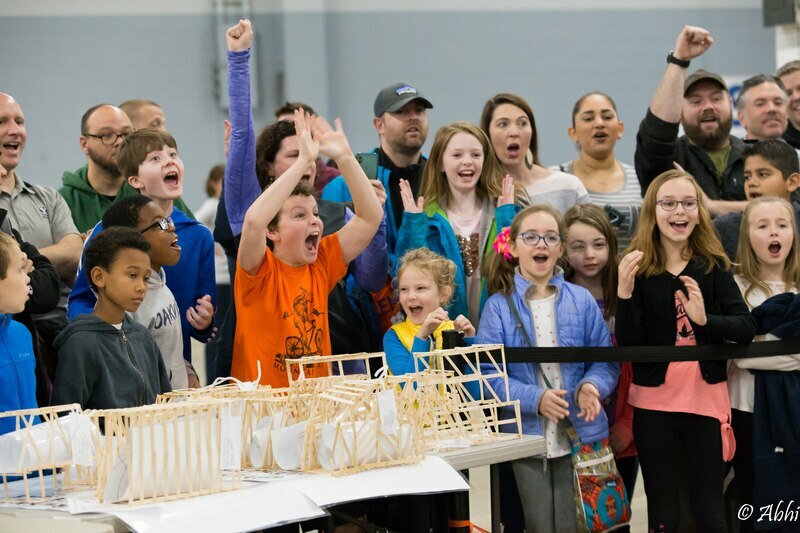 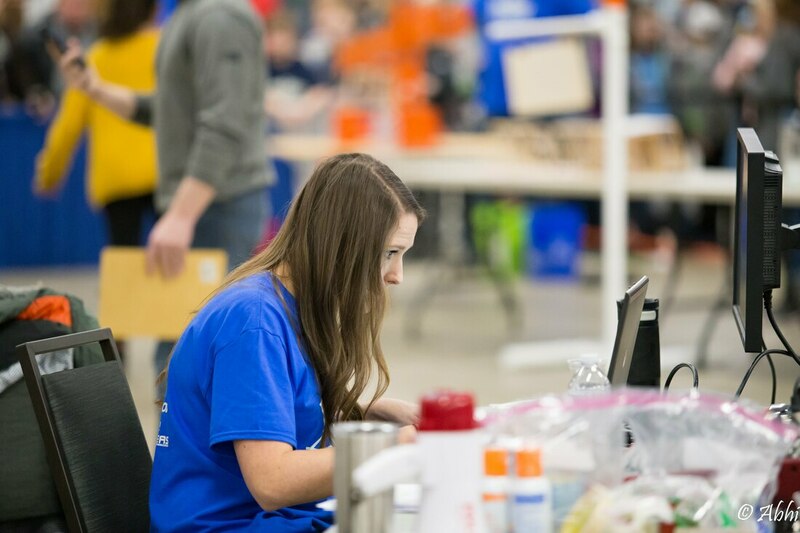 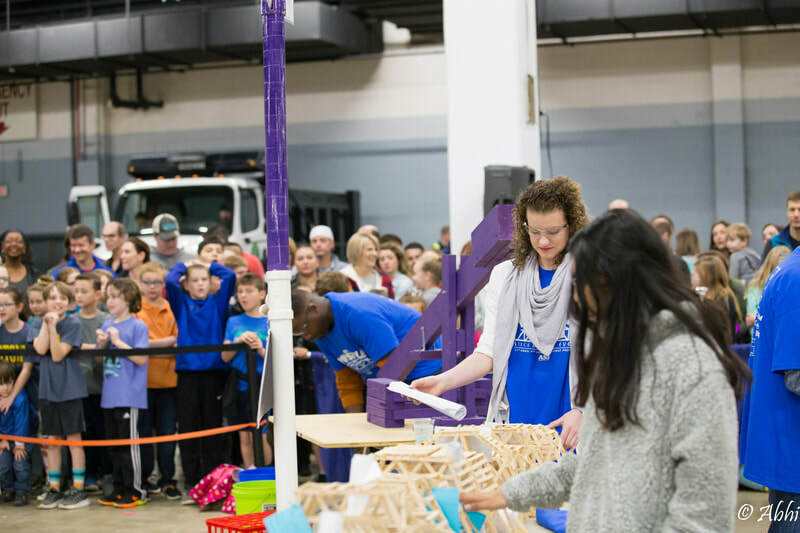 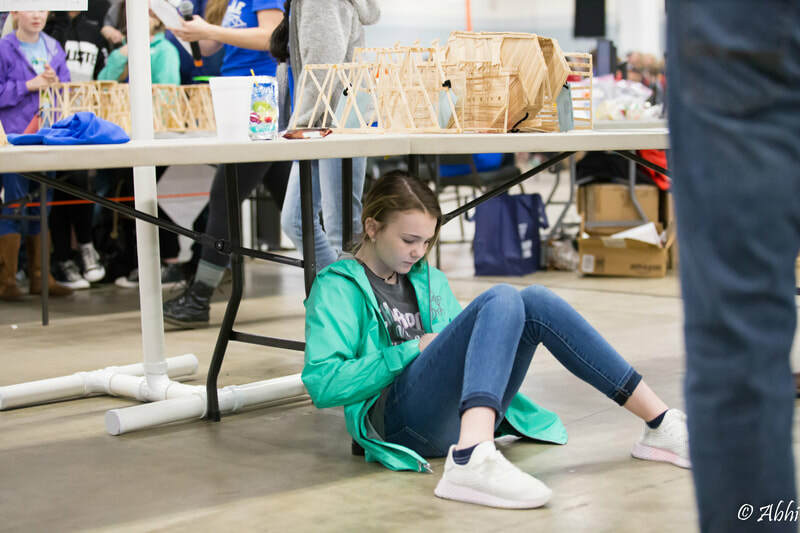 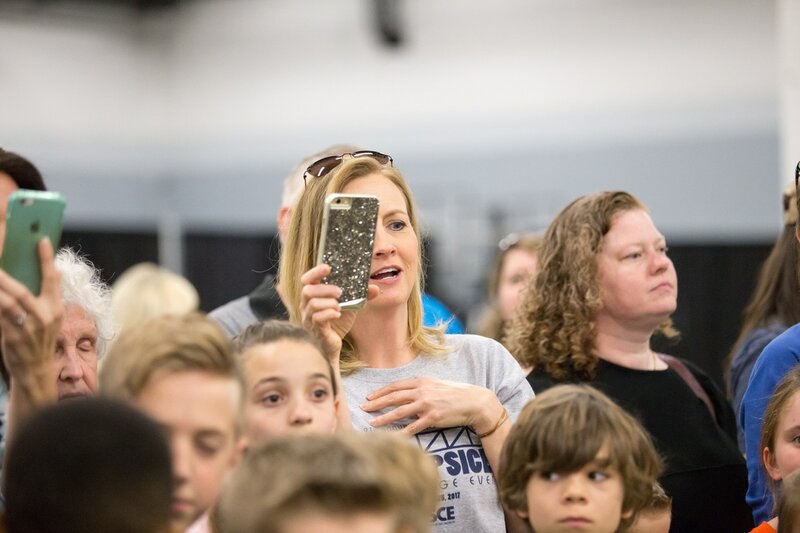 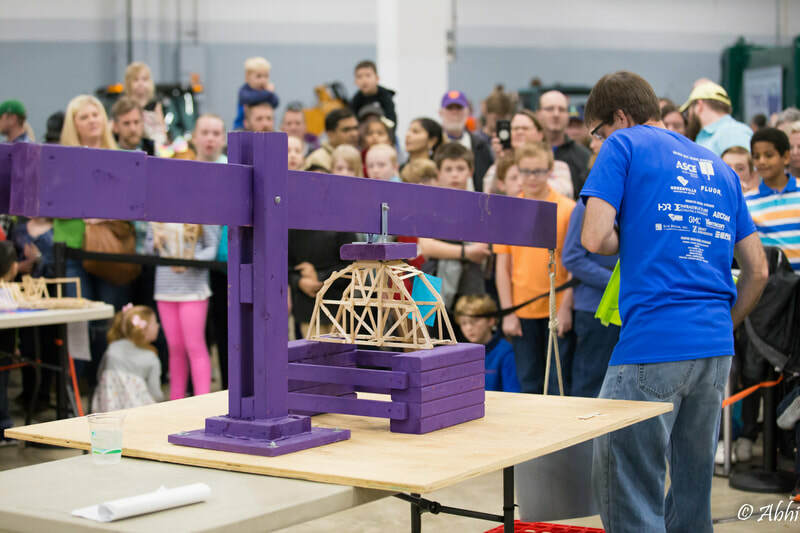 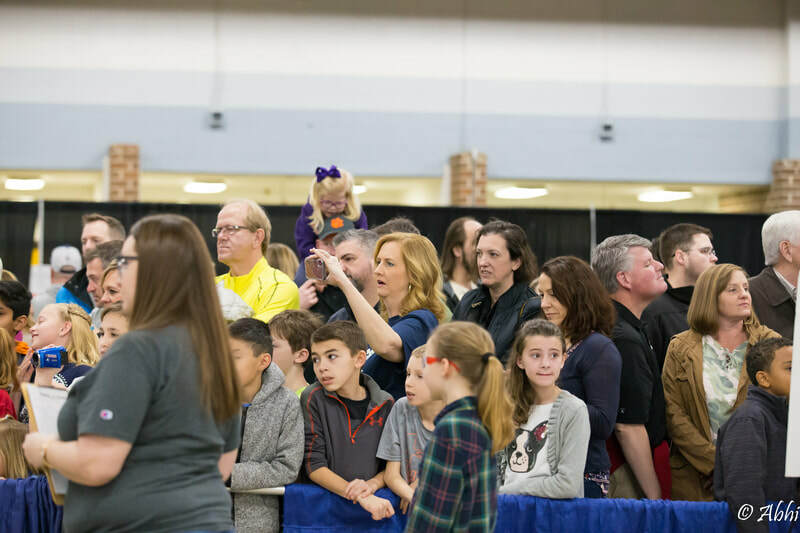 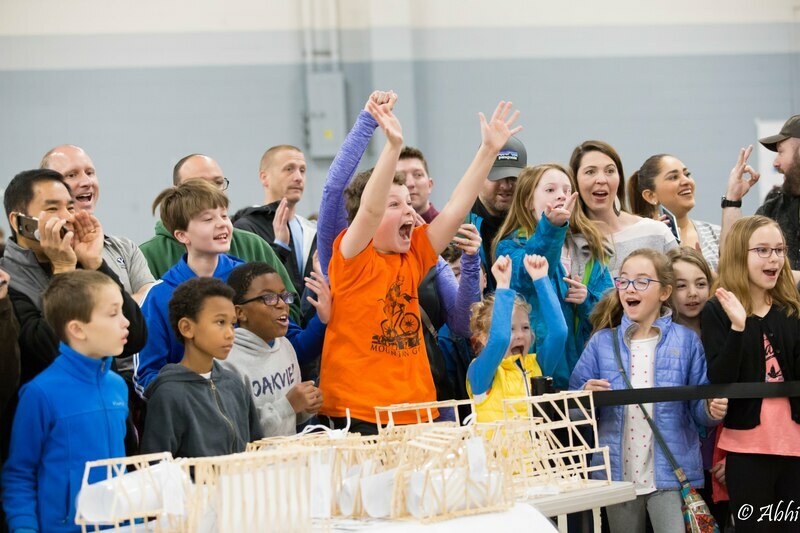 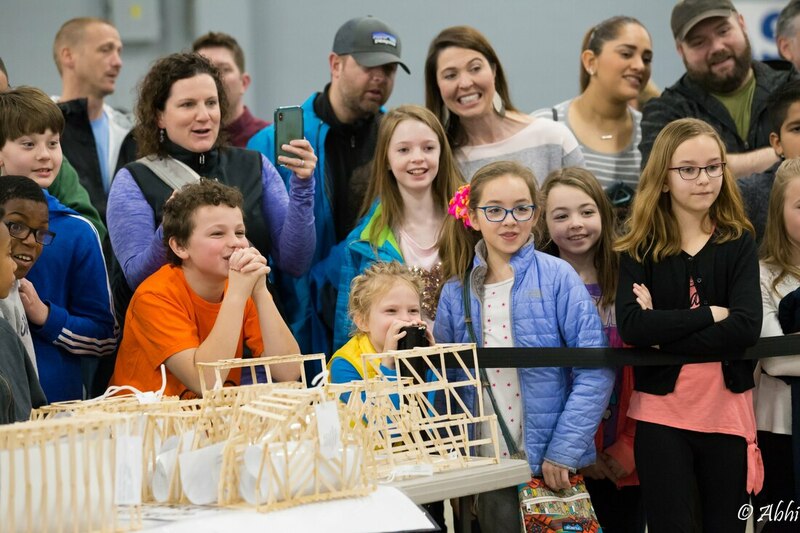 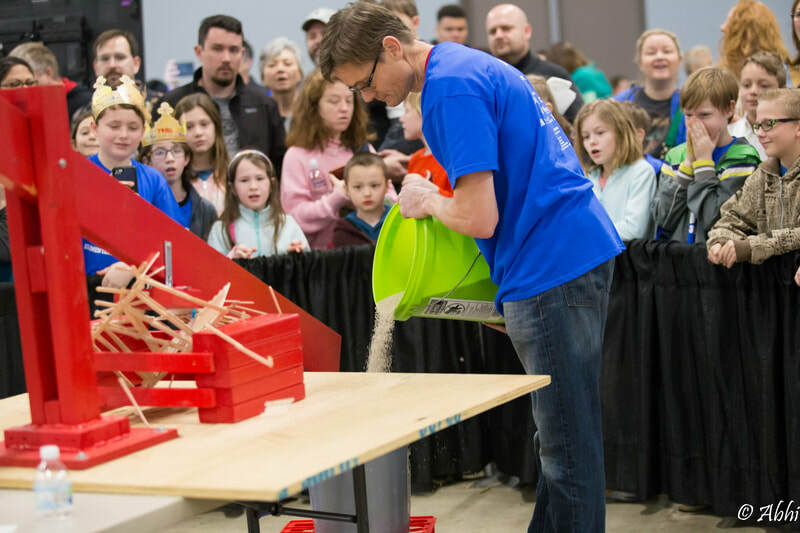 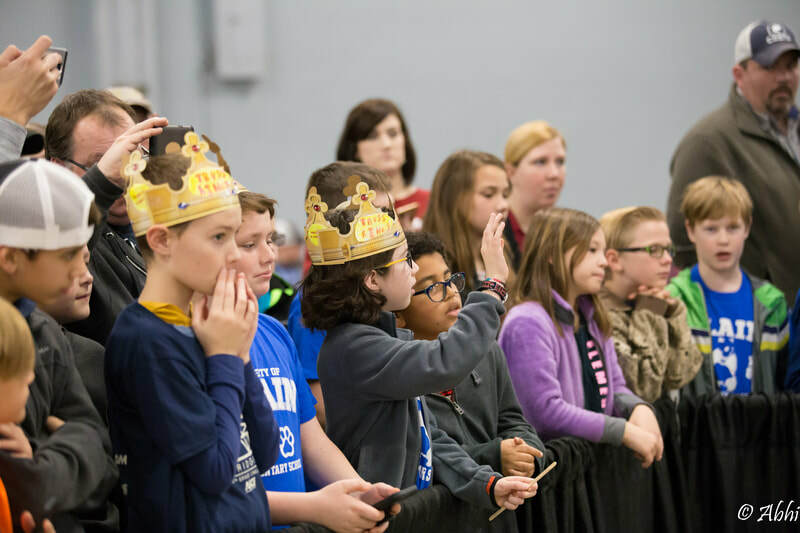 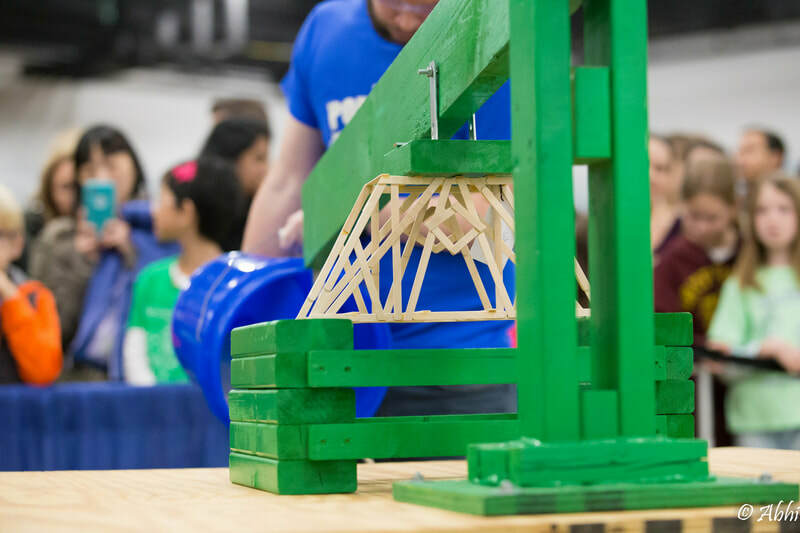 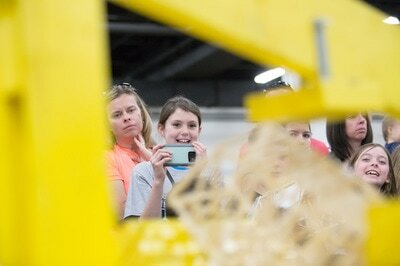 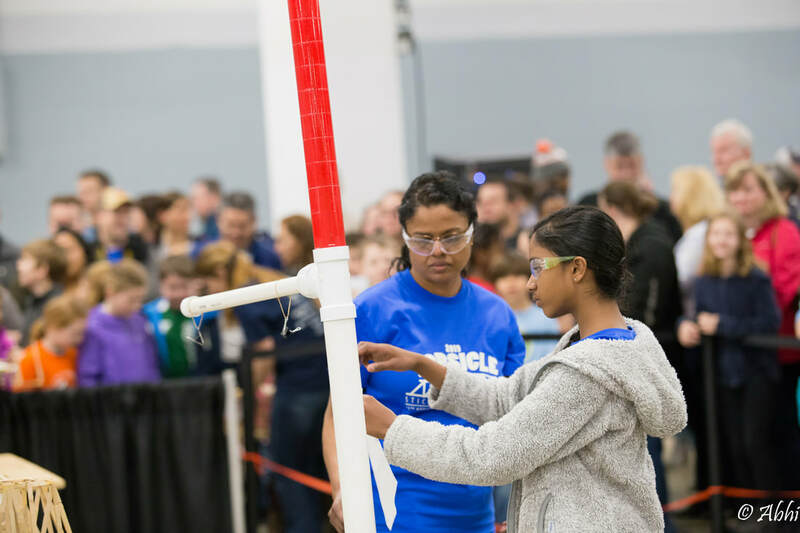 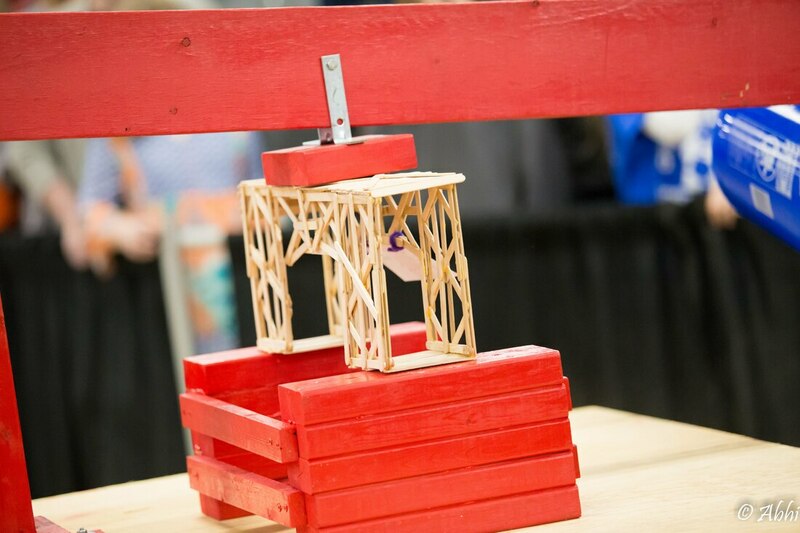 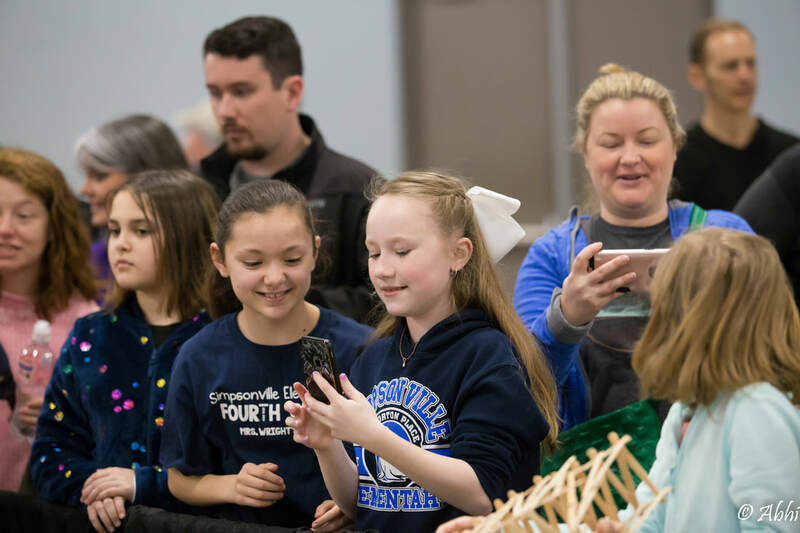 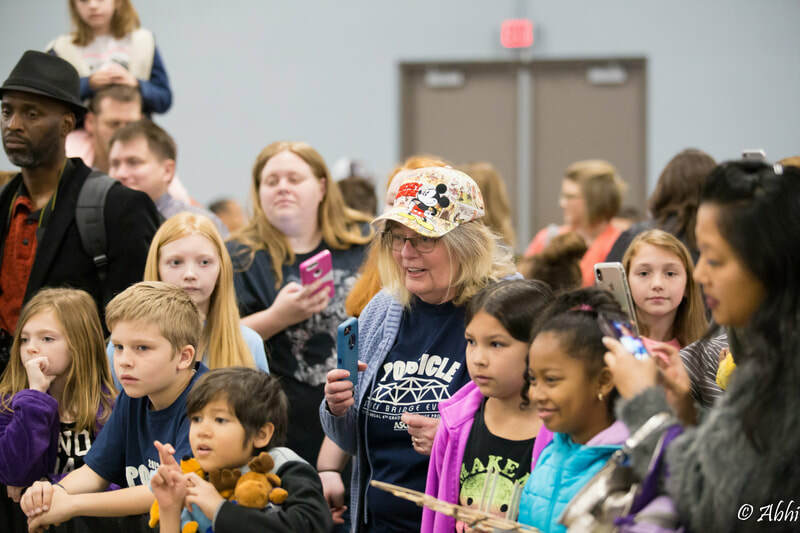 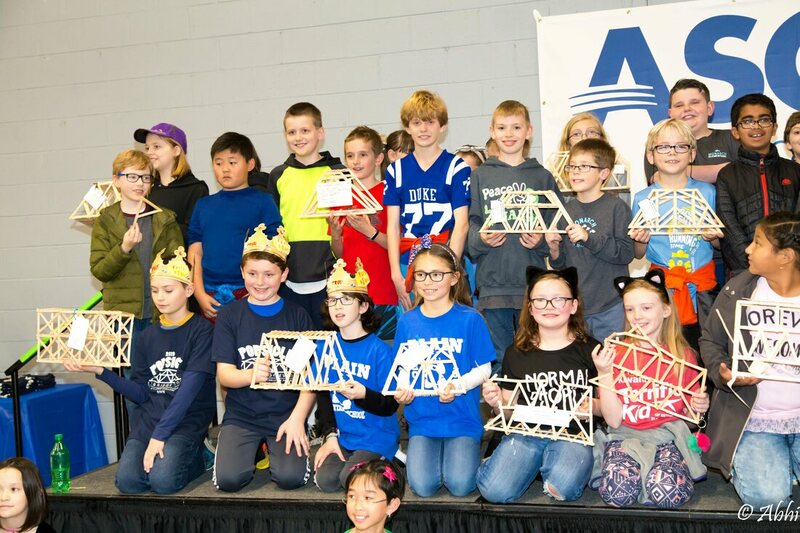 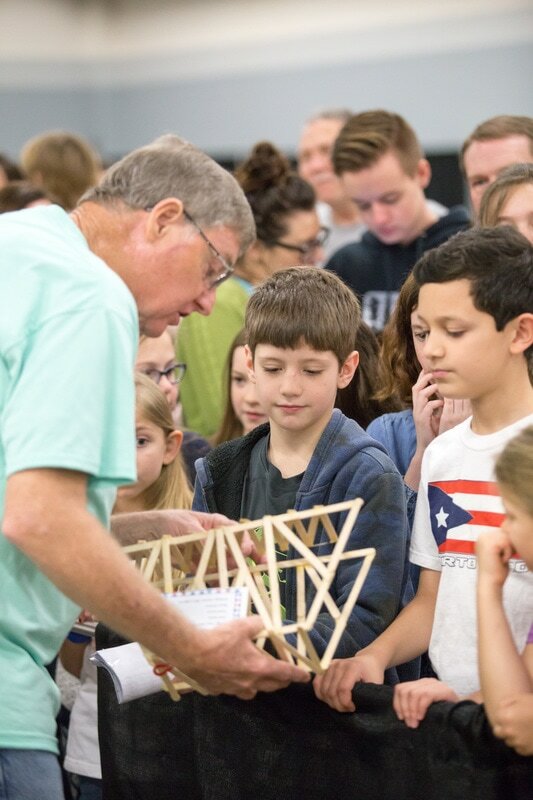 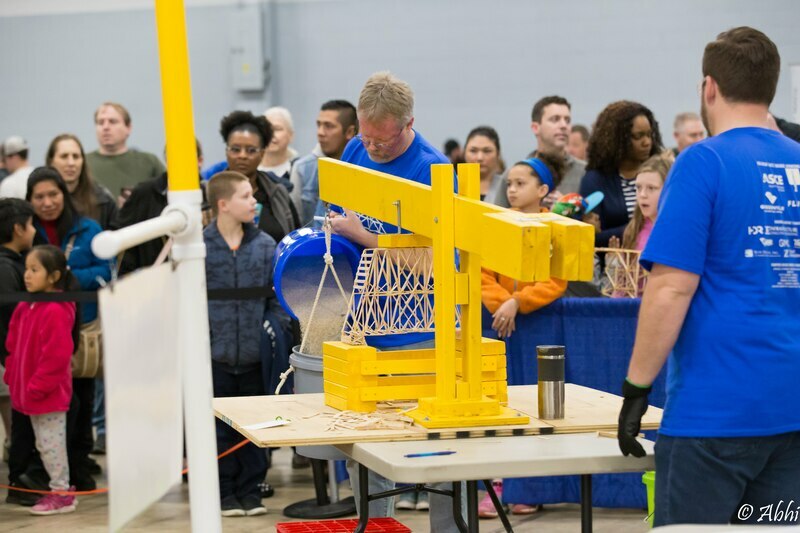 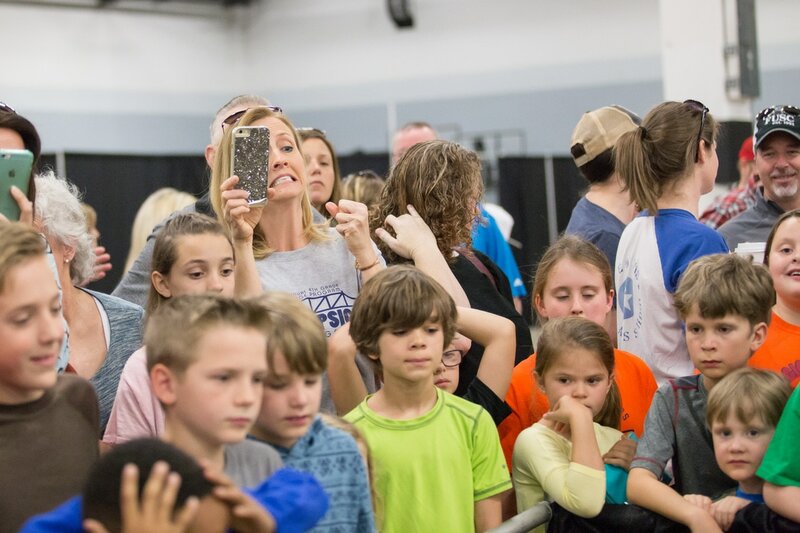 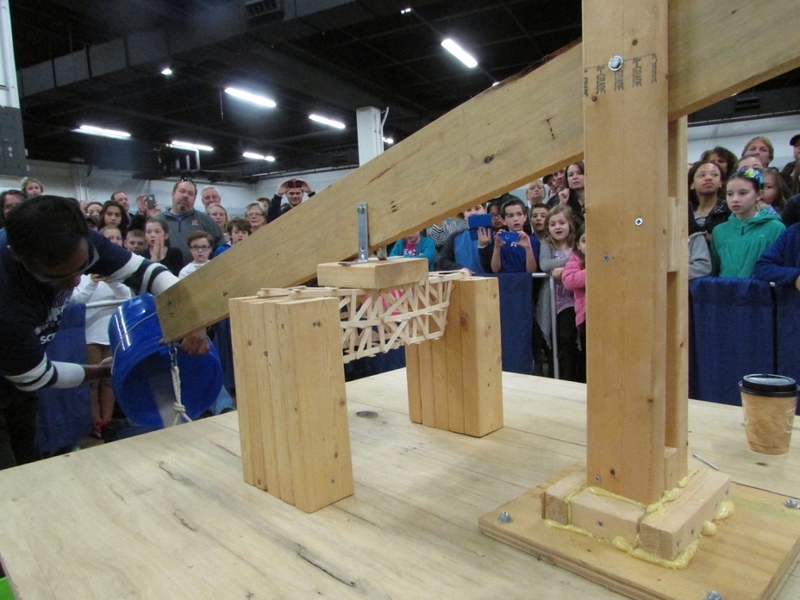 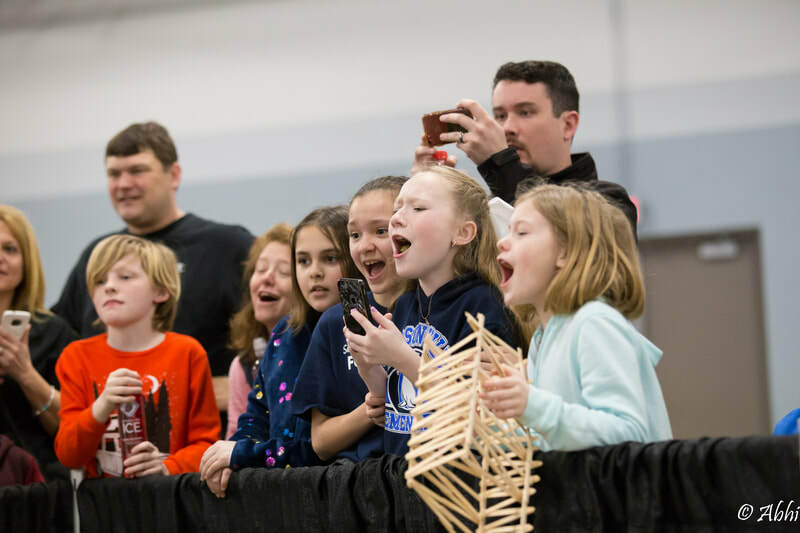 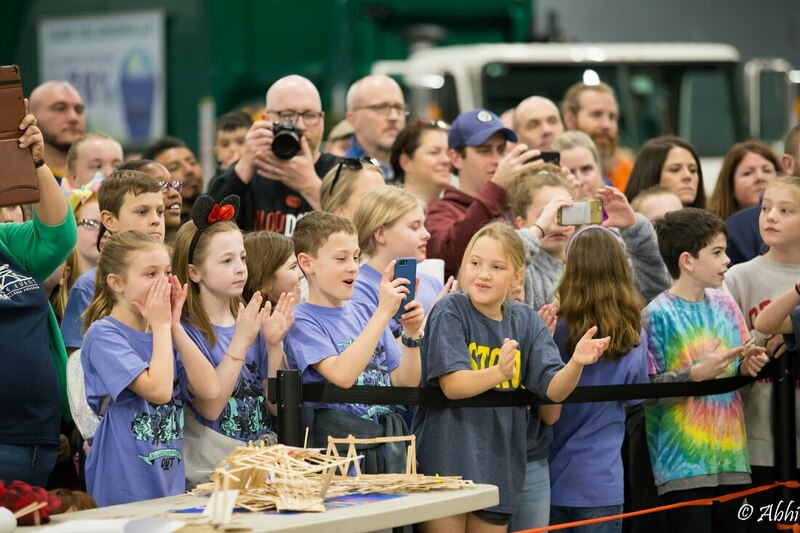 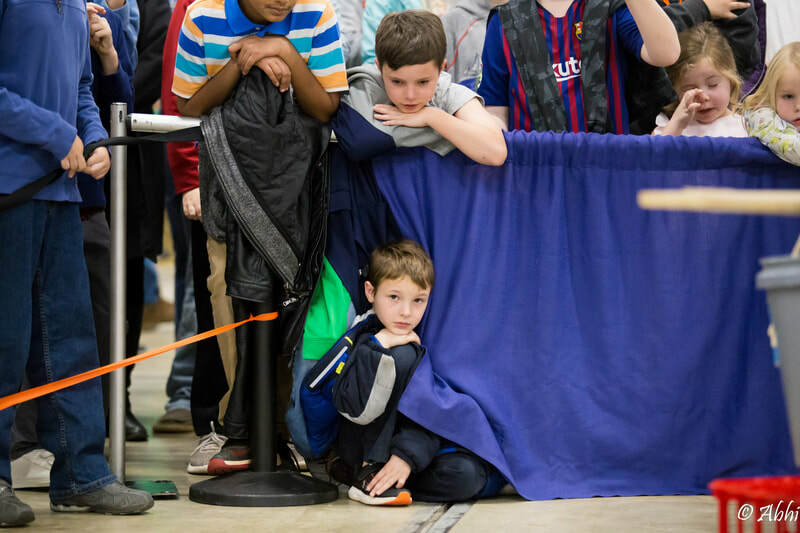 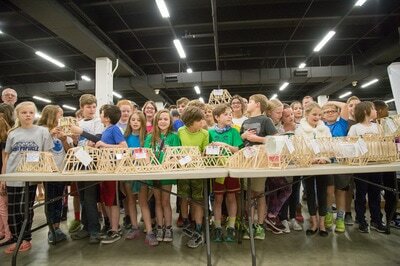 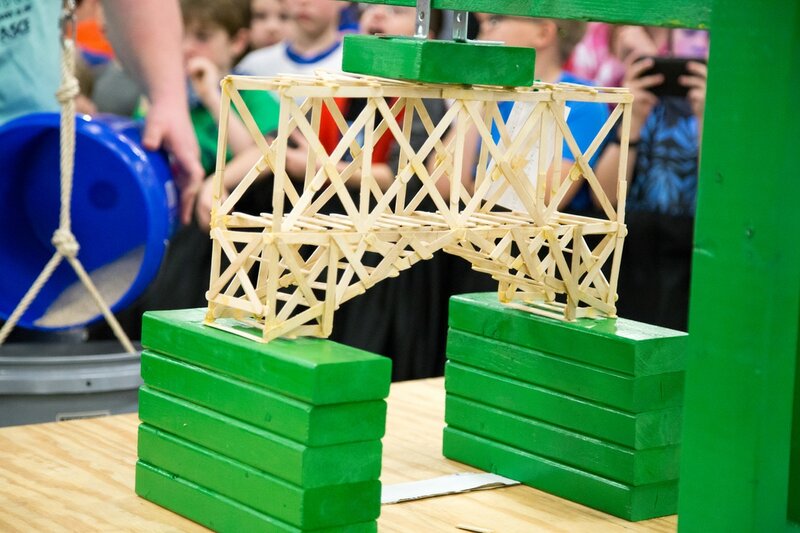 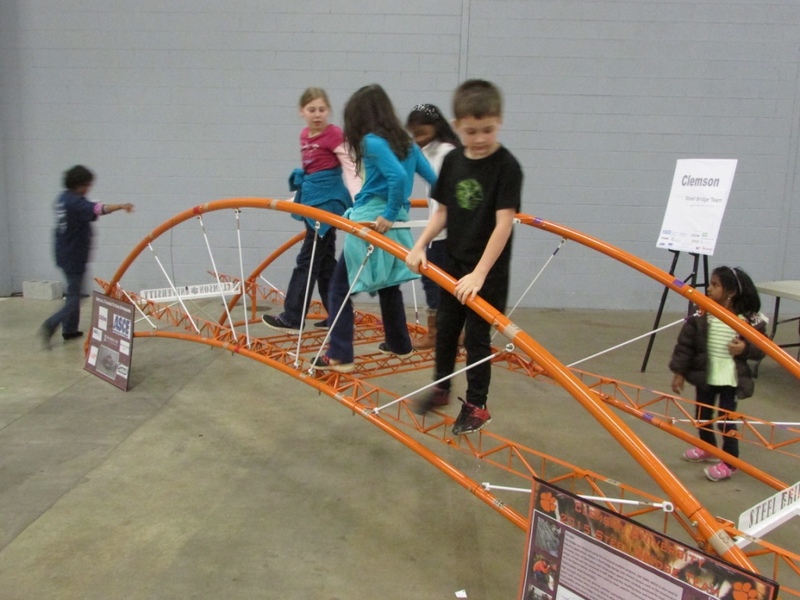 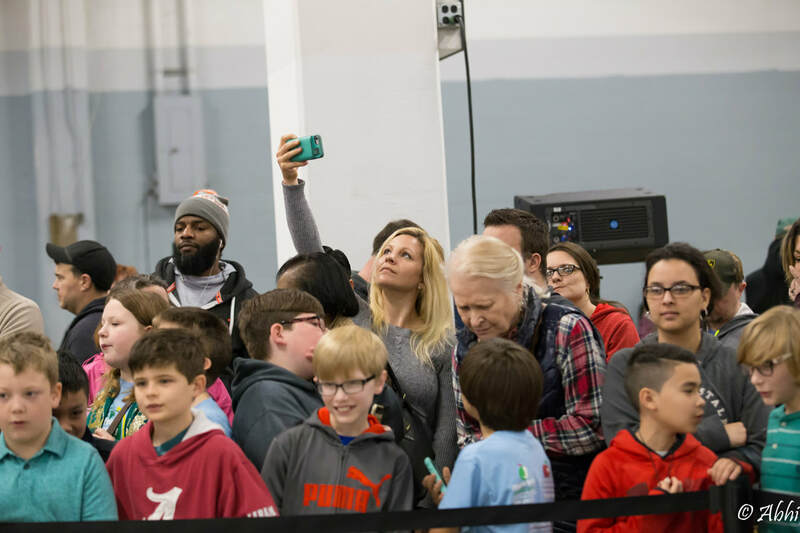 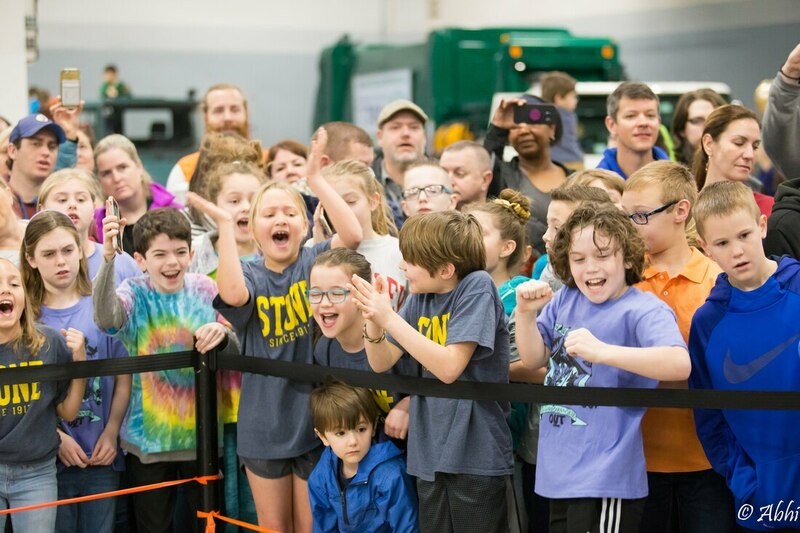 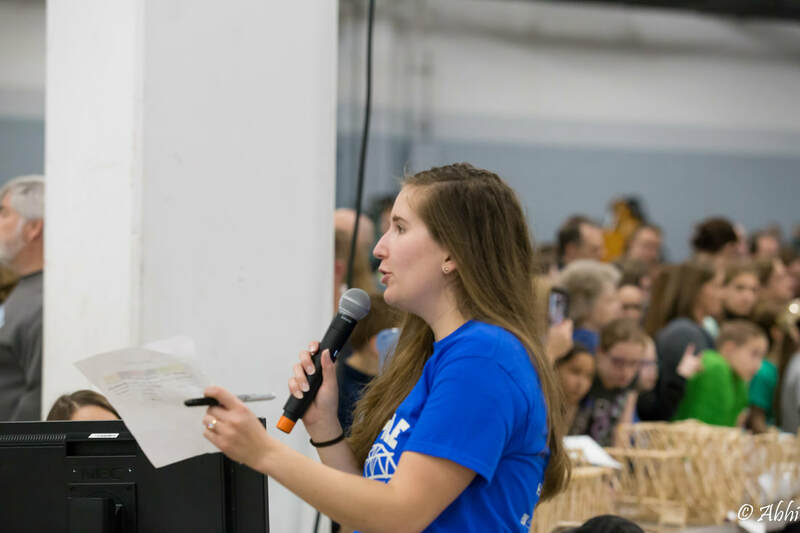 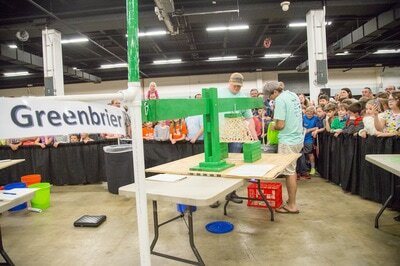 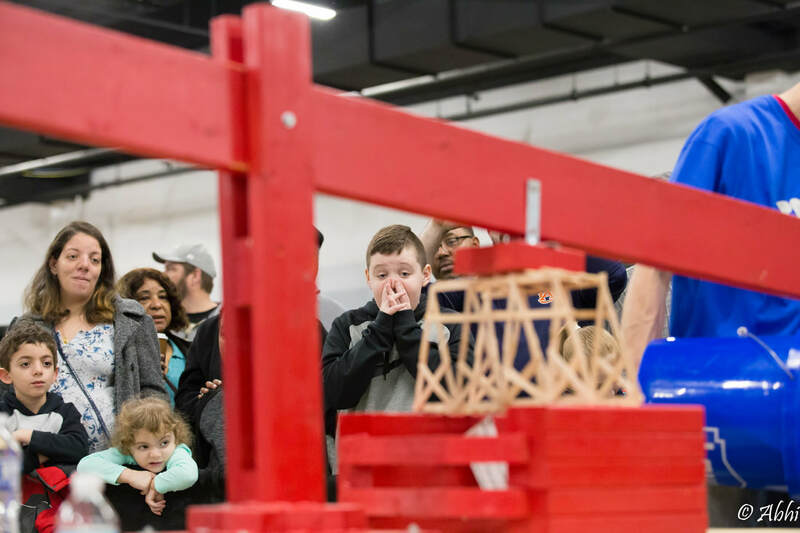 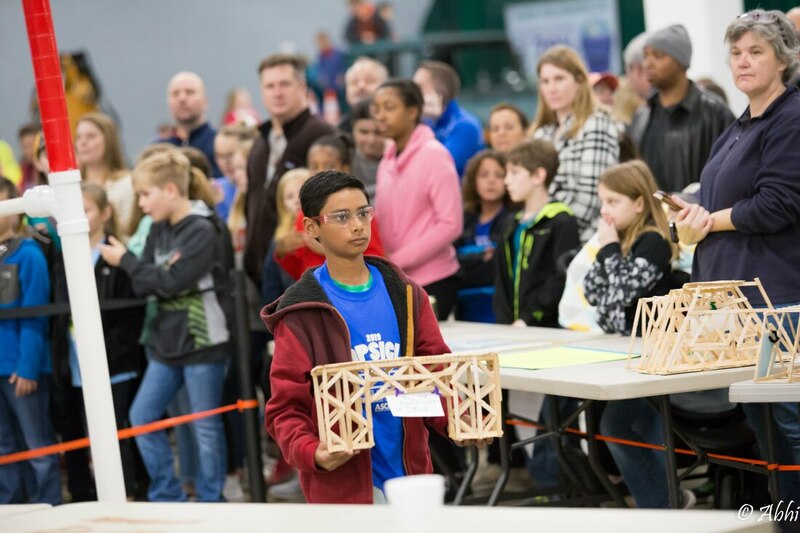 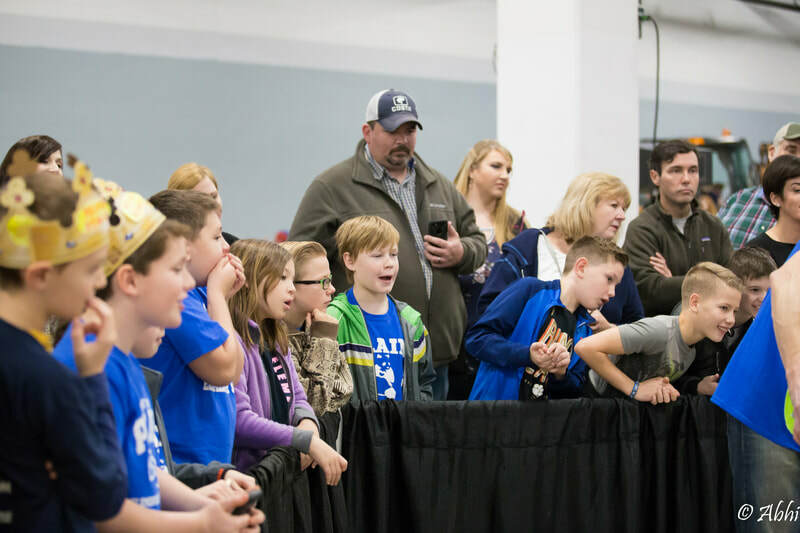 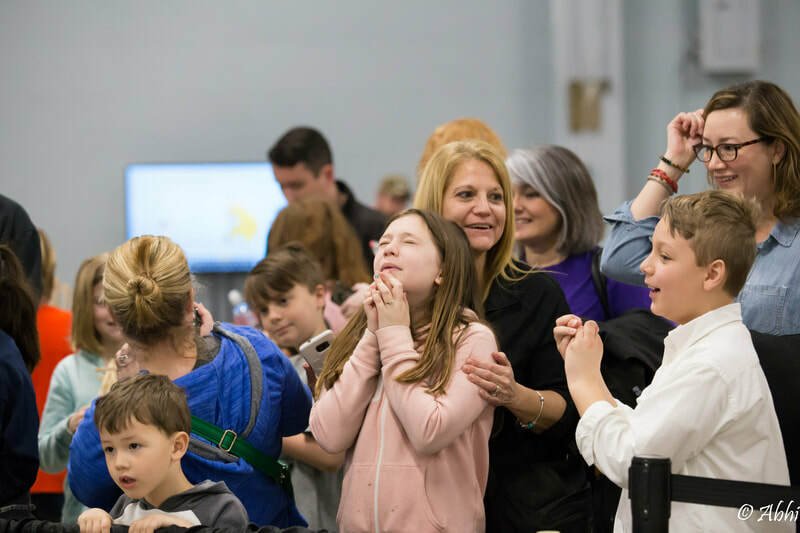 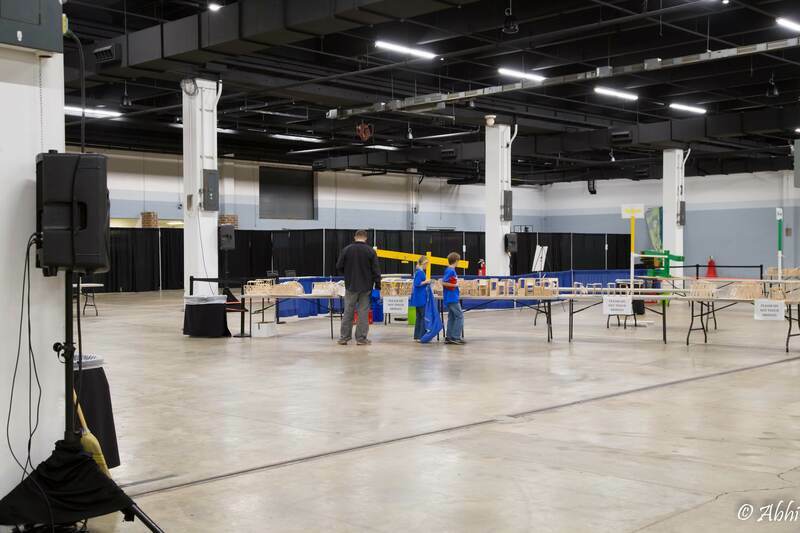 The 2018 event tested over 350 bridges from more than 1,200 students. 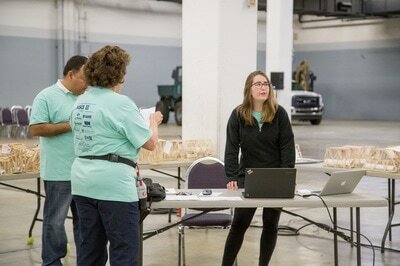 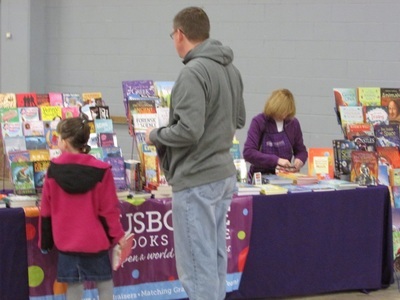 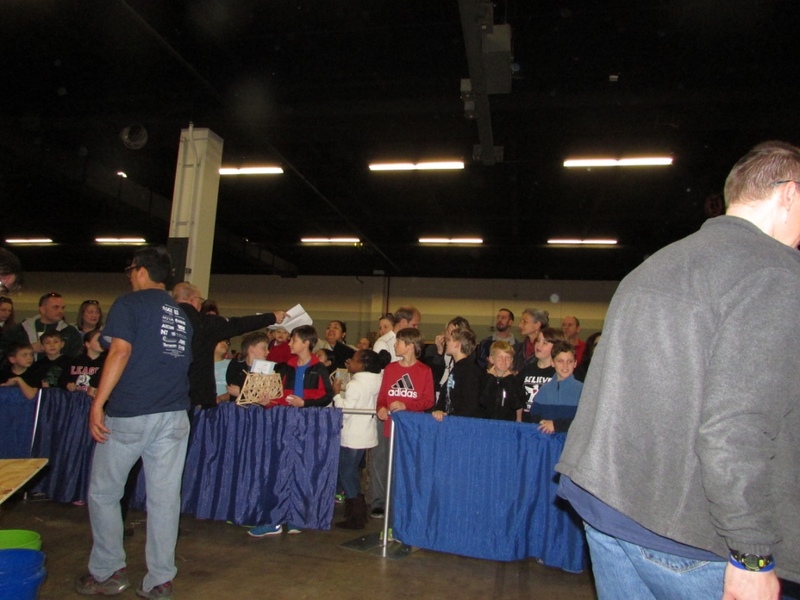 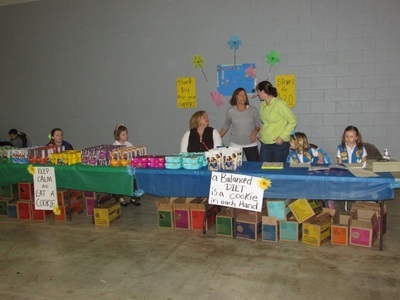 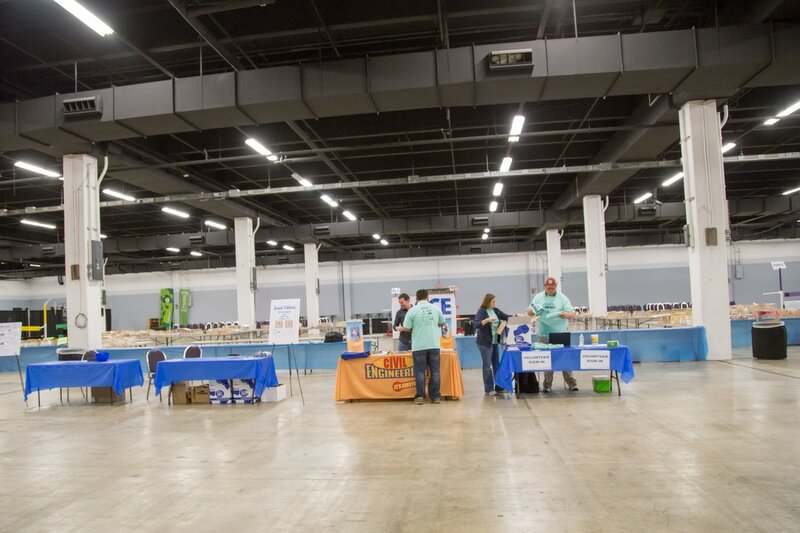 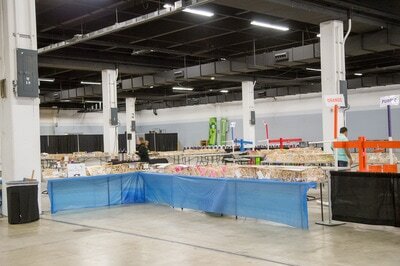 Many volunteers are needed in order for our event to be successful each year. Anyone interested in volunteering on event day or the afternoon before, please contact Diane Jlelaty or sign up here. 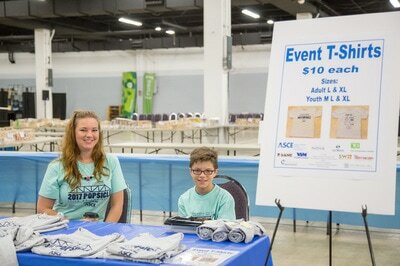 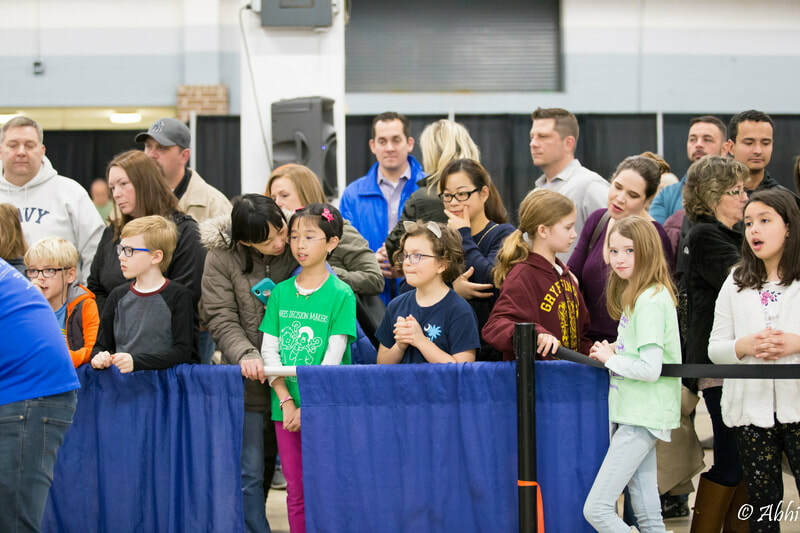 We need event greeters, raffle ticket sellers, bridge testers, and other volunteers to help make this event a success. 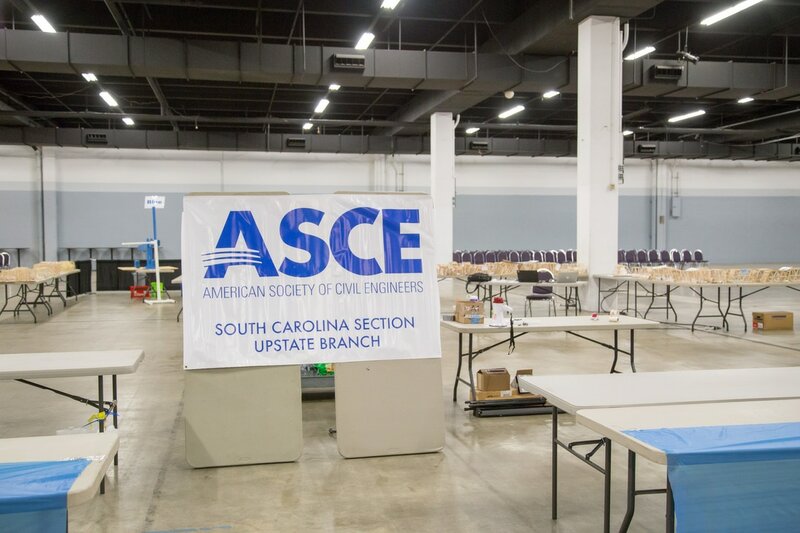 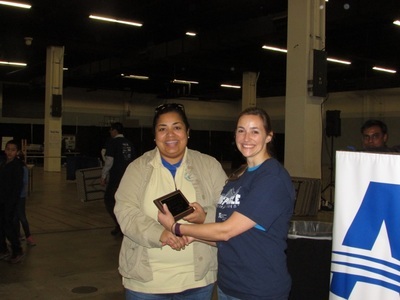 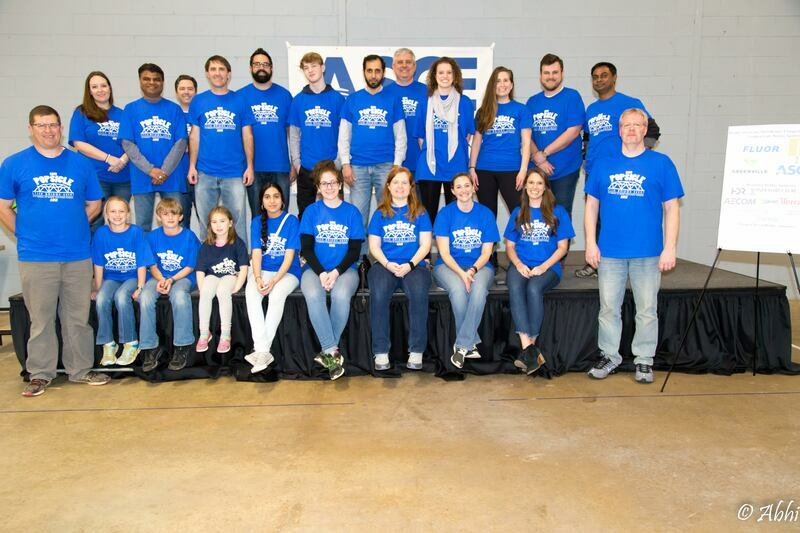 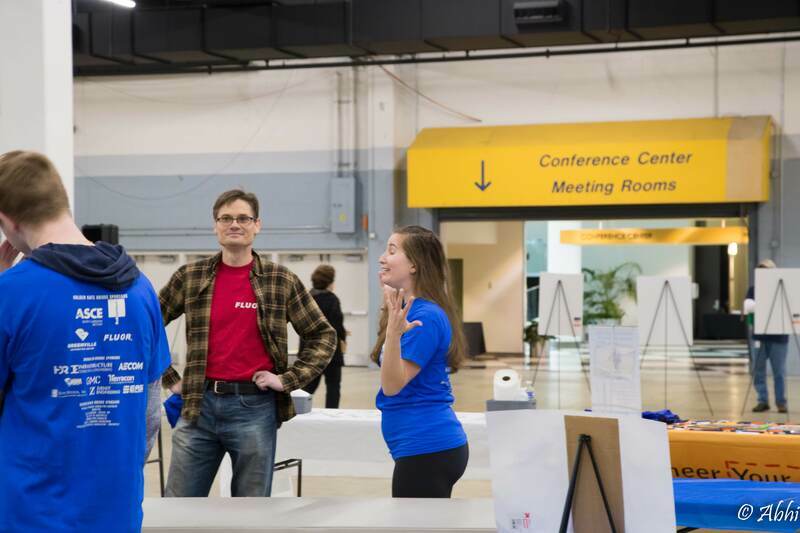 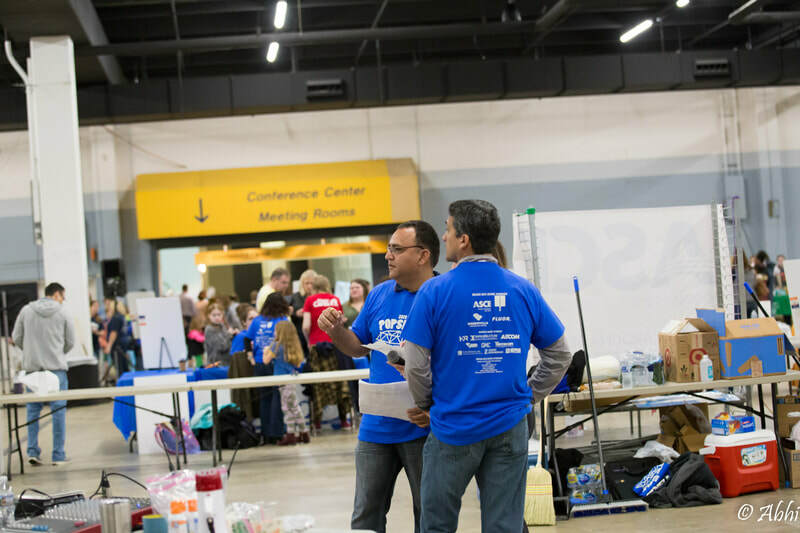 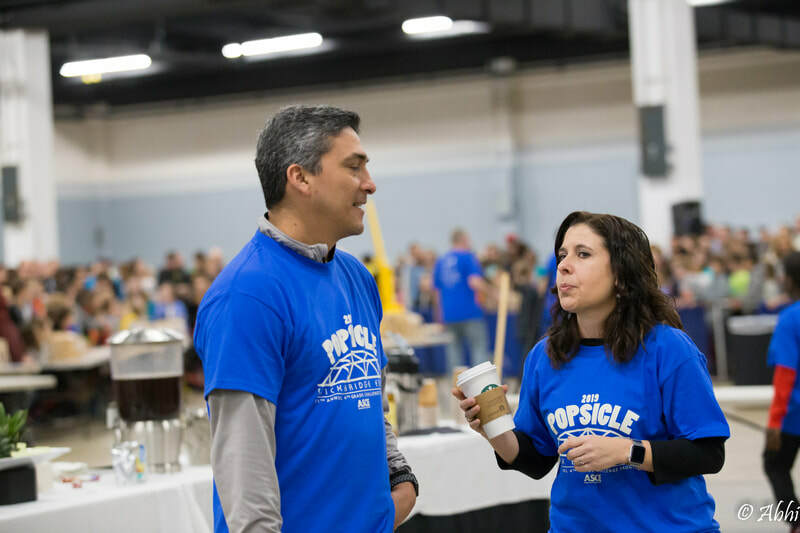 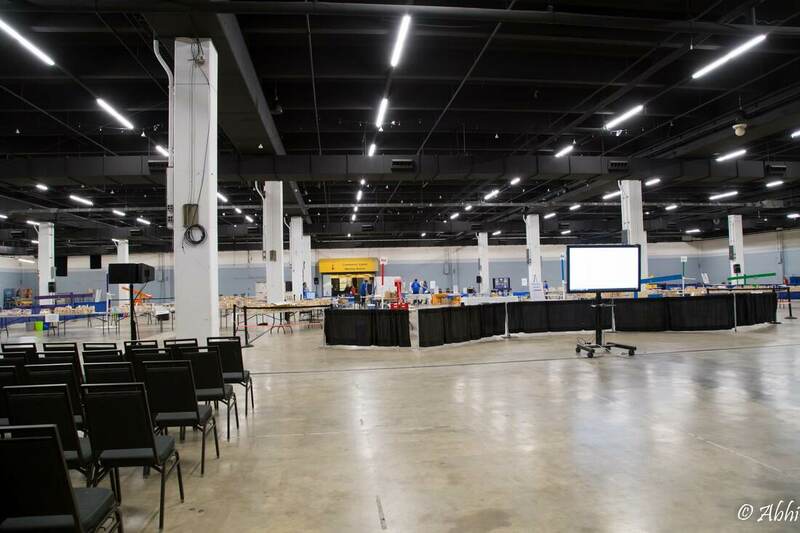 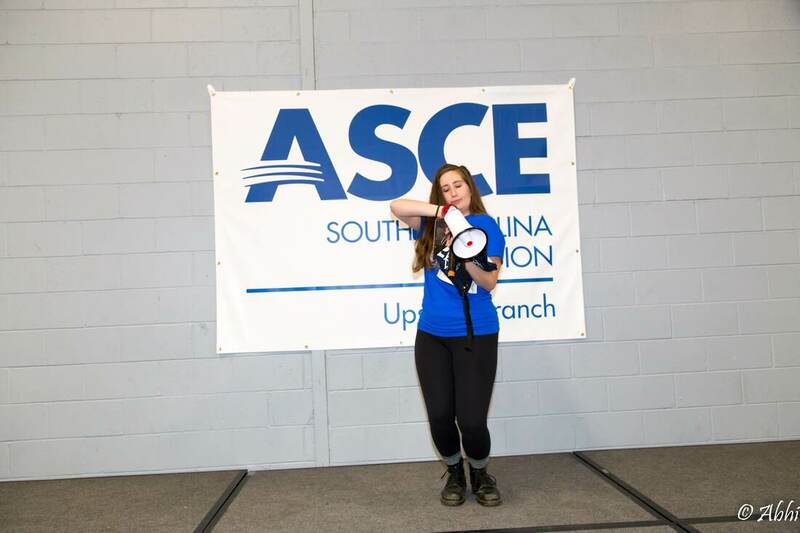 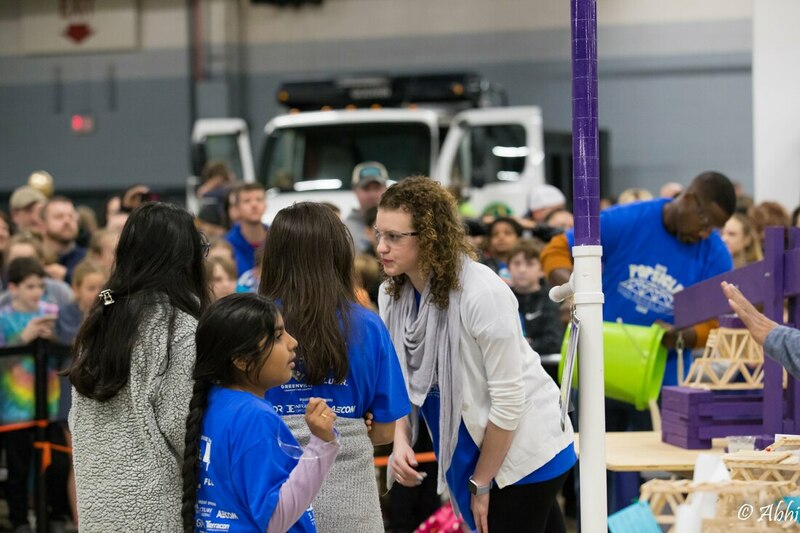 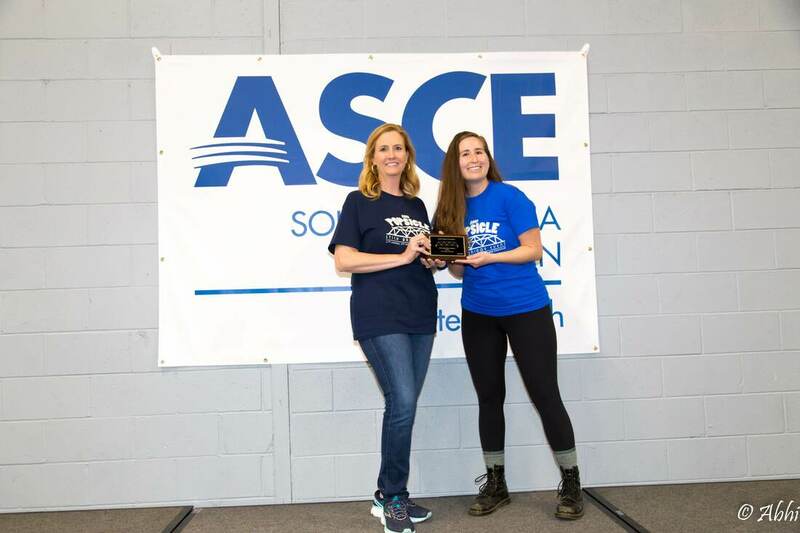 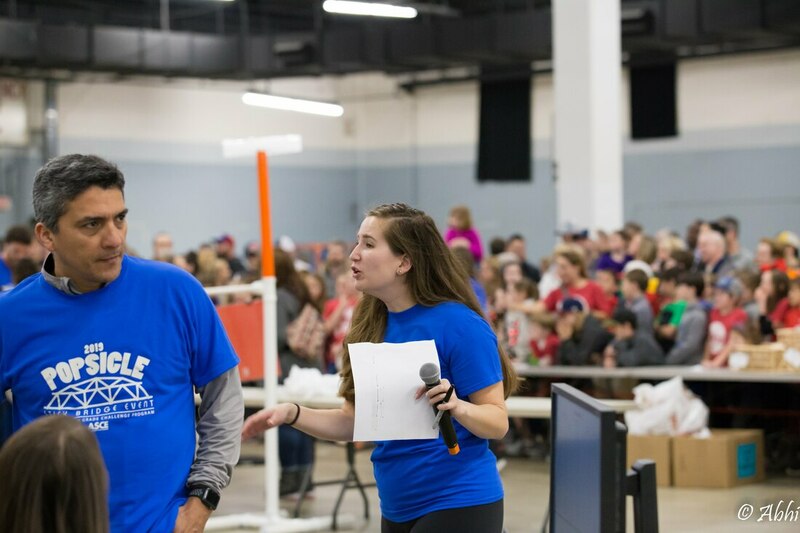 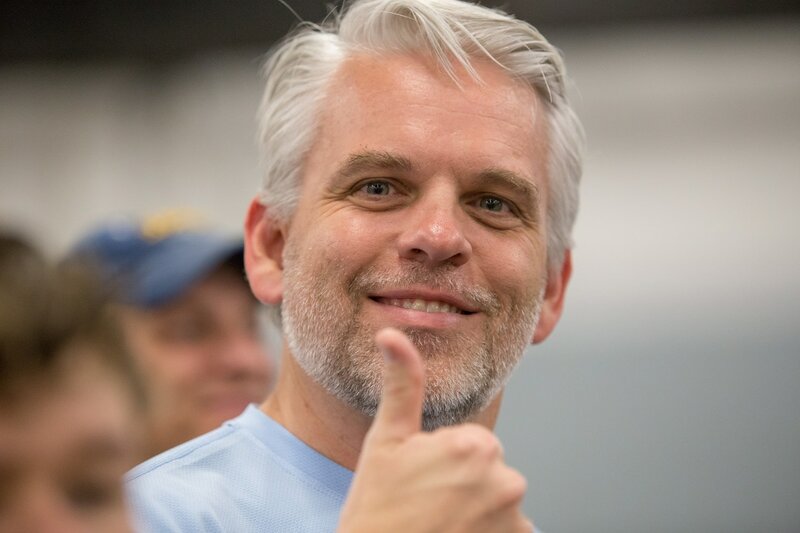 We strongly encourage engineering students and professionals to volunteer, however volunteers do not need to be ASCE members or engineers to help out. 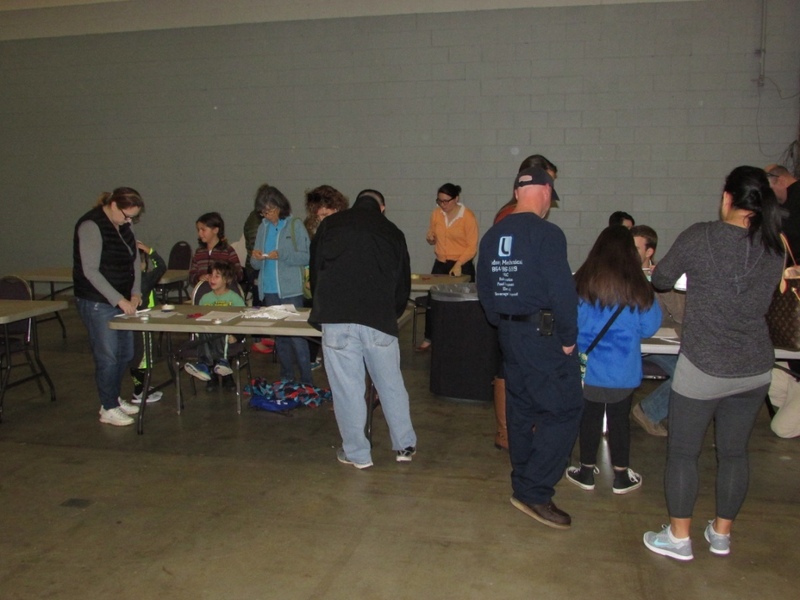 Volunteers will receive event t-shirts, breakfast and lunch following the event. 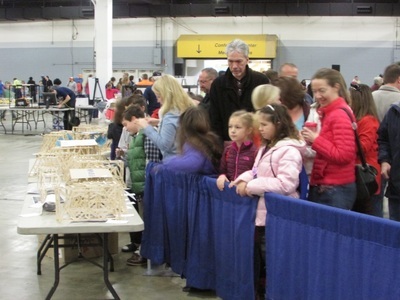 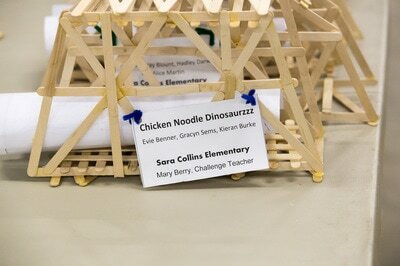 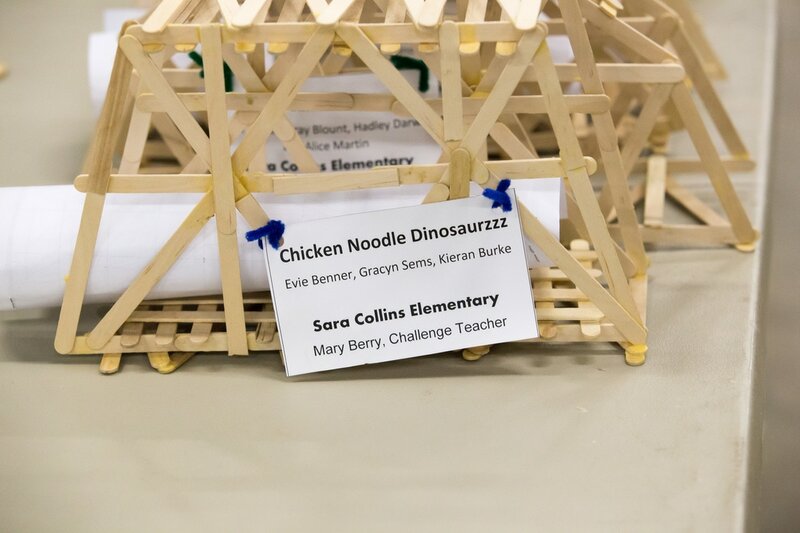 The ASCE SC Upstate Branch is also inviting companies to register as a sponsor for the Annual Popsicle Stick Bridge Event. 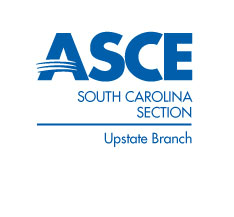 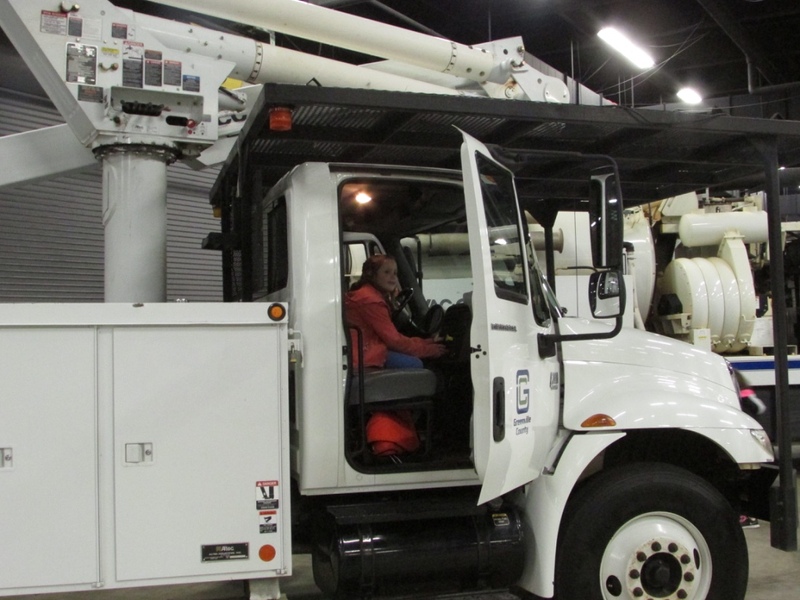 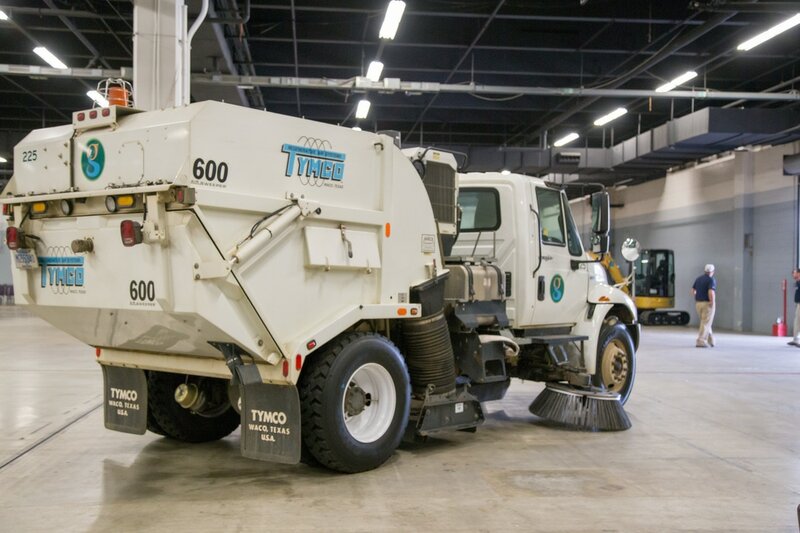 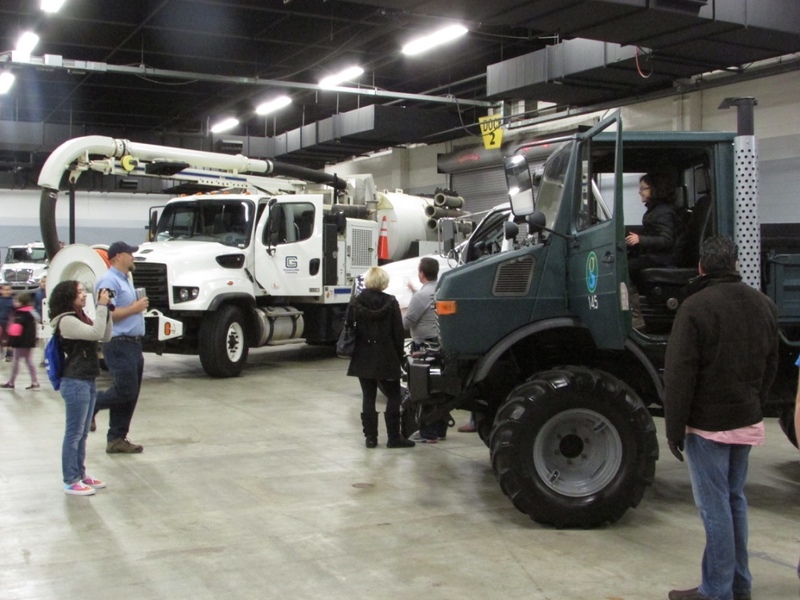 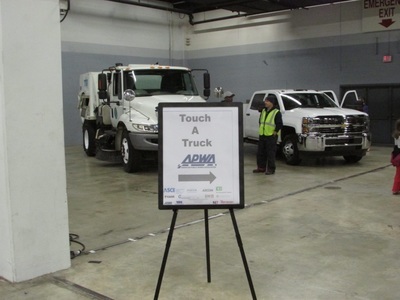 The company name / logo will appear on signage in exhibit areas, volunteer t-shirts, event flyers, and announced during the ASCE Upstate Branch Meetings. Sponsorship forms can be requested via email or a copy is located on this page above our current sponsors. 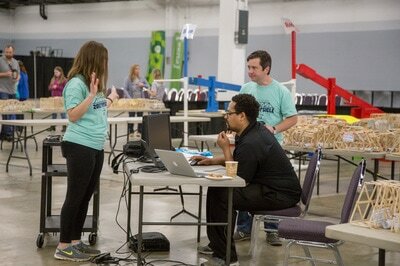 Once the completed registration form is received, the contact for the sponsorship will receive additional instructions. 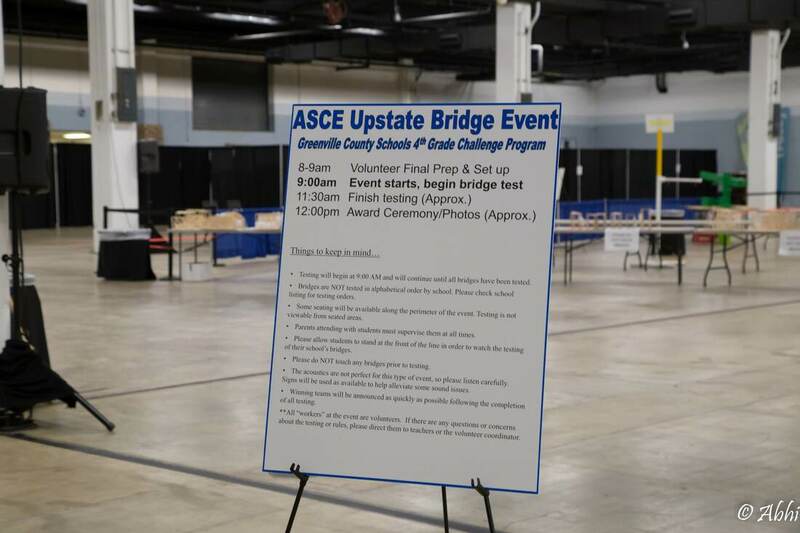 Testing will begin at 9:00 AM and will continue until all bridges have been tested. 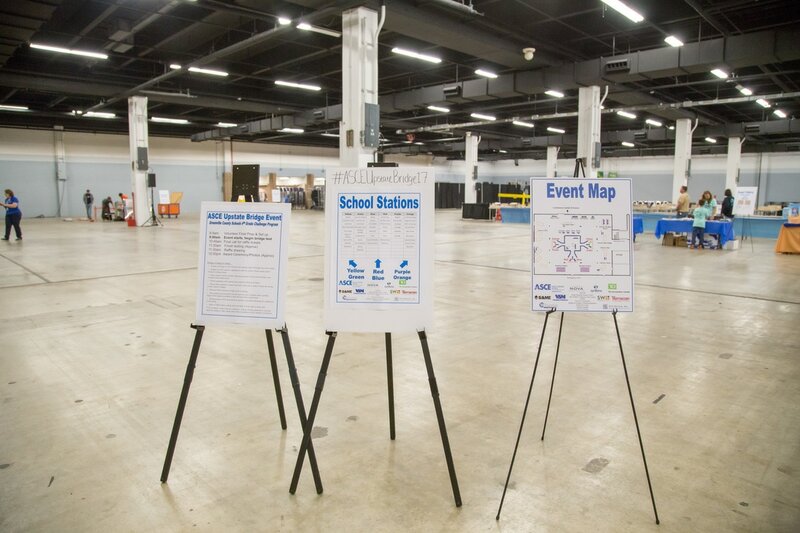 Please arrive early in order to locate your school testing station. 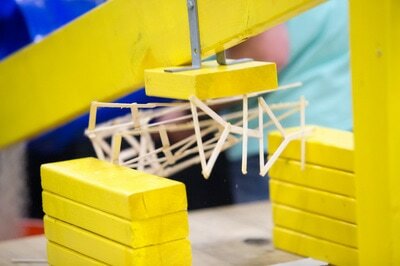 Bridges are NOT tested in alphabetical order by school. 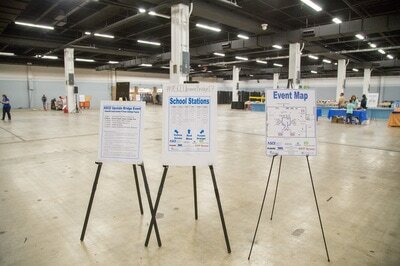 If possible, a listing of schools and testing locations will be sent out before the event. 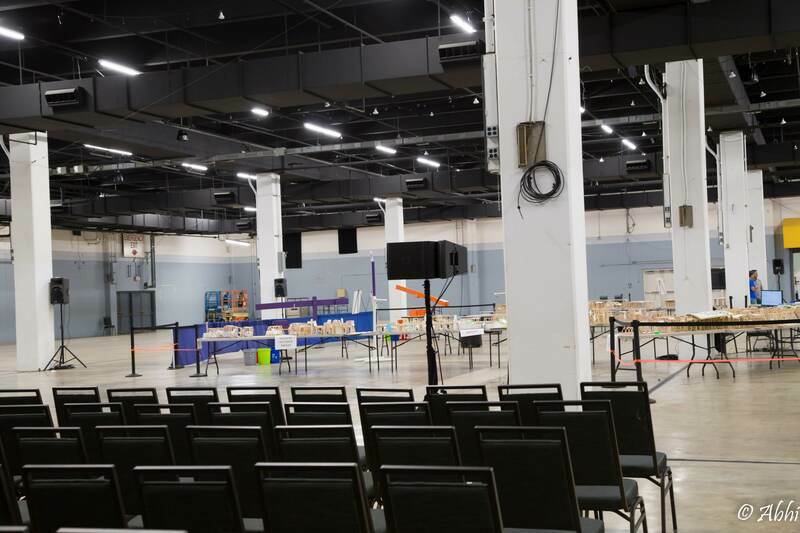 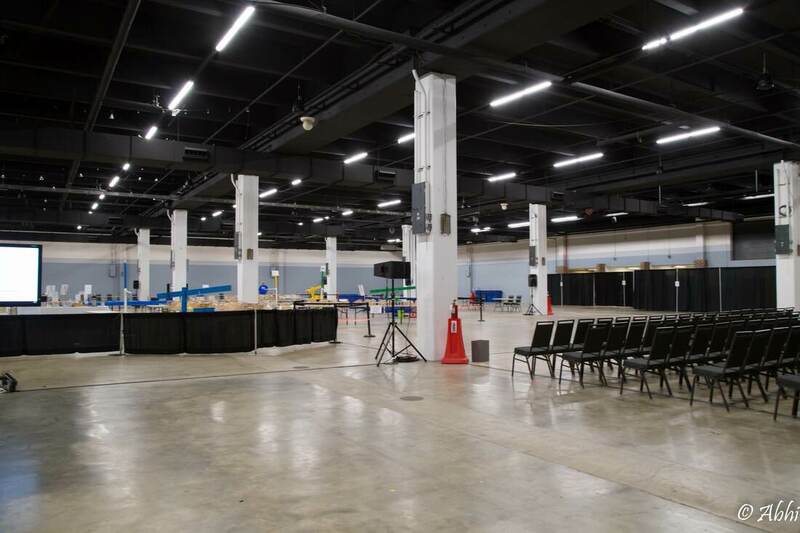 Some seating will be available along the perimeter of the event (testing is not viewable from seated areas). 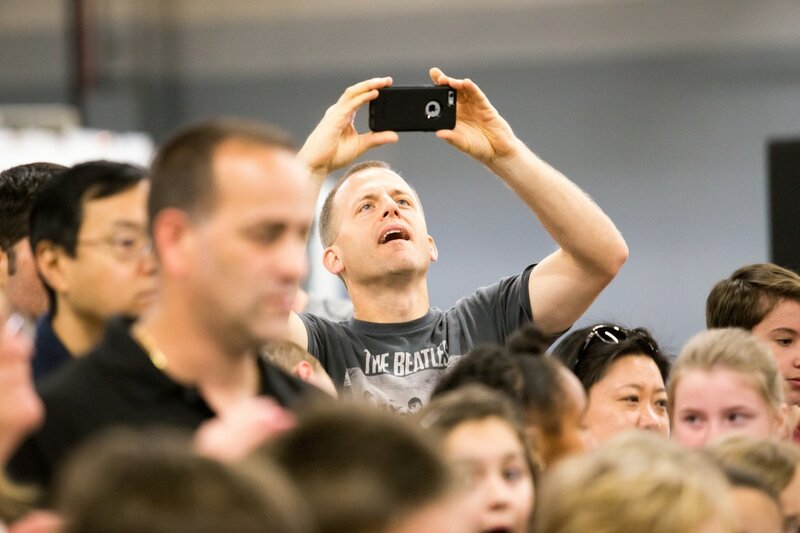 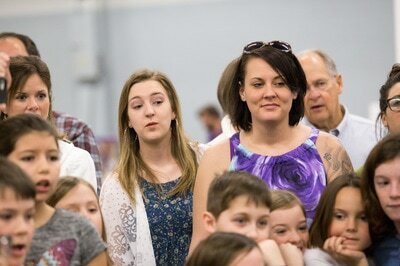 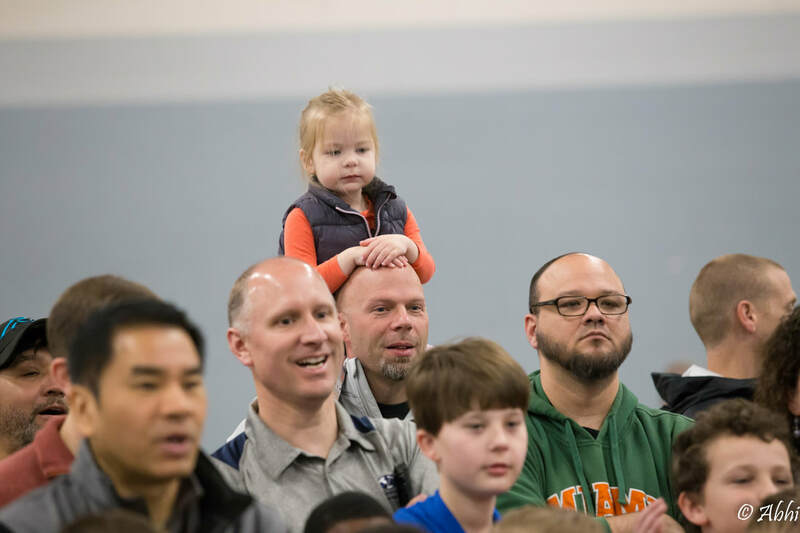 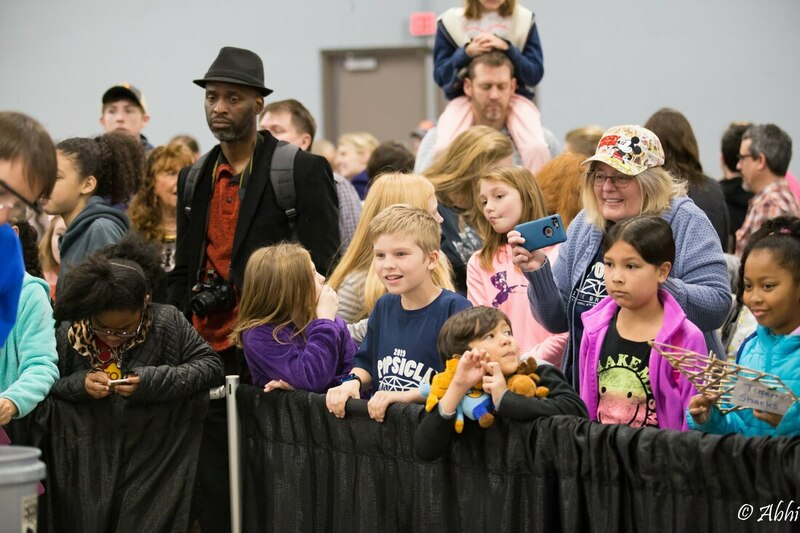 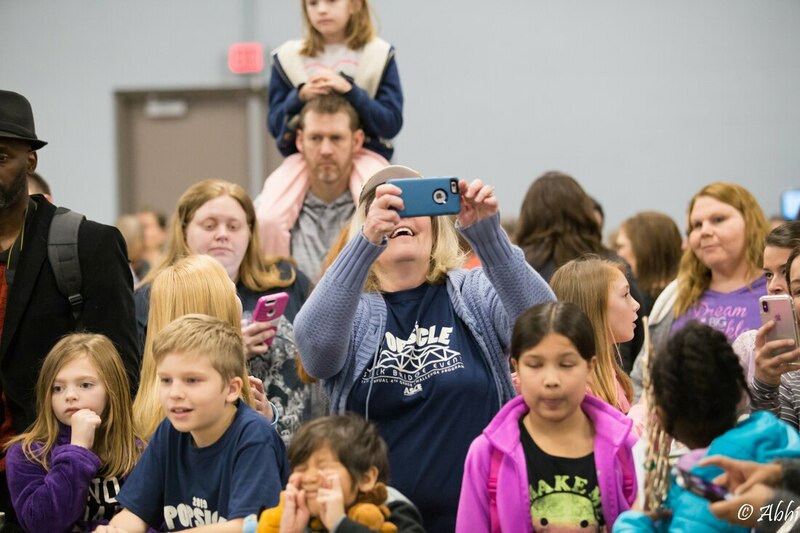 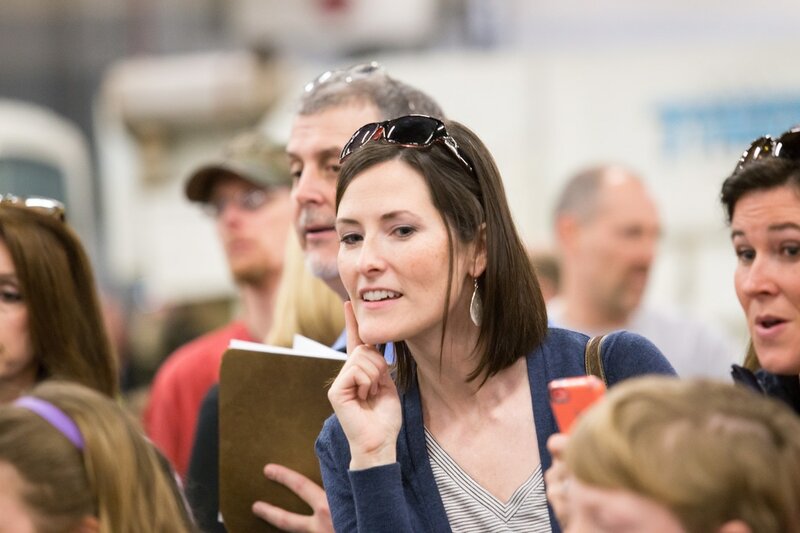 Parents attending with students must supervise them at all times. 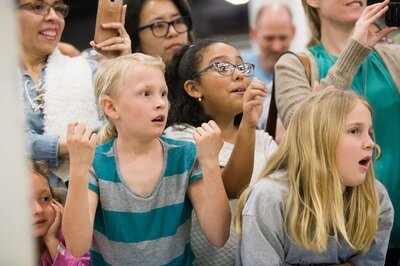 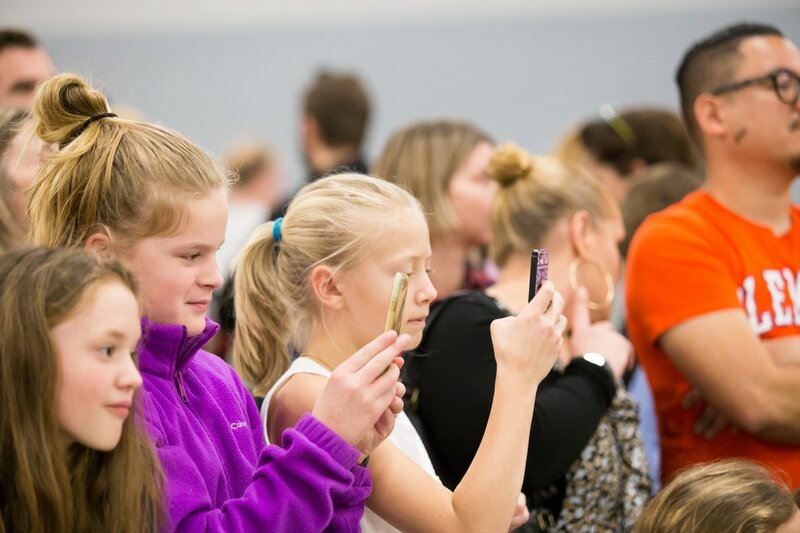 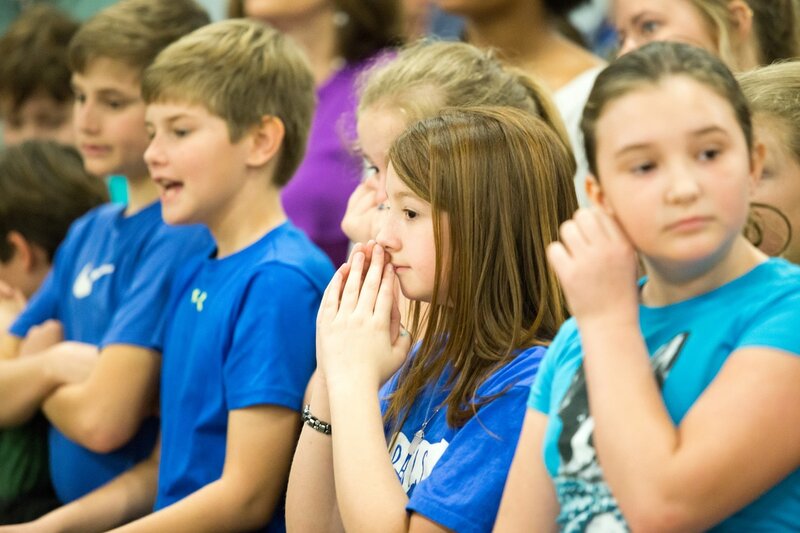 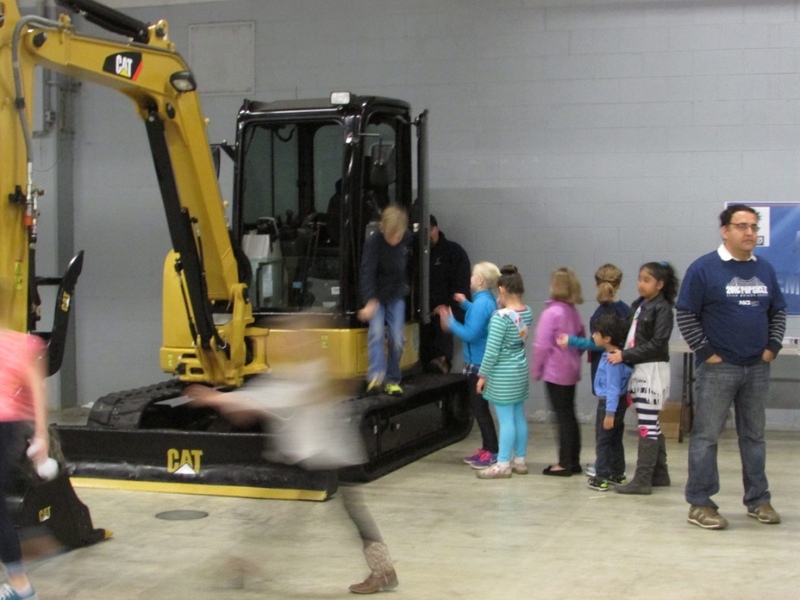 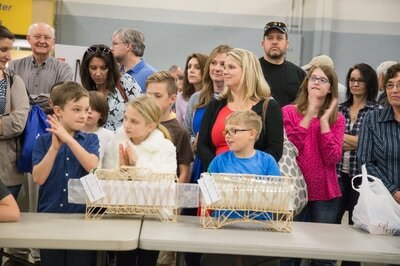 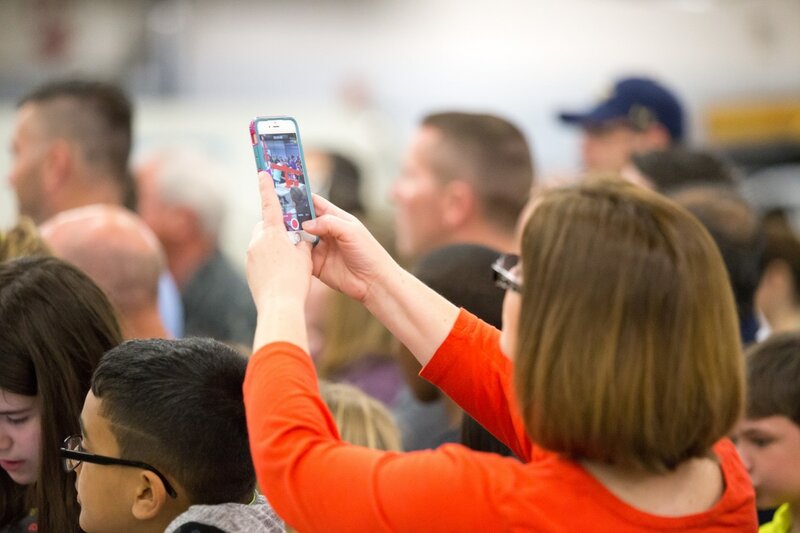 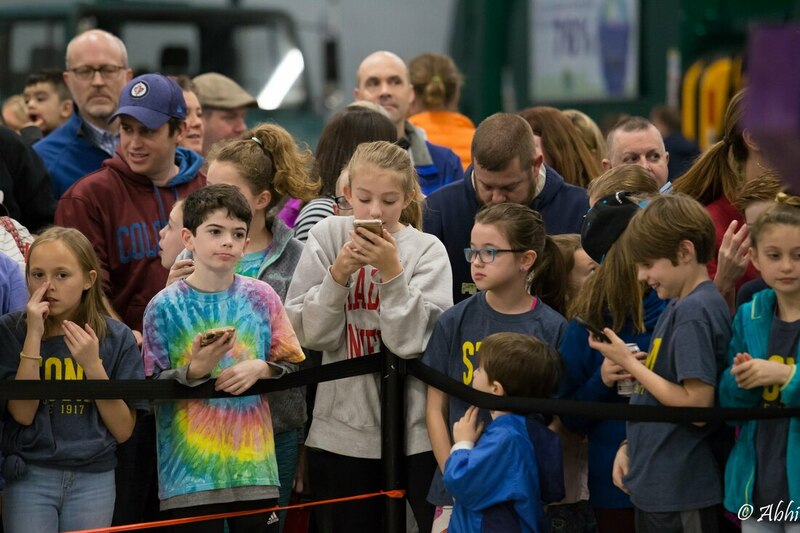 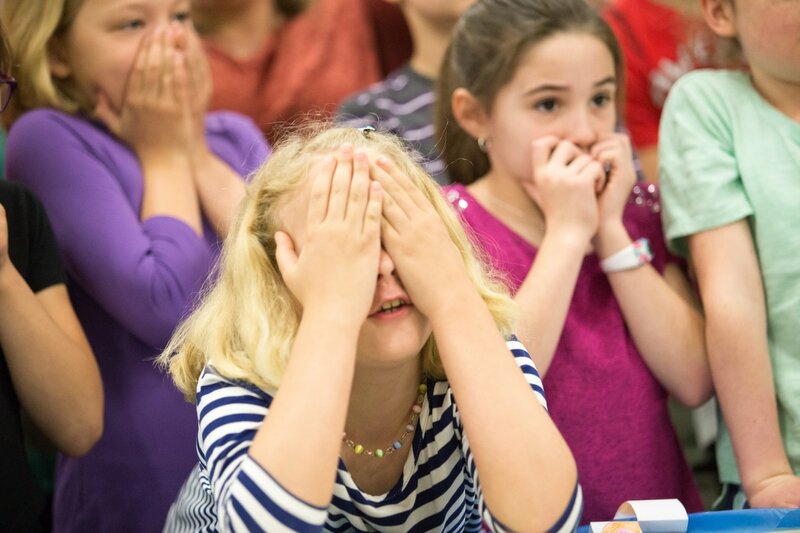 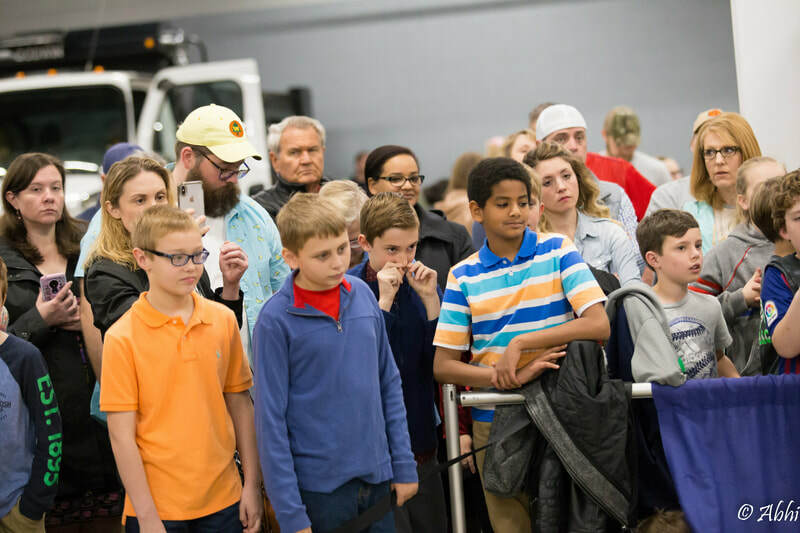 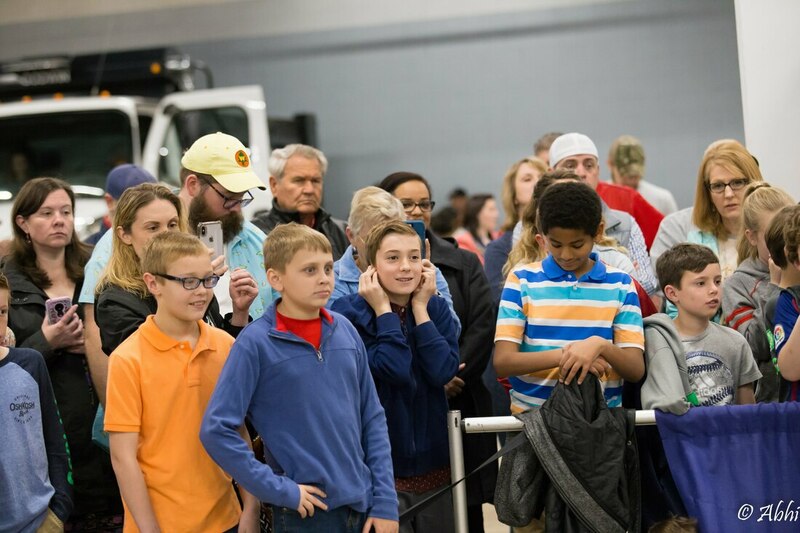 Please allow students to stand at the front of the line in order to watch the testing of their school’s bridges. 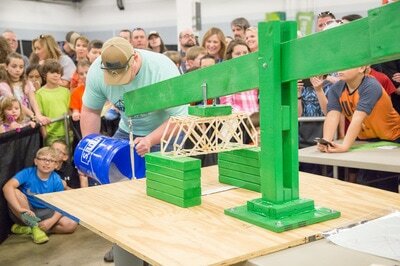 Please do NOT touch any bridges prior to testing. 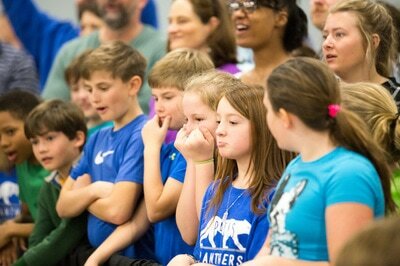 The acoustics are not perfect for this type of event, so please listen carefully. 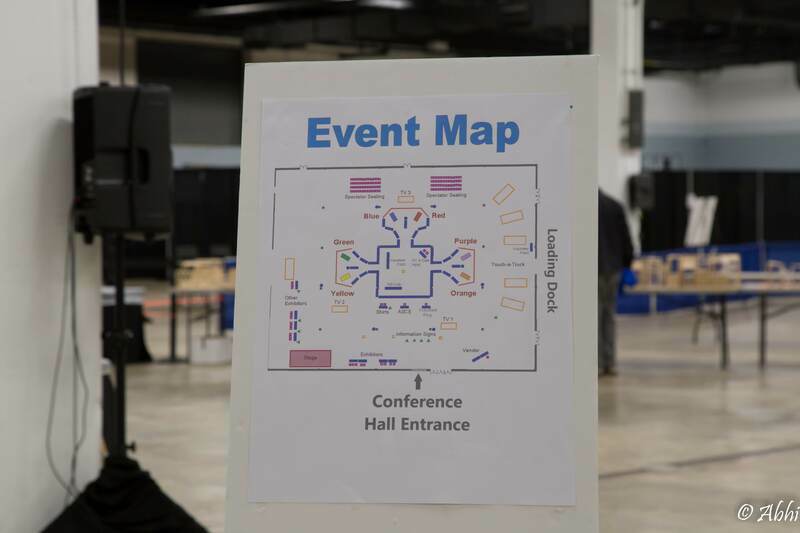 Signs will be used as available to help alleviate some sound issues. 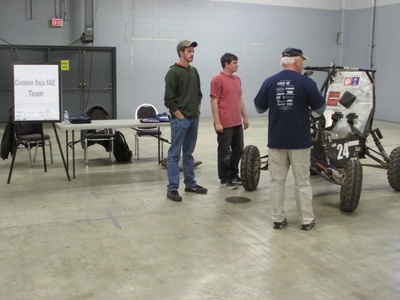 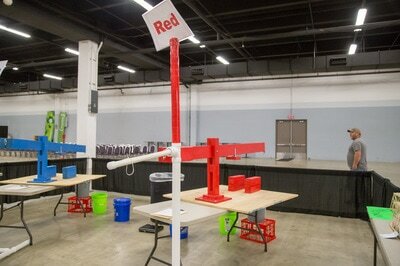 Winning teams will be announced as quickly as possible following the completion of all testing. 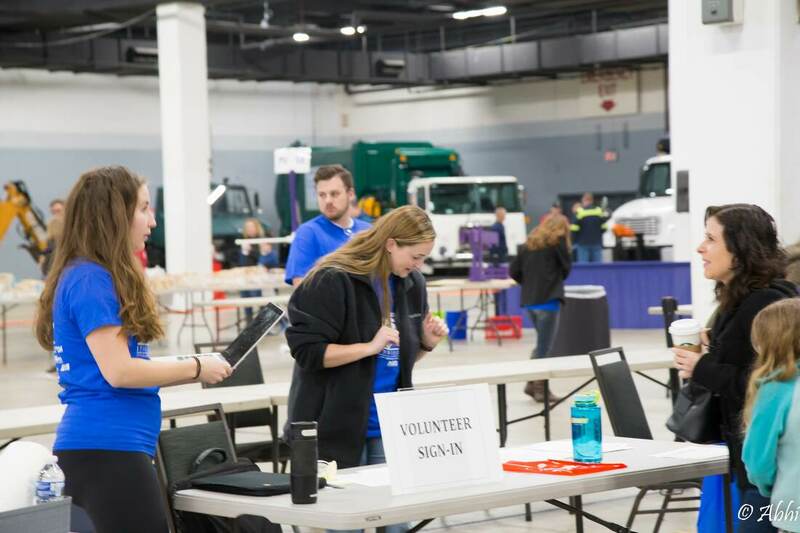 **All “workers” at the event are volunteers. 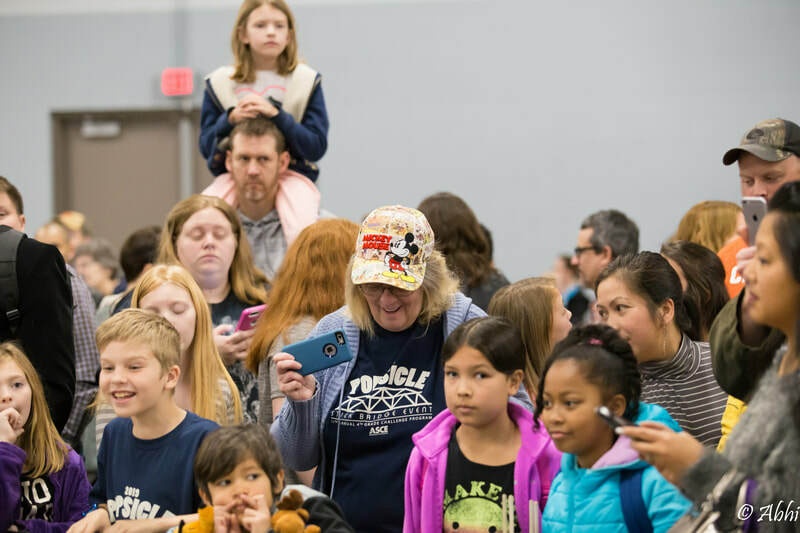 If there are any questions or concerns about the testing or rules, please direct them to teachers or the event coordinators. 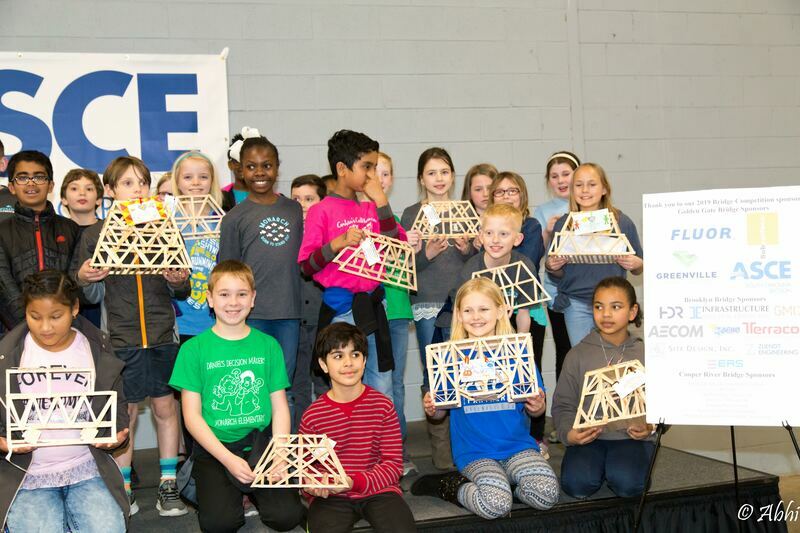 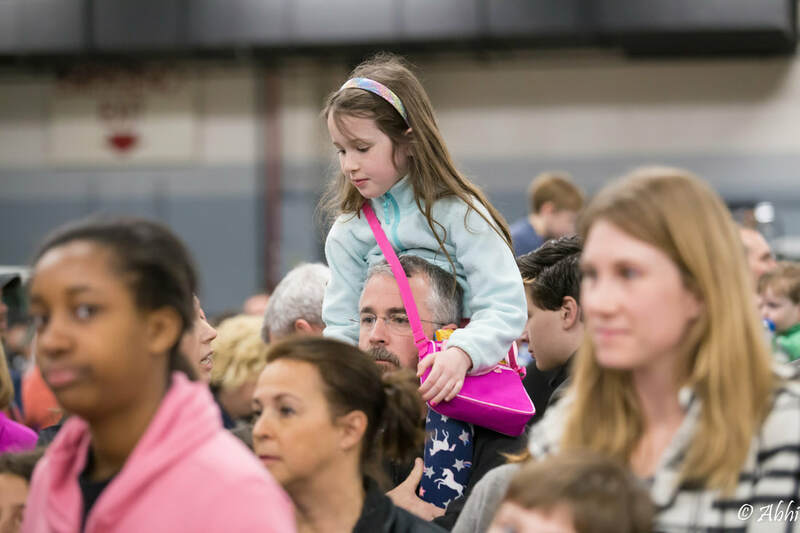 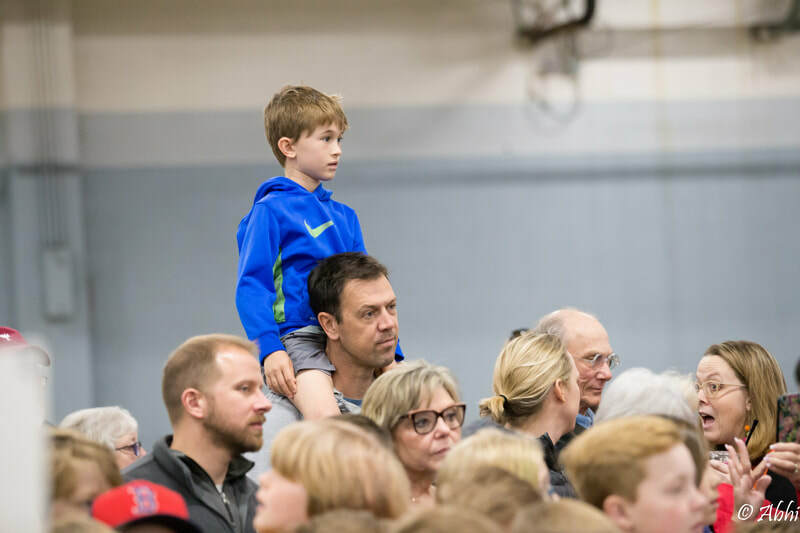 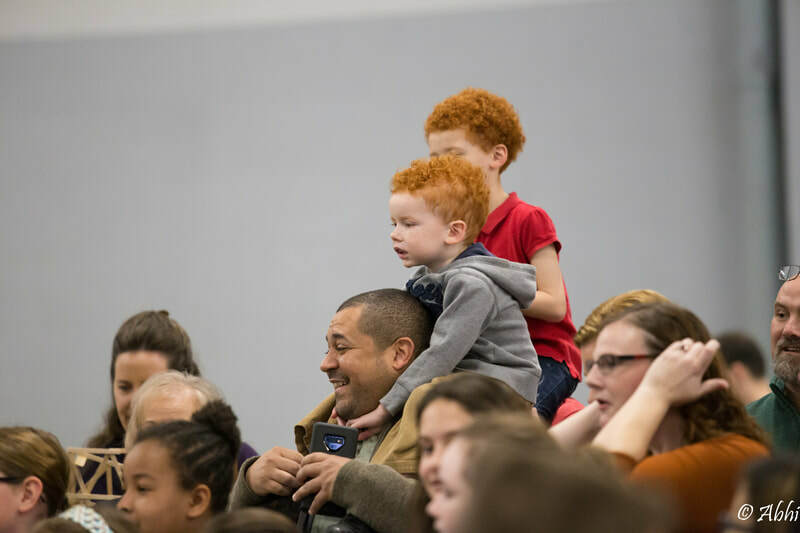 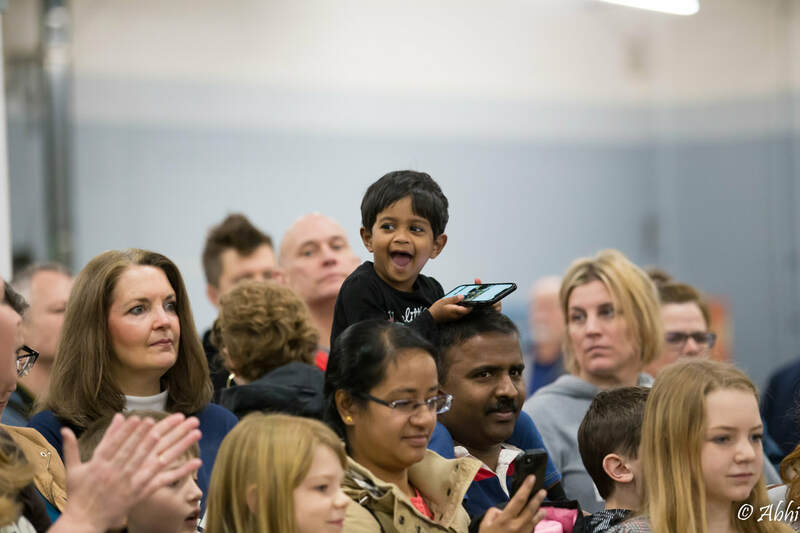 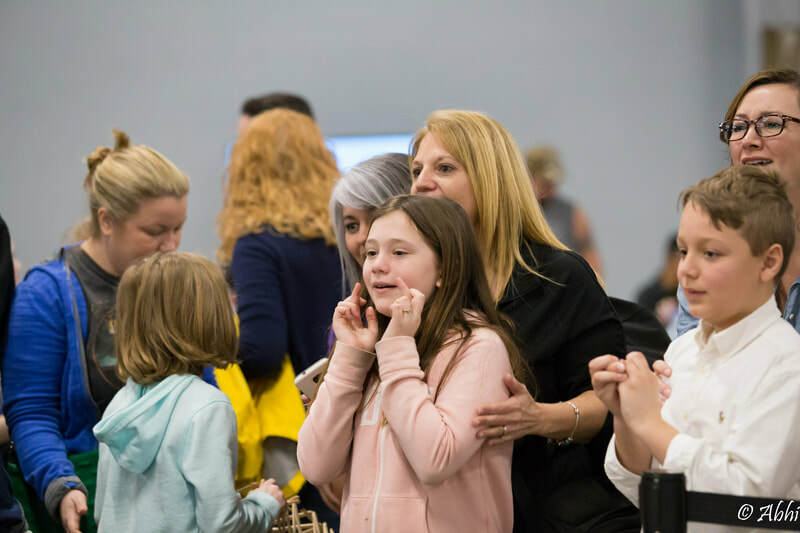 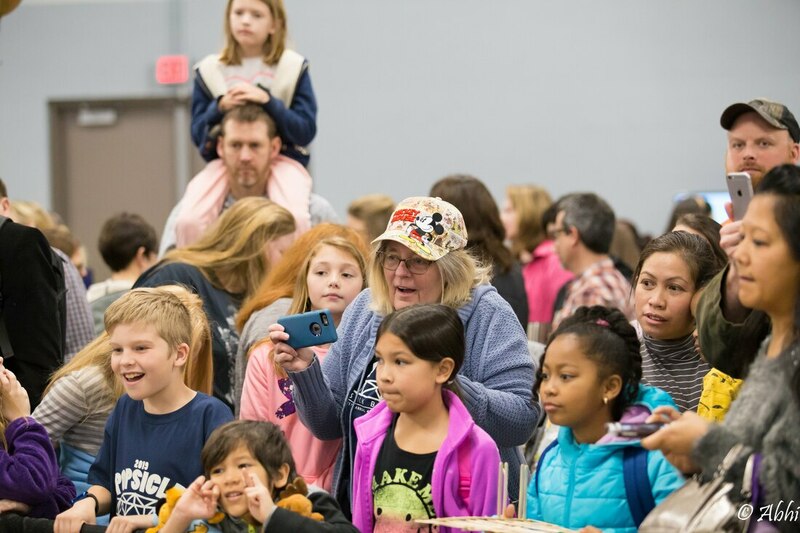 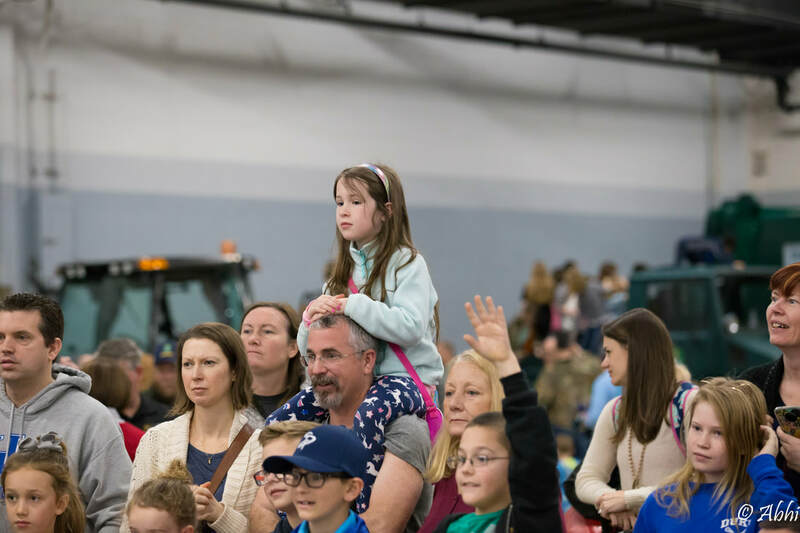 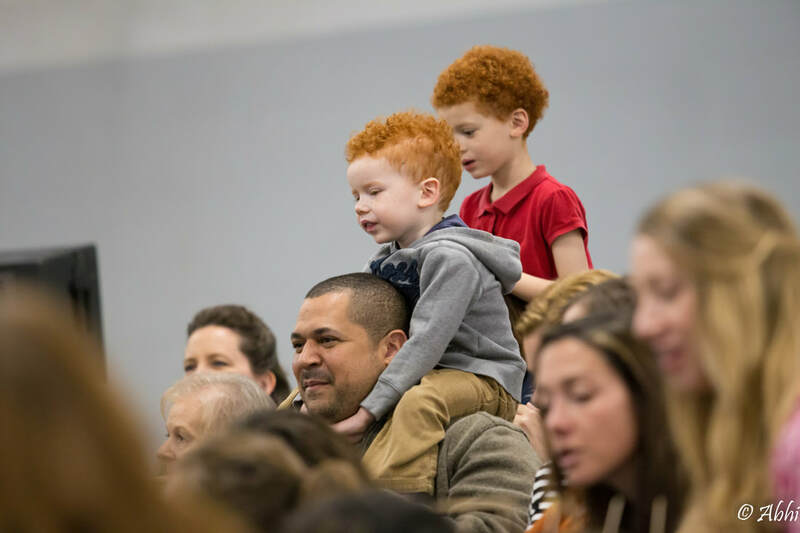 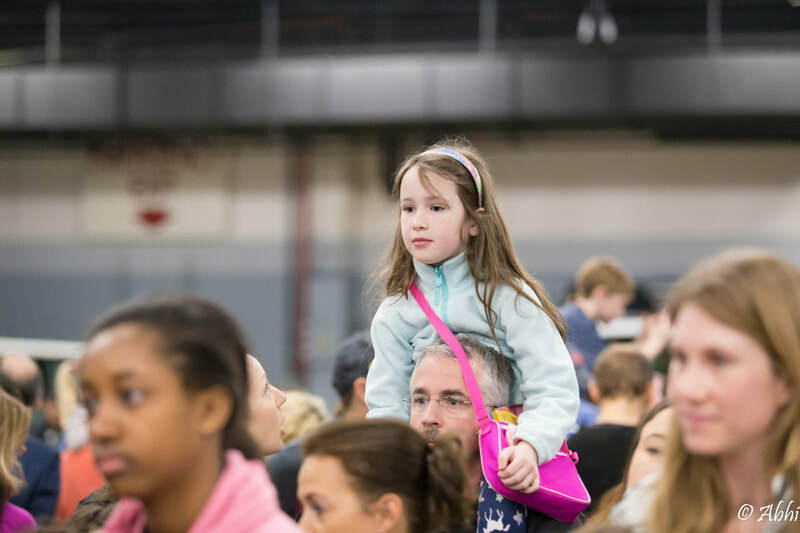 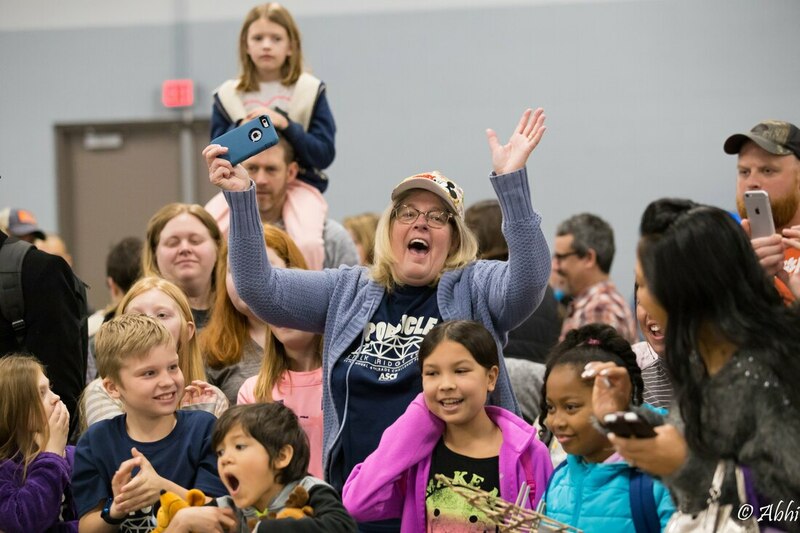 Thank you to all of the students, teachers, parents and family members that joined us for the 2018 Bridge Event! Also a big thank you to our sponsors and volunteers. 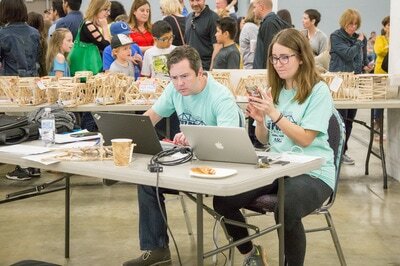 Without them this event could not be possible. 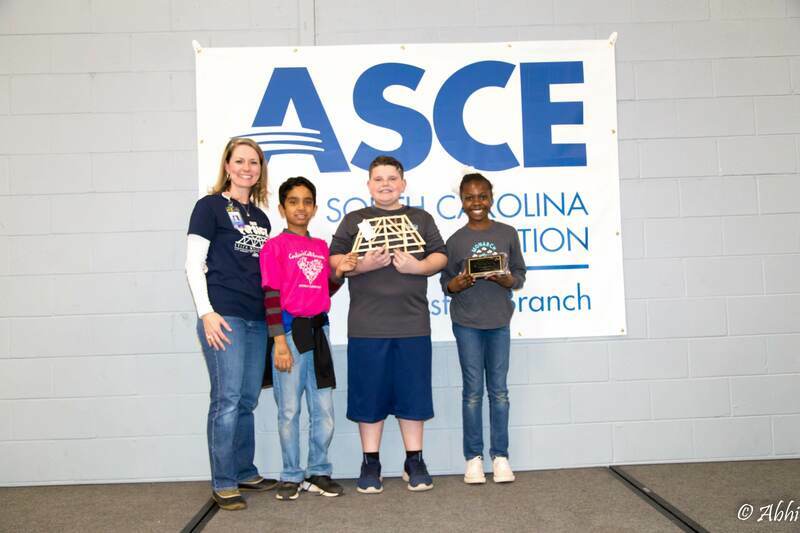 Congratulations to the 2018 winners of the four judging categories as listed below. We hope all of the amazing 4th graders were able to learn from and enjoy their experience with this Challenge activity. 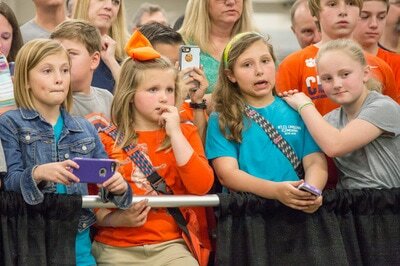 MAULDIN – GIRL POWER INC. 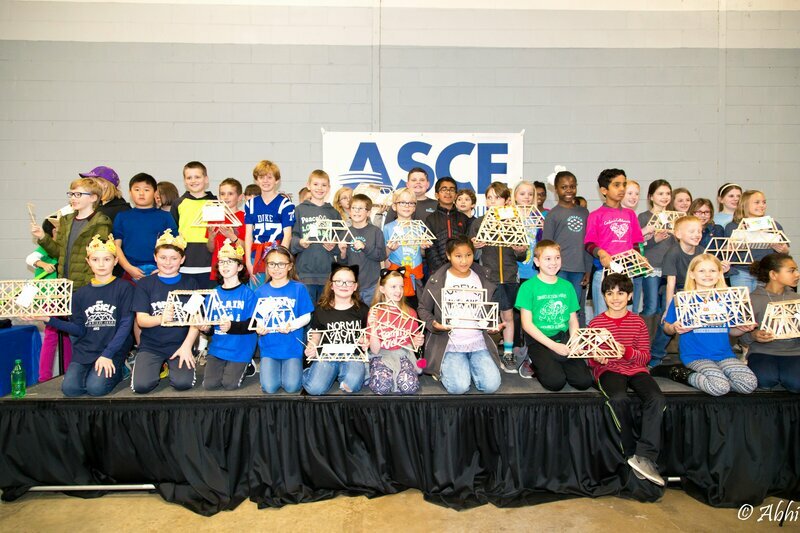 The 2017 winning bridge teams are below. 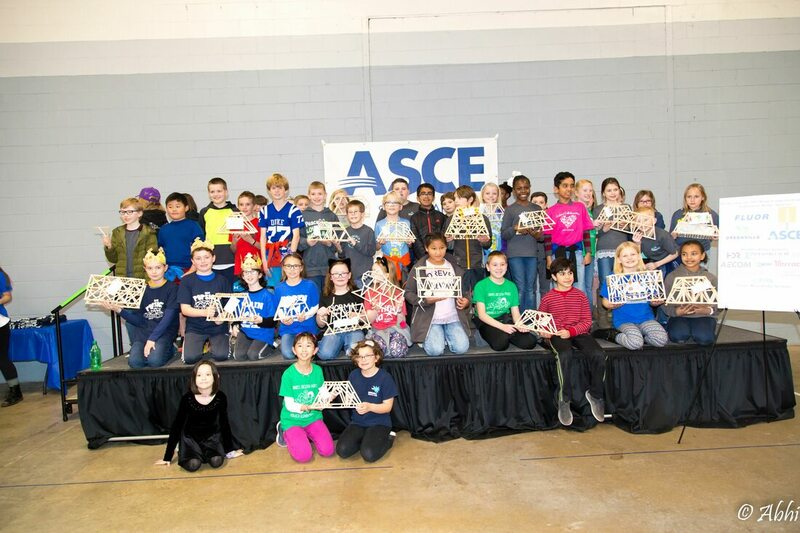 The 2016 winning bridge teams are below.